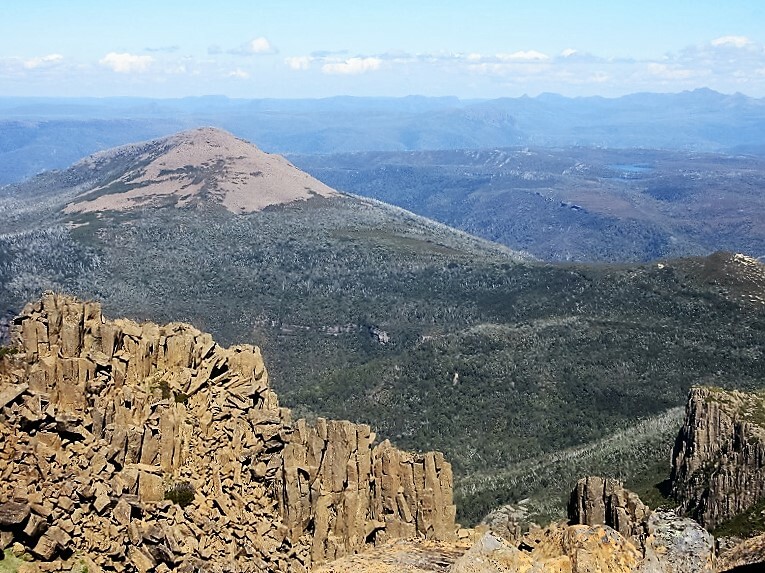 Today is the final day of my solo trip in Tasmania, therefor I have to arrive at Hobart International Airport until this evening for my flight. 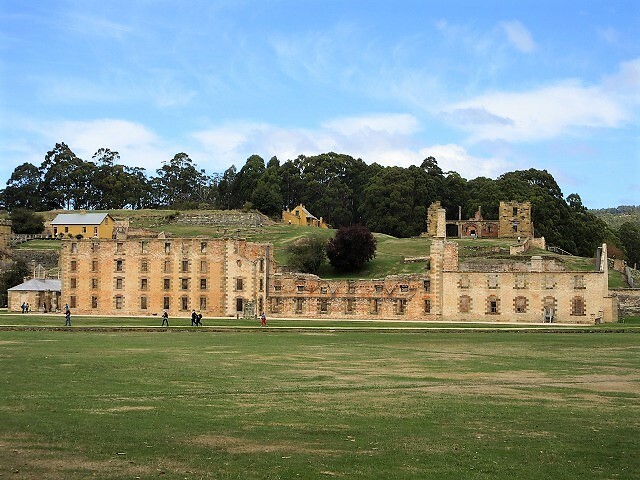 So I visited at The Port Arthur Historic Site in Tasman National Park which is not so far from the airport . 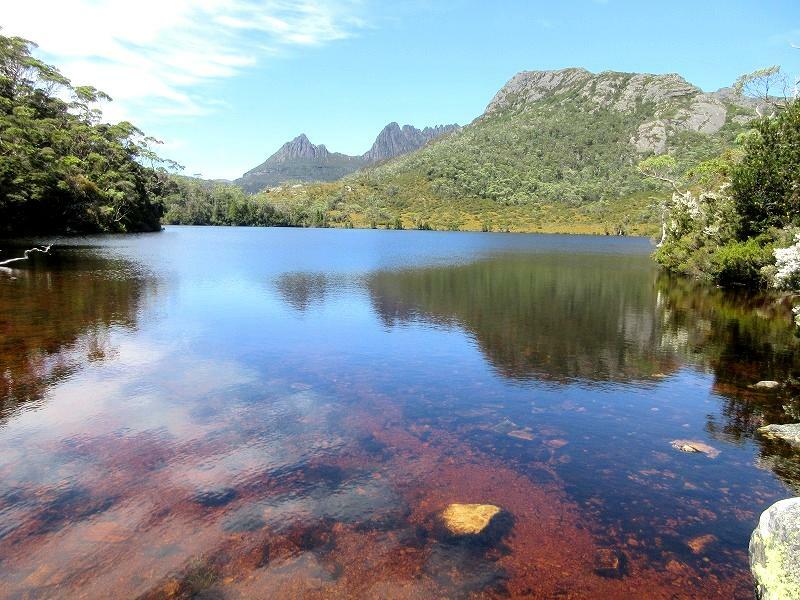 The Tasman National Park is located on the Forestier and Tasman Peninsulas in south-eastern Tasmania. 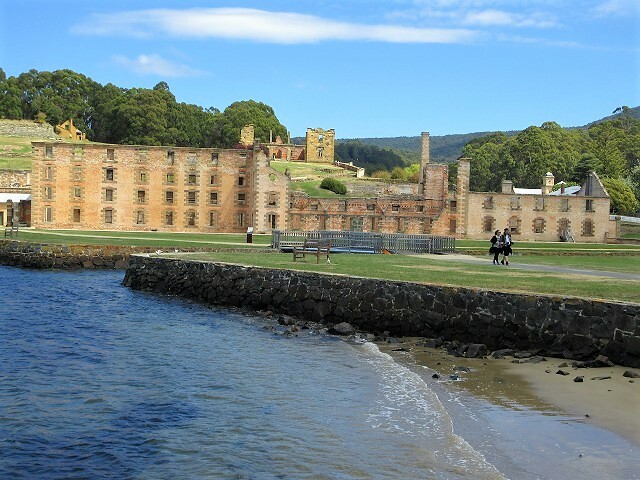 From Hobart, take the A3 to Sorell and then take the A9 (Arthur Highway) to Port Arthur. I stopped and enjoyed a beautiful view of Denison canal which is connected Forestier peninsula. 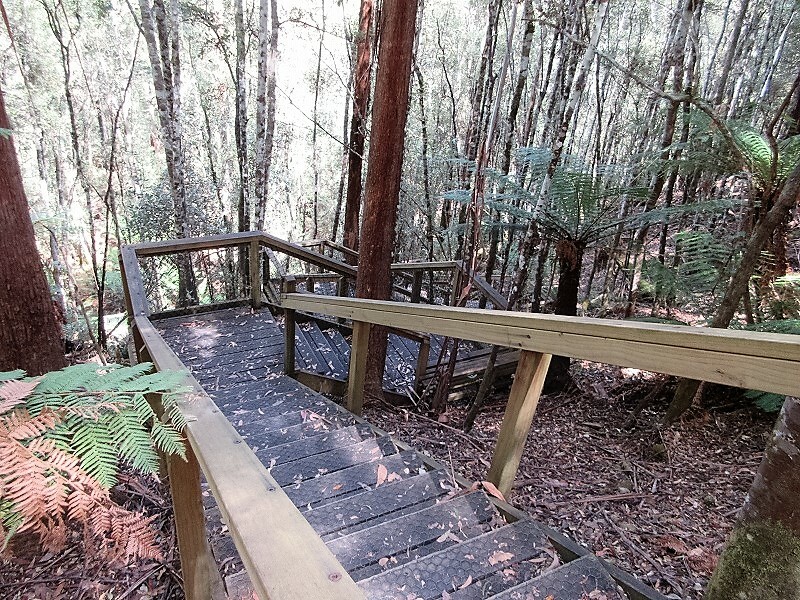 Next, I dropped at “Pirates Bay Lookout” as soon as I got in the Tasman peninsula. I can see a rugged coastline of the peninsula. 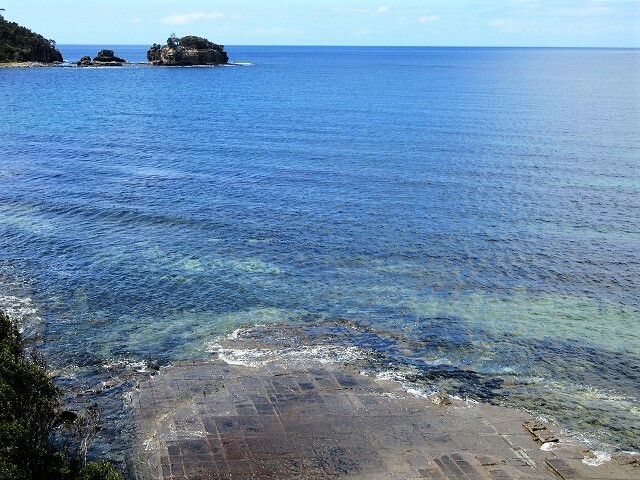 And then, I visited “Tessellated Pavement State Reserve” which is located north of Pirates Bay. I wondered what things protecting in this area, because I did not know that meaning of “Tessellated” in English. However, I found a rock that has mosaic pattern. 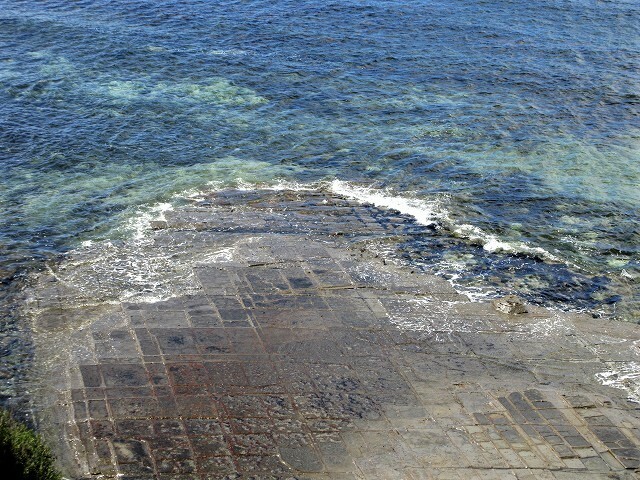 That is the Tessellated Pavement State. According to explanatory board, from 160 million to 60 million years ago, the silt was covered by later sediments, compacted and became siltstone. 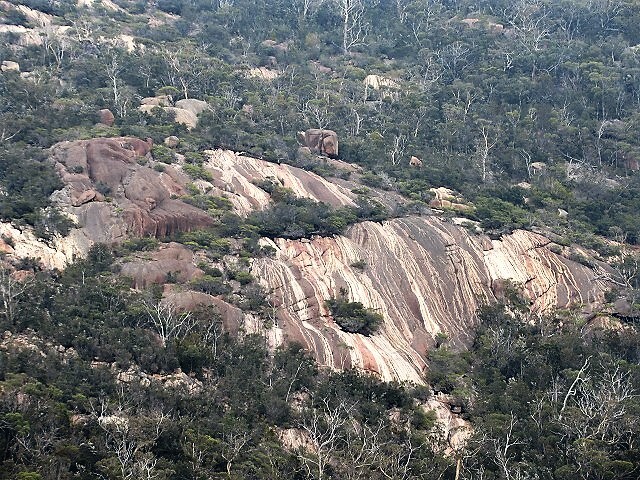 The flat-lying siltstone was cracked by stresses in the Earth’s crust. The resulting cracks (joints) are seem as three main sets, one aligned to the north-northeast, a second to east- northeast and the third to the north-northwest. 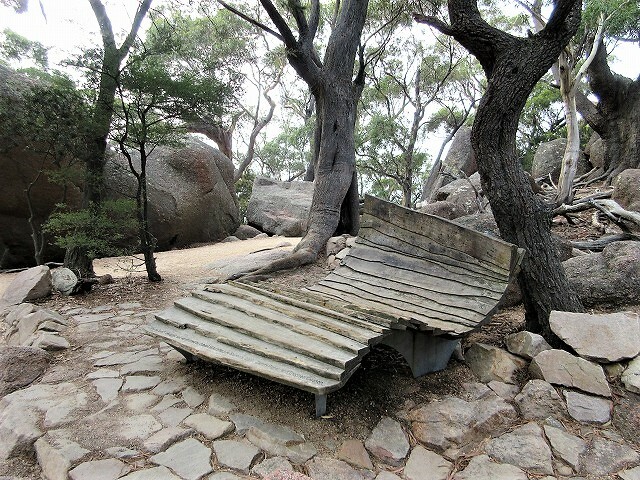 This jointing exaggerated by processes of erosion, has created the ‘tiled’ appearance. I was able to reach on the tiled rock less than 10 minute from the carparking. 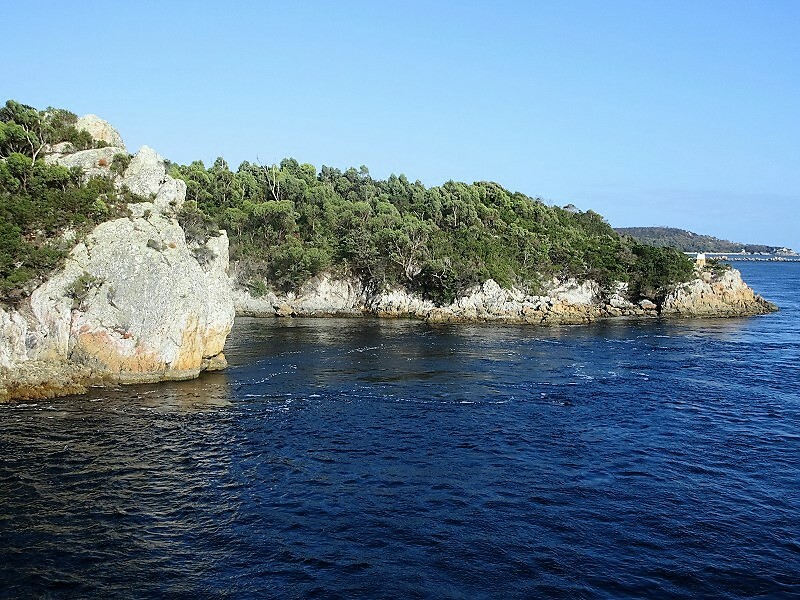 In addition, when you take a few moments, there are remarkable coastal landforms such as “The Blowhole” “Tasman Arch”“Devils Kitchen”of Pirates Bay. 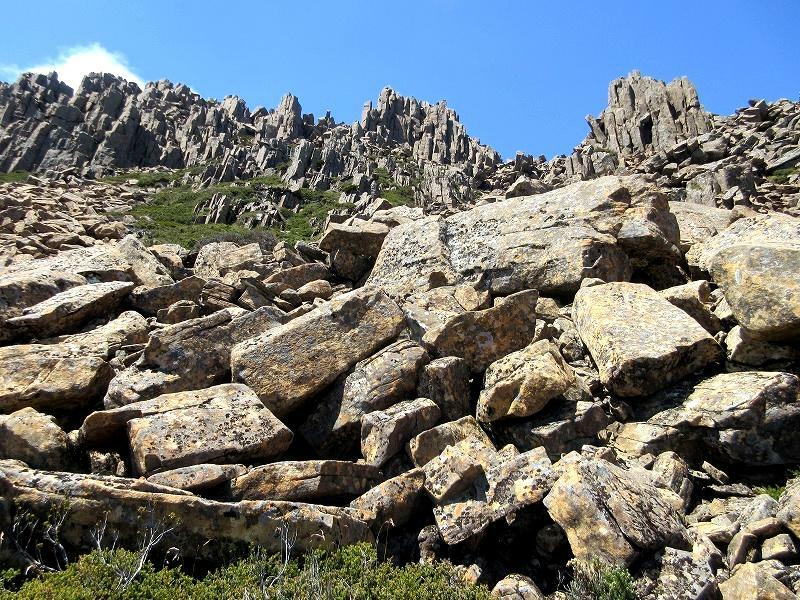 You can recognize earth’s past recorded in the rocks. 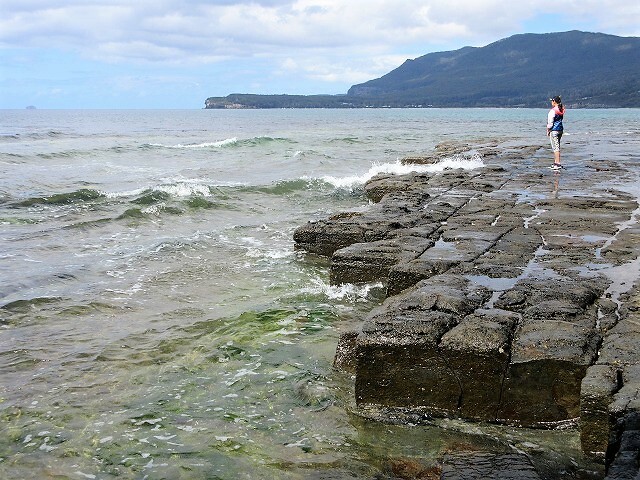 Tessellated Pavement State Reserve to Port Arthur does not take much time. 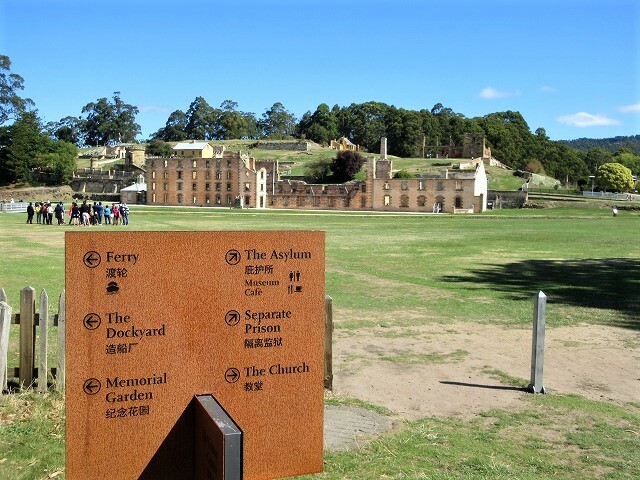 The Port Arthur Historic Site is a place of national and international significance part of the epic story of the settlement of Australia, so the signposts are in place for get there. A big building is the Penitentiary. Let’s check out! There is only side wall, no roof for the Penitentiary. If you look it from the top of the hill on the back side, you can see the appearance of the Penitentiary without a roof as seeing like a design drawing. The fact that there is no roof is worried about preservation because it is exposed to rainwater and sunshine. 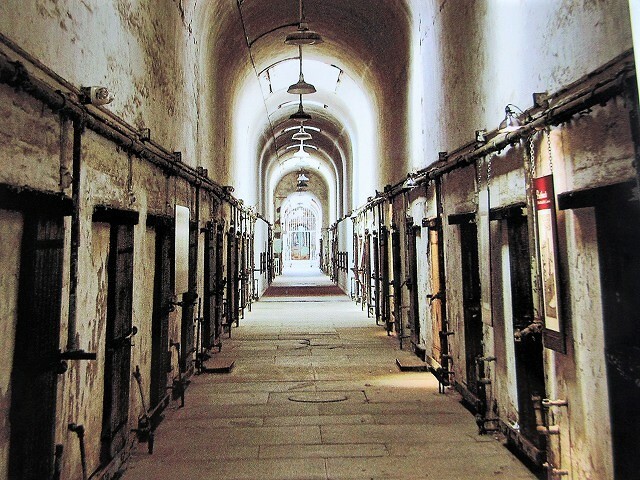 The Penitentiary’s two lower floors contained 136 cells for “prisoners of bad character”. 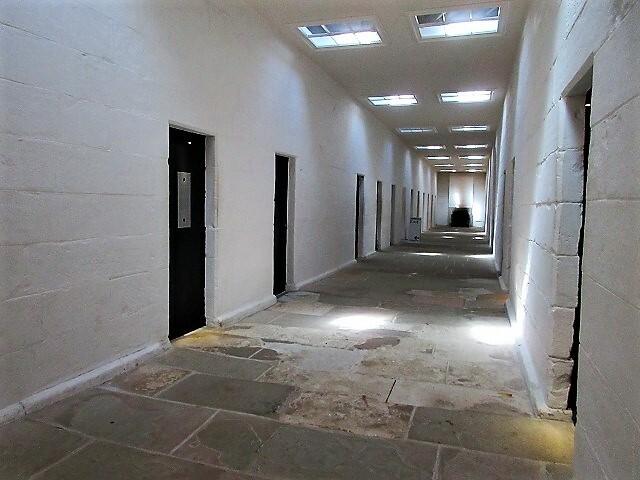 The top floor provided apace for 480 better behaved convicts to sleep in bunks. Supported by steel columns so that the side wall does not collapse any more. 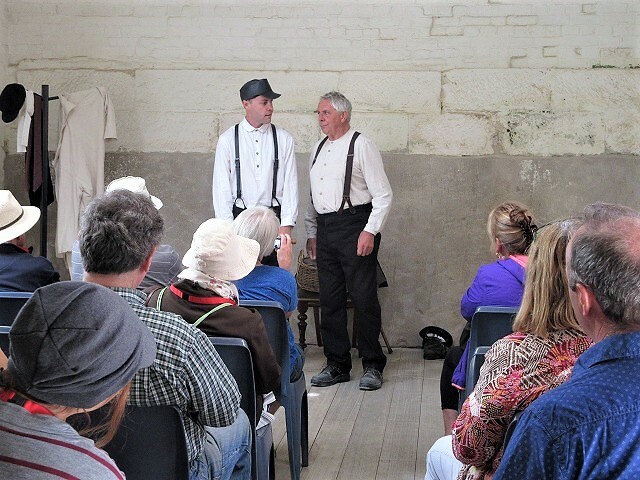 In one facility, a skit that played the state of the past is performed several times a day. Unfortunately, I could not enjoy enough that skit because my English skill is not well. 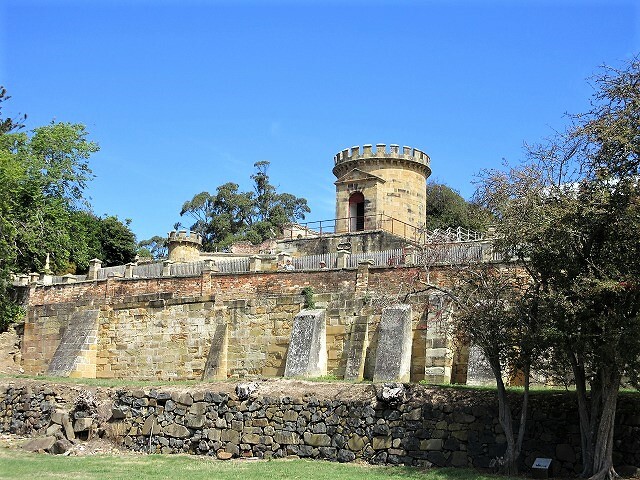 This building looks like a castle, but actually it is Guard Tower and Military Officer’s Quarters. 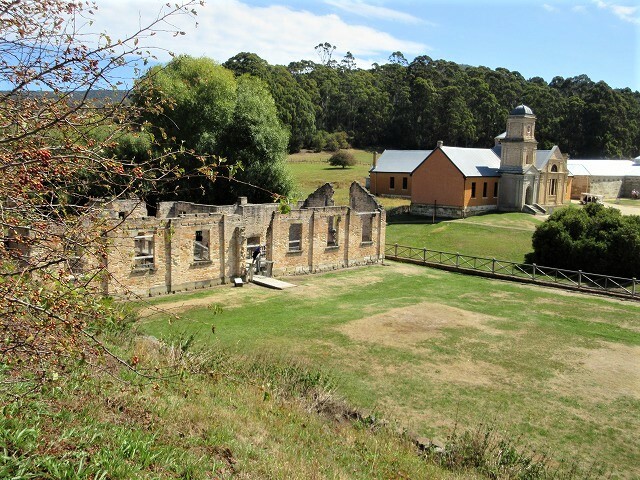 There are other buildings such as Hospital, Commandant’s house, The church and Parsonage in site. Also, there is also Boy’s prison on isolated island across the bay. 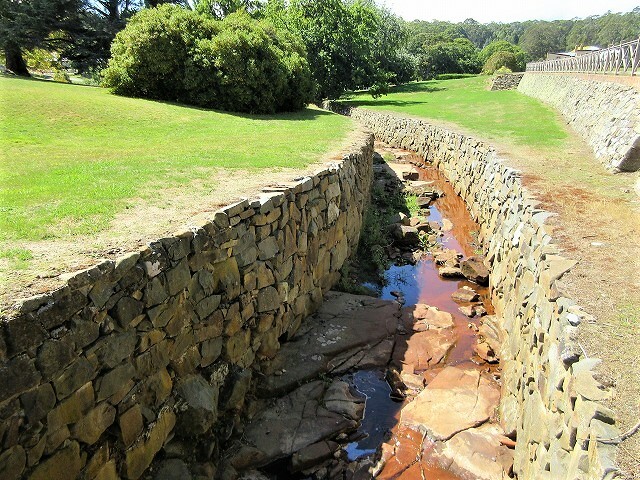 There is a wonderful waterway or drainage in this site. 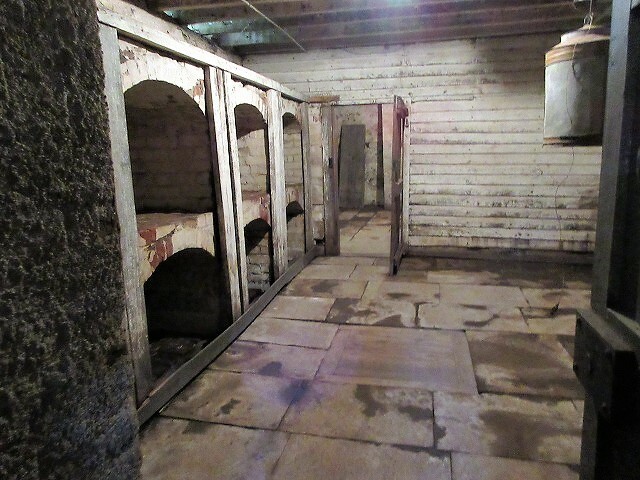 This photograph shows old time’s “The separate prison（solitary cell）” in the south of the historic site. 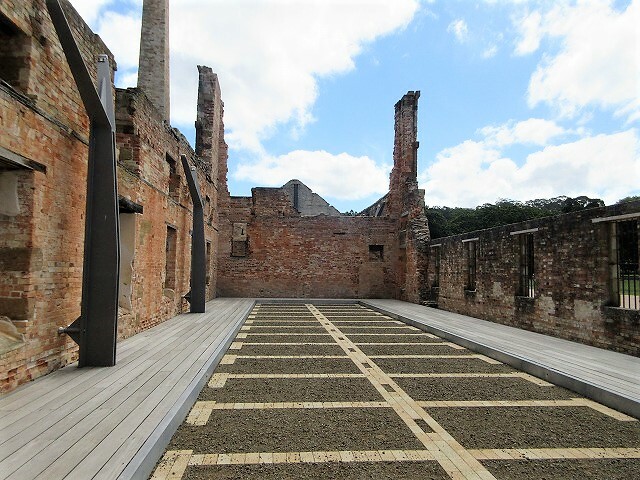 Here is the current “The separate prison” repaired by a major conservation program in 2007. It was restored much more modern, so I think that is totally different from that time. 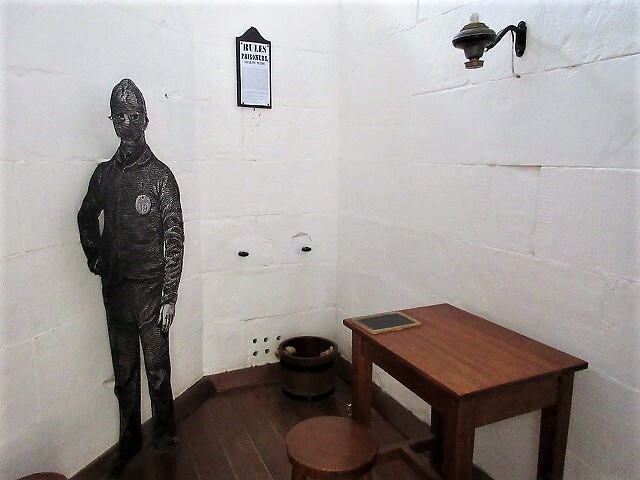 Convicts were locked for 23 hours each day in single cells. Here they ate, slept and worked, with just 1 hour a day allowed for exercise, alone, in a high-walled yard. 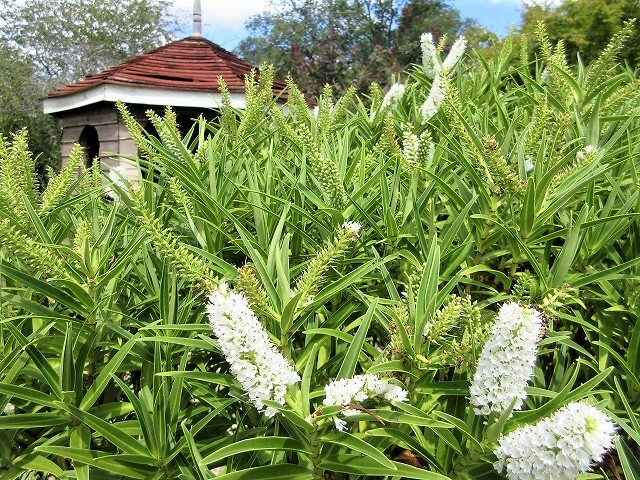 Let's check out Civil Officer 's Row that lined up in the west side of the historic site. 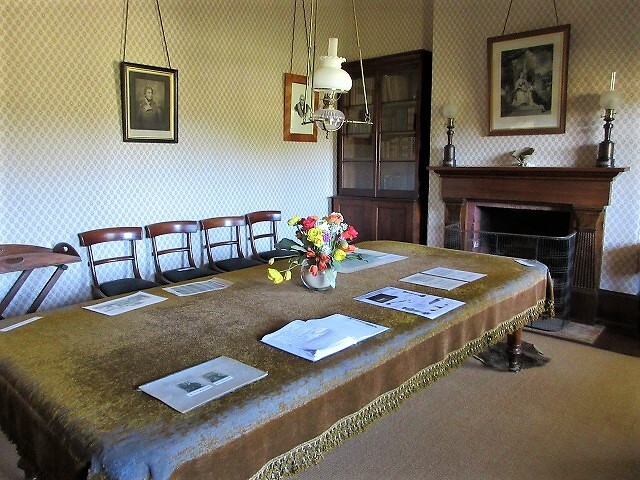 Civil Officer 's Row separated senior officers and their families from the convict population and provided them with housing suited to their status. 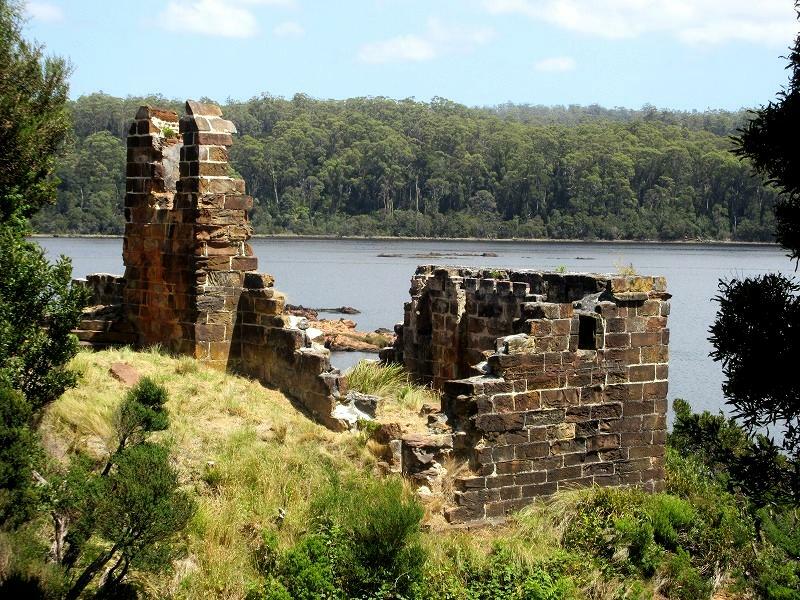 Australia in British colonial was much more than a prison. 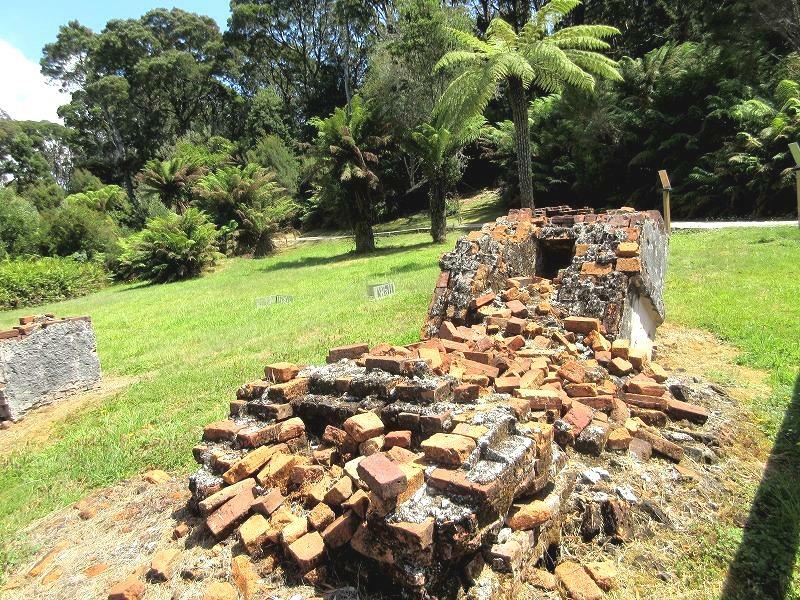 It was a complete community as home to military personnel and free settlers. 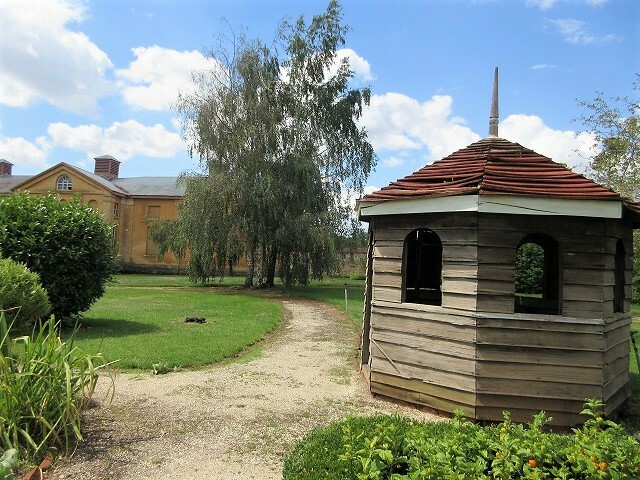 The Government Gardens with Church which is located north of this site, offered a quiet and beautiful space, from the unwanted presence of the convicts. The roof of the church is also collapsed, there is only the outer wall. 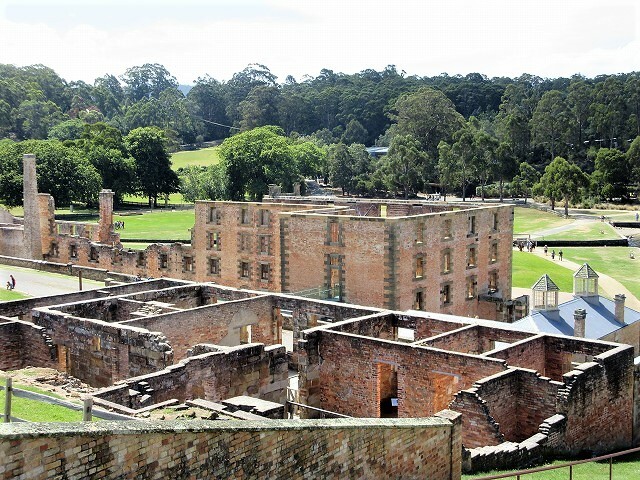 From 1833 Port Arthur was used as a punishment station for repeat offenders from all the Australian colonies. 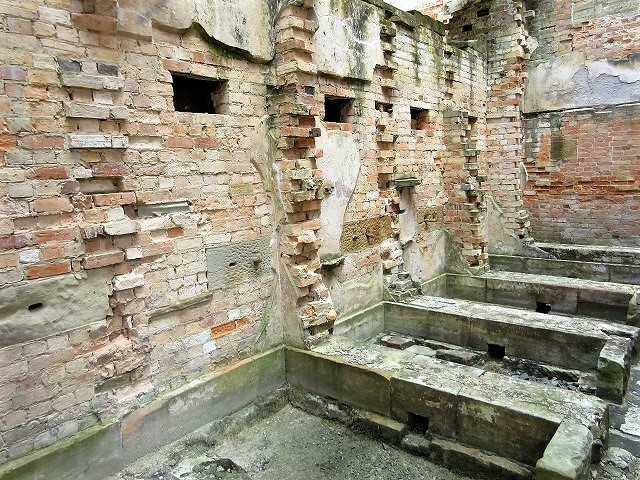 Most convicts had lived a life with hopeless and finished their lives in here. On the other hand, the lives of soldiers and free immigrants are in contrast. Parties, regattas and literary evenings were common. 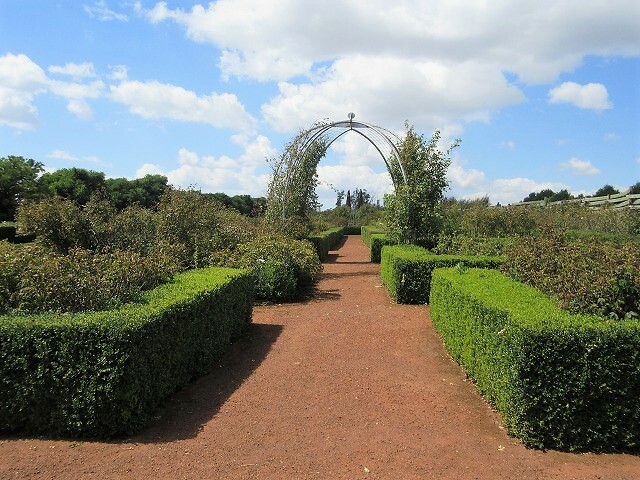 Beautiful gardens were created as places of sanctuary and children played. 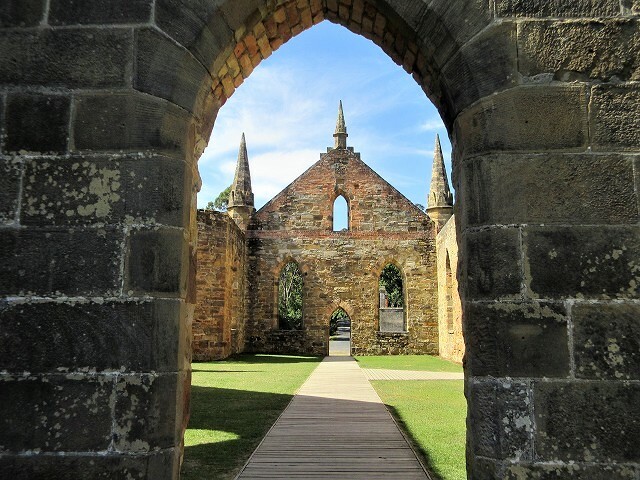 I imagined that Port Arthur was the place where "Heaven and Hell" of the human society indeed. 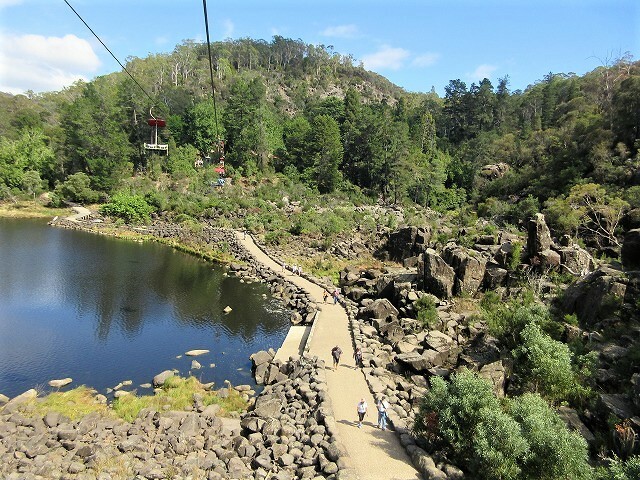 My solo trip in Tasmanian was coming up the final. I saw that the low tide was making a beautiful gradation during going back to the airport. 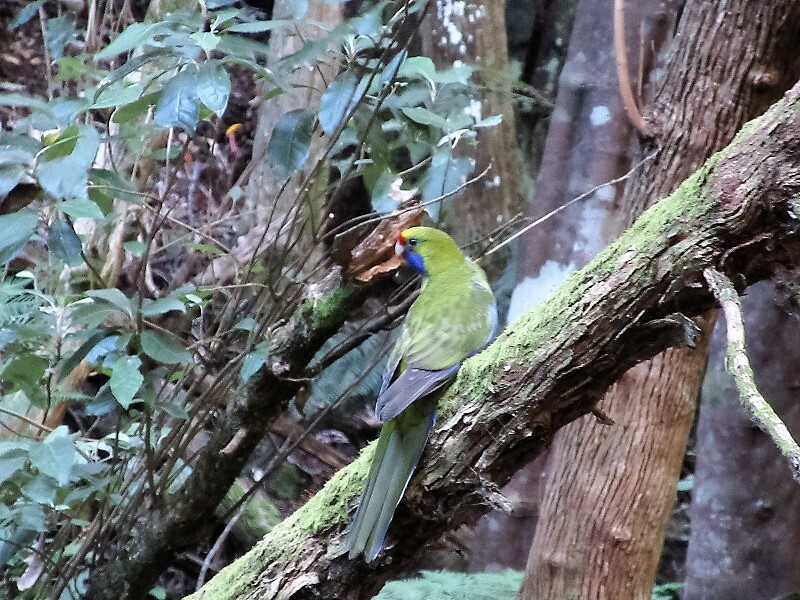 I was particularly fascinated with nature in Tasmania. 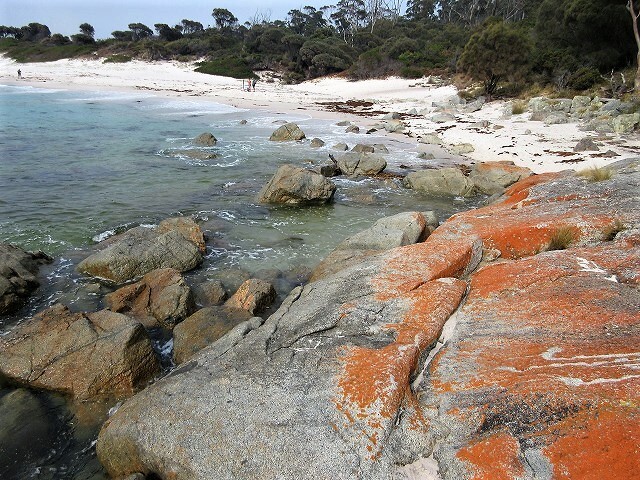 The eighth day of my solo trip in Tasmania is hike at Wineglass Bay in Freycine National Park. 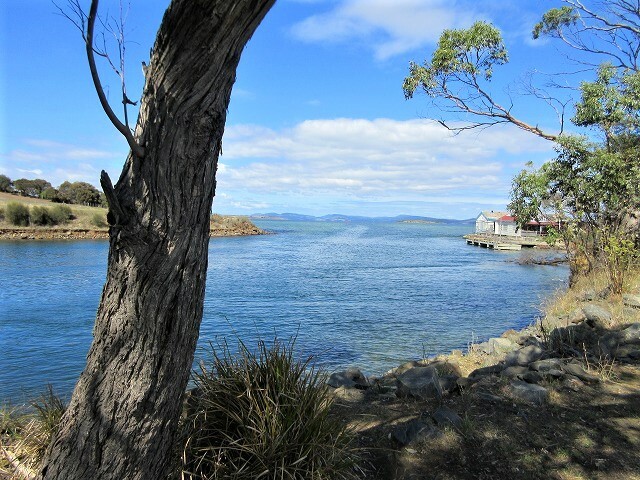 I started traveling from the southern Hobart to Strahan on the west coast eight days ago,and then, moved to the northern city Launceston, and reached to the east coast Coles Bay yesterday. I stayed at YHA (backpack hostel) one night with three female college students who came from Sydney. 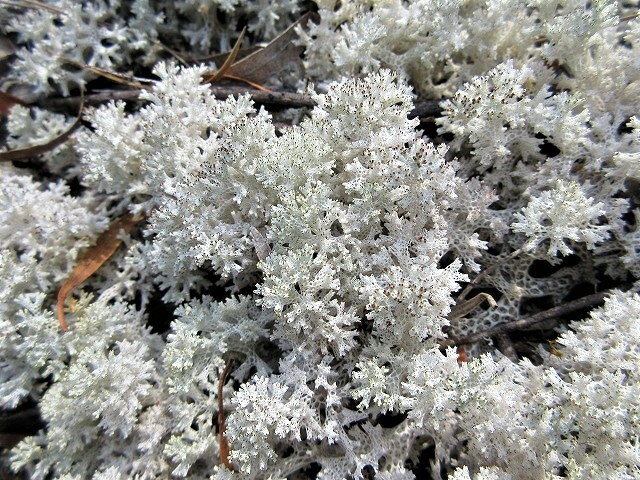 Today, I went to visitor center of Freycine National Park at first, and got some hiking information, trail map, etc. 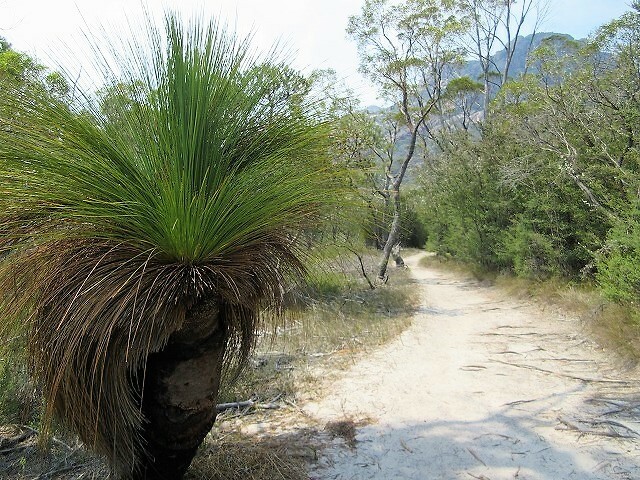 I chose a trail named Wineglass Bay－Hazards Beach circuit with an 11km undulating walk. 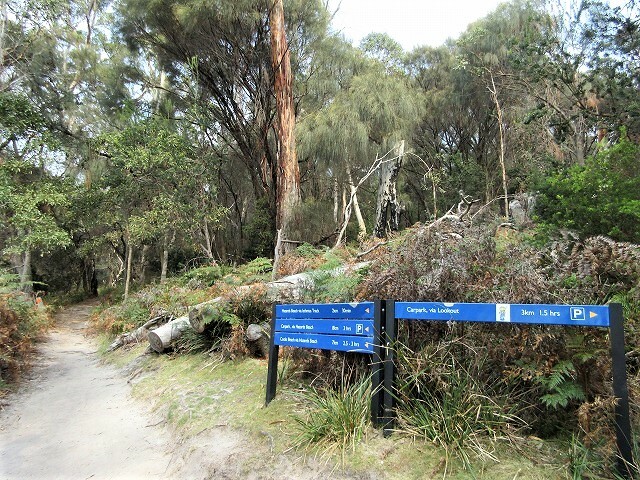 The starting point of hiking Walking Track Car Park is located several kilometers south from the visitor center. Mount Amos and Mount Dove are visible from parking. I feel already exciting. 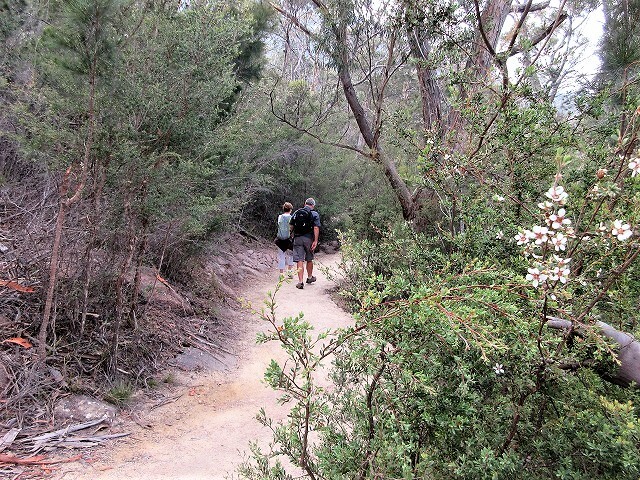 The gravel trail climbs steadily up to the Wineglass Bay Lookout. 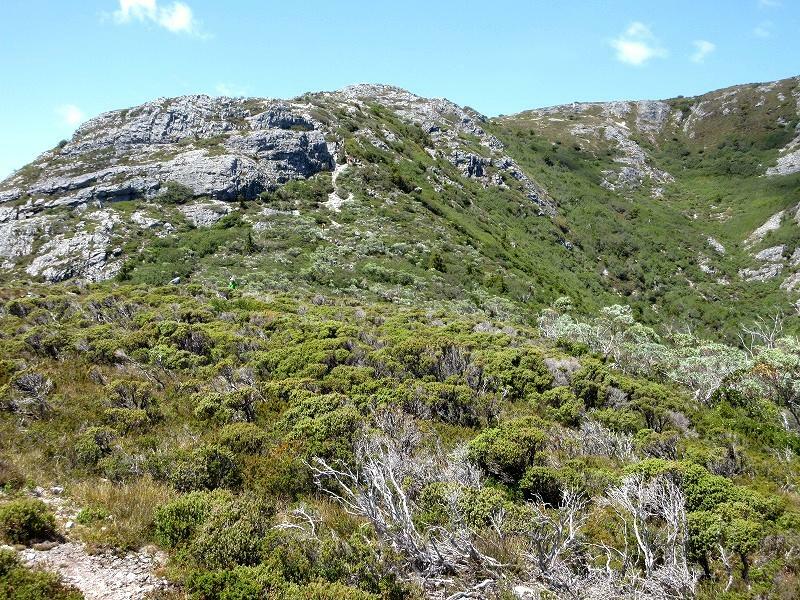 I reached the Coles Bay Lookout (not Wineglass Bay Lookout) by about 30 minute from parking. 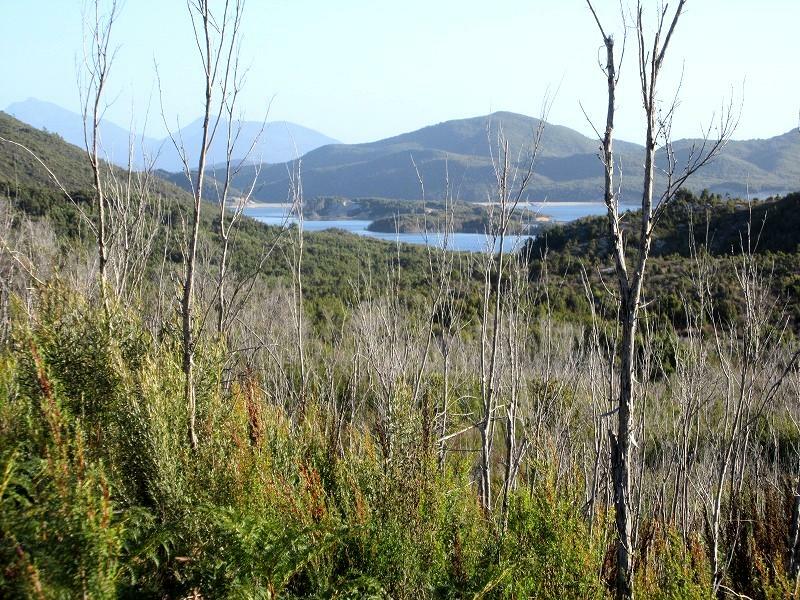 I can see the Coles Bay that is located the opposite direction of the Wineglass Bay. On the west side, Mount Mayson rises nearby. On the east side, Mount Amos which was visible from parking, rises with anther face. 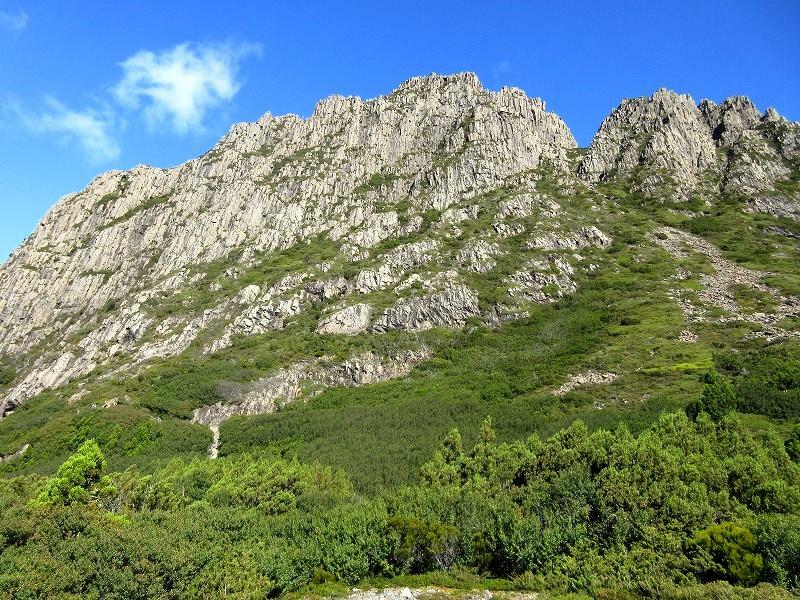 Mount Amos is part of the range of granite mountains, known as the Hazards, which dominate Coles Bay. 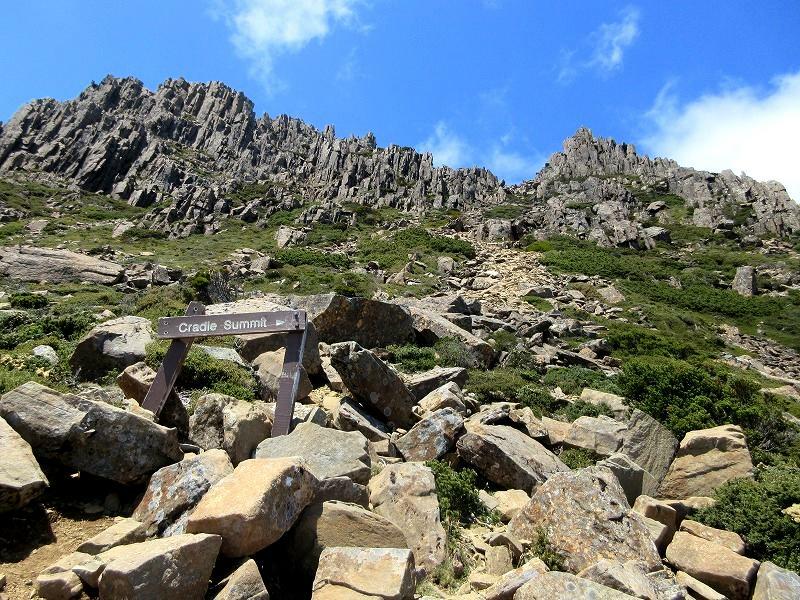 There is a trail that climbs to the peak of Mount Amos, it is about 3 hours return. 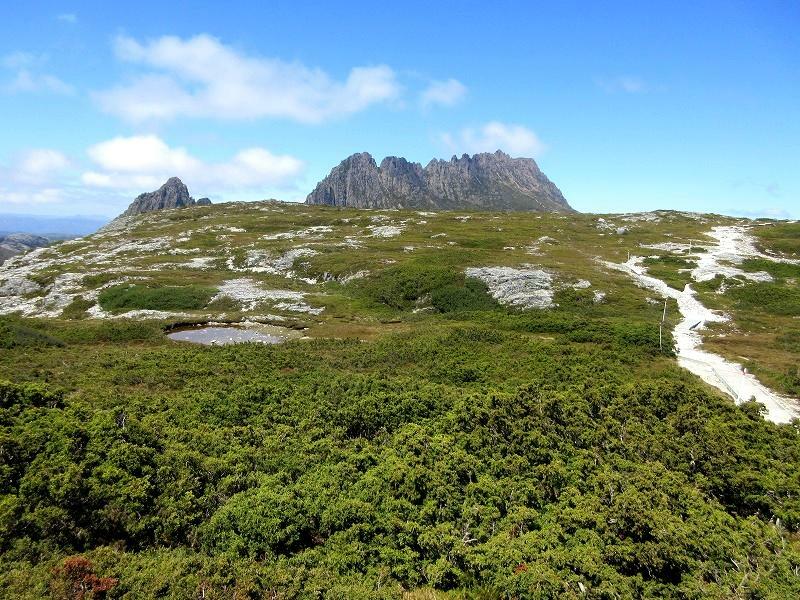 By the way, Hazards Ranges is a mountain range made up of Mount Mayson, Mount Amos, Mount Dove and Mount Parsons. 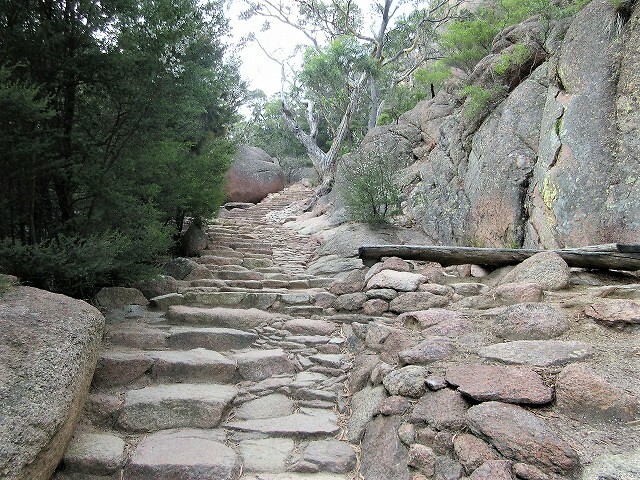 The trail gets more stone steps past Coles Bay Lookout. 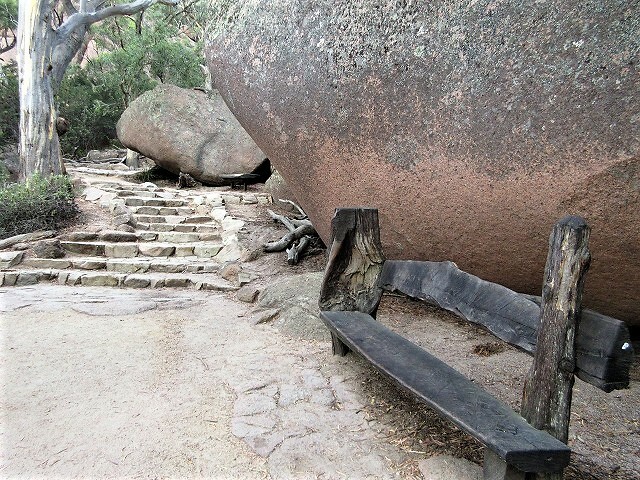 There are unique benches made up natural wood on the middle of the trail. 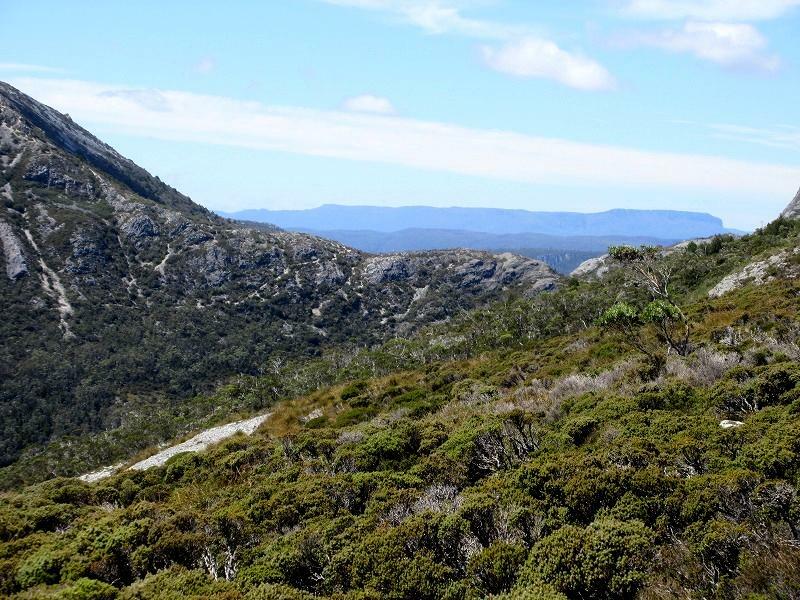 When you reach the saddle between Mt Amos and Mt Mayson the trail turns left and leads to the Wineglass Bay Lookout. 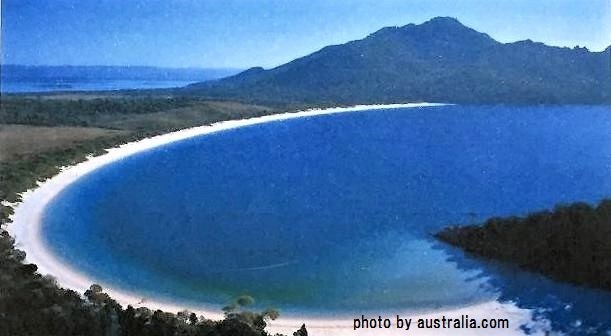 The lookout gave me one of Tasmania’s most well-known views over Wineglass Bay. 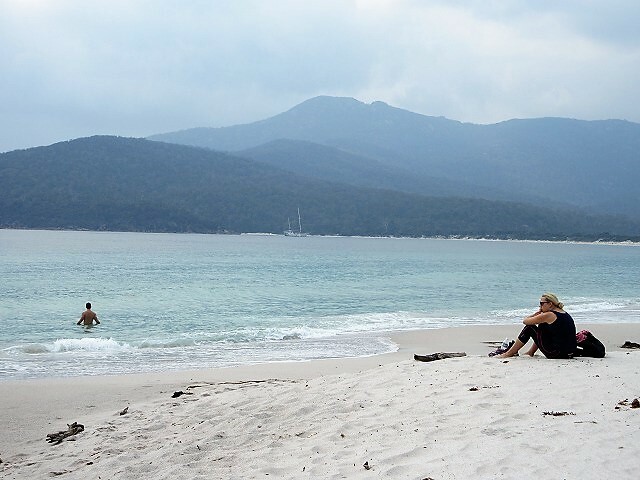 However, unfortunately Wineglass Bay on this day was hazy. 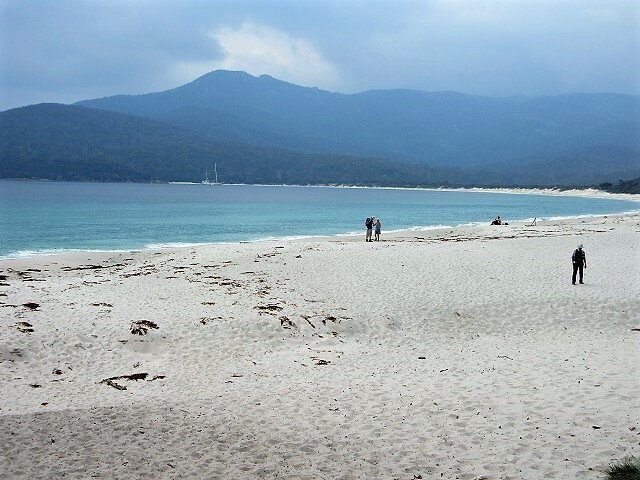 Let’s go down to the Wineglass Bay! Going back to the saddle between Mt Amos and Mt Mayson from the Wineglass Bay Lookout, and going down south east following the signpost. Continue downhill to the beach. 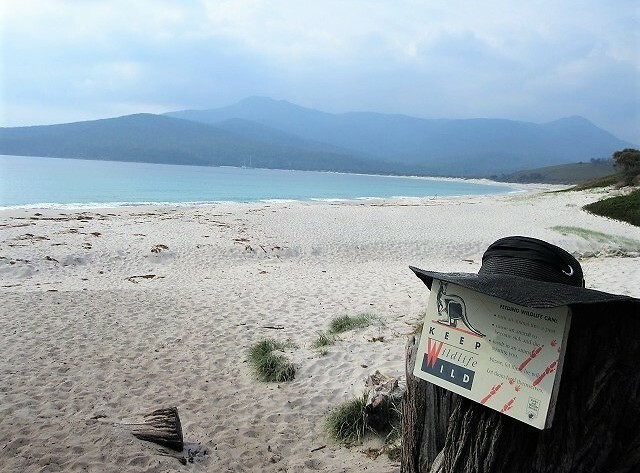 There is Isthmus Track just before reaching the Wineglass Bay beach. 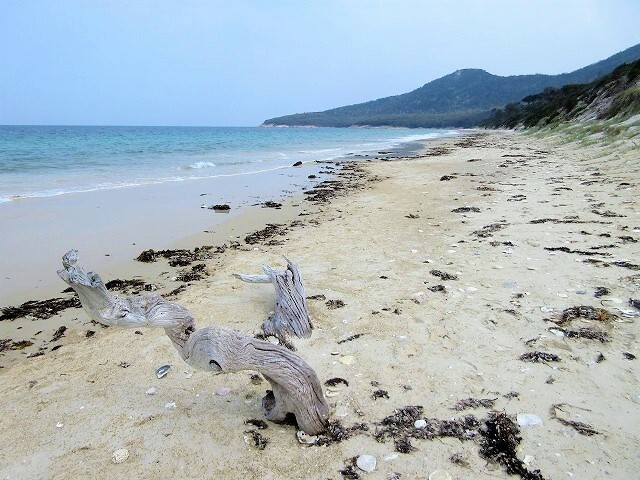 Let’s check out the beach before walking on Isthmus Track. Wow! What a beautiful beach! Someone left a straw hat on a guidedboard? The sand particles on the beach are very small. I thought that it would be good feeling if I walked there without shoes. 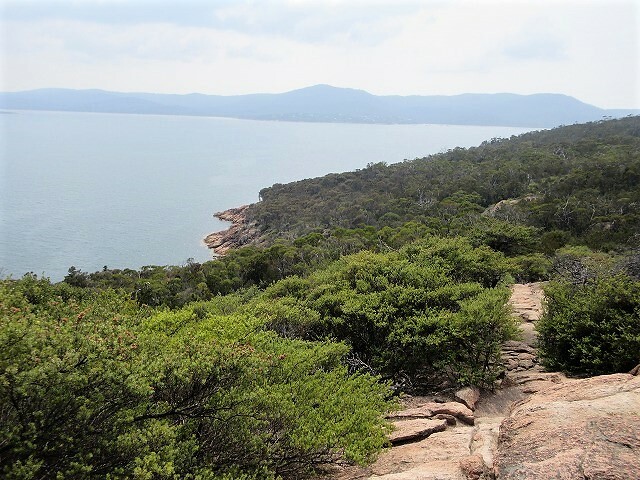 The mountains that are visible in the forward are Mount Freycinet and Mount Graham. Someone is swimming! 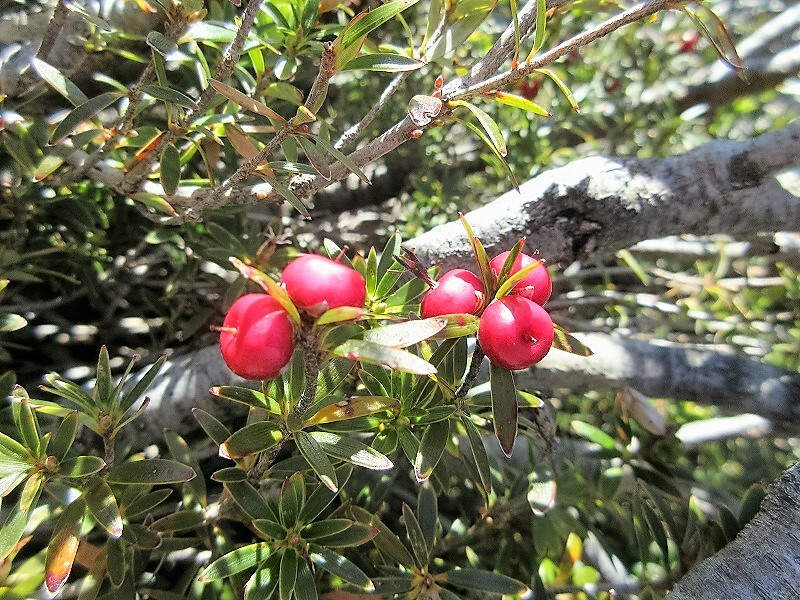 I realized that the Southern Hemisphere is summer. 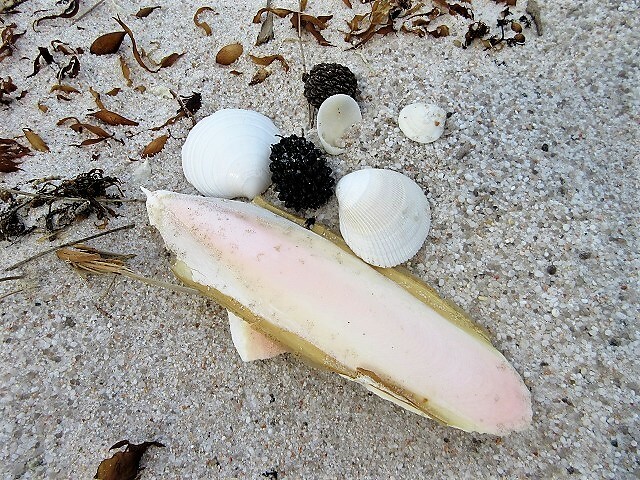 The beach has plenty of beautiful shells. 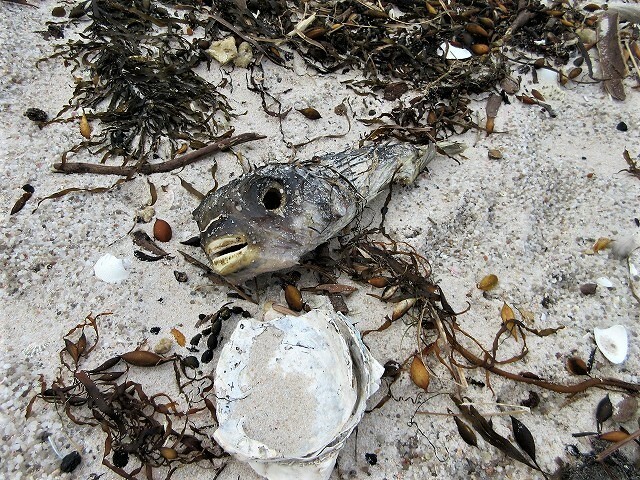 And sometimes dry fish!! 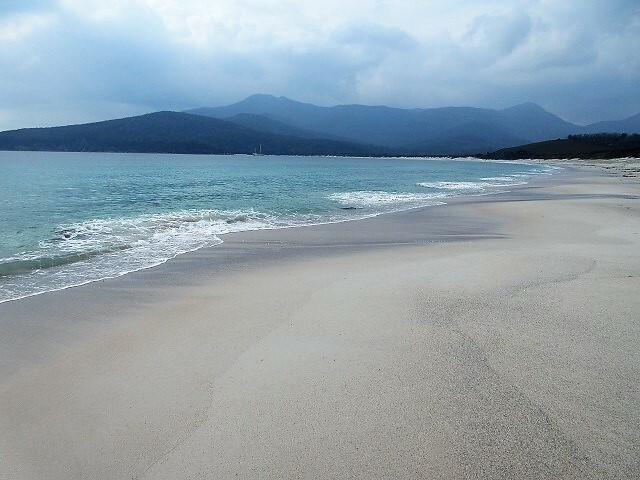 Its long white sandy beach. 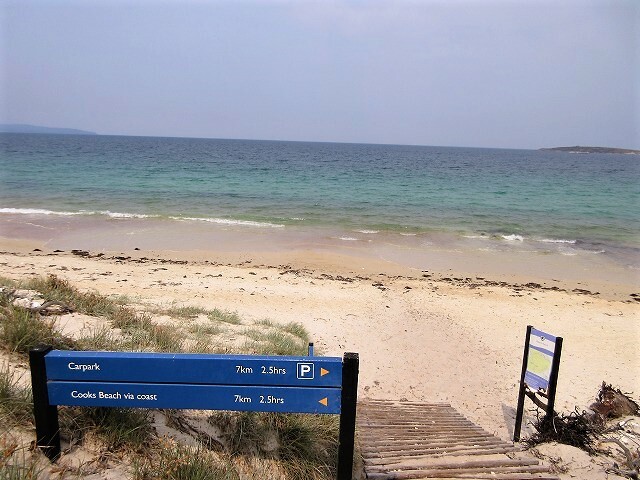 After walking a few minutes on the beach, turn right onto the Isthmus Track. Cross the isthmus to Hazards Beach. 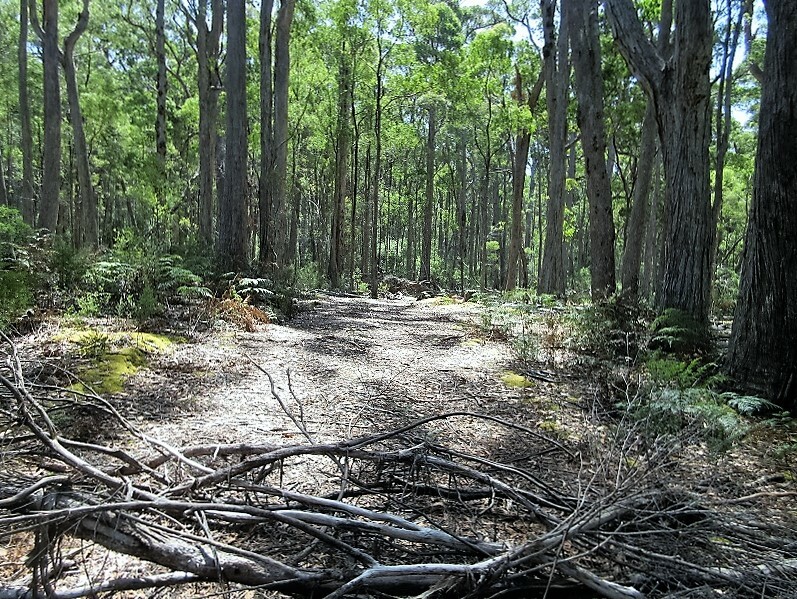 Isthmus Track goes through the pristine forest which is flat but occasionally has fallen trees. 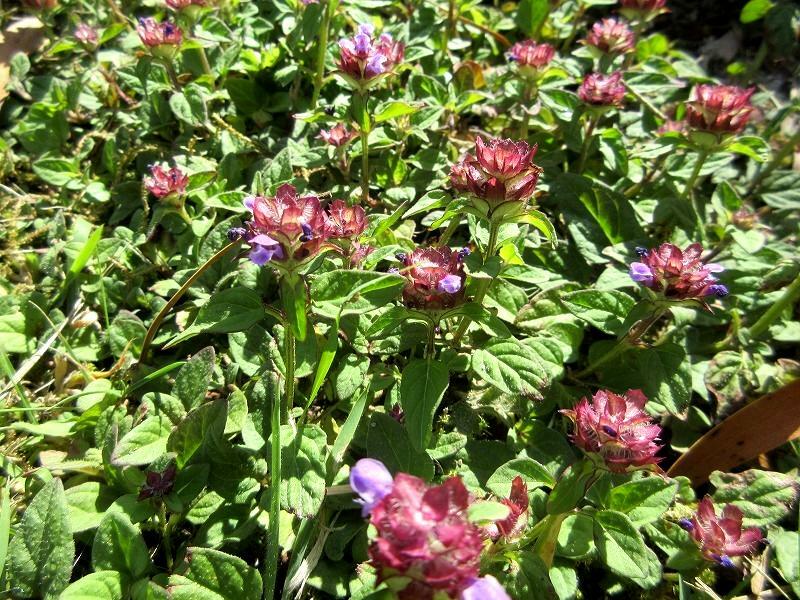 These are just leaves, but they look so nice. The trail suddenly changes to panel tail because that area is a wetland which is related to lagoons. After half an hour of flat walking I reached Hazards Beach. Turn right onto the beach and continue along to the northern end of the beach. 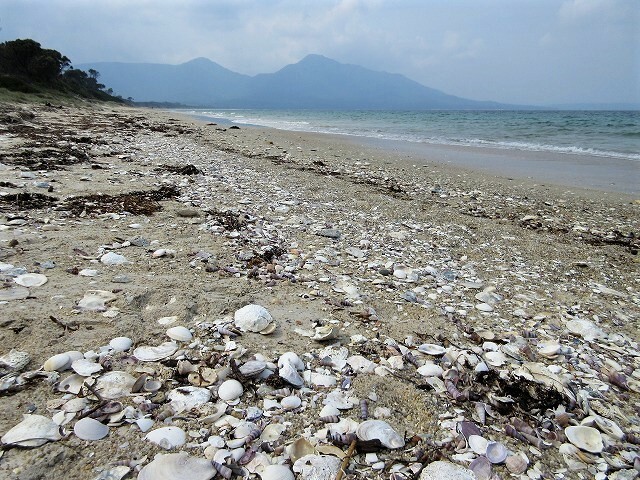 Many large shells like scallops are on the beach. 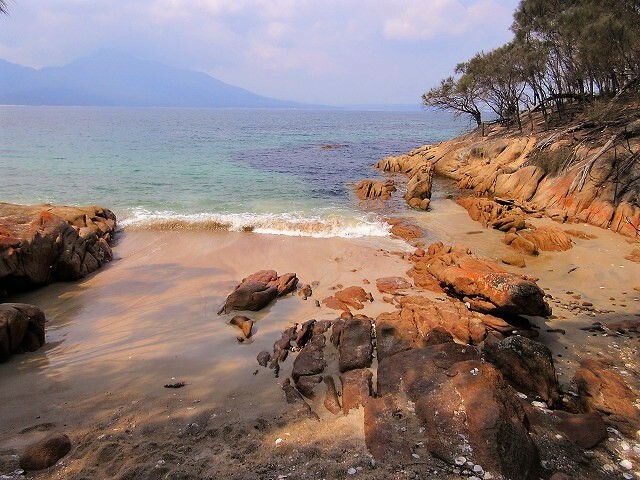 A small island of Hazards Beach. 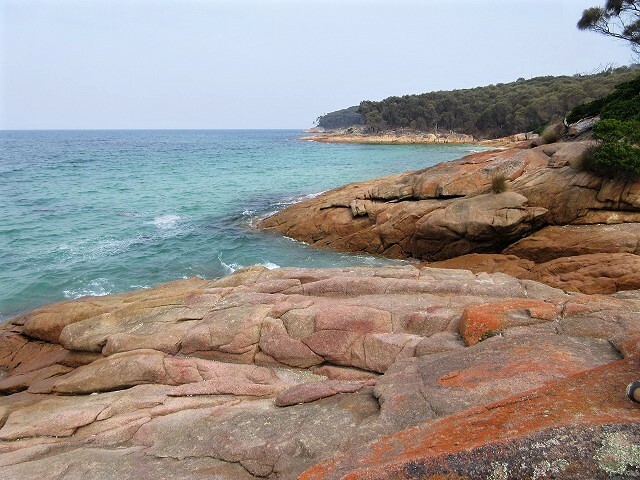 The coastline that continues from the end of beach to the west side has been rocky. Here is the northern end of Hazards Beach. 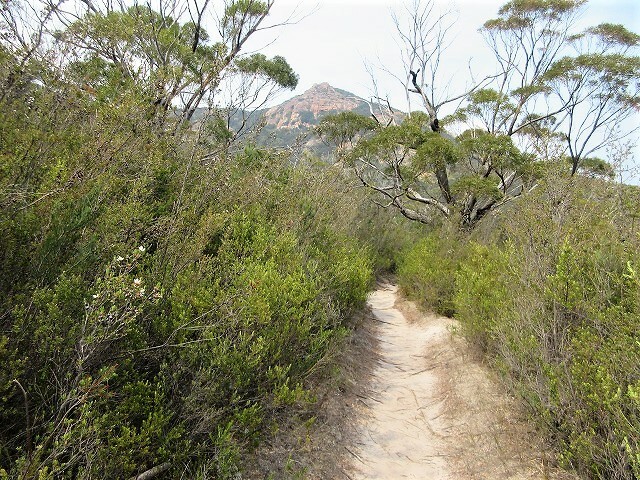 I join another trail that follows the coastline around the base of Mount Mayson. What happened in this area! 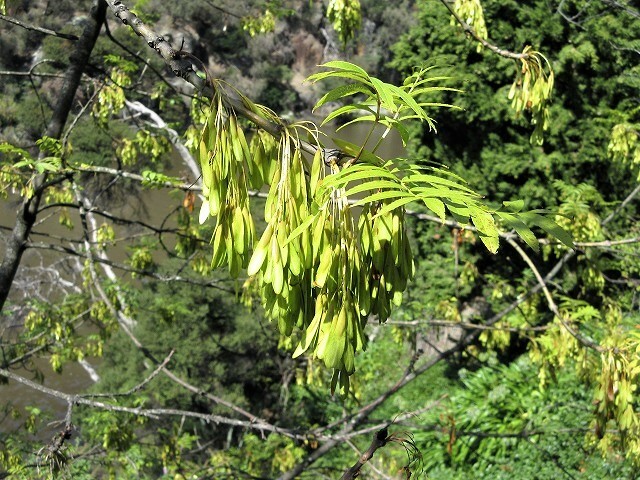 I entered the trail and saw that all trees in the forest had been dying. I wondered that cause was forest fire. As soon as I keep on walking the trail turns into a green forest. 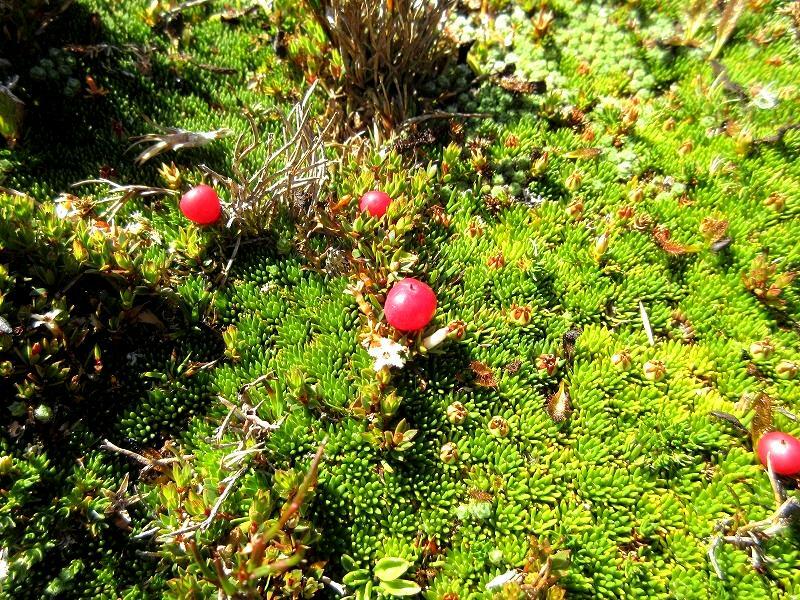 Sometimes, I saw the plants that mosses like coral reefs. I was staying their long time since that is unique. After a while, I got to a good place on a hill, and took a break sitting on the rock. Sea breeze was comfortable. A Boulder on the hill looks like Dharma doll that is a round good-luck doll made in Japan. 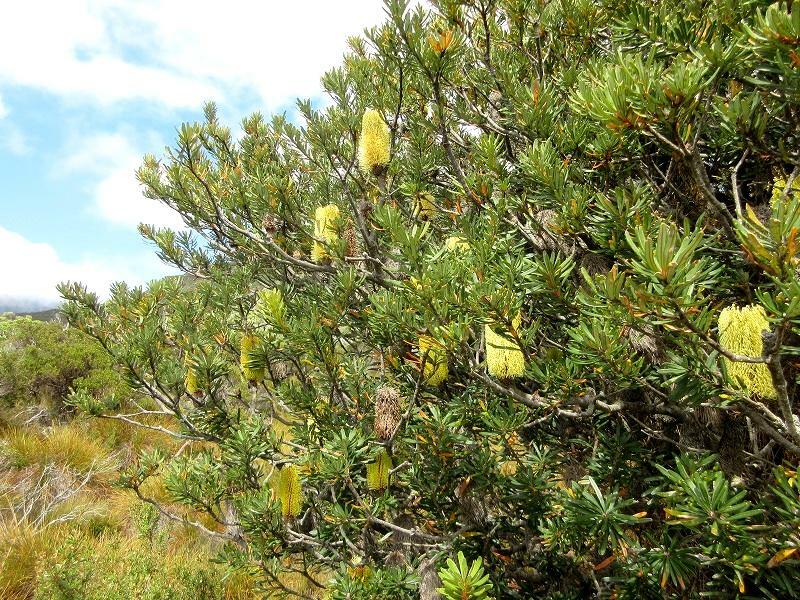 Going around the coastline from west to north, a community of Tea tree appears. Continues back to carpark. The carpark is close as you can see Mount Amos. It was a pleasant hiking where I can enjoy a beautiful beach and a view of the mountains at the same time. 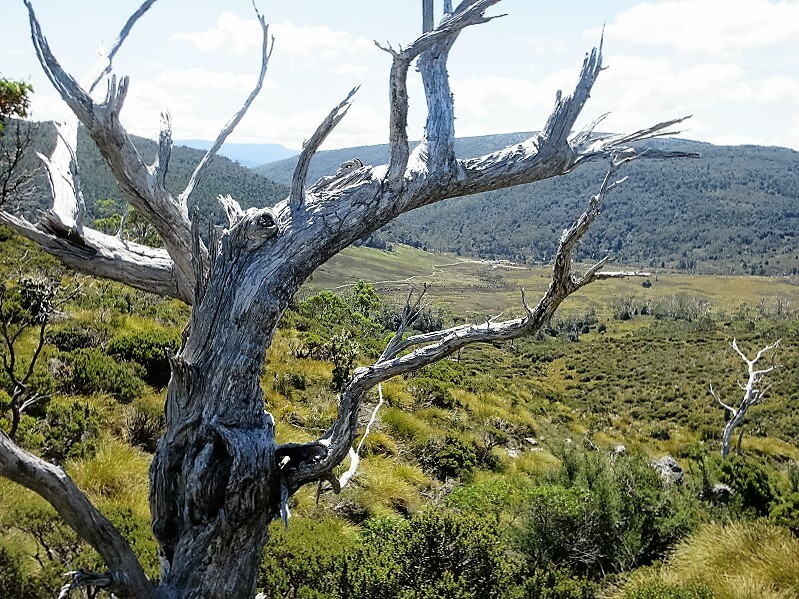 This article is the second volume of Day 7 in my solo trip in Tasmania, write Woolmers Estate in Longford, and Lake Leake. 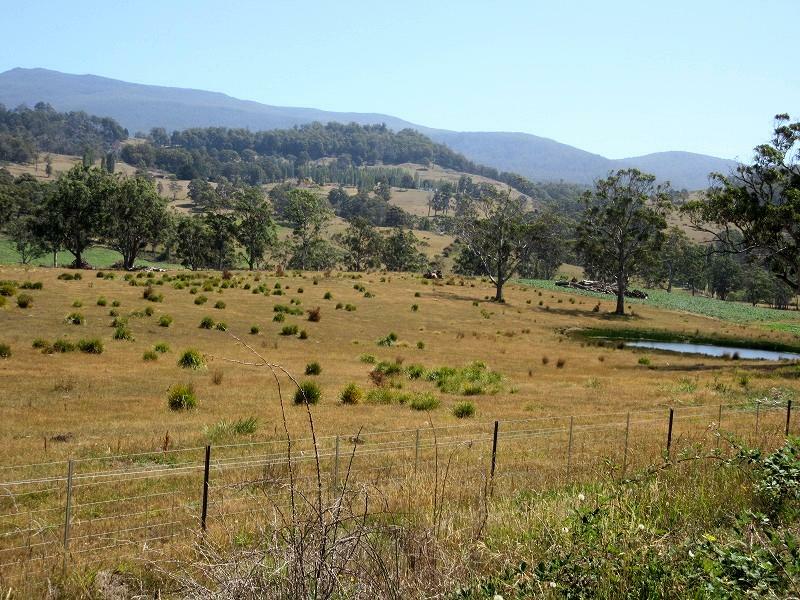 Woolmers Estate is old agricultural farm designated as a World Heritage Site. 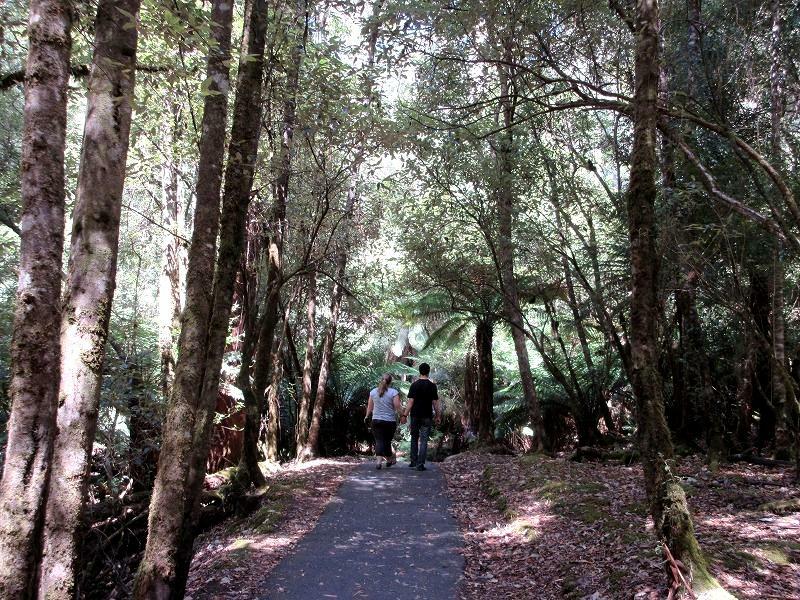 It is located in Longford which is about 25km south of Launceston. 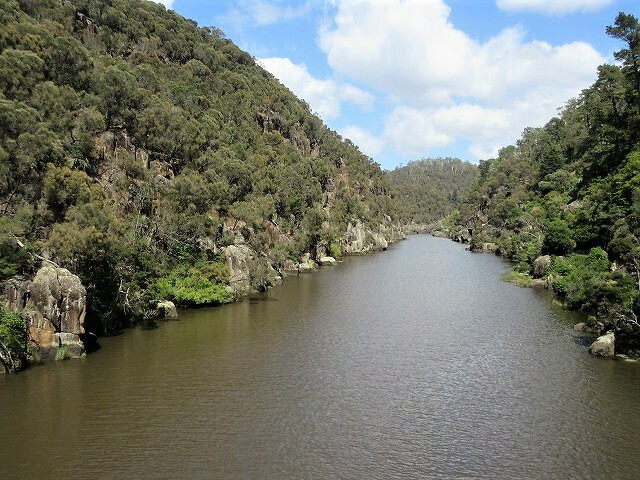 Go to south on HW 1 (Midland Hwy) from Launceston, past the Parth, turn to west on C 521 until the Macquarie river. This route is a shortcut because you do not have to pass the city of Longford. 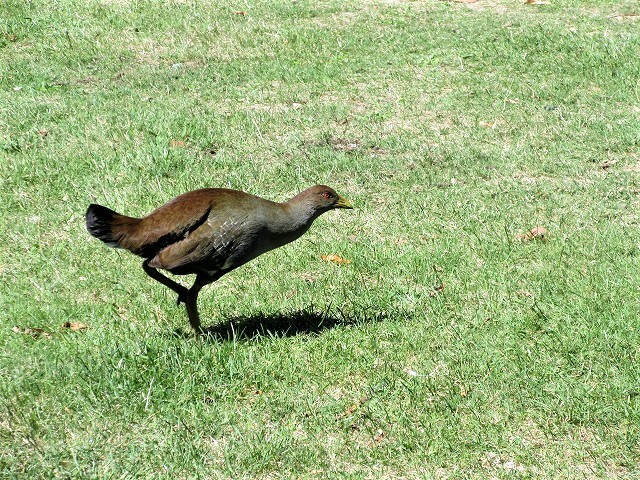 I saw unique animals, which I have never seen before, were eating grasses in a ranch where along C 521. What kind of animals are those? A horse has thick neck? a donkey? a mule? a sheep? 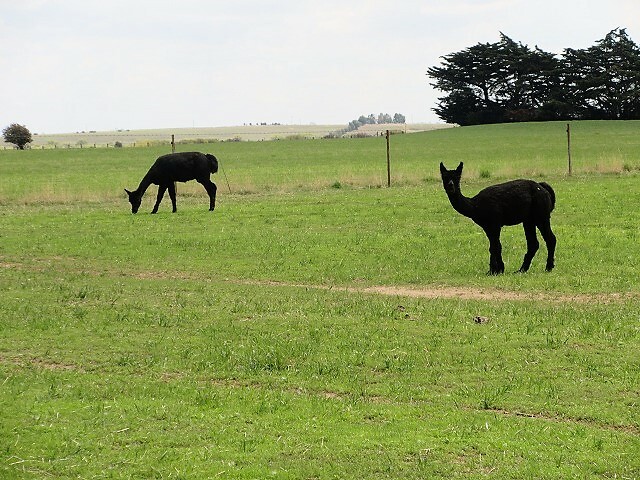 · · · · · · Well, is it black alpaca? 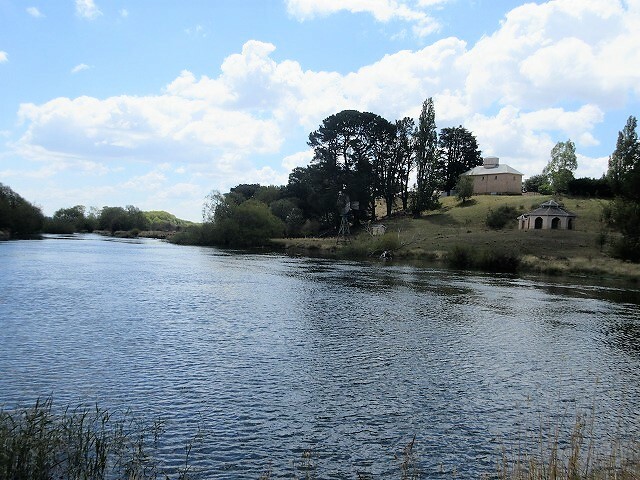 Woolmers Estate is just before the road crosses the majestic Macquarie river. 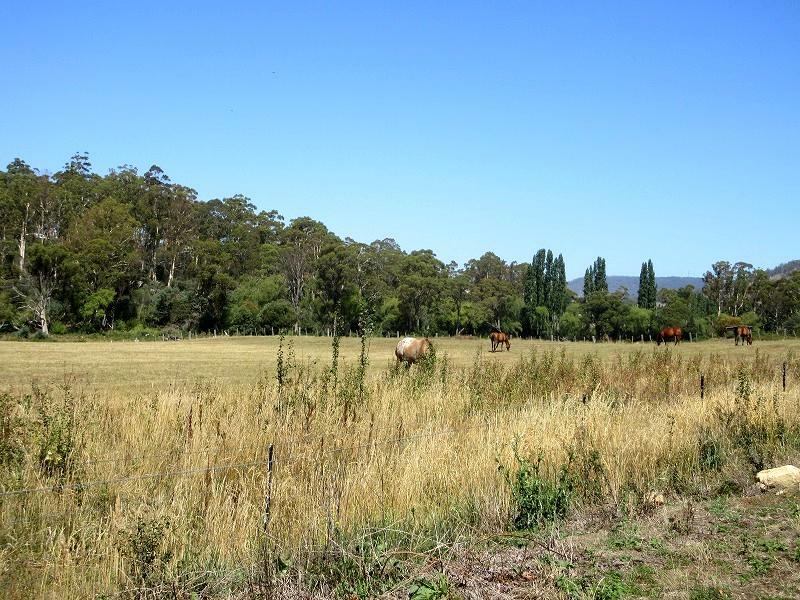 Woolmers Estate is farming estate of Archer family who has been running for six generations since settling in 1816. 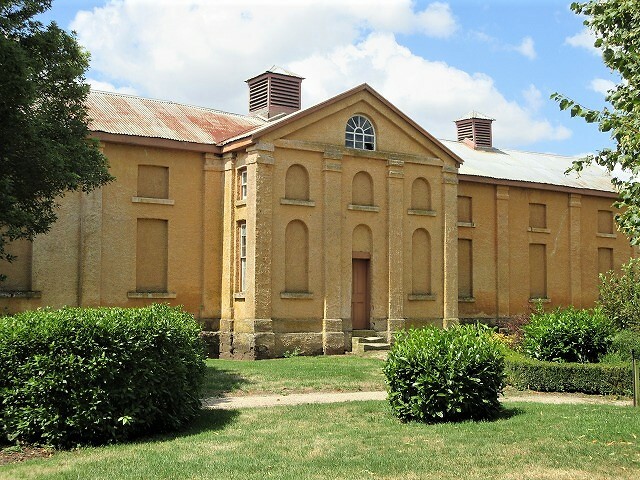 Woolmers Estate was World Heritage listed as part of the Australian Convict Sites in 2010. Why one of the rural farmers is a world heritage? Because Woolmers Estate took convict system as a labor. In other words, Archer family had built up wealth by using convicts. I did not have waiting time for the guided tours. 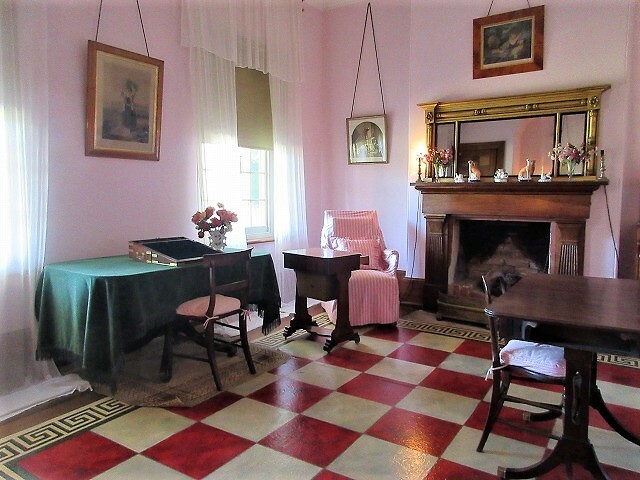 Also, I am not interested in luxurious furnishings of the 19th century, so I did not participate in the tour and I looked around in the facilities other than the main building by myself. 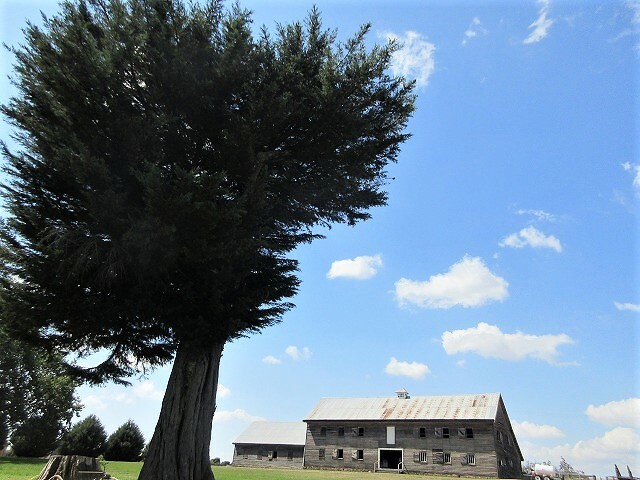 There are plenty of buildings in this facility such as coach house, barns and wool shed even without the main house, so it takes a lot of time looking around all this large premises. 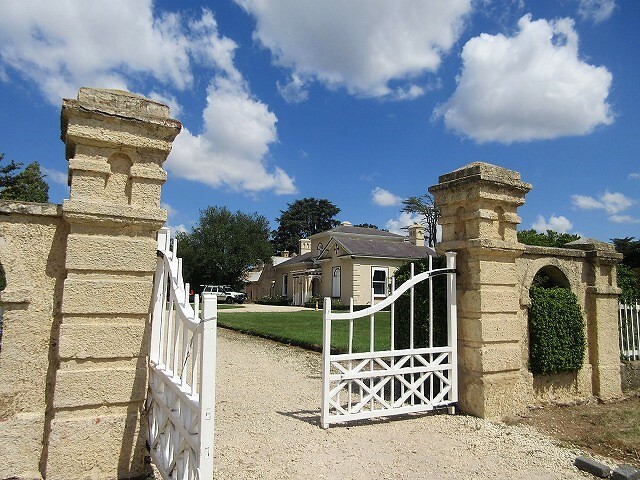 The coach house is a luxurious stable could house up to 12 horses. 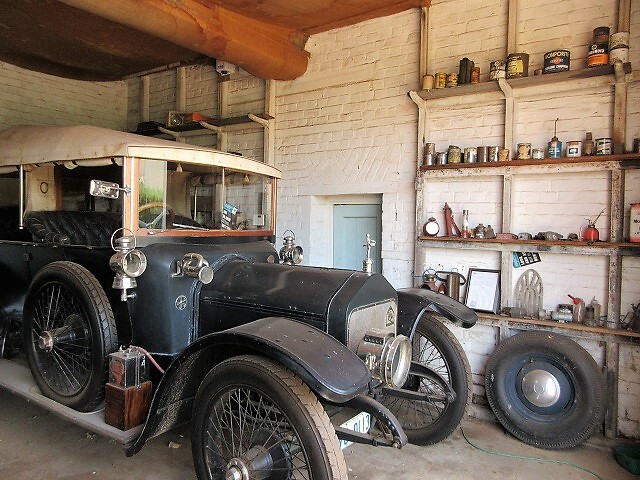 A vintage car is placed in the garage, which makes me feel like having a time travel to the 19th century. 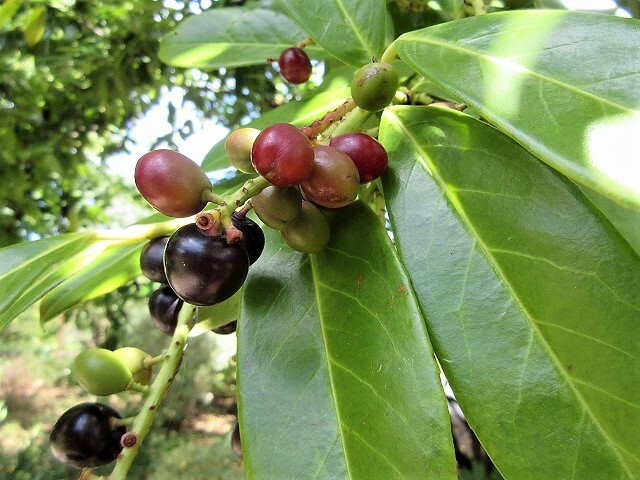 There are some English gardens on the property, plenty of flowers and fruit trees are growing. 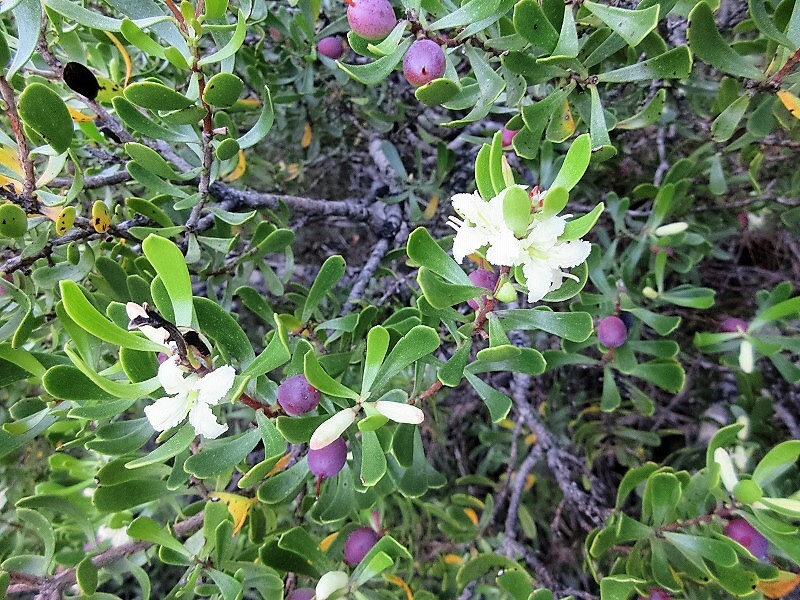 This olive tree bears a lot of fruit. The Store? or Kitchen Wing? Old agricultural tools are also exhibited. 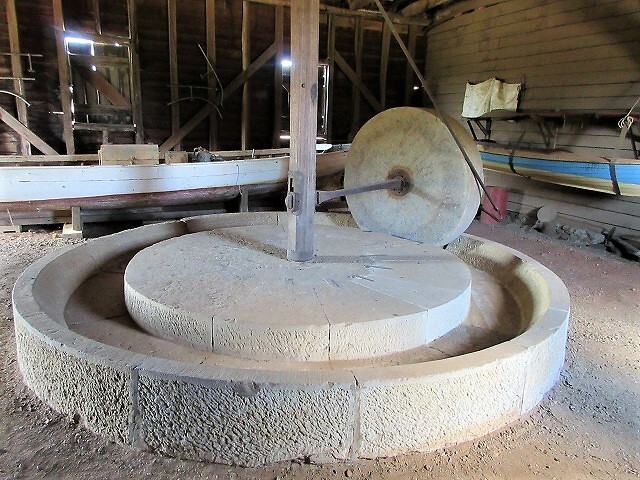 Grain Grinding Wheel! 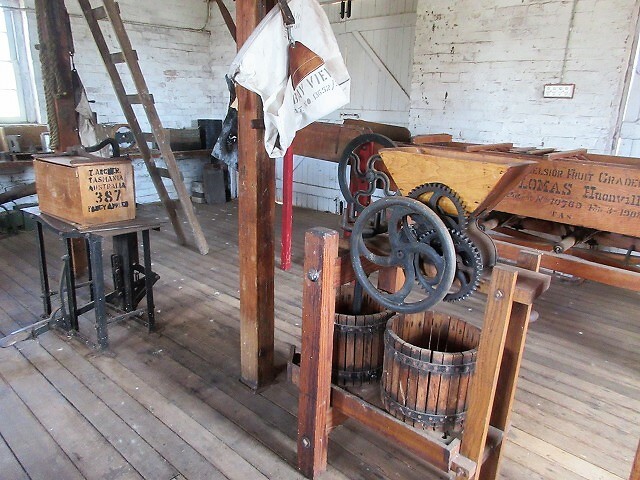 A horse （not a convict）had drawn cider press. Archer family who was one of the leading wool farmers in Australia. 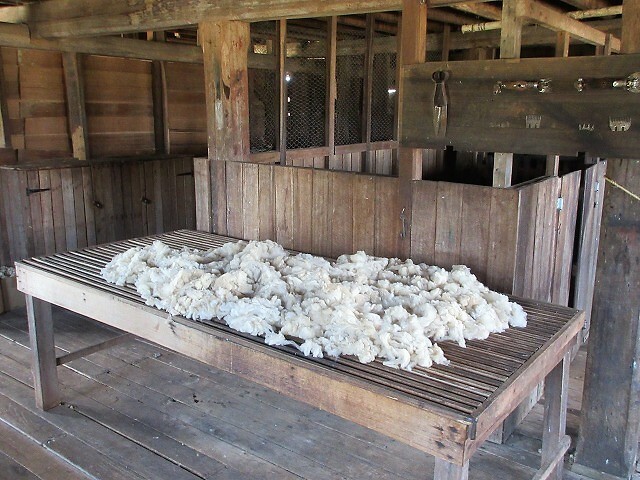 This is believed to be Australia’s oldest wool shed, and is still in use. 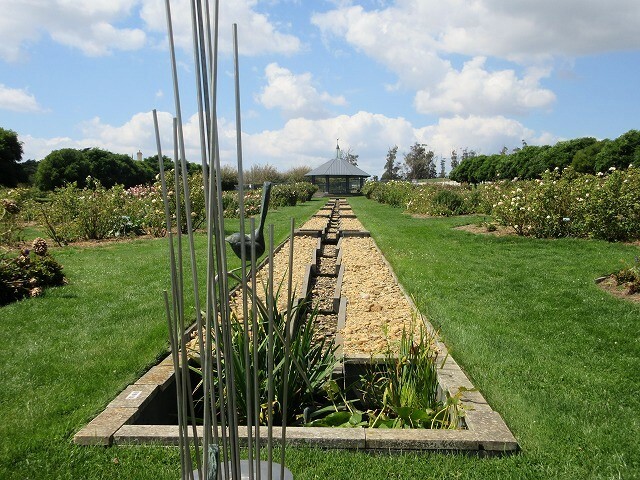 The Woolmers Estate features the National Rose Garden, which was begun in 1999 and fundraised by public donation. 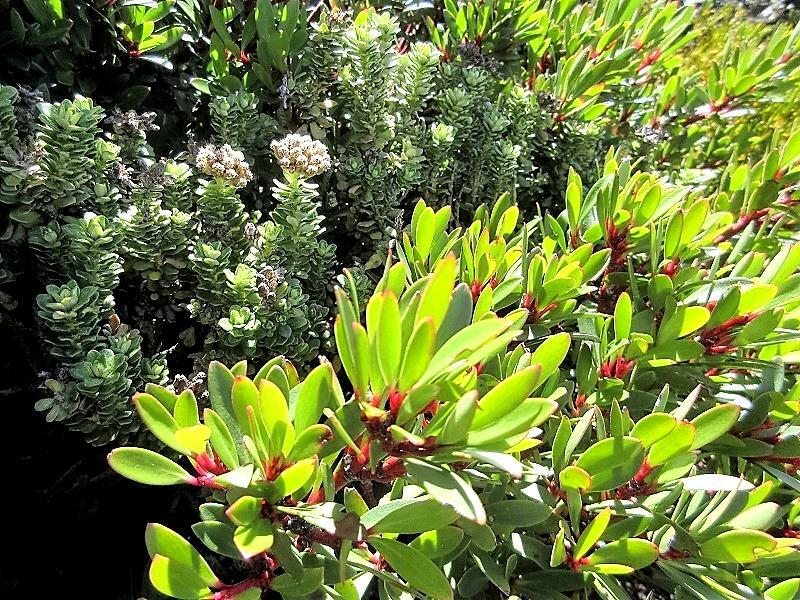 It has 460 varieties of rose, and over 5000 individual plants. 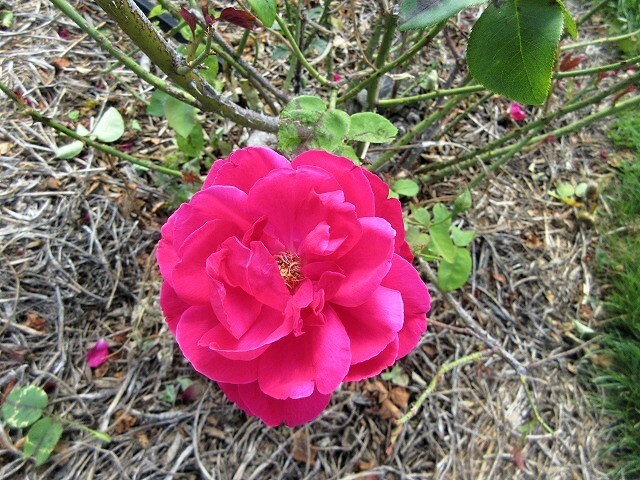 Normally, season in full blooming roses in the Southern Hemisphere is October or November. Since it is February, so the number of roses is a few, but still I was able to see many kinds of rose flowers. 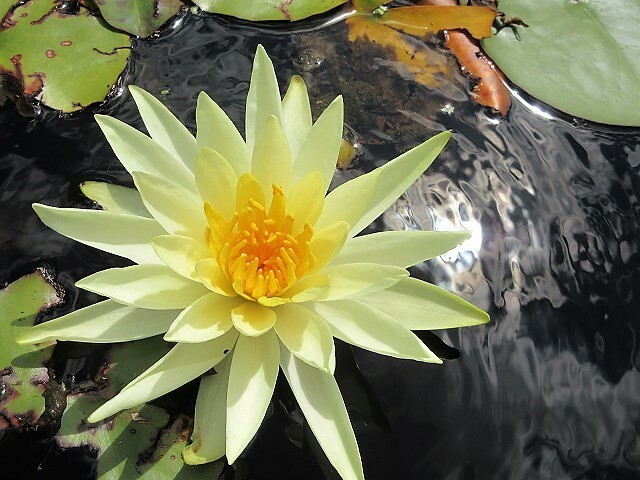 Also, a lot of lotus flowers such as red, yellow and white were in full bloom in a pond. I felt hungry after looking around this large estate. 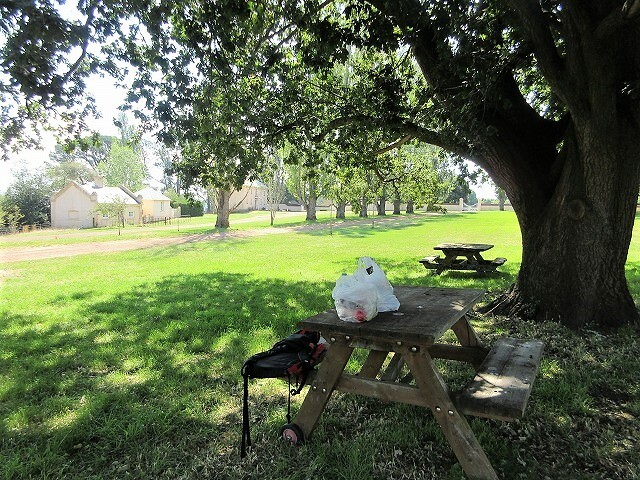 I knew there is a restaurant in this property, but I had lunch at a picnic table under a big tree. I enjoyed my sandwiches and fruits I bought at a supermarket in the shade. 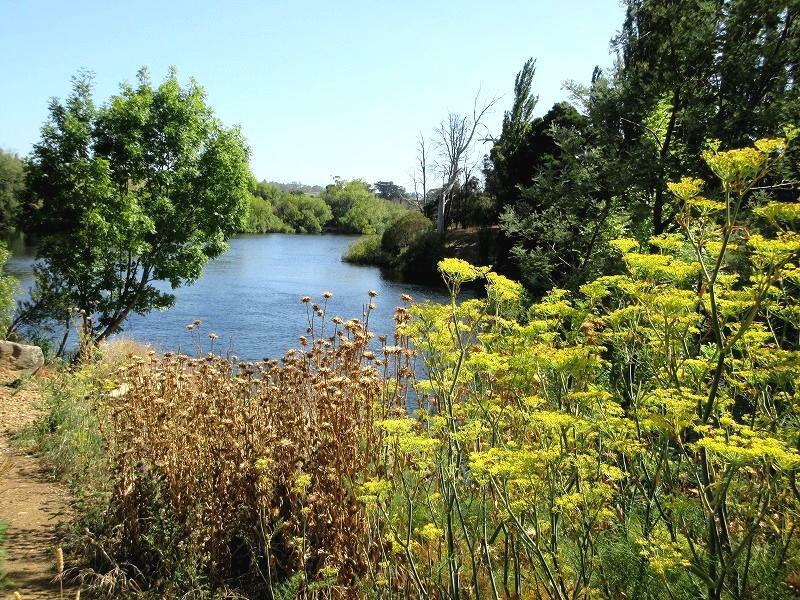 A cool breeze come from Macquarie River. 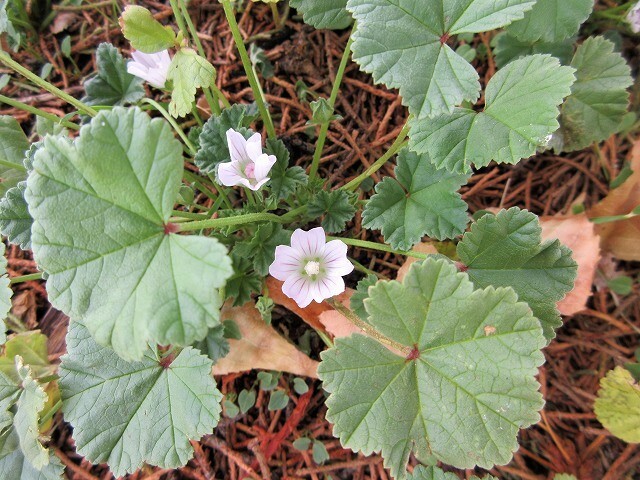 I found small flowers at below the picnic table. It made me getting warm hart. 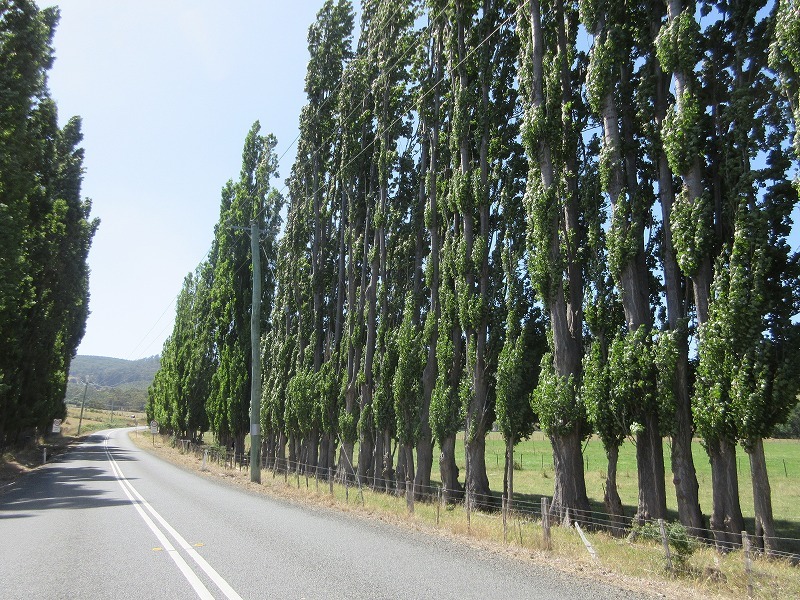 After lunch time at the Woolmers Estate, I drove on HW1 heading south to Campbell Town. And then, turn to east and drove along B34 in Gum forest. 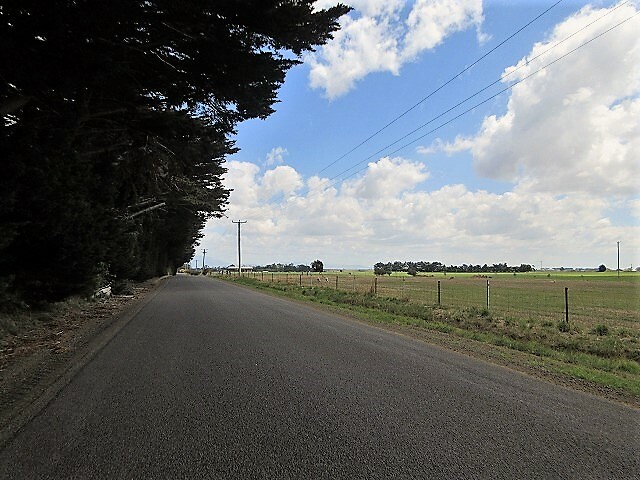 It is lovely country road. 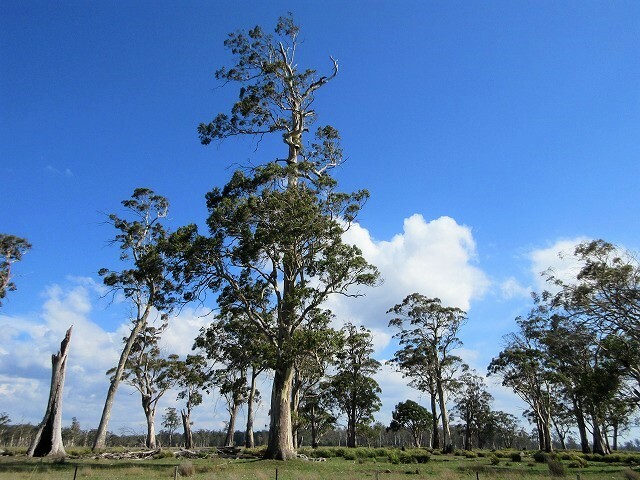 Big gum trees look beautiful in the blue sky. 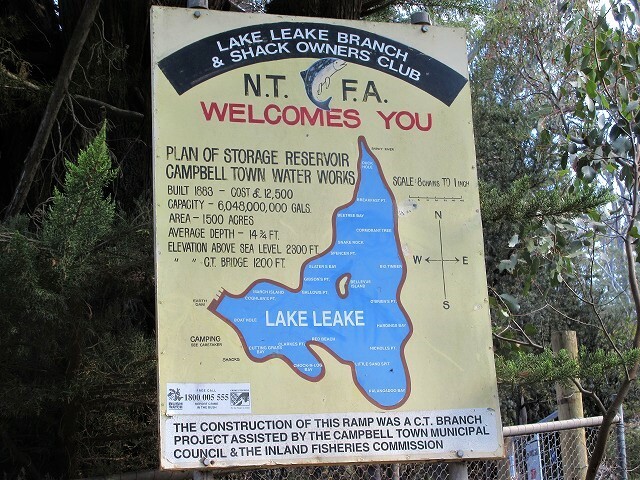 I found a signpost of Lake Leake at the point where I drove 30km from Campbell Town. I like lake so I decided to check out the lake. I turned to the north and drove for 4km. 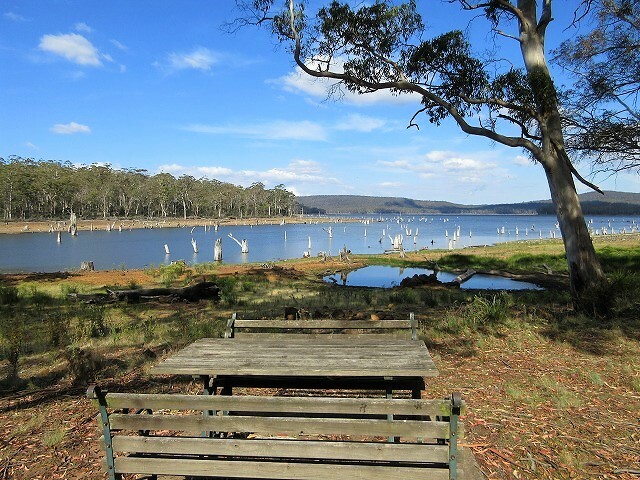 Then Lake Leake appeared near campsite. 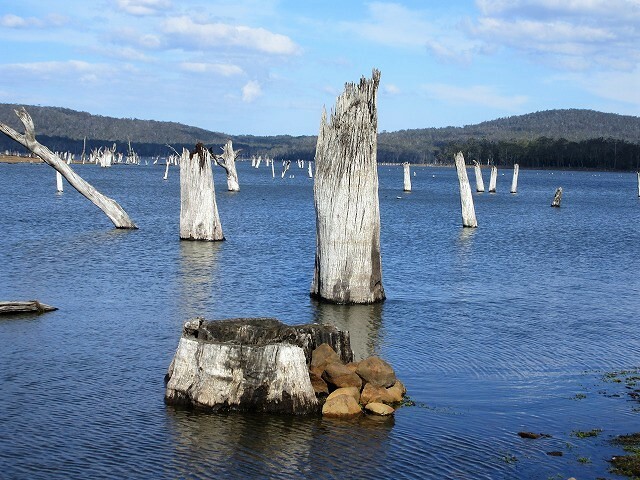 Many white trunks have jutted out from the lake. Wow! the view is unique! 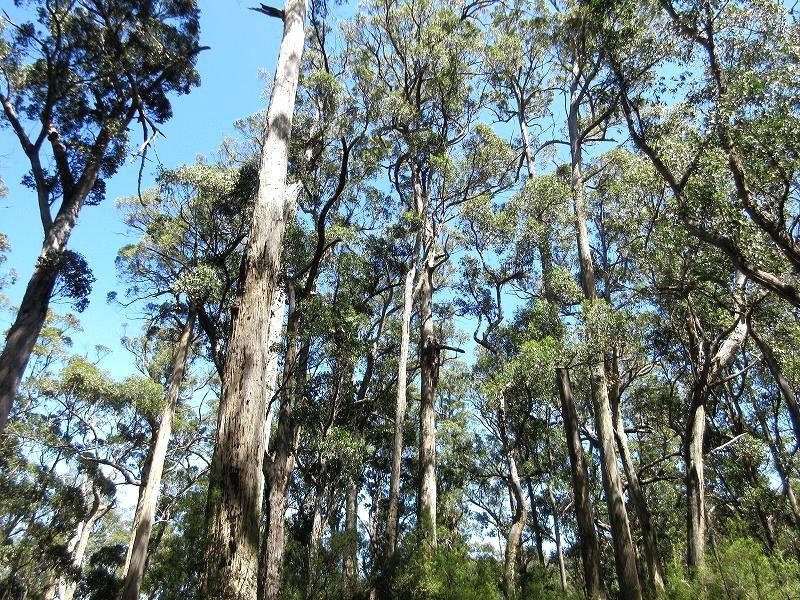 These white trunks are probably Gum trees. 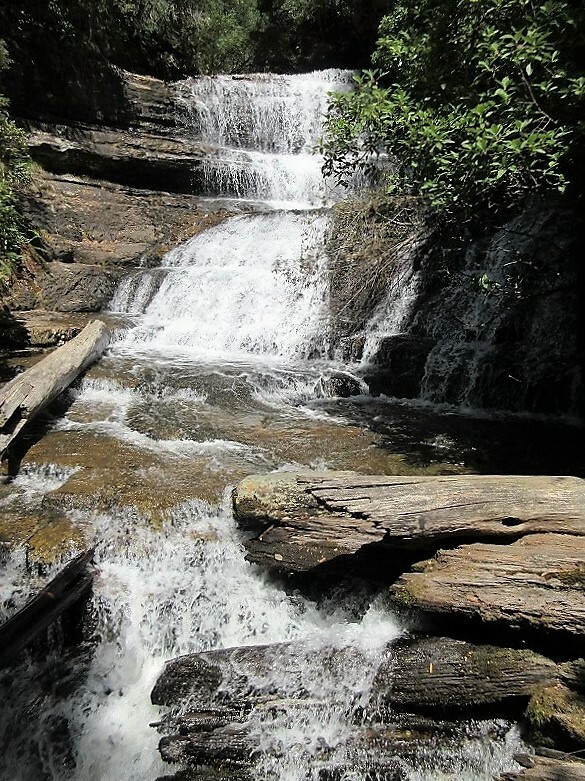 I decided to go to the Lost Falls Conservation Area near Leake Lake. Go back to B34, drive a few kilometers east and drive south, the road will become a dirt road. 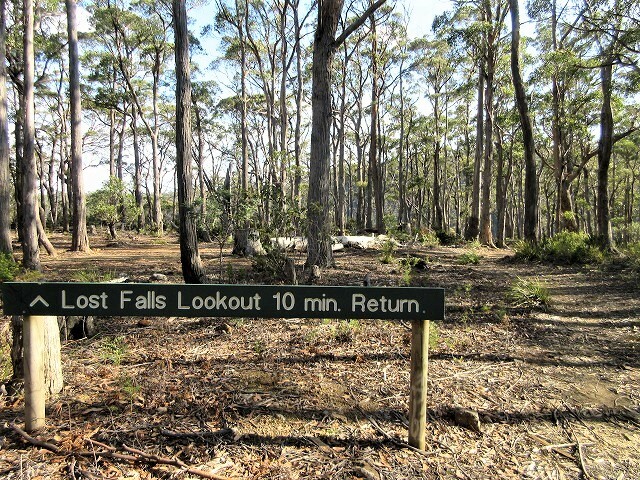 Follow the signpost turning to the left and drive for about 5 km, then you will reach the Lost Falls parking in gum forest. Approximately, 10 minutes round trip from parking to Lost Falls. 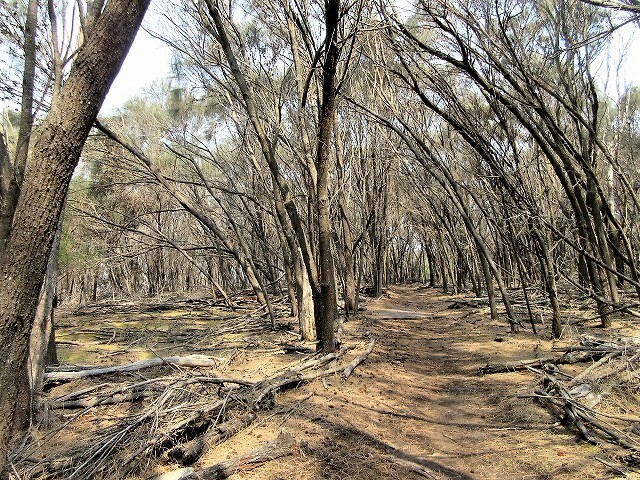 The area is a very wild forest atmosphere. Lost Falls can be seen in a distant in the valley. Unfortunately, the distance is too far for looking the waterfalls. There seems to be no trail approaching the waterfalls. I went to a place where written as River Pools on a signpost. And then I reached at the upper stream of the Lost Falls. There is a wide shallow riverbed, I relaxed there for a while. 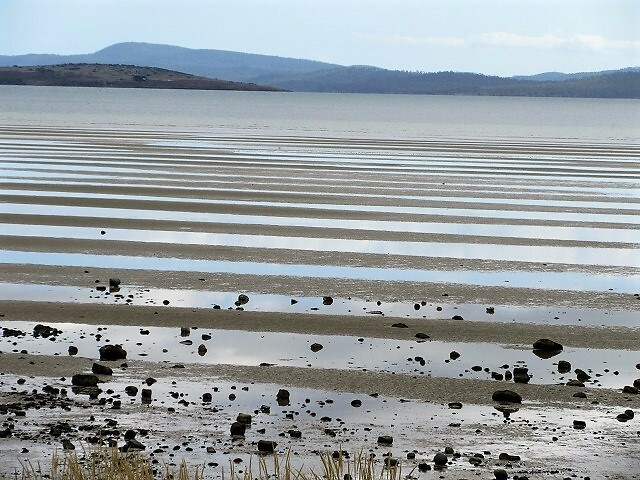 After then, I drove to a small town on the east coast called Coles Bay and stayed one night in there. It was a long day in 7th day of my trip. 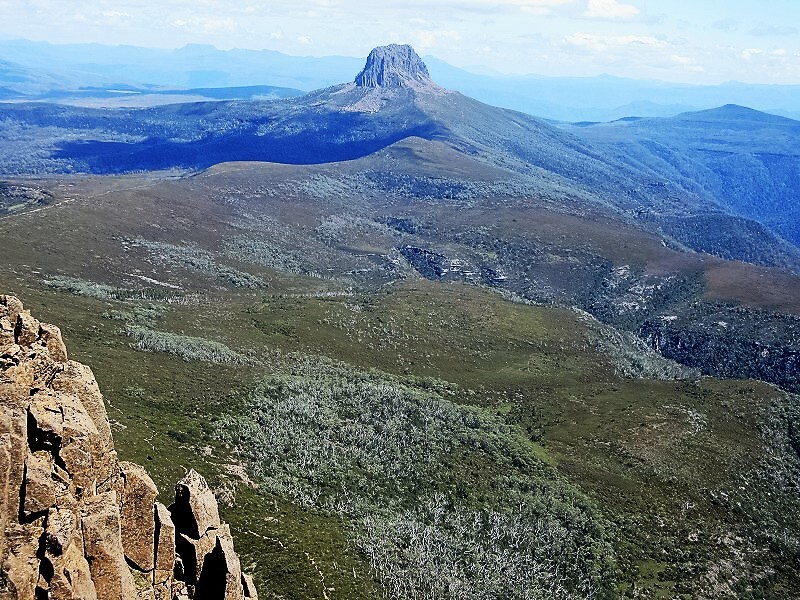 Today is the seventh day of my solo trip in Tasmania. 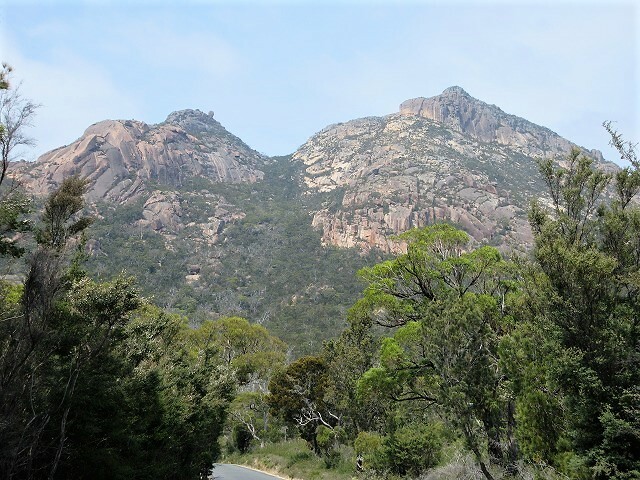 I am going to move from Launceston, which located in northern Tasmania to Freycinet National Park on the east coast. 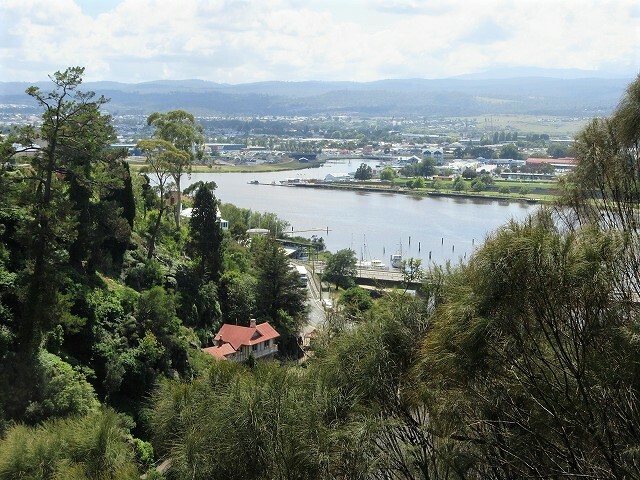 Launceston is a very historical city so walking in the town is good. 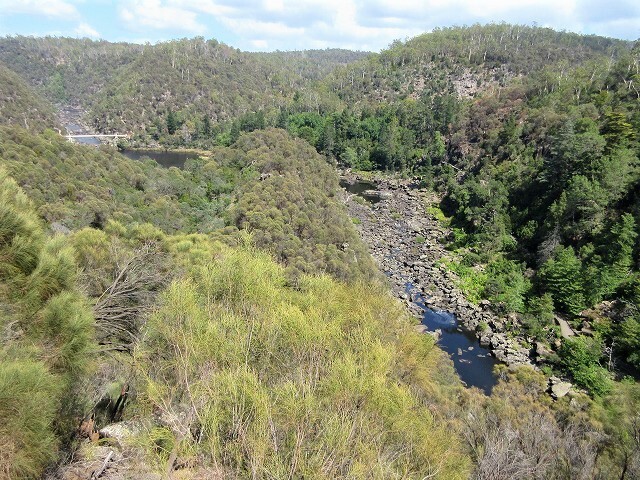 However, I decided to hike at Cataract Gorge, which is near by the city center since I love nature. 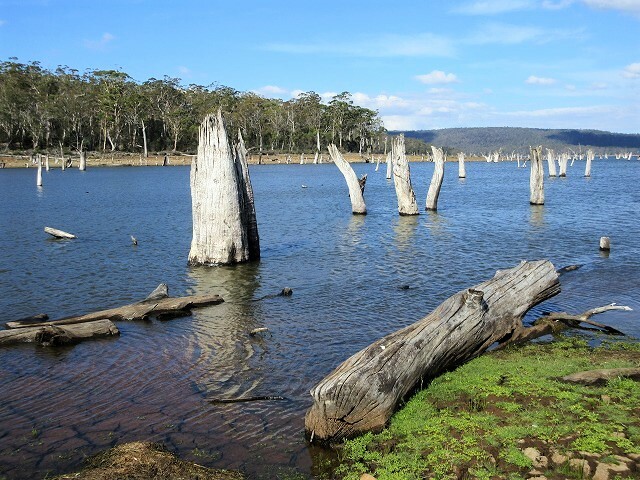 And than, I am going to drop by at the Woolmers Estate, which is old agricultural farm designated as a World Heritage Site, and a unique Leake lake on my way to the east coast. 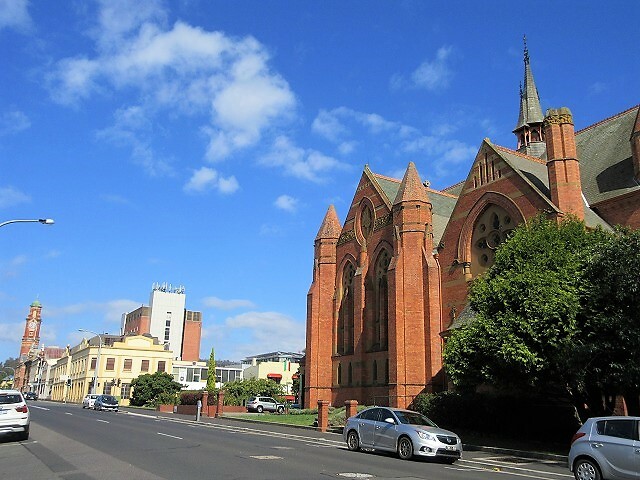 Launceston, the second largest city in Tasmania has many Victorian style buildings. There are many historical parks in the city. 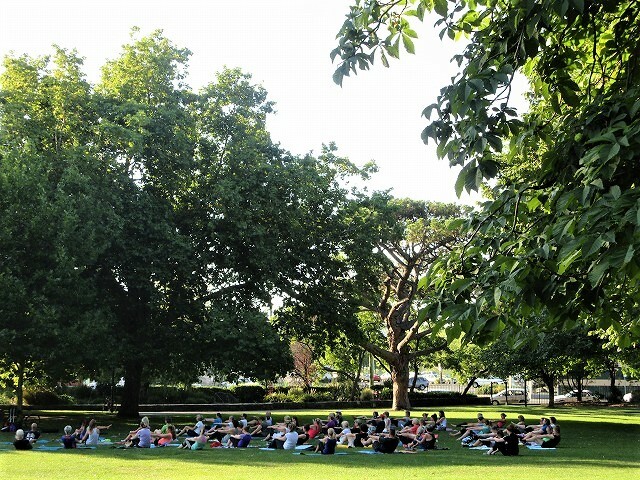 Many people were doing exercise like yoga in the park where I was strolling. 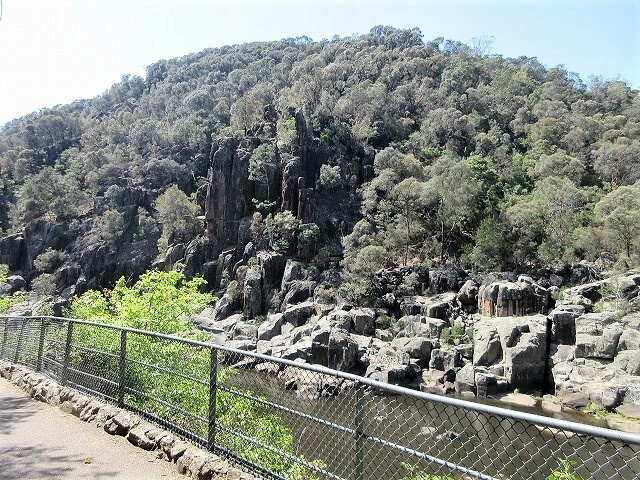 There is a Cataract Gorge in the place where drive to west for about 20 minutes from the center of Launceston. 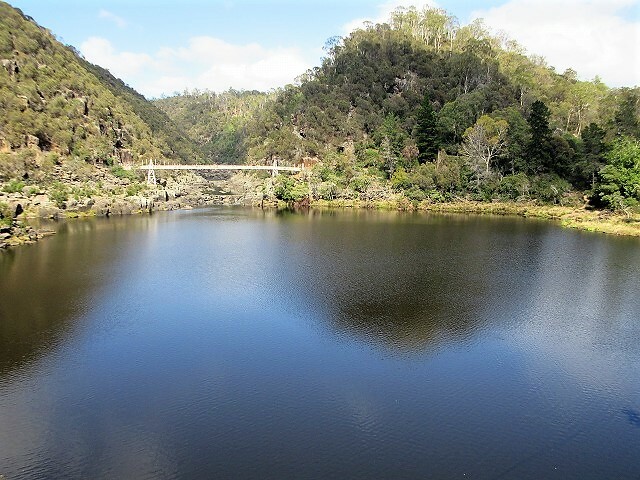 There are two tributaries North Esk and South Esk River flowing into the Tamar River which is the north side of Launceston. 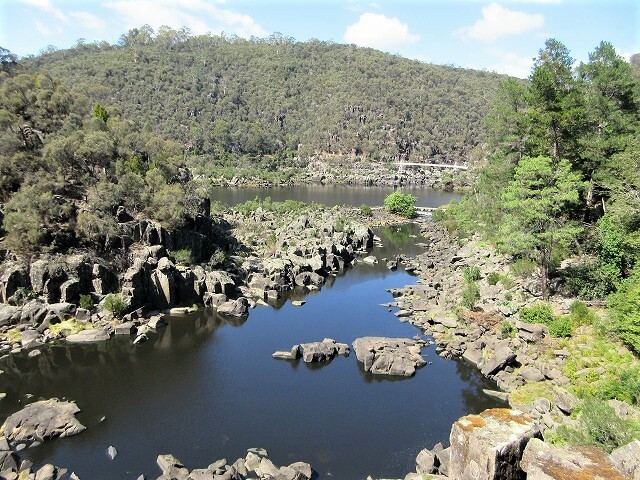 Part of the South Esk River is protected as Cataract Gorge Reserve. There is a well-maintained promenade in the park. 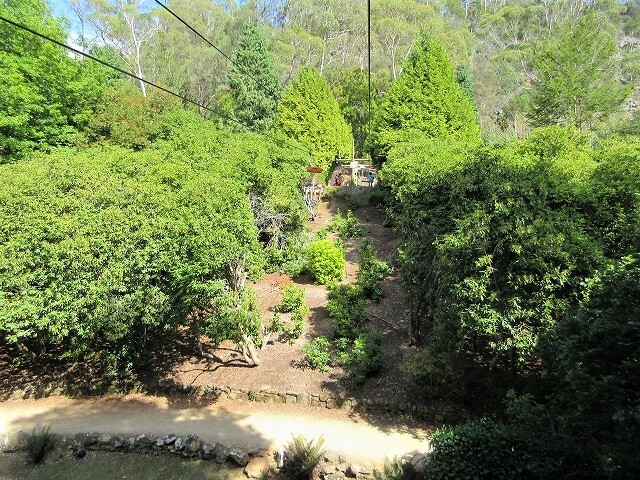 Also, there is a very long chair lift, so I enjoyed air walking when I had ridden on the lift. 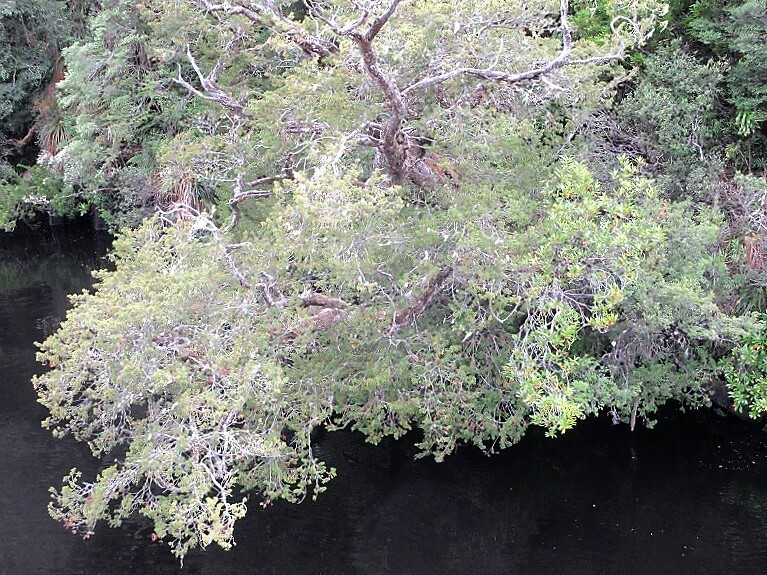 I can see Cataract Walk trail on left side along a downstream. The lift takes in less than 10 minutes and arrives on the hill in the park. There is a cozy cafe near the entrance of the lift. 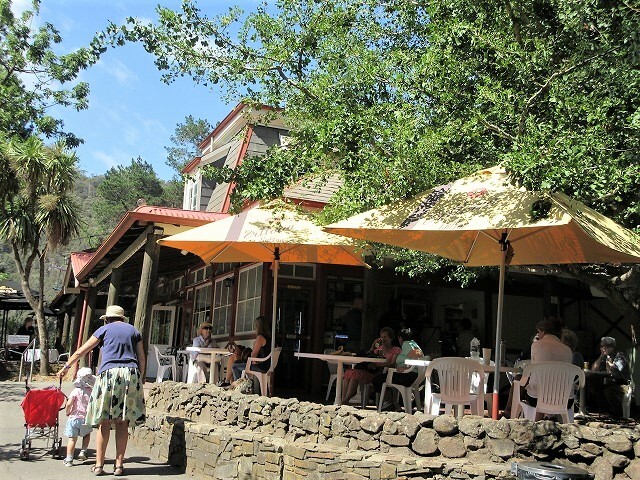 Many people spend good time in the café. 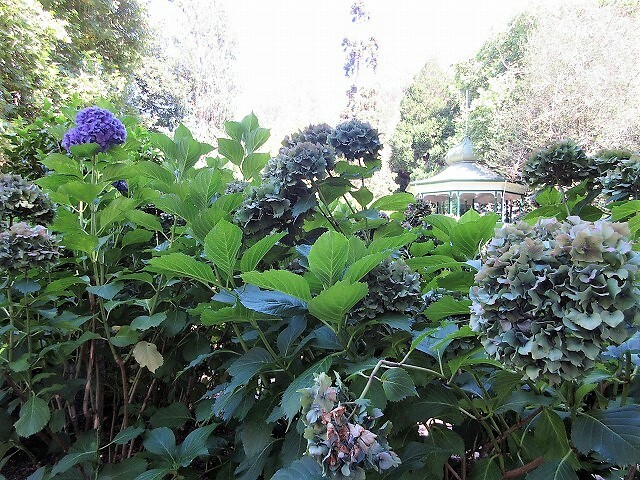 Flowers like hydrangea are in bloom nearby. 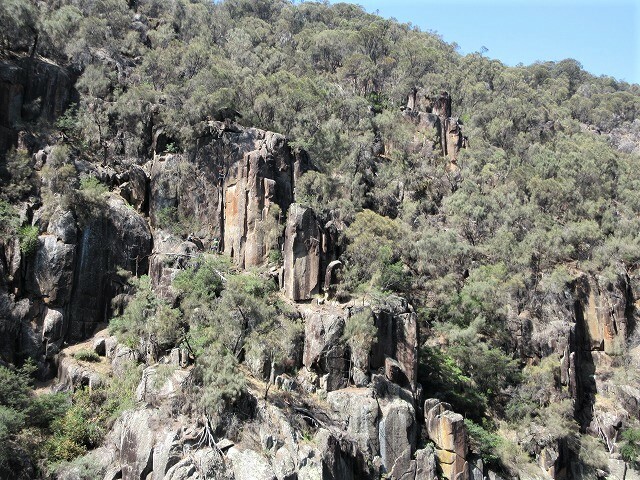 Many wild peacocks and wallabies live in Cataract Gorge Reserve. 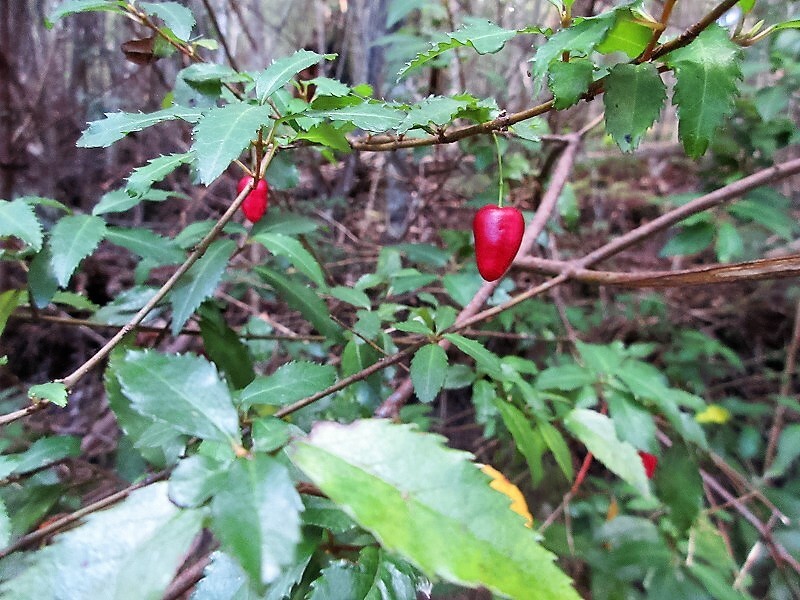 I started to walk on Cataract Walk trail. Cataract Walk that is paved trail lead to King’s Bridge. 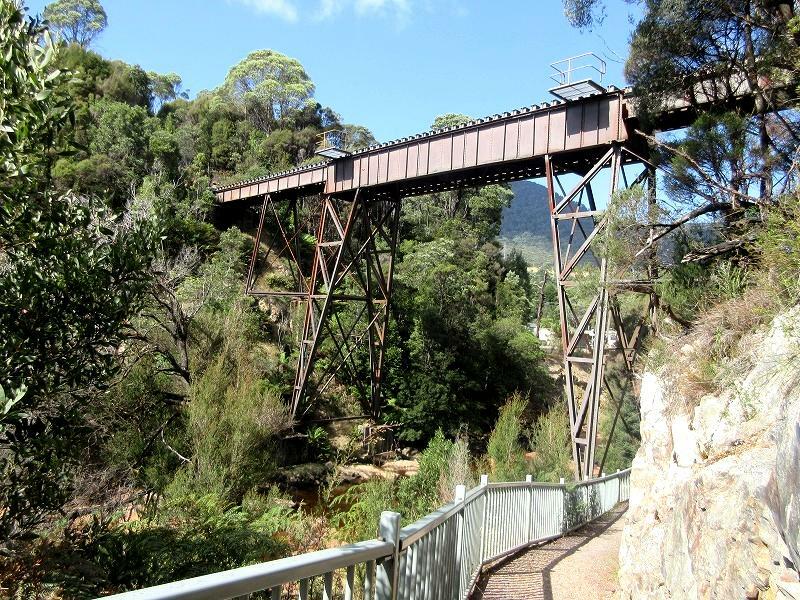 I am going to turn to Zig Zag Track from King’s Bridge. 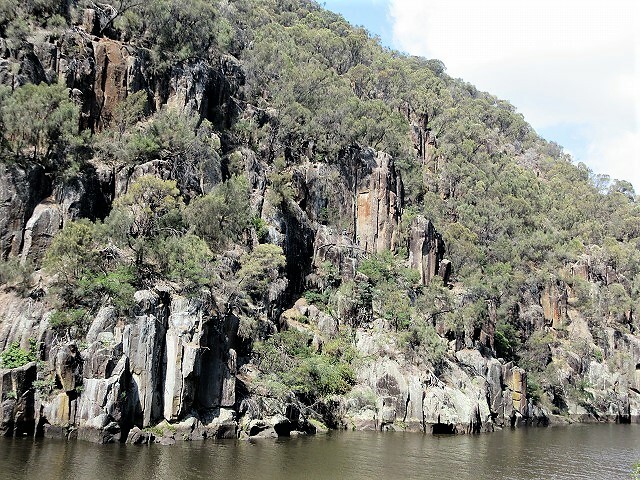 The scenery with a lot of rock cliff and rock towers on the riverbank attracts tourists. 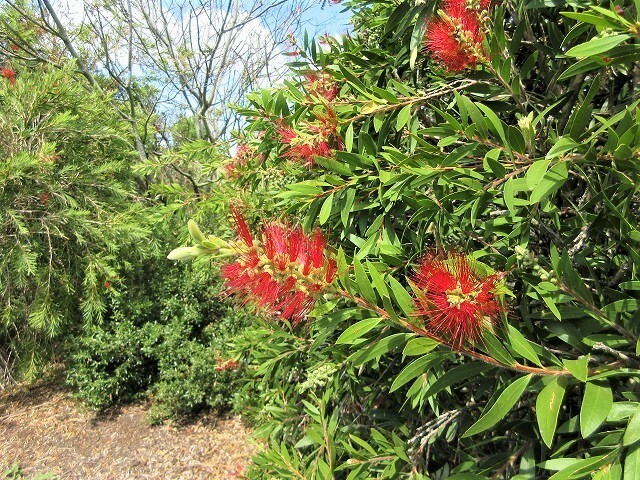 Unique flowers and trees were blooming beside the trail. 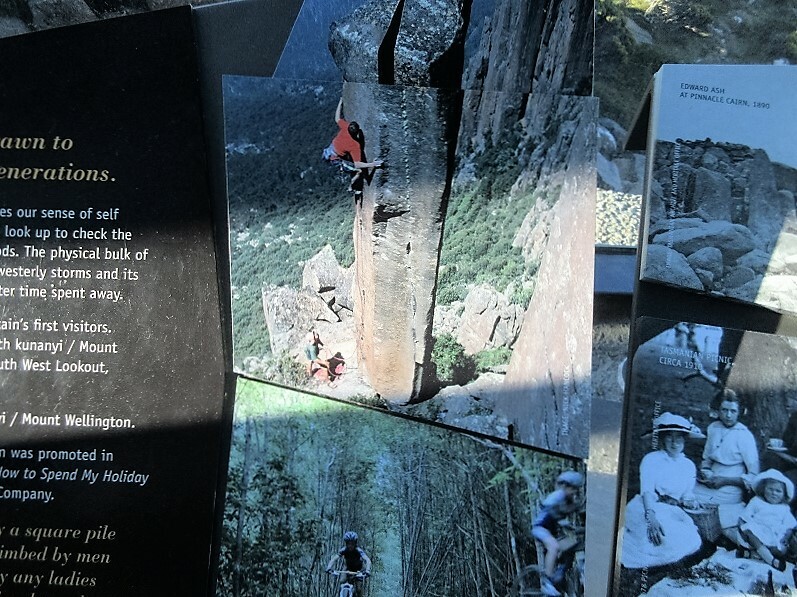 Rock climbers try to a crack in the rock tower. 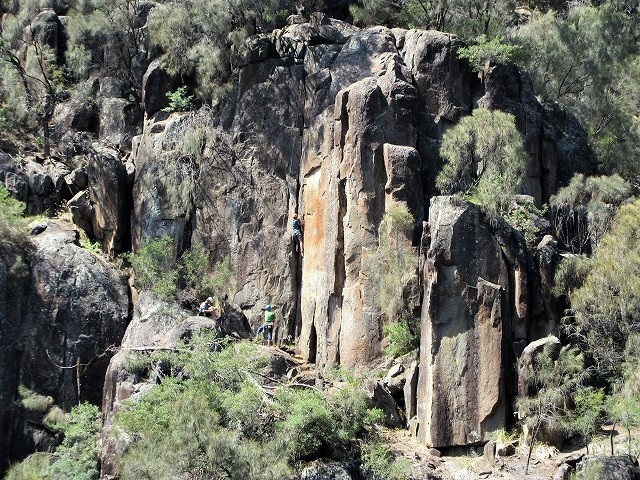 I miss rock climbing as I used to be a rock climber. 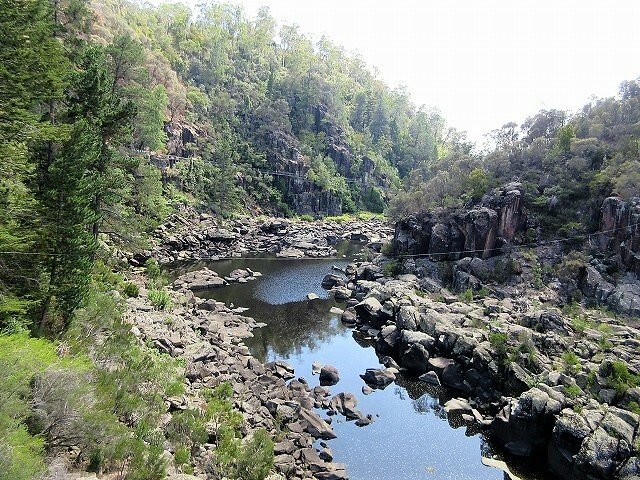 I reached the King’s Bridge when walked about 1 km on Cataract Walk. 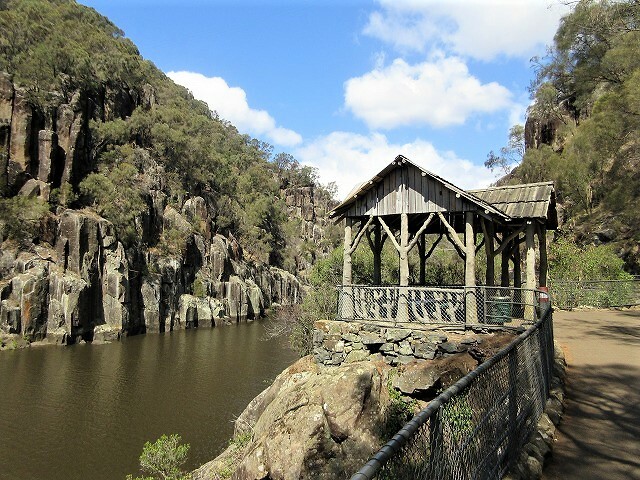 Dating from 1864, King’s Bridge links to the accessible paths of the magnificent Cataract Gorge Reserve. 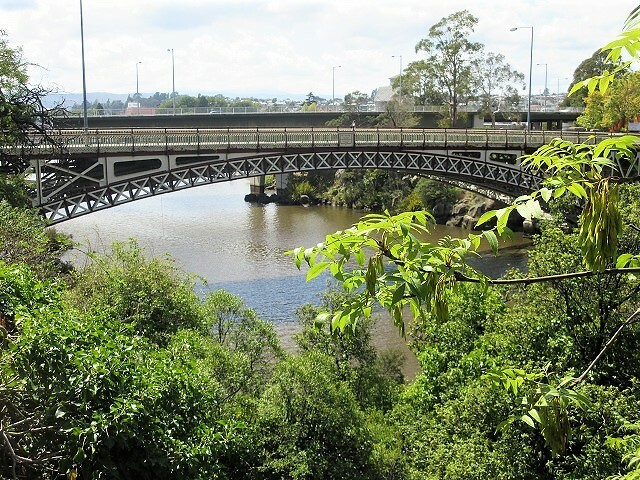 King’s Bridge overlooks the South Esk River (west side). 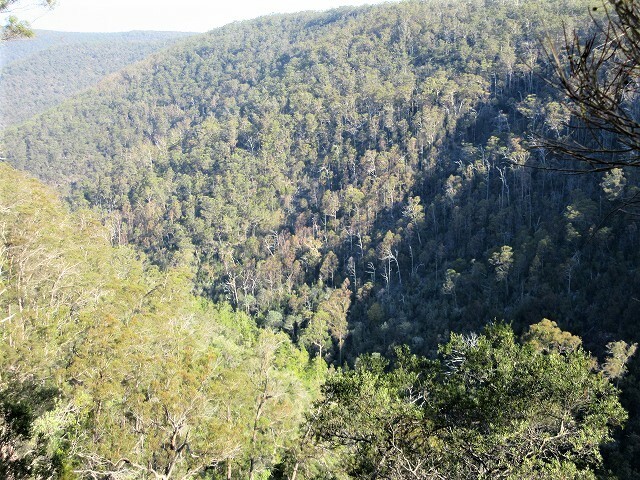 I look over the Tamar River which leads to the Bass Strait (east side). 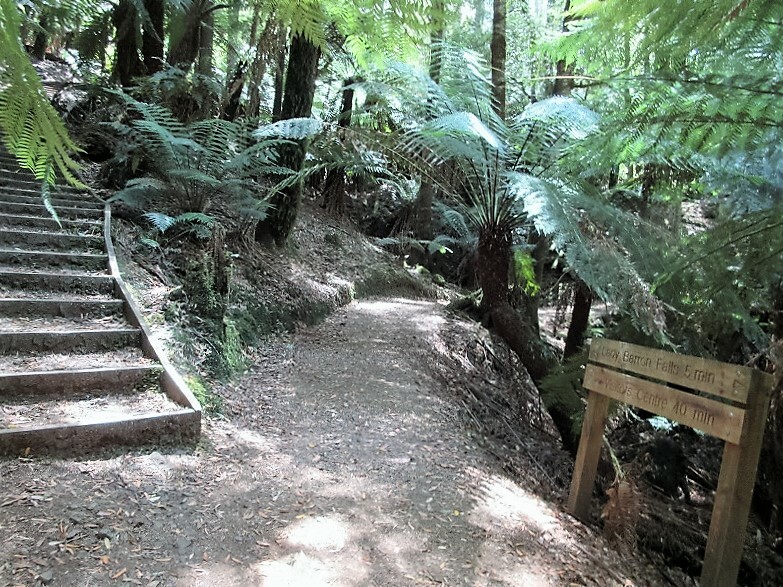 I go up the stairs where I crossed the bridge and enter the Zig Zag Track. 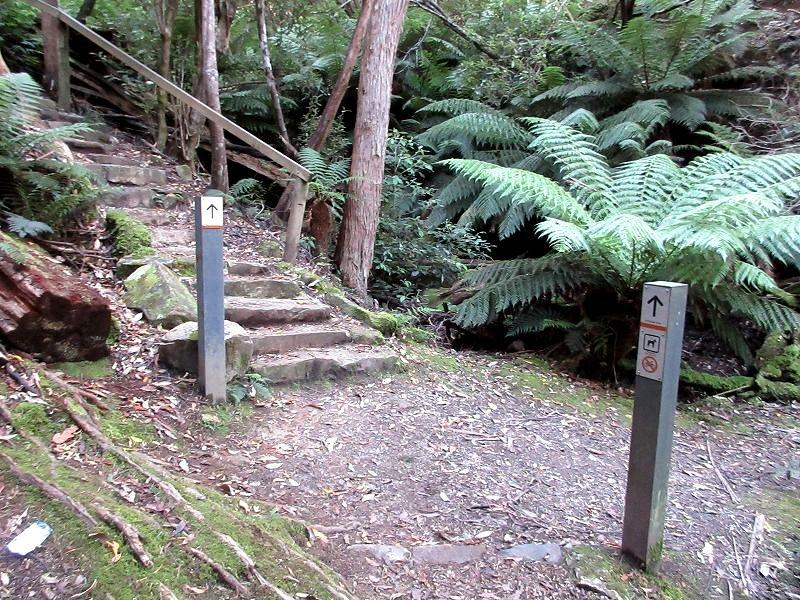 I dropped at a viewing platform on halfway of the Zig Zag Track. A cool breeze is blowing and it cools down my hot body. 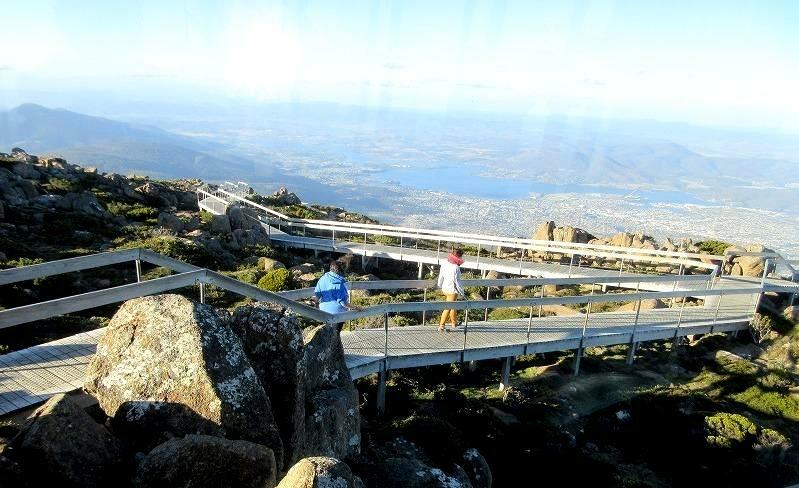 When zoom in, I can see the chair lift above the First Basin from the viewing platform. Then, turn to left at the trail sign when go to parking. If you have a time, turn to right and going down the river side is good for a relaxing vacation. 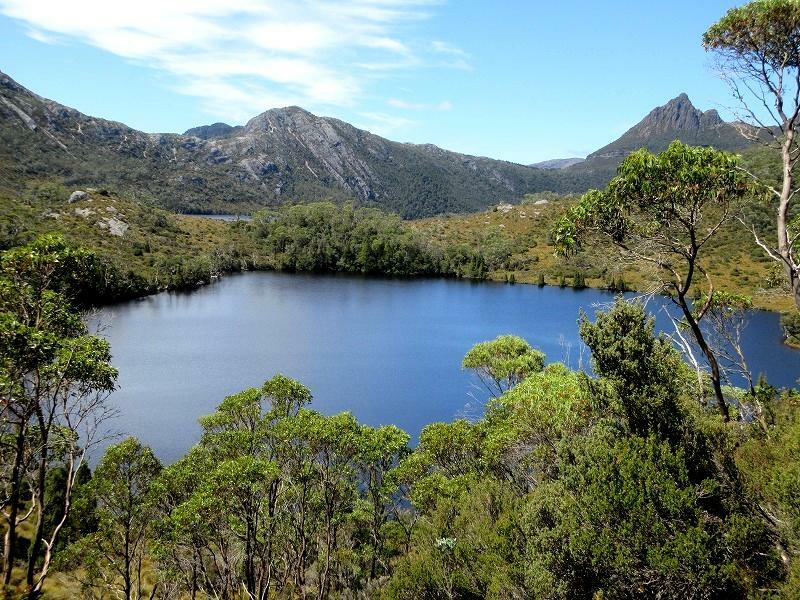 Today is the sixth day of my solo trip in Tasmania. 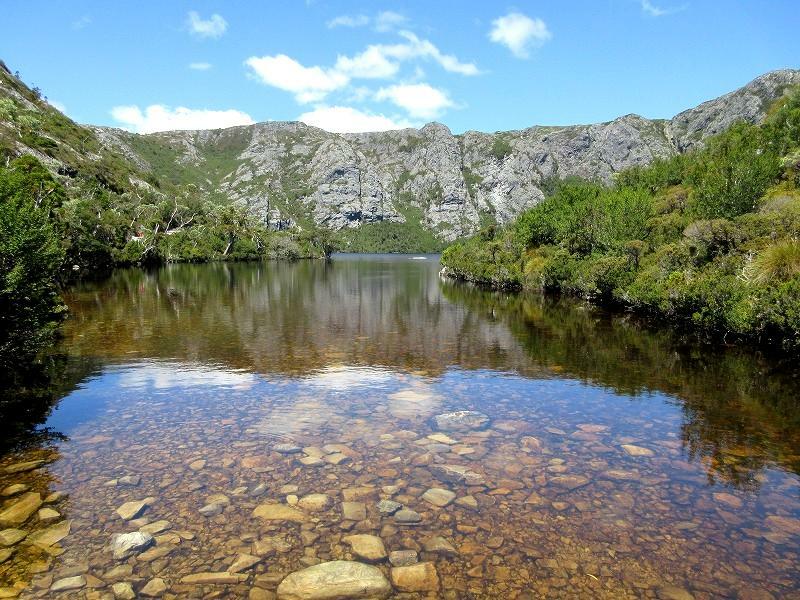 I am going to travel about 200 km from the Cradle Mountain - Lake St Clair National Park, located northwest in Tasmania to the Launcestion which is located in northeast of Tasmania. 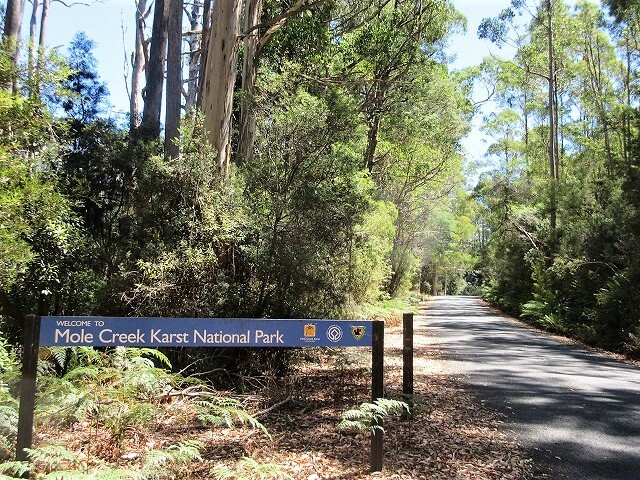 Also, I plan to stop by Mole Creek Karst National Park on the way. 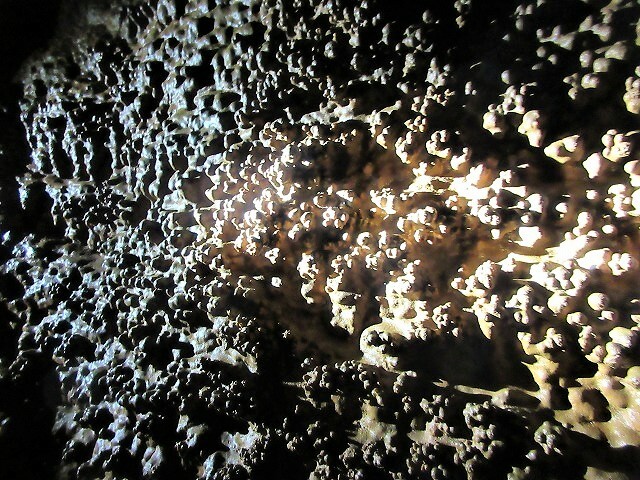 I want to see limestones of King Solomons Cave and Marakoopa Cave. "Karst" is a terrain which is easy to subject to erosion by water including limestone cave. 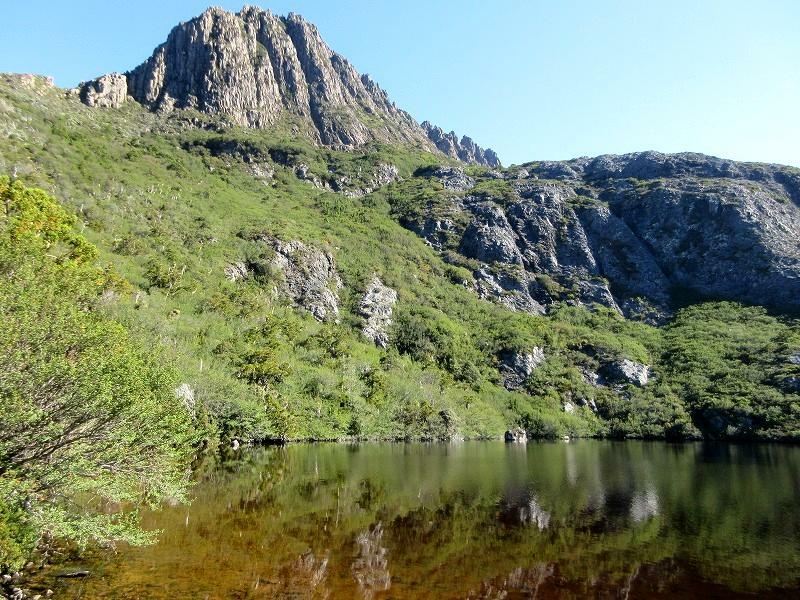 I really thought that I want to stay in the wonderful Cradle Valley which is registered as a World Natural Heritage site. However, I suppressed my feeling and drove my car to the east on C132. 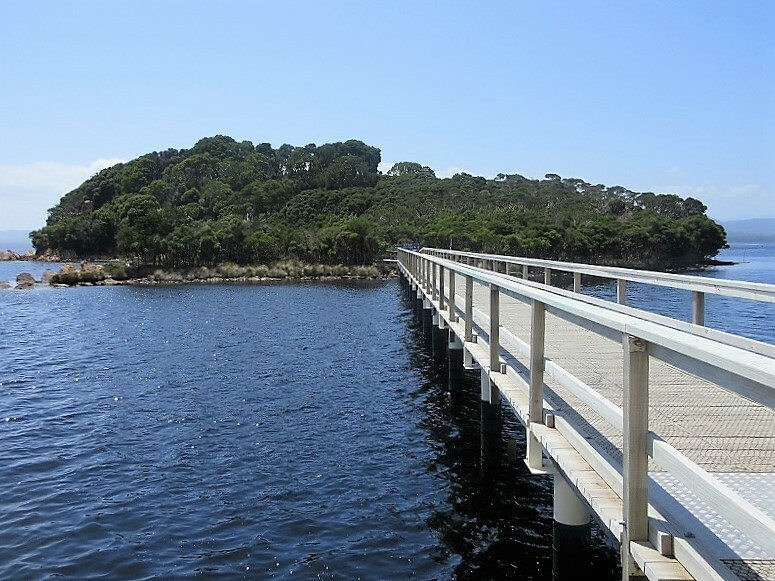 In a few minutes, I decided to drop by Lake Cethana's observation platform since the road signpost was in my eyes. 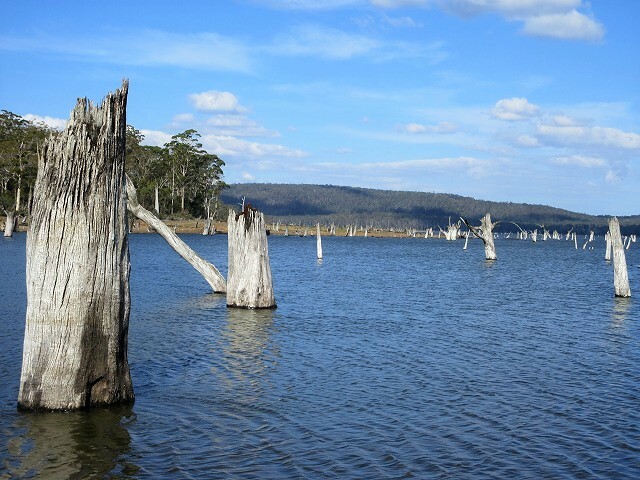 Lake Cethana is long in the north and south. The lake surface was shined by hitting the sun. I found a moving something at the side of the road. When I got off my car and approached it, the short-beaked echidna (Tachyglossus aculeatus) was staying. It was cute and I wanted to touch it. However, when I approached it further, a needle came out from the body! Wow！ What very sharp needles! 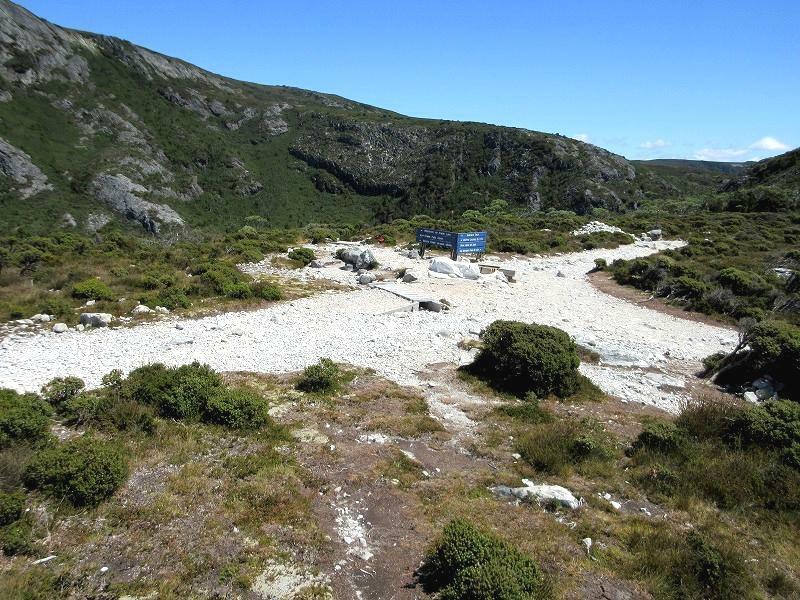 I ran on C132 and C 136 about 50 km east from Cradle Valley, and joined C 137 before Sheffield. 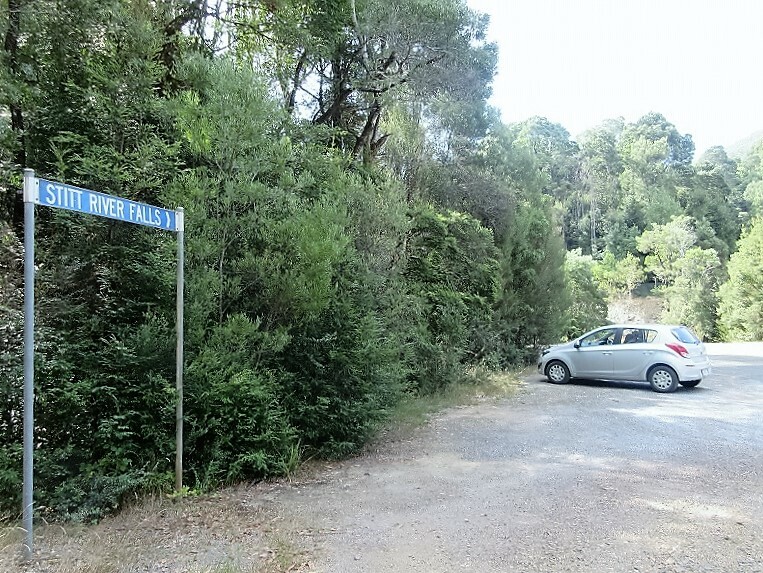 And drove to the south for about 20 km, then after joining B12, turn right (as west) and run for about 10 km to enter Mole Creek Karst National Park. 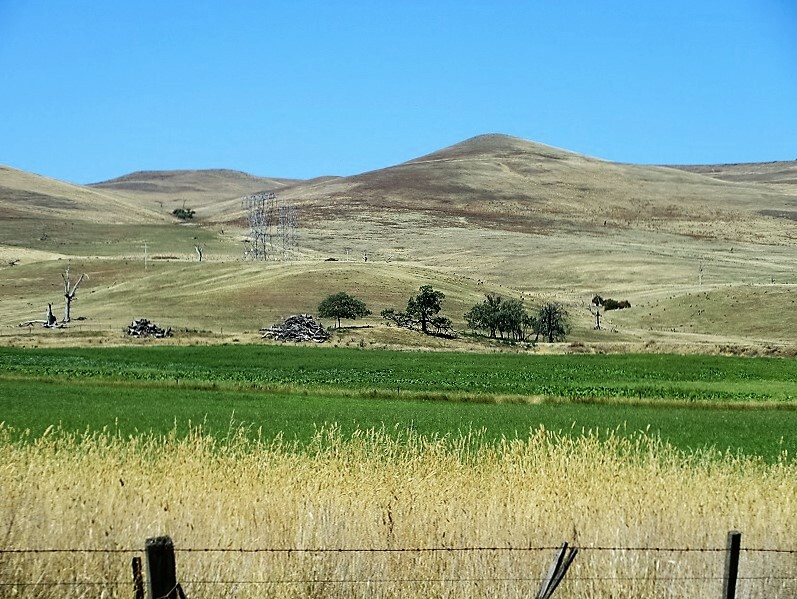 In the landscape seen from my car windows, the huge ranch and magnificent rocky mountain rises. A river flows in a pastoral scenery. Water in the river is clear streams. I was just impressed by the majestic pure nature. 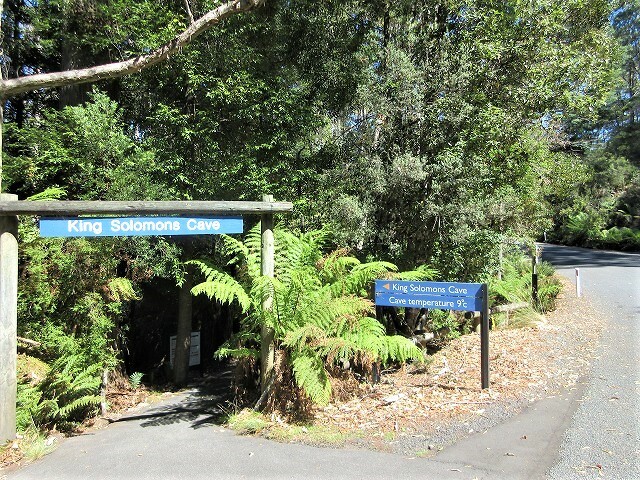 I went to King Solomons Cave as soon as entered Mole Creek Karst National Park before visiting Marakoopa Cave. 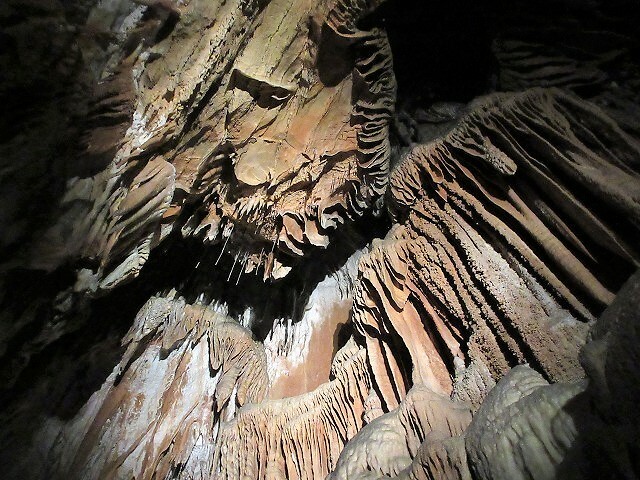 You must participate in guided tours that will be held six times (winter) between 10: 30 - 16: 30 to visit both caves. 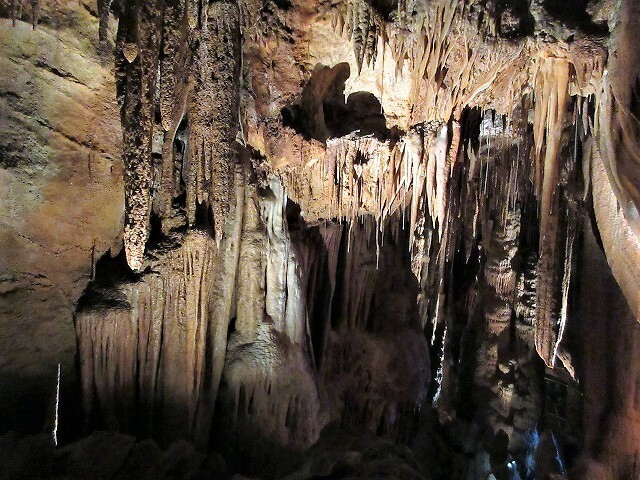 Caves admission charges: Per cave tour – Adults (18+) $19.00, Children (4-17, under 4 no charge) $9.50. 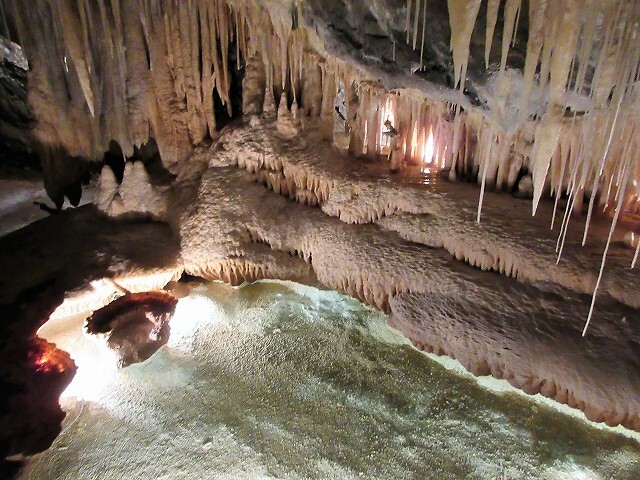 If you have waiting time for the guided tour, I suggest you adjust the time by walking a promenade around Cave. 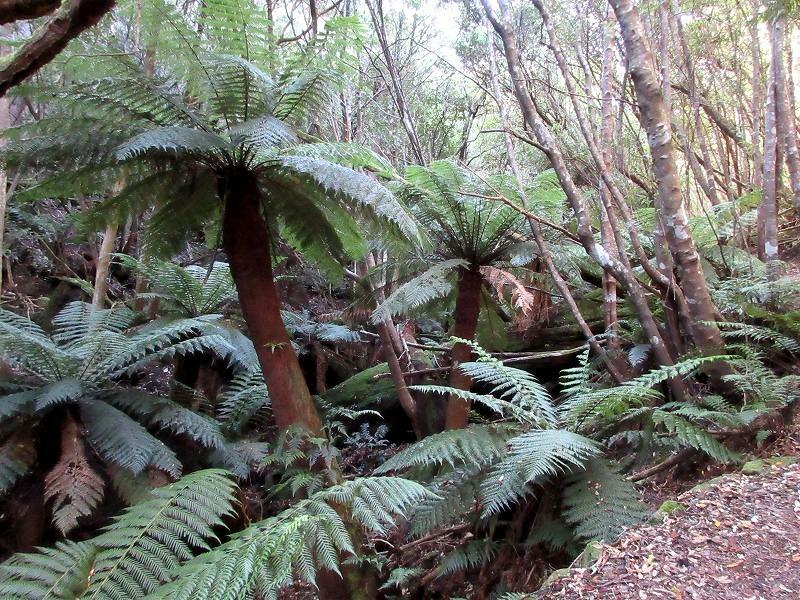 You can see large ferns. Here we go to start tour ! 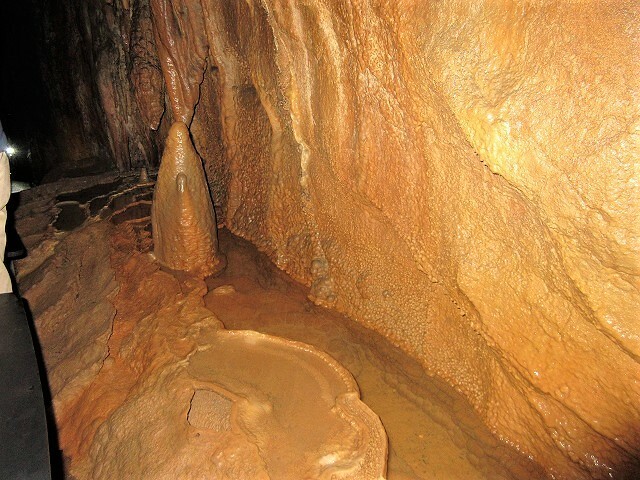 King Solomons Cave, which was first discovered in 1906 by 2 local men, is a relatively small, dry cave. 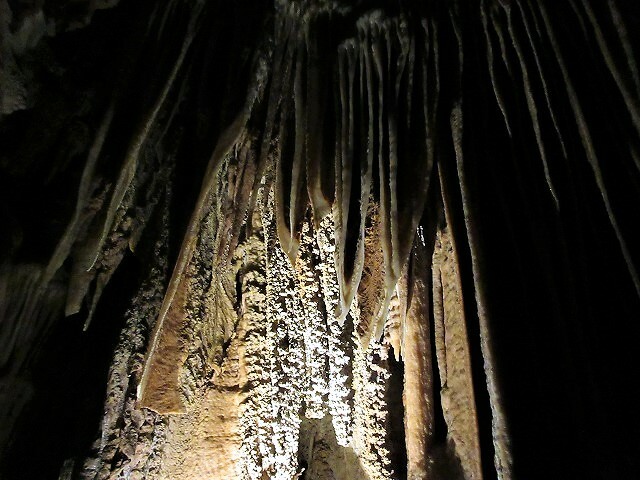 When I entered the cave, saw a lot of stalactites under the cave ceiling. They look like sharp arrows. 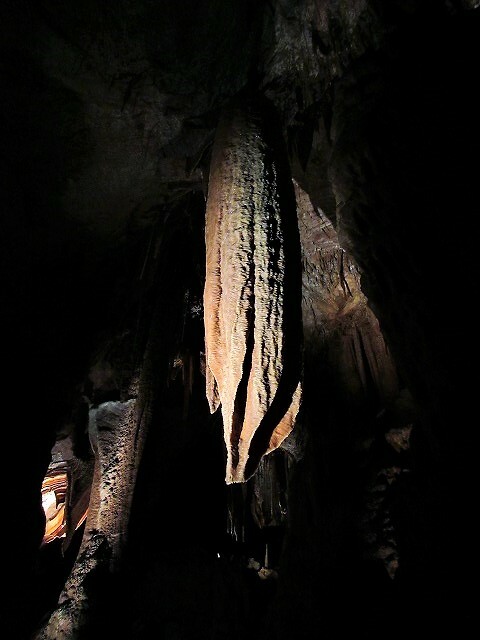 A thin stalactite is lit by a spotlight. It makes beautiful gradation shadows. That's exactly Arts. 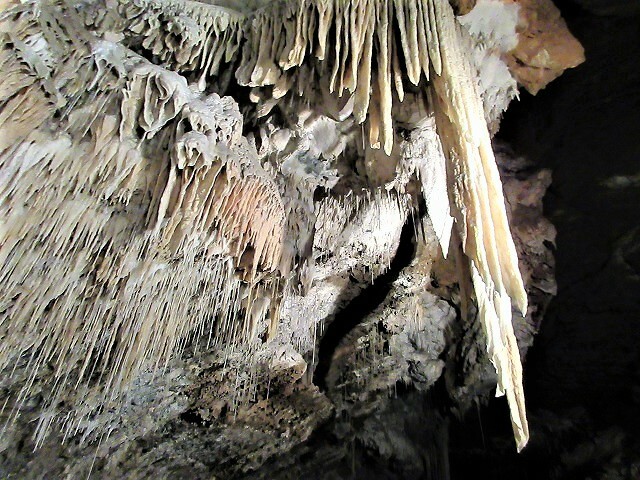 The cave has been decorated with stalactites over a long time. 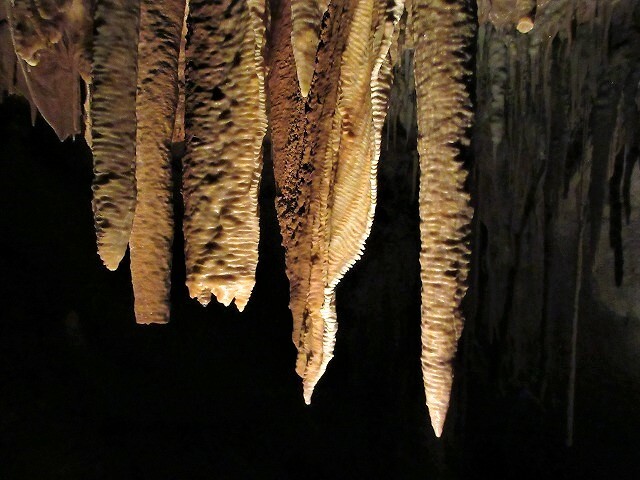 These stalactites like popcorns are baby stalactites that is before being great stalactites. I imaged a tail fin of a deep-sea fish when I saw a stalactite. A stalactite like Kannon statue which stands in the water pool. 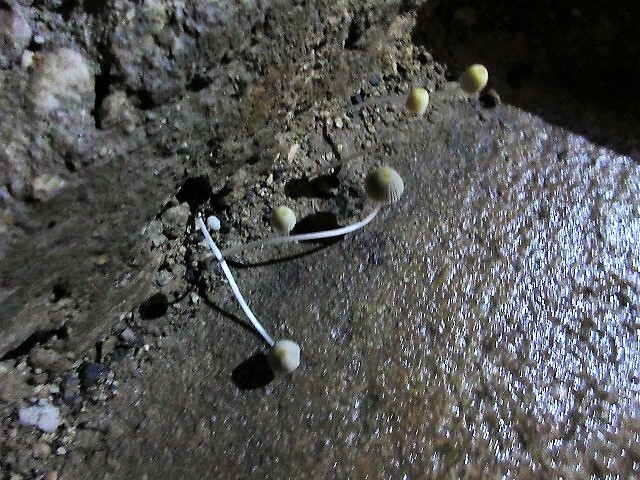 Wow！　Mushrooms are growing in the cave. Hang in there ! 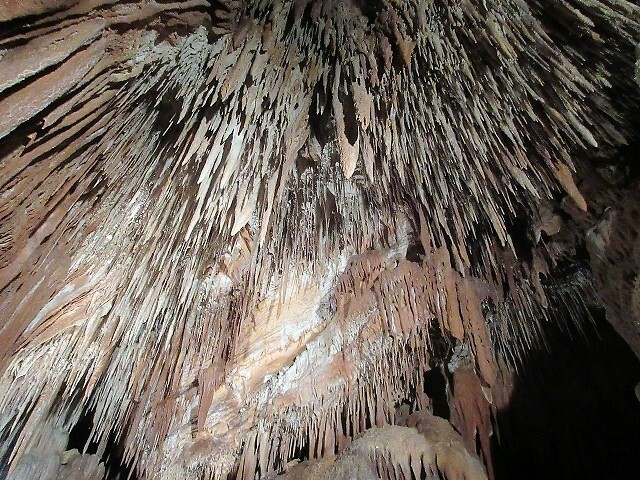 There are like white bubble stalactites. I was fascinated by nature arts. I moved to Marakoopa Cave after finishing the tour of about 1 hour at King Solomons Cave. 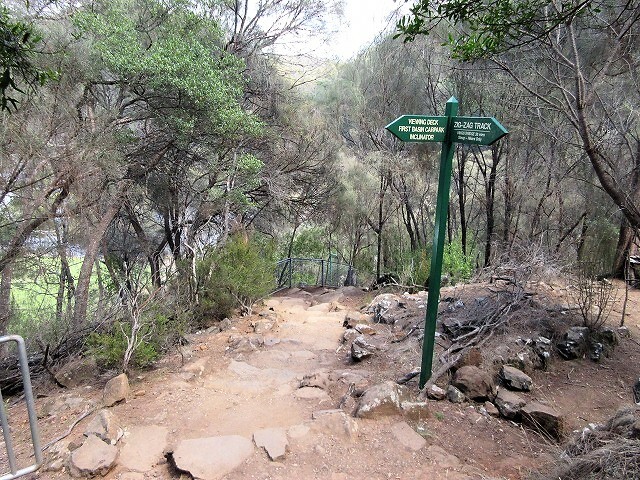 Return back about 7 km to the east and turn to the right (south) at a road signpost of Marakoopa Cave. I can see the scenery which is a majestic mountain and ranch. 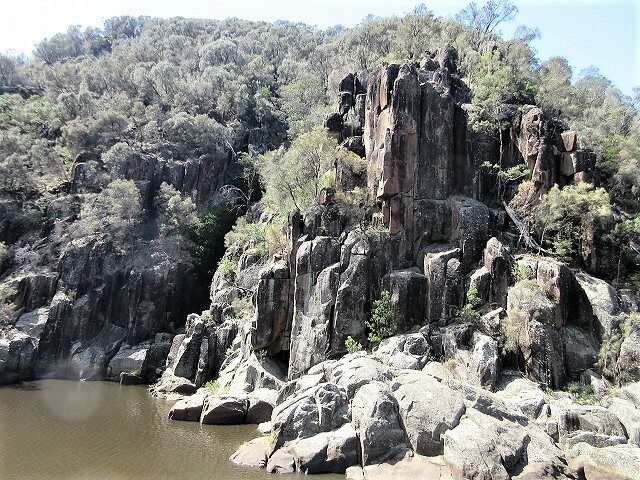 Mole Creek Karst National Park is the national park with the largest limestone cave in Australia. However, it not famous in Japan. 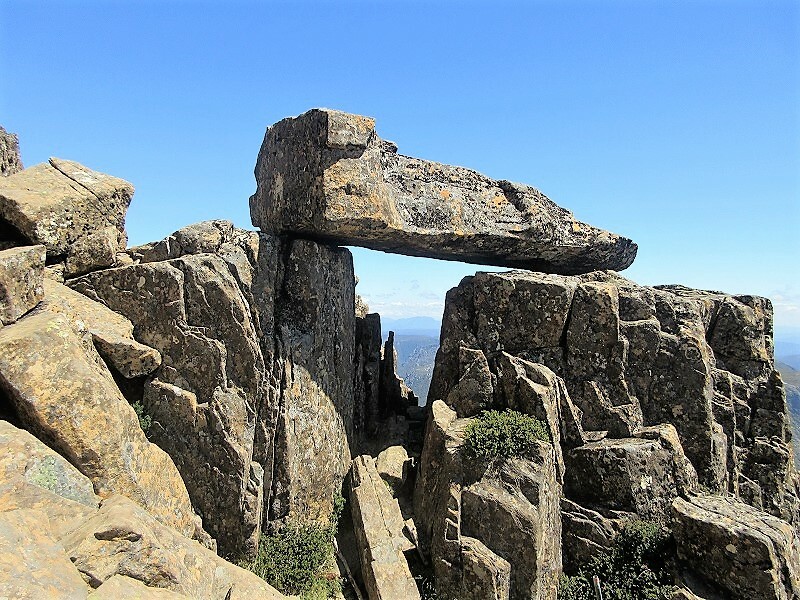 In fact, I did not plan to visit here before I came to Tasmania. I decided to stop by here after had gotten information at the visitor center of Cradle Valley two days ago. There are no Japanese tourists except me in here. Speaking of Asian tourists, it's only lively Chinese group tours. 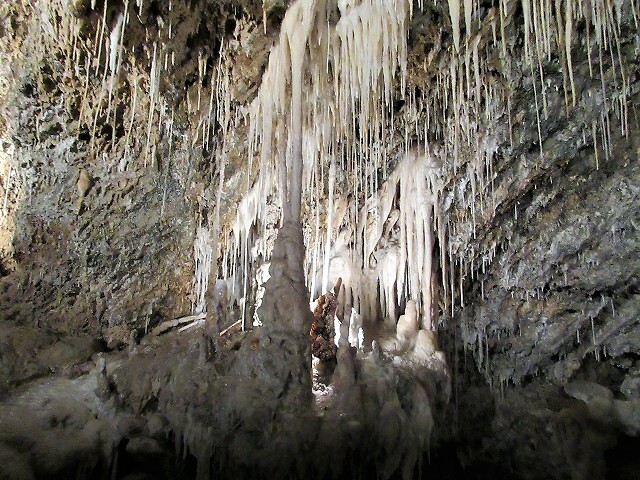 Marakoopa Cave is a large limestone cave and lot of guided tours carry out on day. 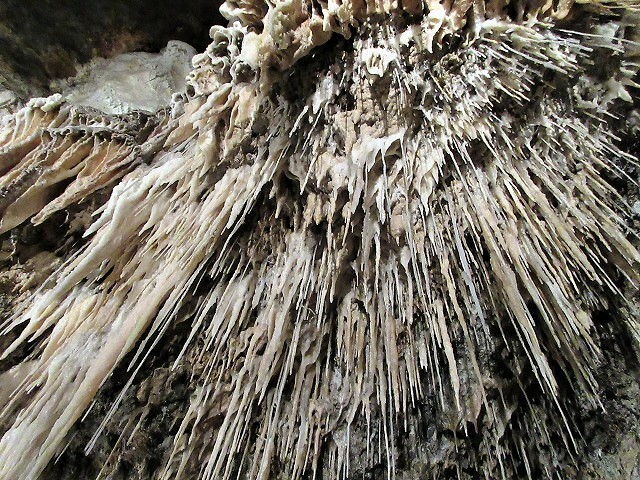 What sensitive stalactites! If you touch it will be broken easily. 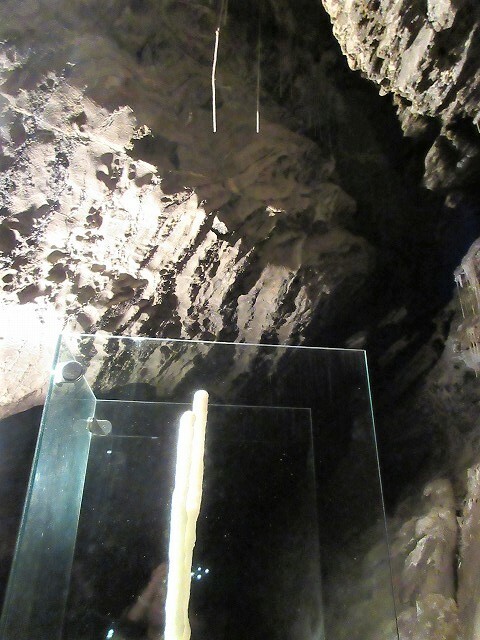 The stalactite that grew in the middle of the passage is protected with an acrylic case. 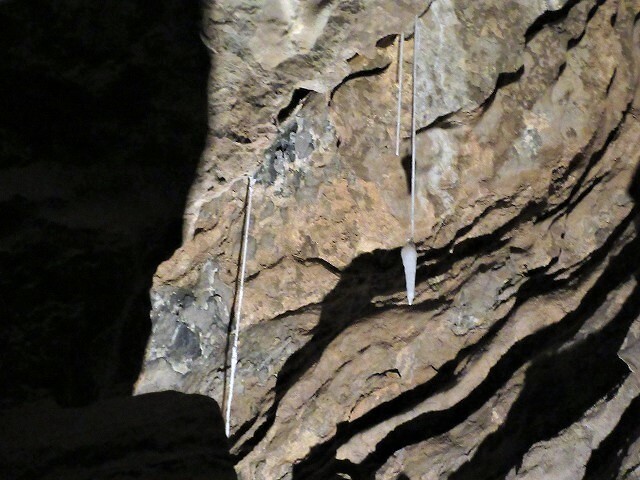 Needle stalactites are also developing from the top. There is a large underground lake, and its water is very transparent. 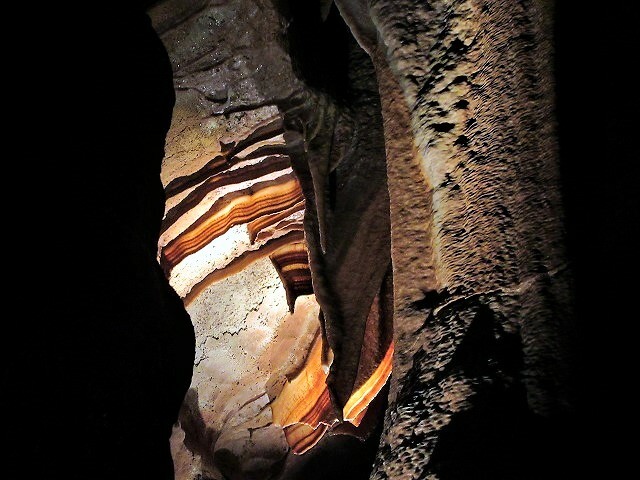 These caves were give me a great impression. 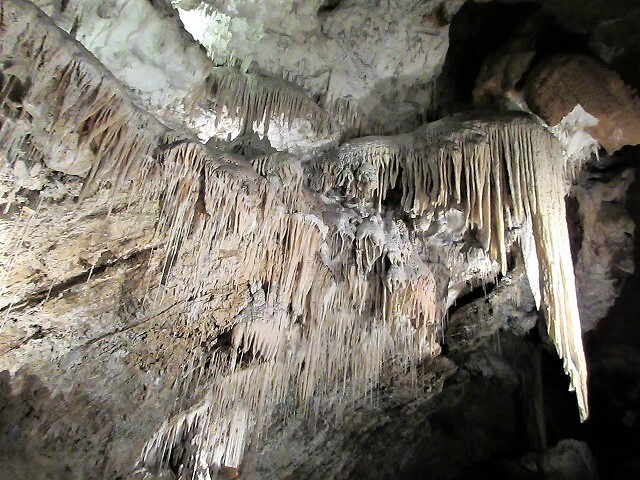 I recommend King Solomons Cave than Marakoopa Cave because the cave is quiet and the guide was kind and friendly. 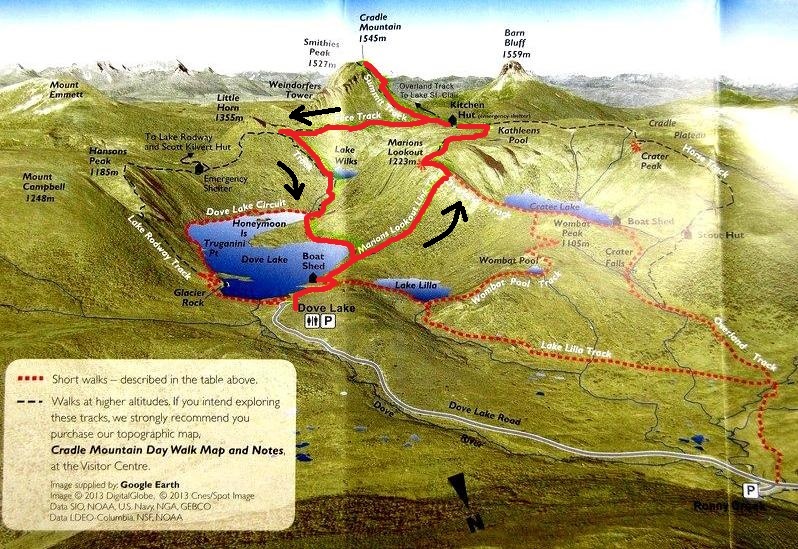 So, I am going to do a short hike of about 3 hours today. That is a hike of the lake tour, since there are lot of lakes in this area including the Dove Lake. My travel agency, AJPR（Japan Australia Public Relationship）,made reservation variety of accommodation such as backpacker (1 night around $30) and reasonable hotel (1 night around $100) for this my trip. 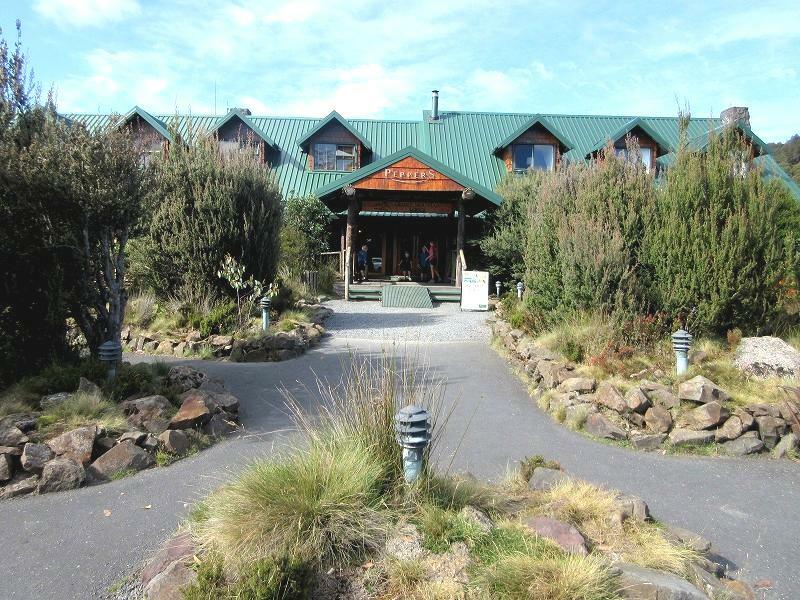 Only I have requested hotel is, "Peppers Cradle Mountain Lodge" (1 night $ 400) where I stayed last night. The Lodge has a cabin style room with balcony. 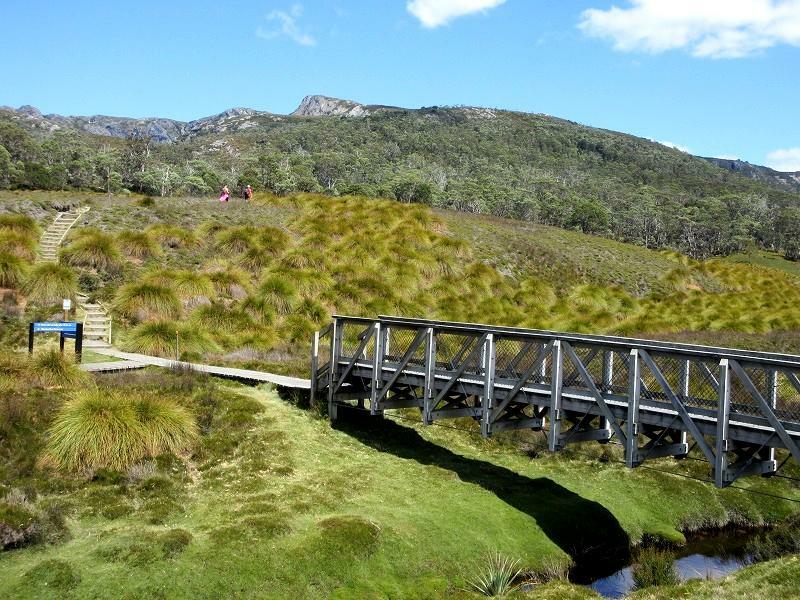 I had decided to stay on the day when climbed Cradle Mountain, that was only luxury in my trip. 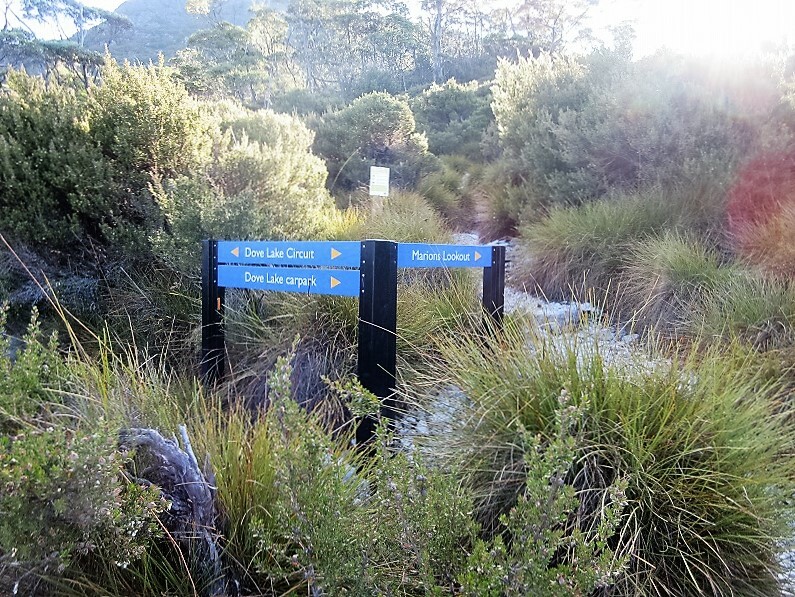 Gate of the Cradle Mountain National Park has a system which is private car restrictions at the time of congestion. 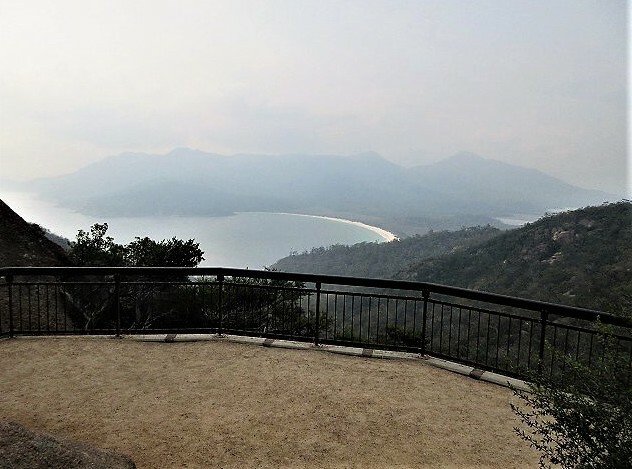 Sunday morning, I did not able to entry by my car into the NP by the private car restrictions, therefore I took a shuttle bus going up to the Dove Lake after parked my car on "Interpretation Center and Ranger Station” parking. 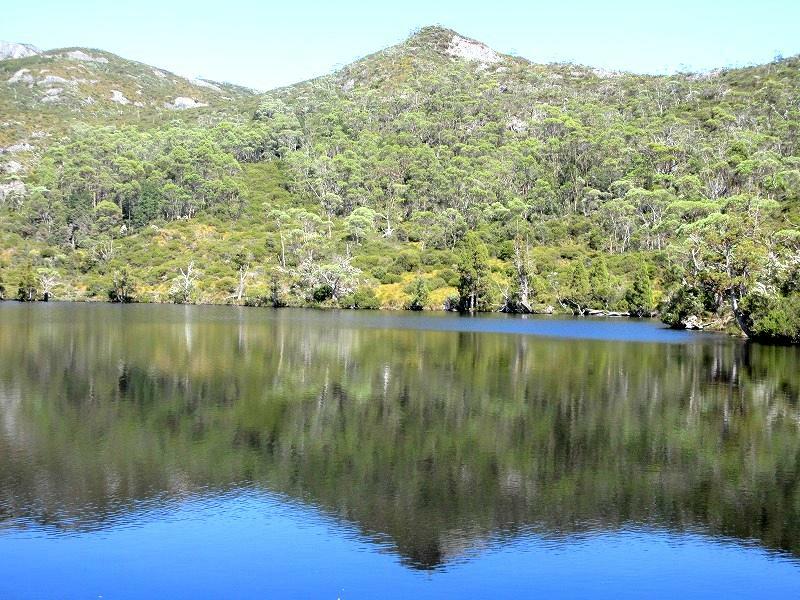 Shuttle bus is circulated between the Visitor Centre and the Dove Lake at 15-minute intervals. You can get the shuttle bus ticket how to present a national park admission ticket or holiday pass to the visitor center. I went to see the Pencil Pine Falls in the place where walk just for 3 minutes from the ranger station while waiting for a shuttle bus. 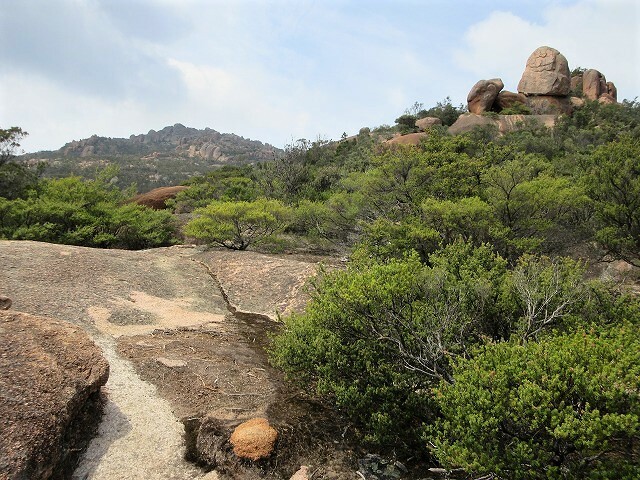 In additional information, there are about 5 hiking trails such as about 20 minutes for short hike or about 3-hours hike around ranger station. I would have walked if I had a time. I arrived at the Dove Lake from the Ranger Station about 10 minutes by the shuttle bus. 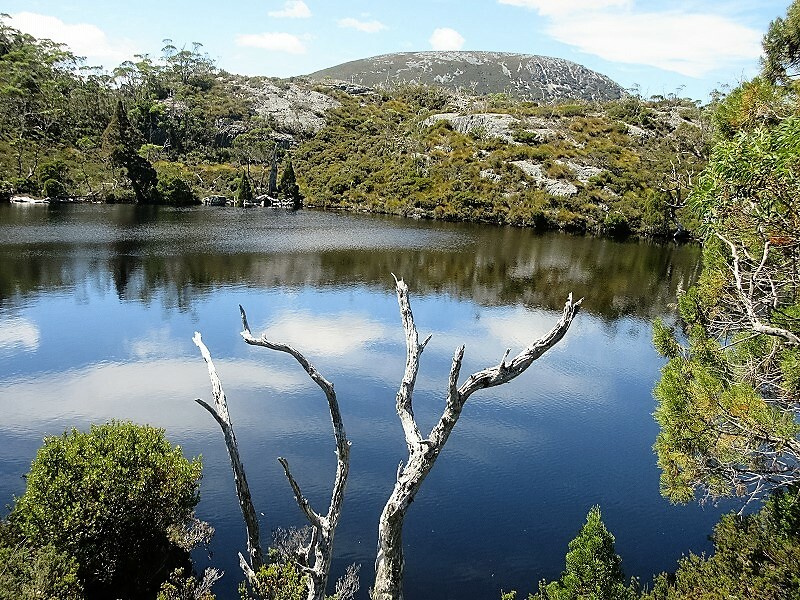 The Dove Lake is formed by the glacier like several other lakes in the region. 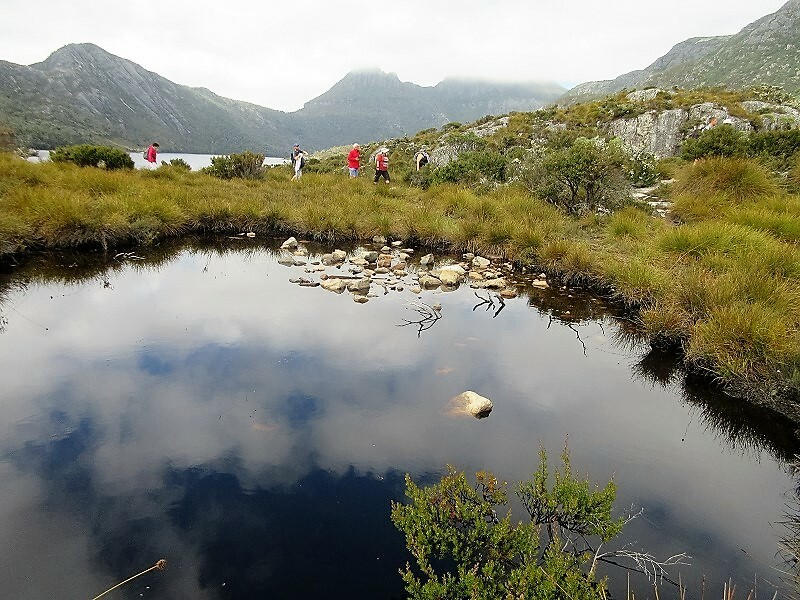 The lake is a very popular visitor attraction and is encircled by well-maintained walking trails which also lead up onto Cradle Mountain. 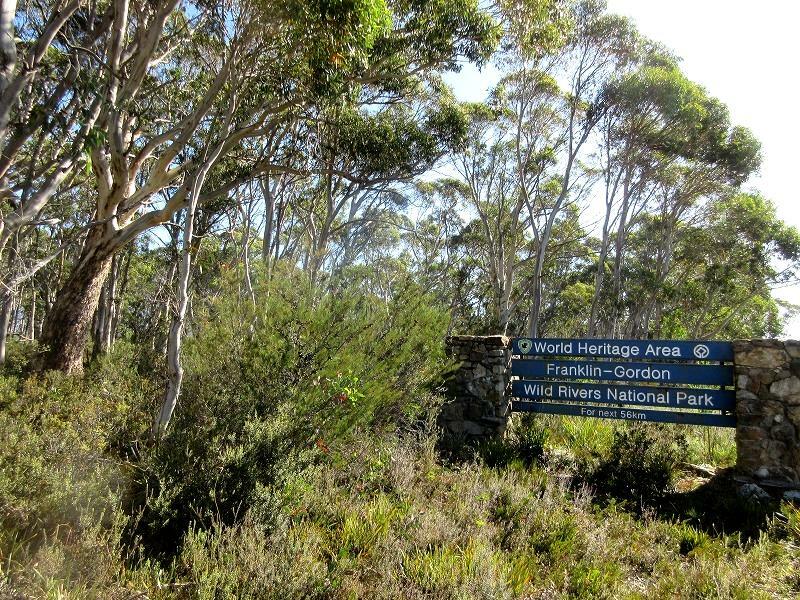 I dropped at the point where the Lake Lilla has run into the river before reaching the three-way junction of the Wombat Pool Track. 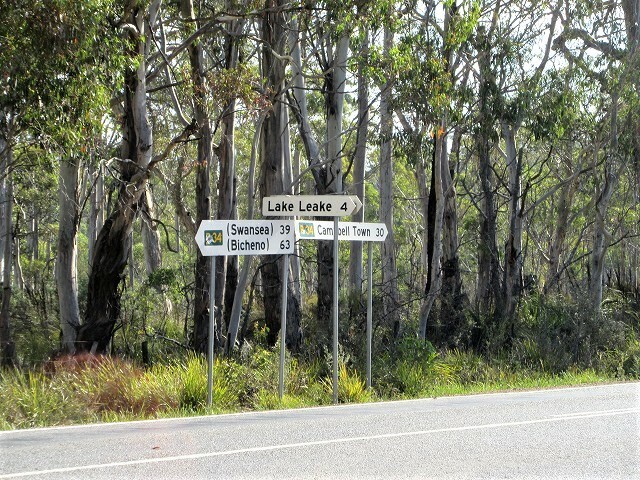 After passing by the Lake Lilla, there is a three-way junction where it takes about 40 minutes to Ronny Creek there is a shuttle bus stop if you go to the right. 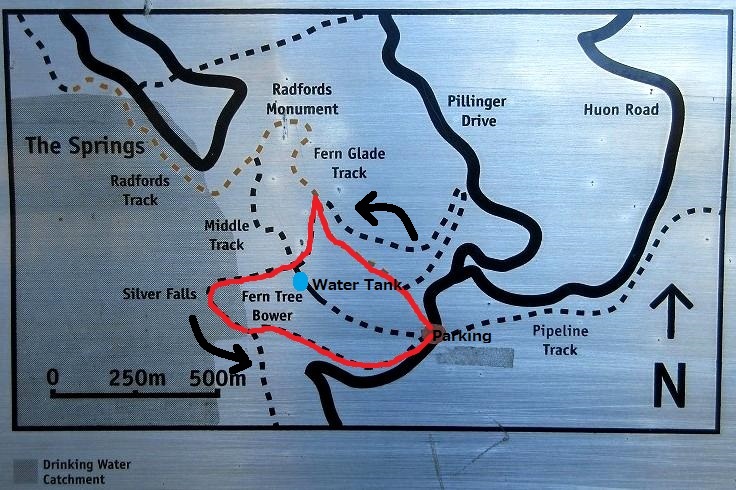 However, I had plan to go the left here, and then going down to the Ronny Creek via the Wombat Pool and Crater Lake. 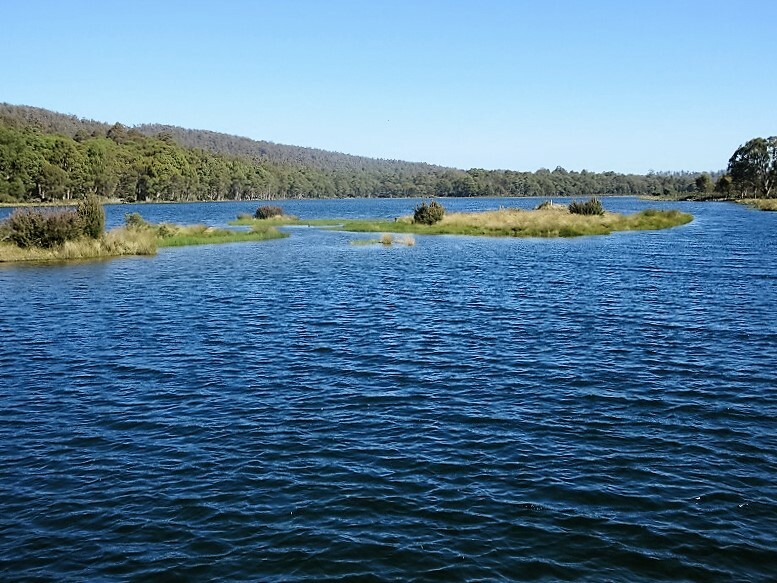 Going to Wombat Pool as a small lake is the uphill of about 20 minutes. 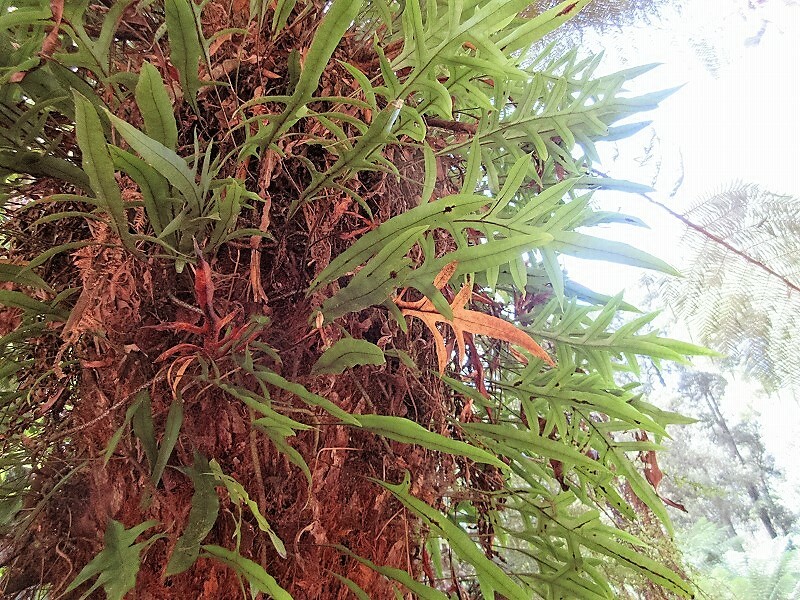 It is fun that climbing with observing the plants beside the trail. 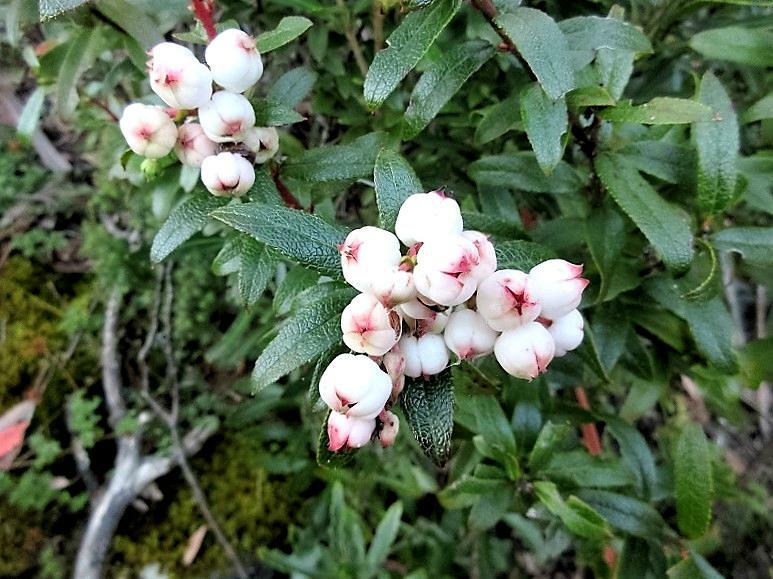 This white flowers are "Copperleaf snowberry"
Overlooked the Lake Lila after a while climbed the trail. More climb, the Dove Lake also came out. 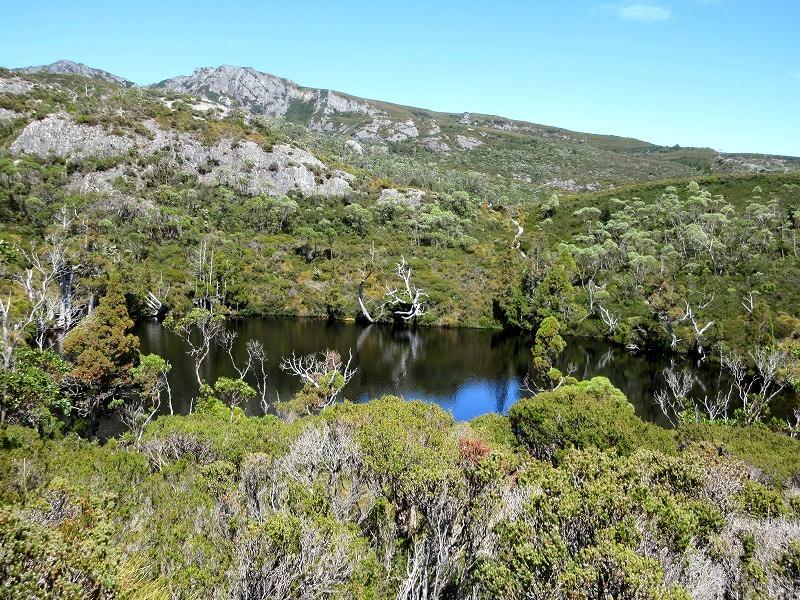 And, after climbing up the wooden trail, Wombat Pool appeared in the left side. The bottom of the lake seemed to dyed magenta color by tannin of "Buttongrass", which is growing around the lake. 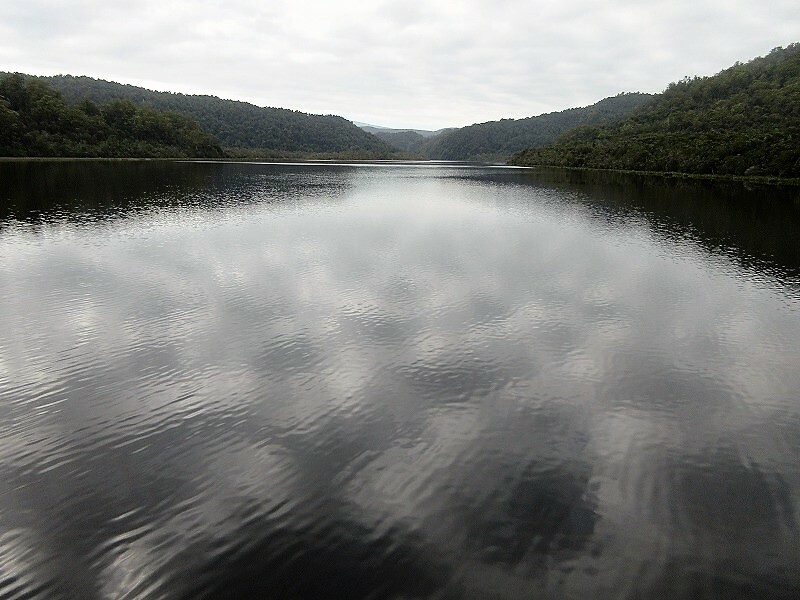 There are lot of wriggling black dots in the bottom of the lake. 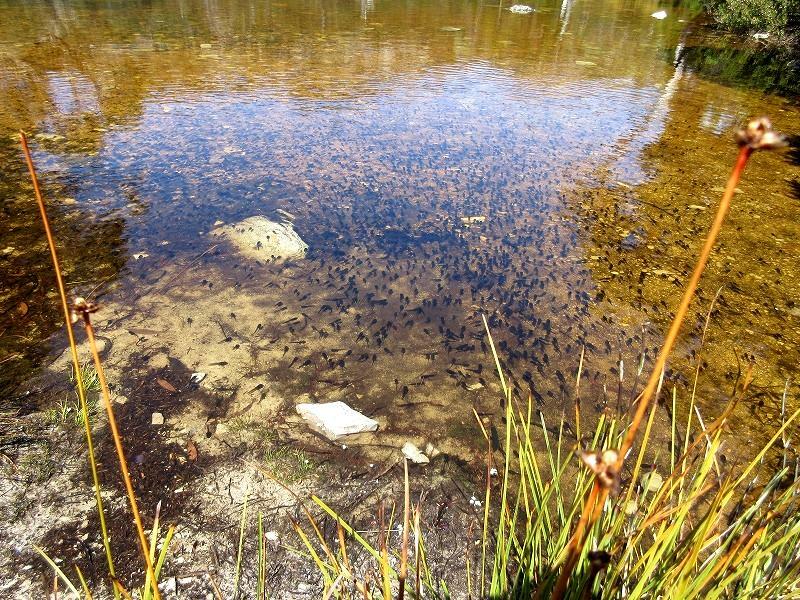 These are tadpoles! 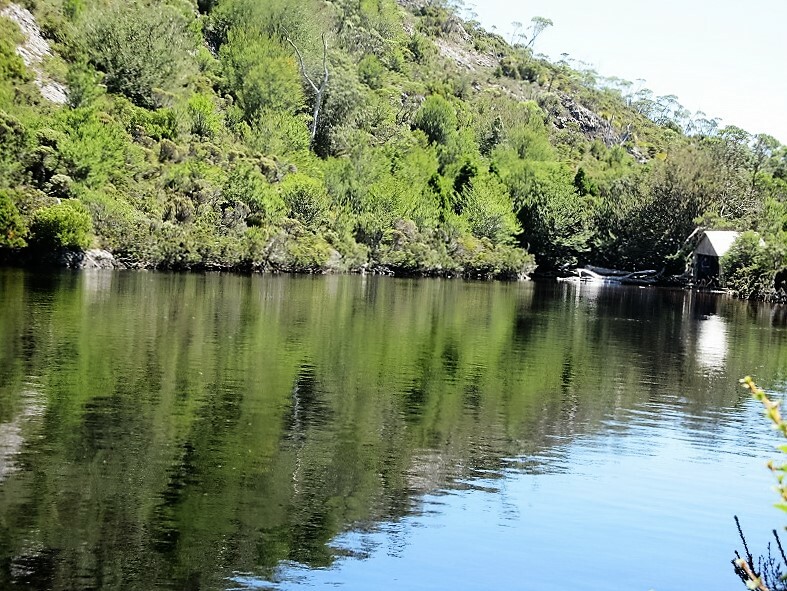 What a beautiful surface Wombat Pool has! 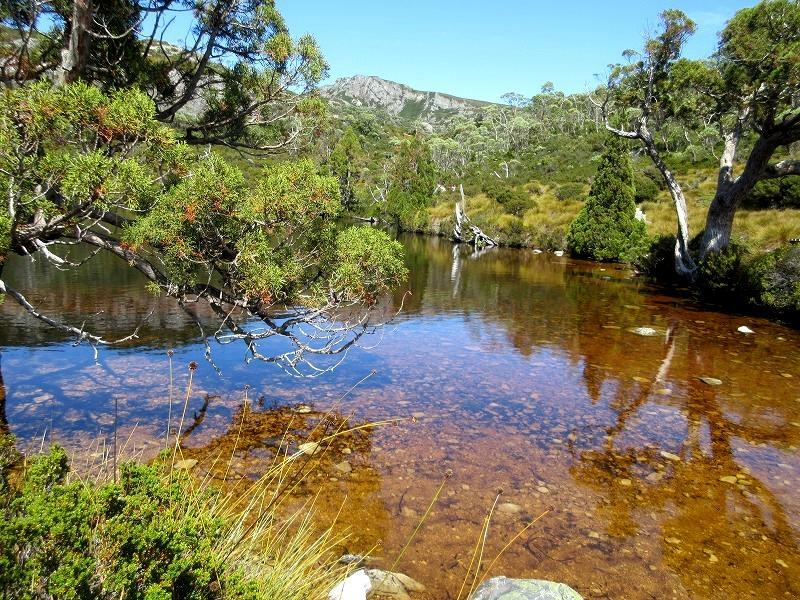 The Wombat Pool is a small lake, but the lake is tasteful with old trees of "Pencil Pine" or "Kings Pine". 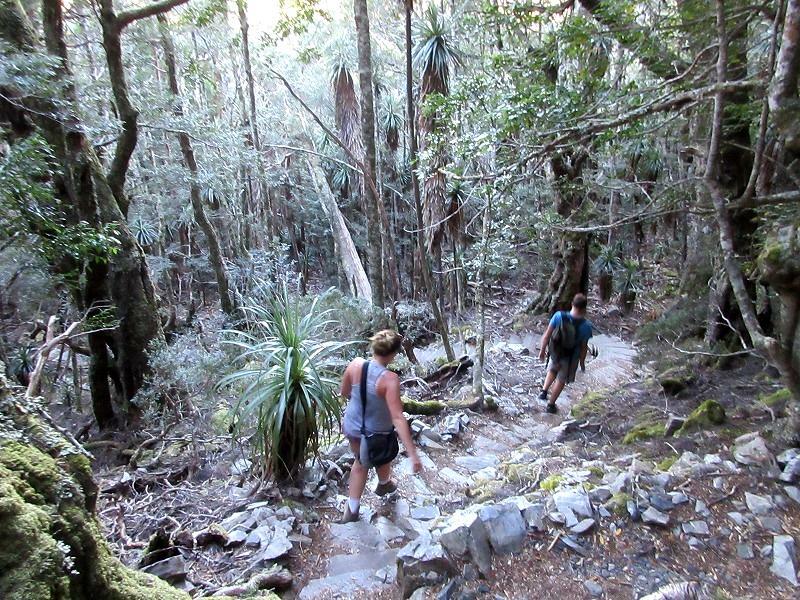 Continued climbing on the rocky trail from the Wombat Pool to ridge of 1,100m. 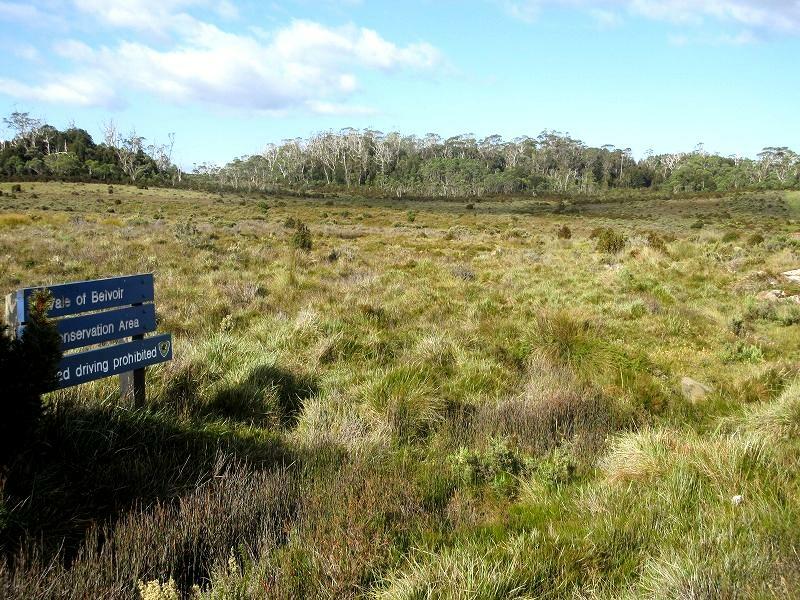 Then, the Wombat Pool was getting smaller in the distance, and a large wetland and parking of Ronny Creek came into view. 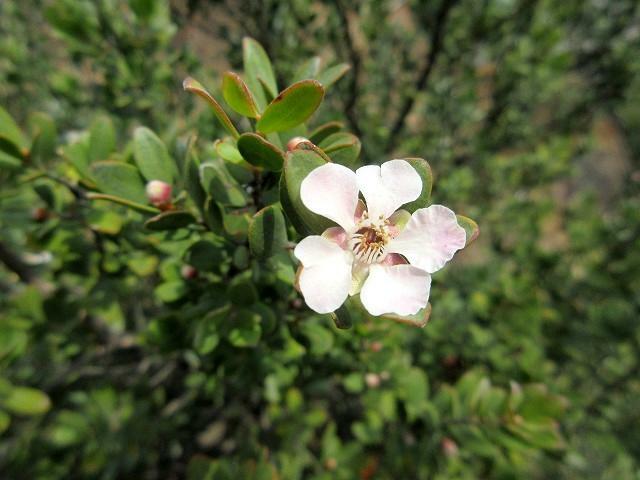 "Tea Tree" is in full bloom. 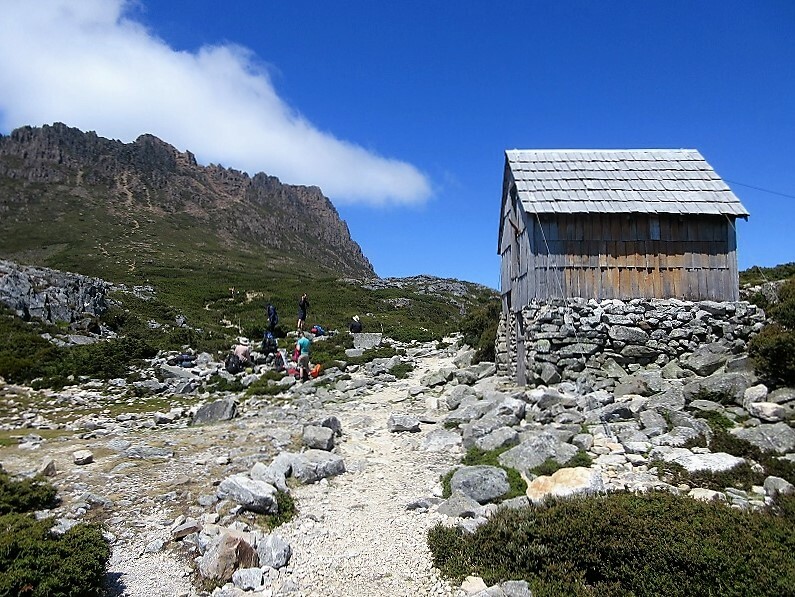 I arrived at the view point on the ridge of 1,100m in about 1-hour half from the Dove Lake. Here is a significant three-way intersection. If you turn to the right, go to Ronny Creek via Crater Lake. 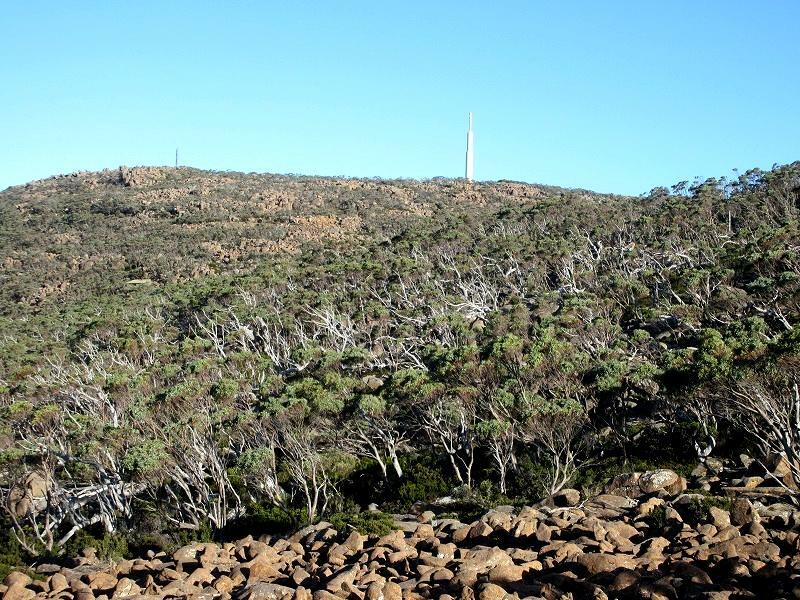 From the ridge of the view point, flat mountain is visible far in the south direction. I wonder what name that mountain is. 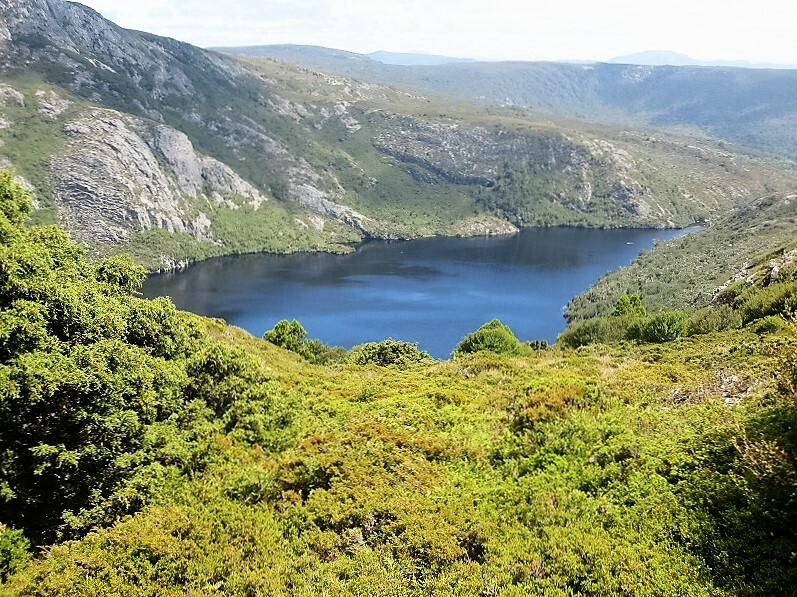 Outlook of the Dove Lake（right）and the Lake Lilla（left）from the view point. 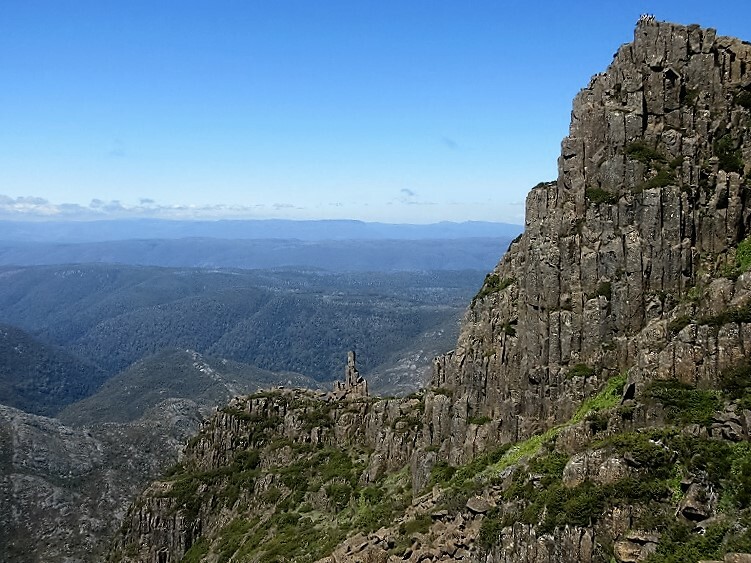 The Marions Lookout where I climbed yesterday is very close from here. Today, I go down to the Crater Lake direction from here. Going down in the forest zone along the Crater Lake. 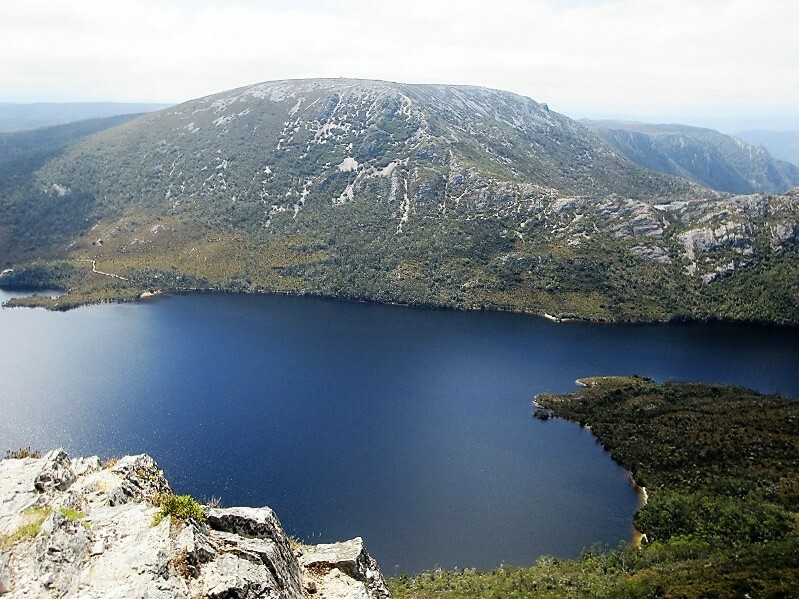 The Crater Lake is surrounded rock wall of Cradle Plateau. 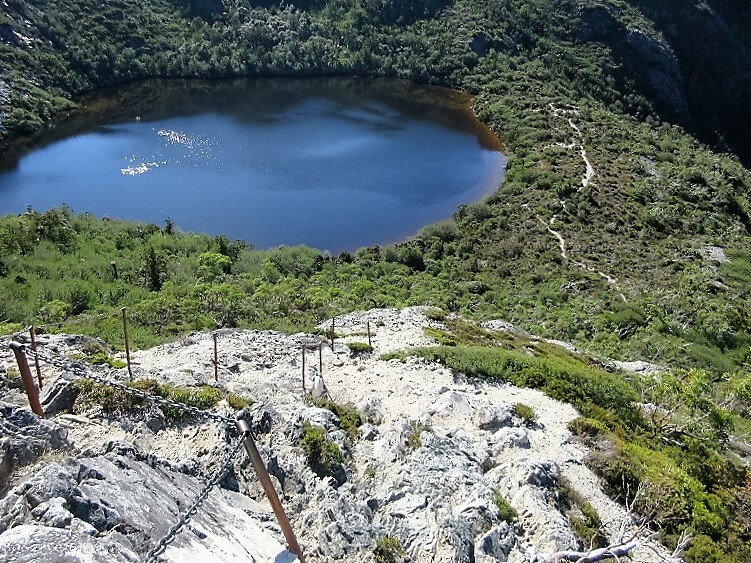 The Crater Lake which looks like shape of a tear is transformed to a creek with a Crater Falls. 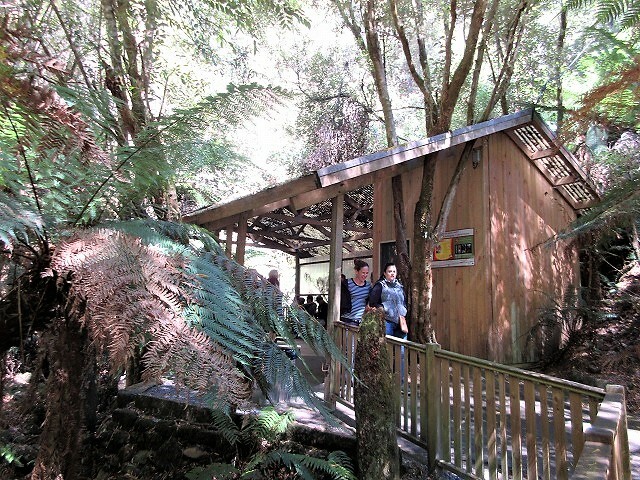 There is a boat shed at the starting point of the creek. 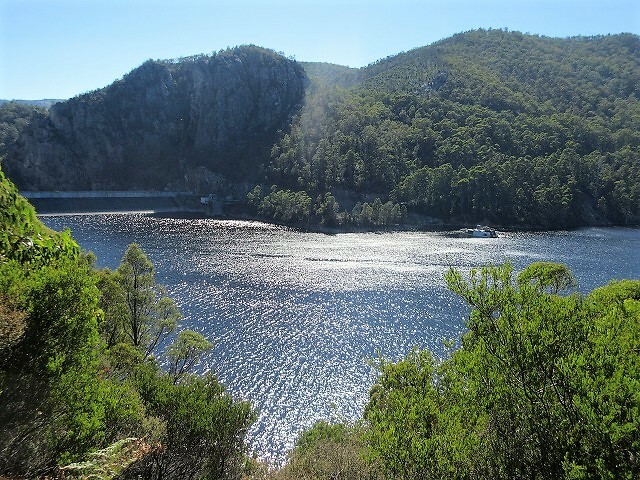 View of the Crater Lake from the Boat Shed. There are lot of small fish in the shallows around the boat shed. 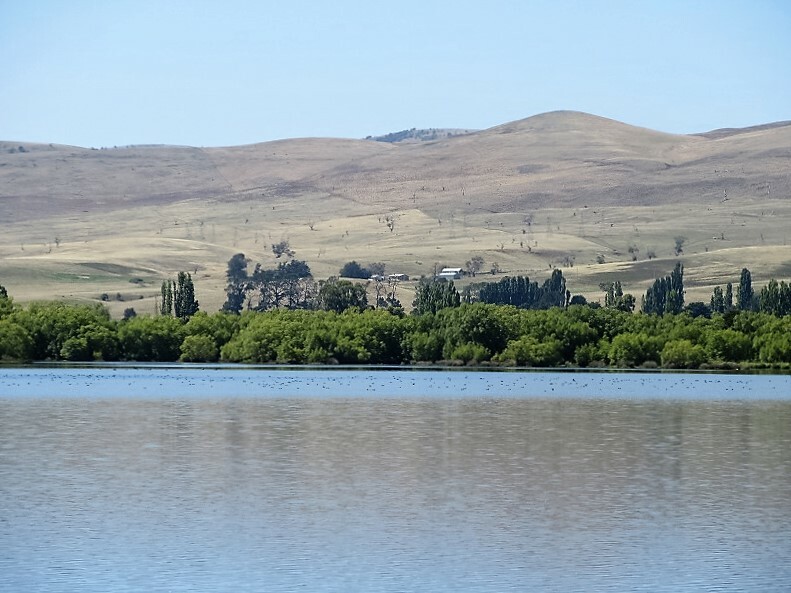 Away from the lake, and I got on the hill, large wetland and the parking of Ronny Creek came into view. 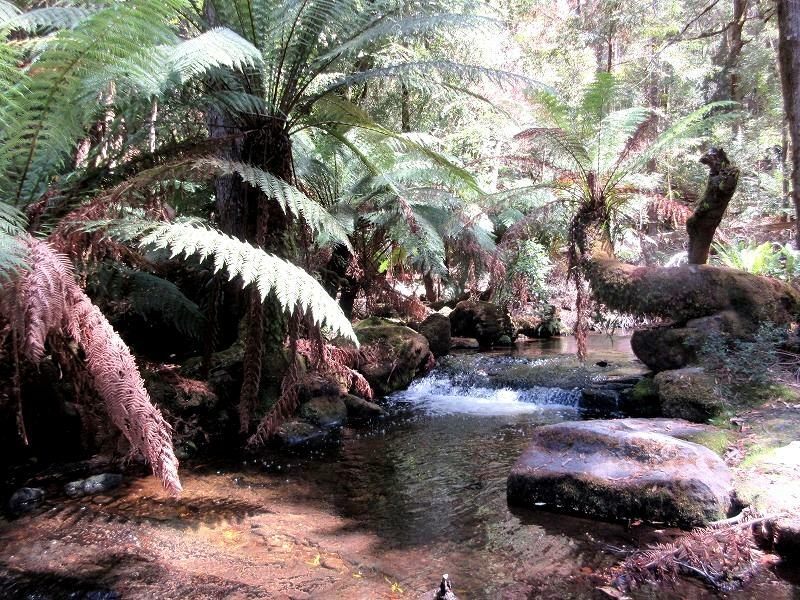 I heard the sound of running water while going down into the forest zone along the creek. 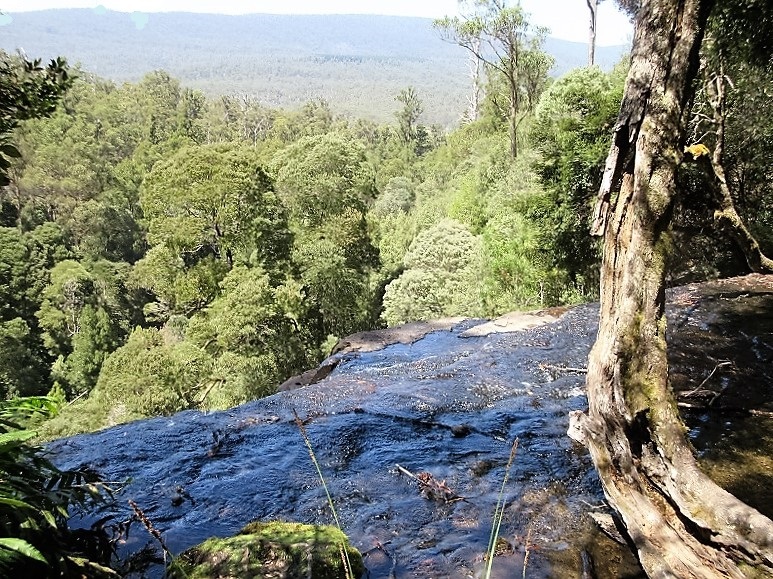 Before long, small Crater Falls (about 5m) appeared in the dim forest. 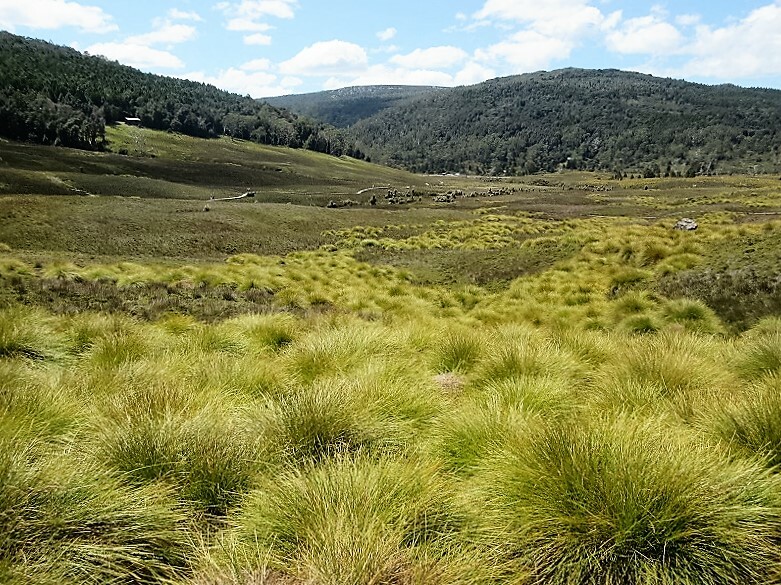 That forest zone is short, become grassland zone shortly after crossing the creek. 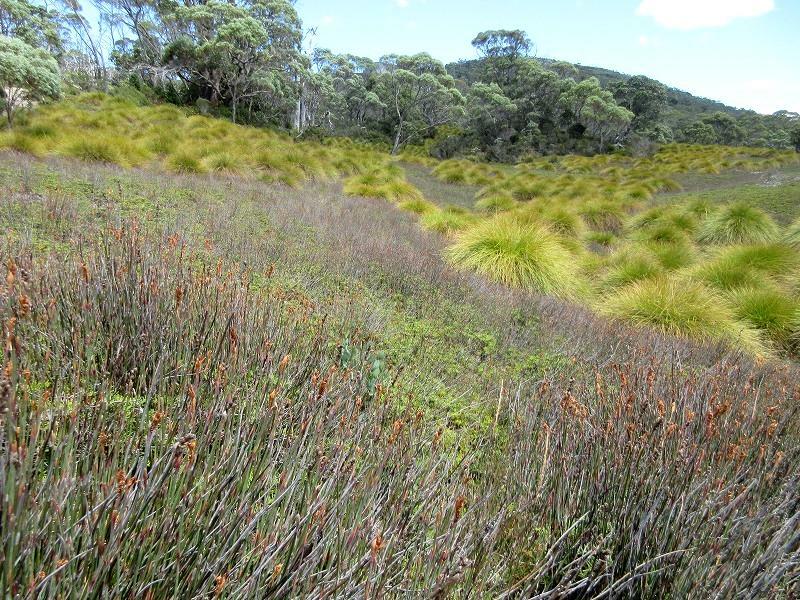 There is huge grassland where wombats are supposed to live. I really wanted to meet the wombats! 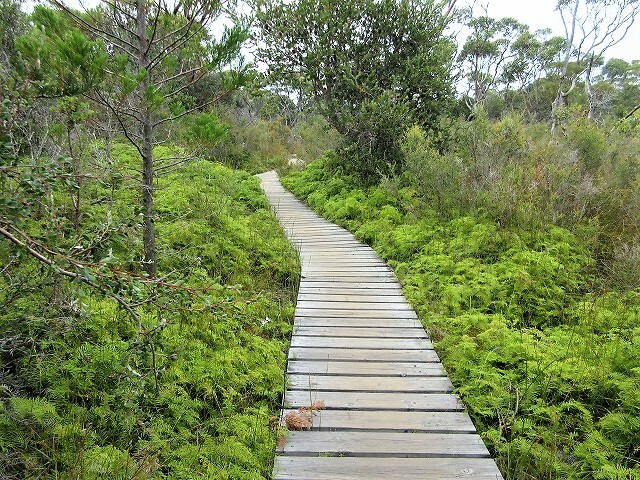 Boardwalks have been installed in the wetlands. 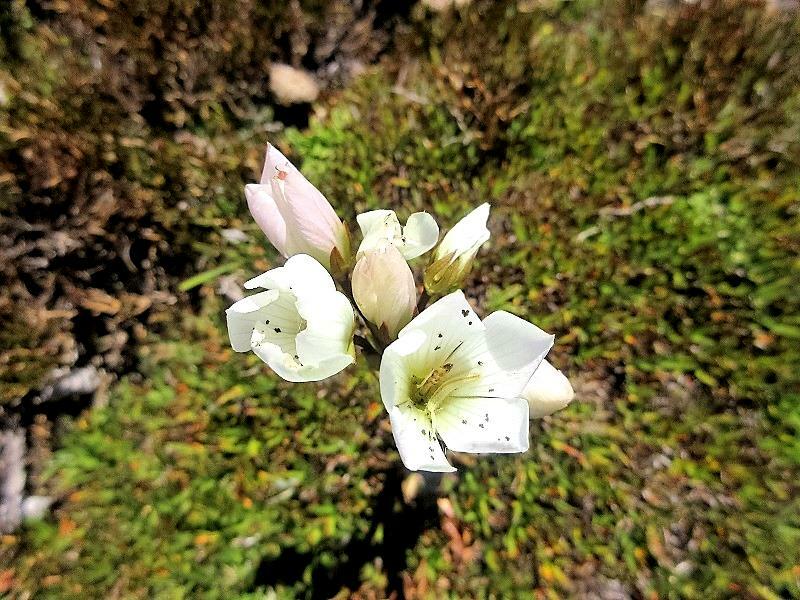 Alpine plants bloom in the wetlands. 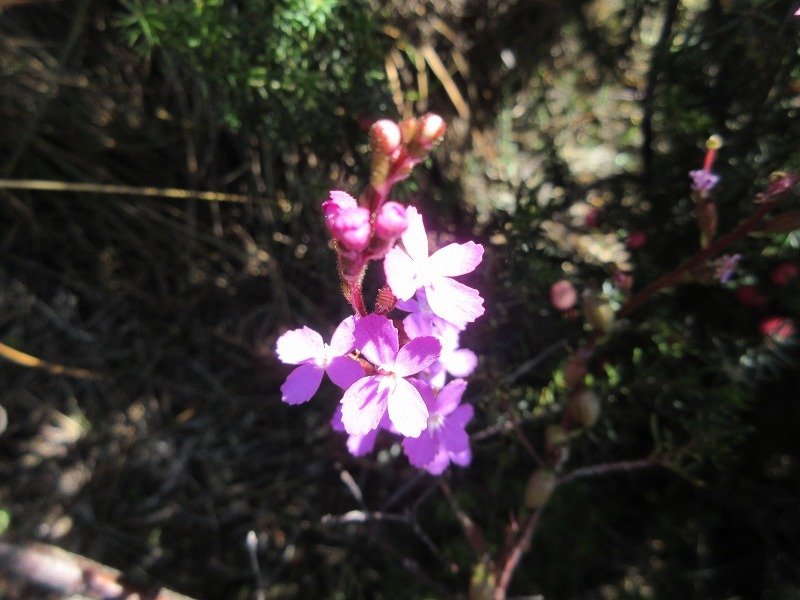 Pink flower is "Narrowleaf triggerplant"
The end of the boardwalks is the bus stop (also car parking) of the Ronny Creek. 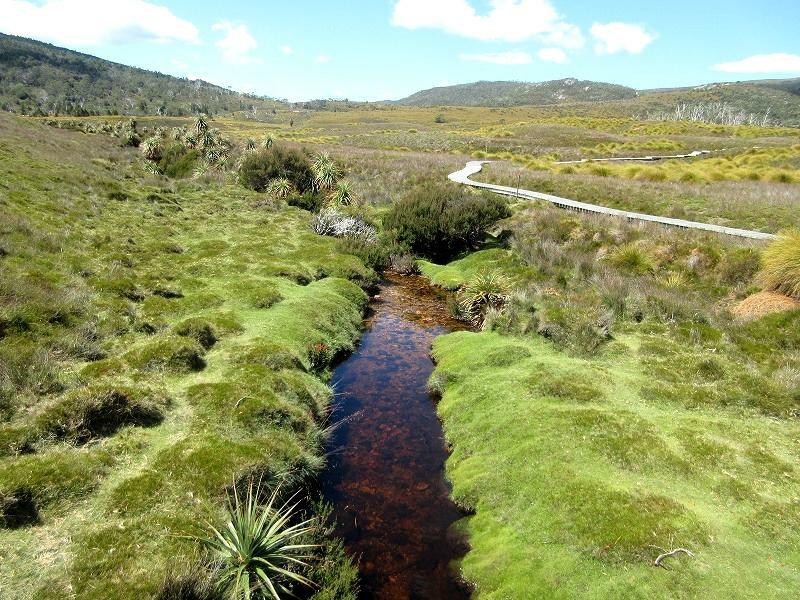 The Ronny Creek is the starting point of the Overland Track. 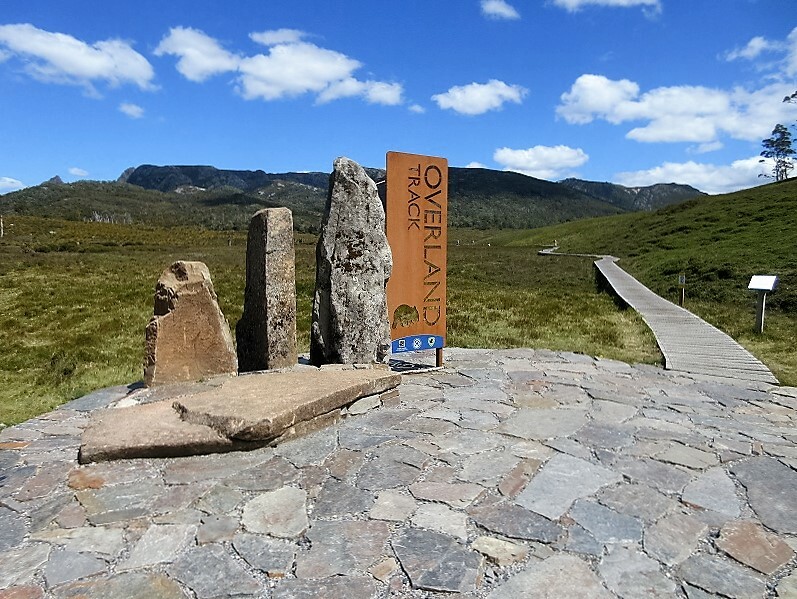 The Overland Track winds through a variety of landscapes as far as the Lake St Clair, Australia’s deepest lake. There are not staffed lodges between that distance about 80.8 kilometers (50.2 miles). So hikers need physical strength and energy because they have to backpack entire a period of 6 days all by themselves. 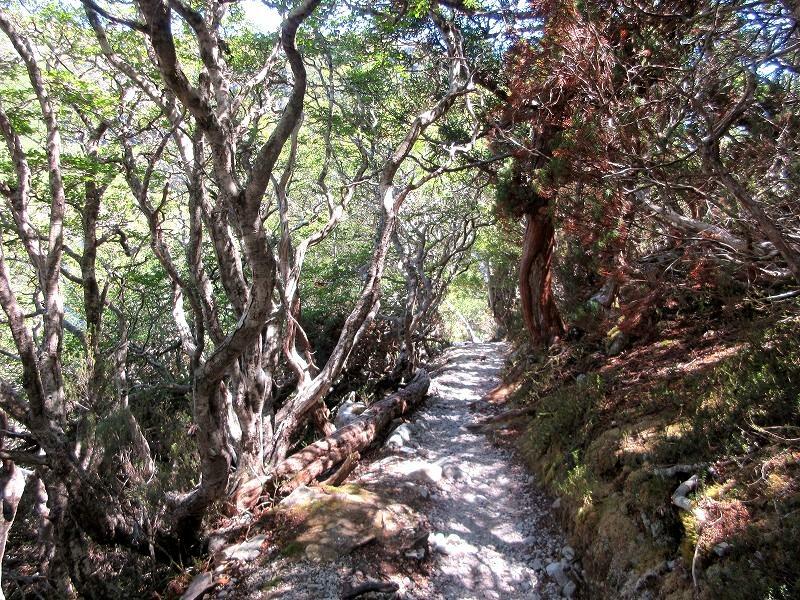 The sounds very demanding, but it is a very attractive route for nature lovers. 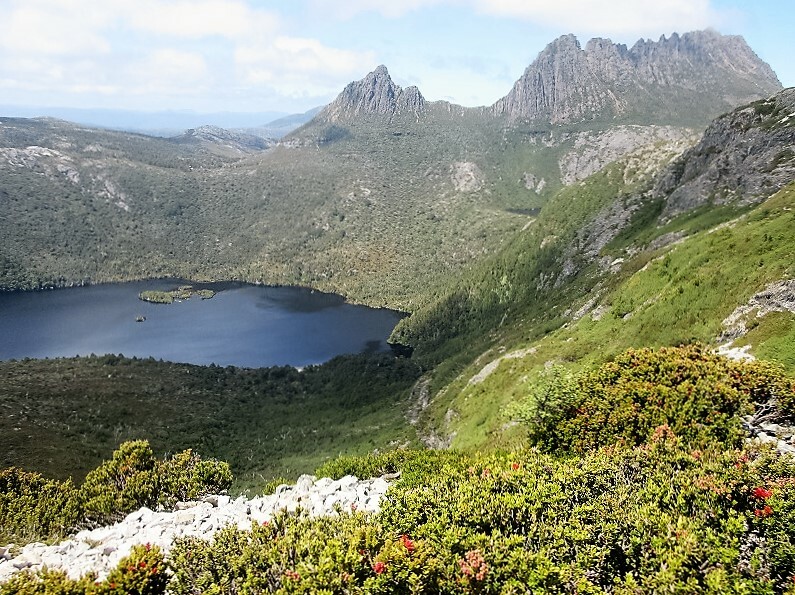 I visited alpine sanctuary for the Tasmanian devil at the entrance to the Cradle Mountain National Park after hiking. 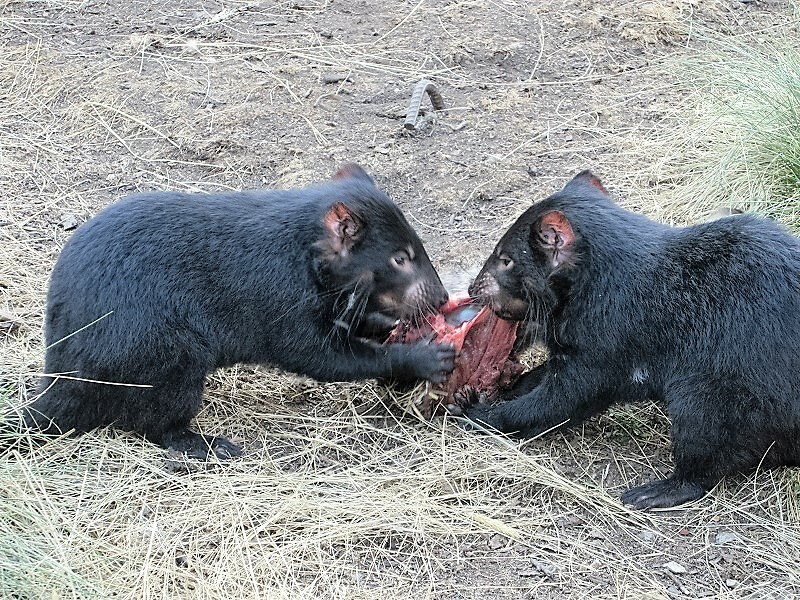 There is a facility named "Devils At Cradle" where Tasmanian devils are kept in the close to the wild conditions. It has guided tours DAY ($18 for adult) and NIGHT ($27.5). I joined in the night tour that Devils become more active. (1.5 hours’ tour). The size of Tasmanian devil likes a small dog, it became the largest carnivorous marsupial in the world. Even though they have a very cute face when they are sleeping, they eat the bait with fierce growl and scramble. Its appearance is really devil!!! The keeper explained the conservation programs such as the breeding, field and lab research. But, I could understand only 30 percent because of English problem. As far as I can tell, serious infectious diseases that devils become extinct are spread now. 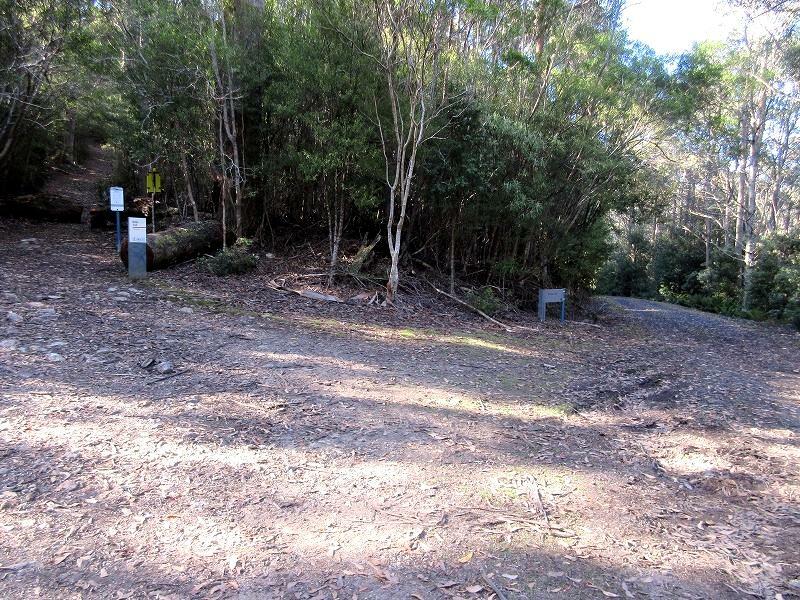 And, the spotted-tail quolls are kept in this facility. 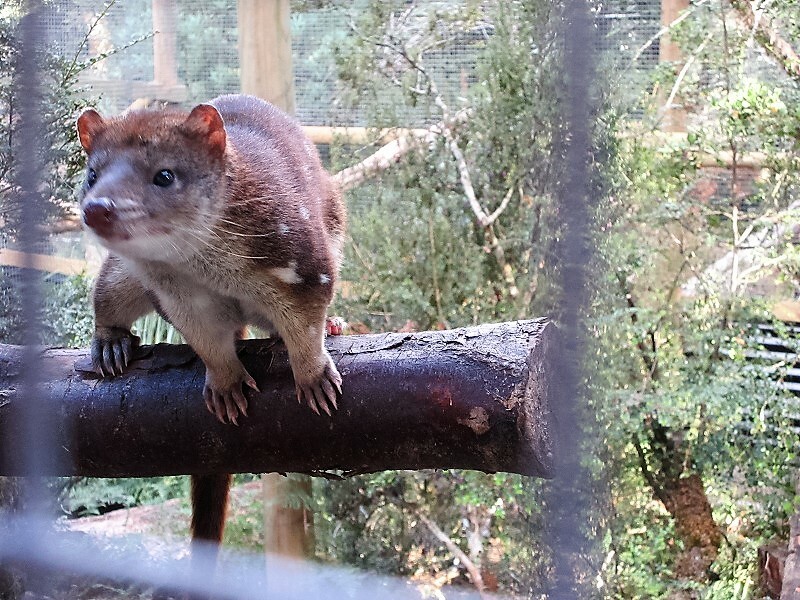 They are also known as the tiger quoll or the tiger cat, and they are nocturnal carnivorous marsupial. 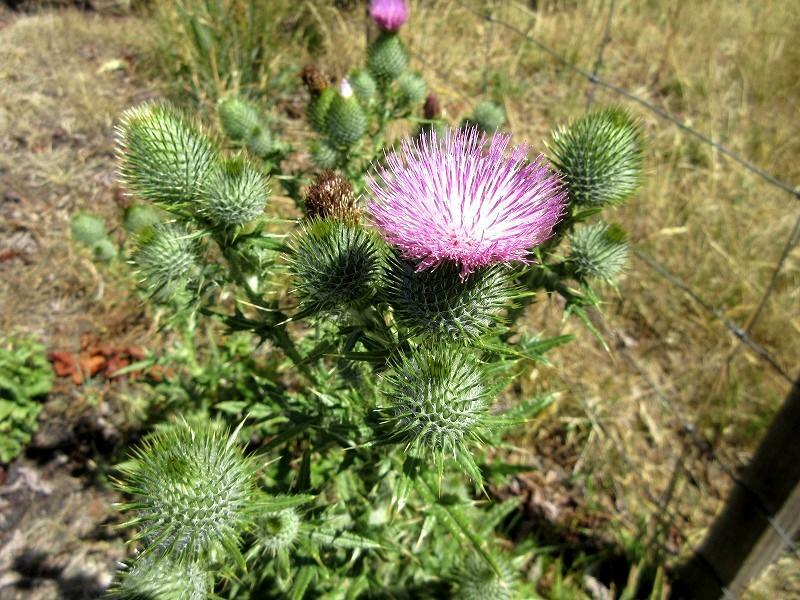 They can make a quick move and attack to prey such as a mouse. 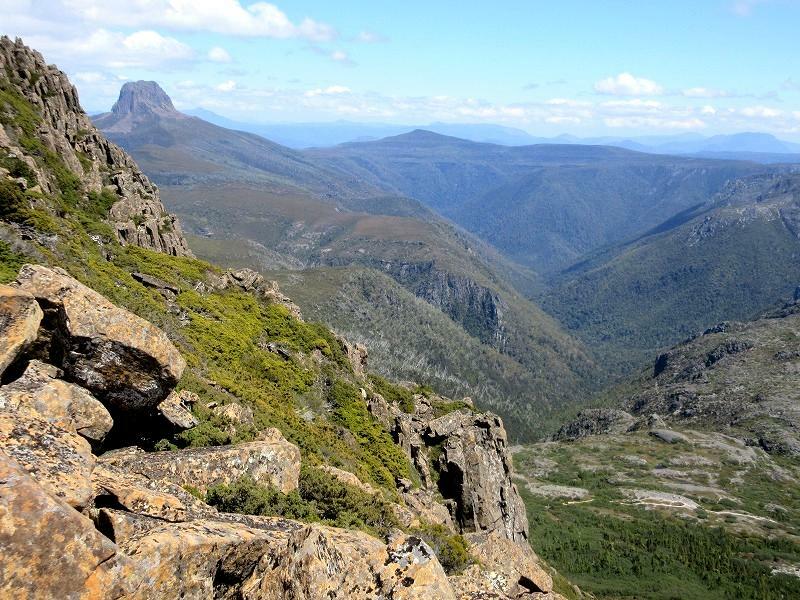 The fourth day of my solo trip in Tasmania is Cradle Mountain (1,545 m / 5,069ft) climbing. This is my primary purpose in my trip. 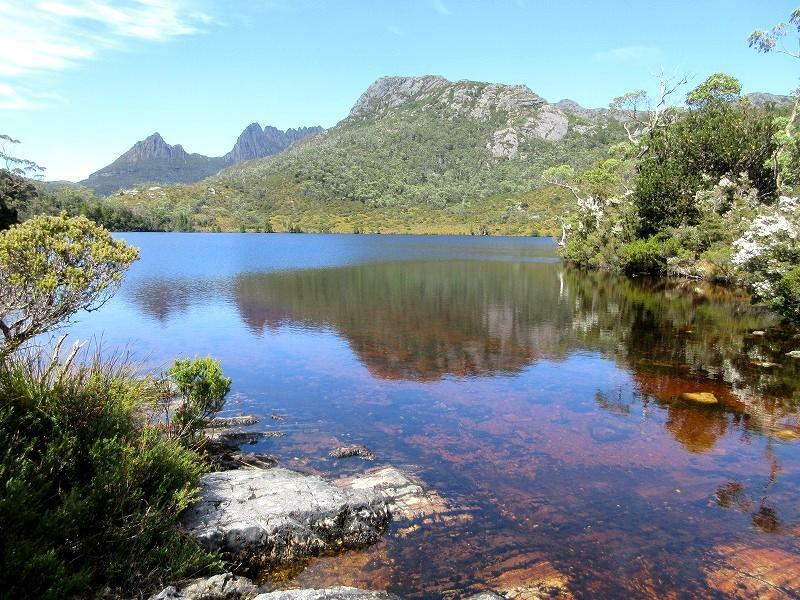 Cradle Mountain-Lake St Clair National Park that Cradle Mountain lies is best nature spot in Tasmania. Also this NP is the World Natural Heritage Site. It is indeed beautiful enough, therefore I put about 80 pictures on my blog. 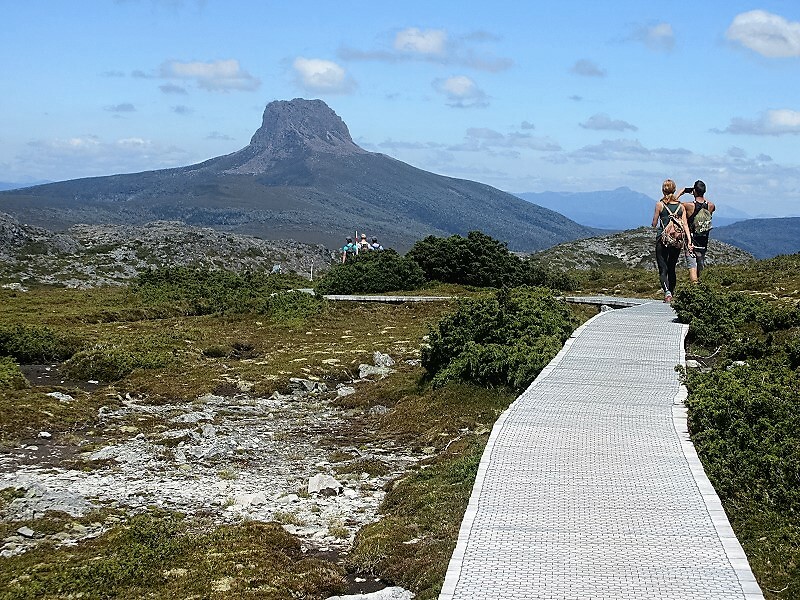 Cradle Mountain is climbed by tourists virtually year round. However, trails are covered in snow and ice in winter that is why climbers must have skill and experience for winter mountaineering. 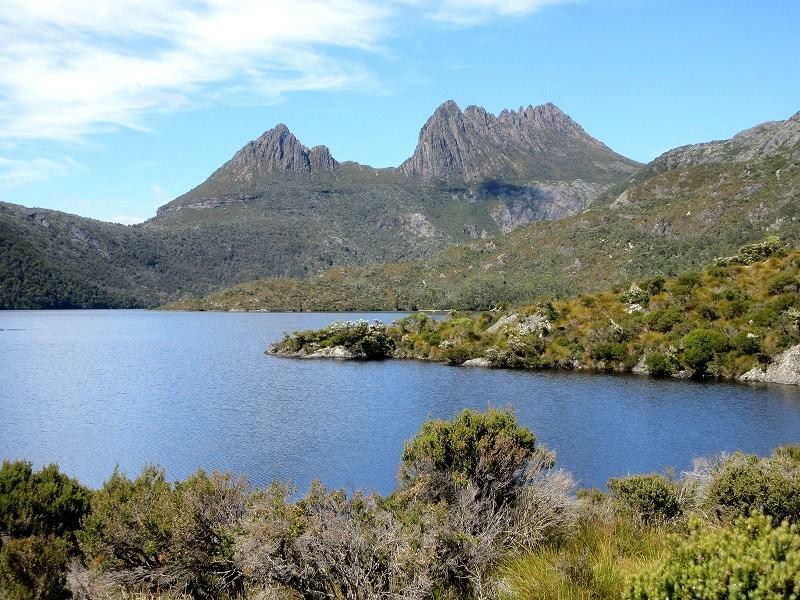 It is a strenuous return hike from Dove Lake car park in summer. 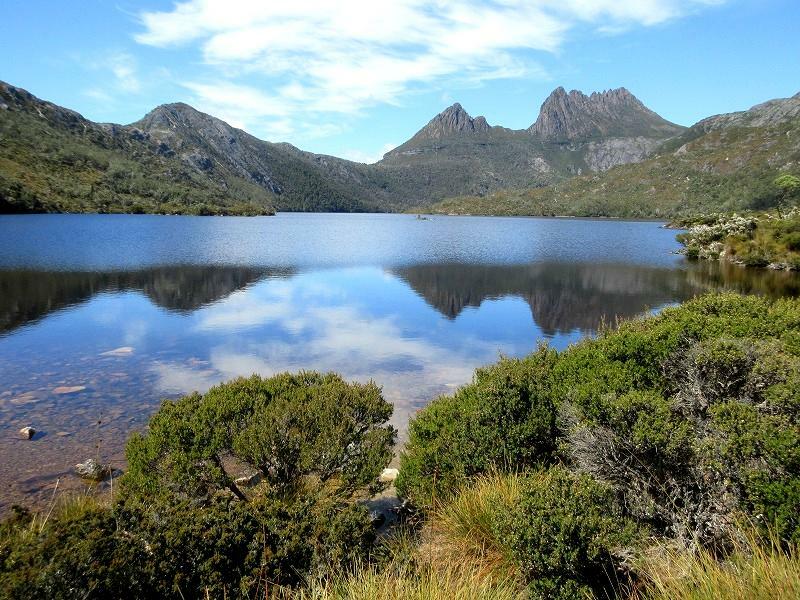 Also, around Dove Lake(934m/3,064ft), you can enjoy hiking depending on your condition and purpose, since there are lot of hiking route for beginners, such as Dove Lake Circuit. 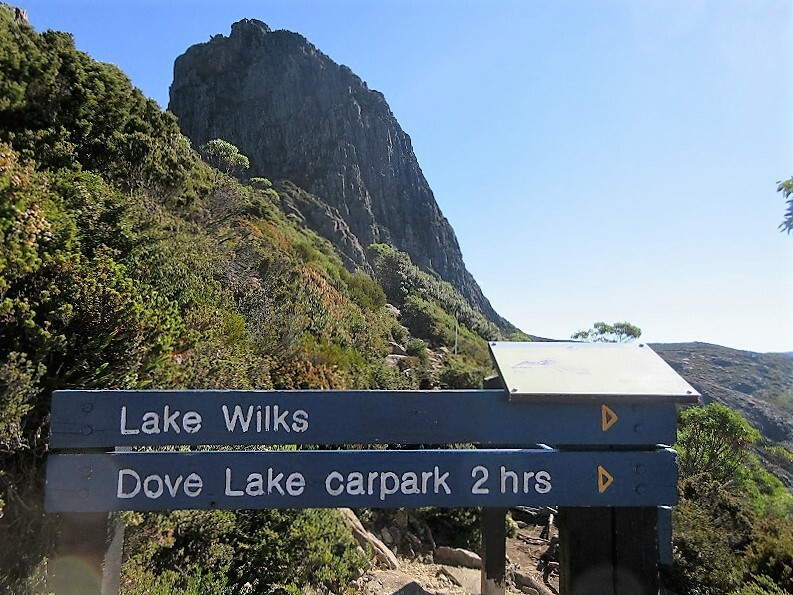 In order to climb to Cradle Mountain, First, going to the right on the Dove Lake Circuit from the parking. 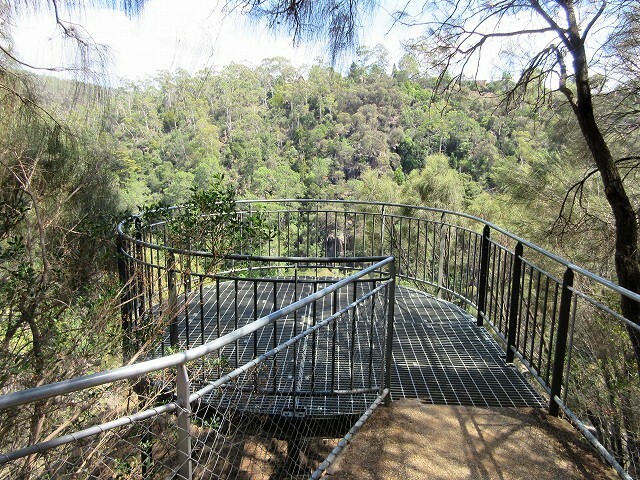 And then climbing to the Marions Lookout towering in the west of the lake. 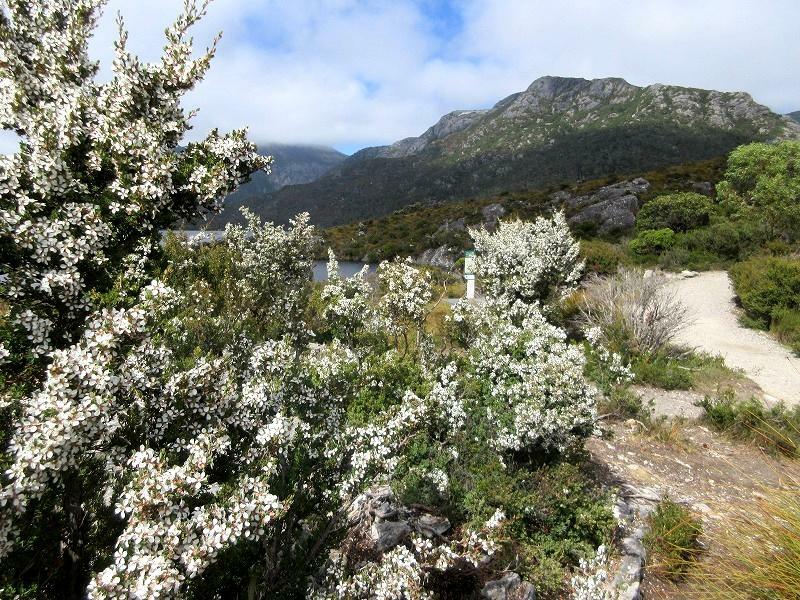 A lot of white flowers "Alpine Teatree (Shiny Teatree)" are in bloom around the lake. 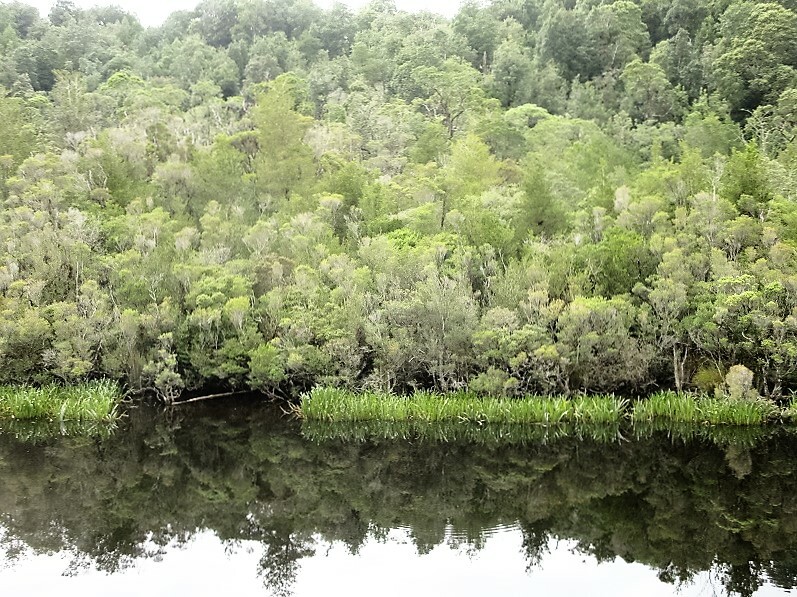 There are lot of small swamps around the large lake including the Dove Lake. 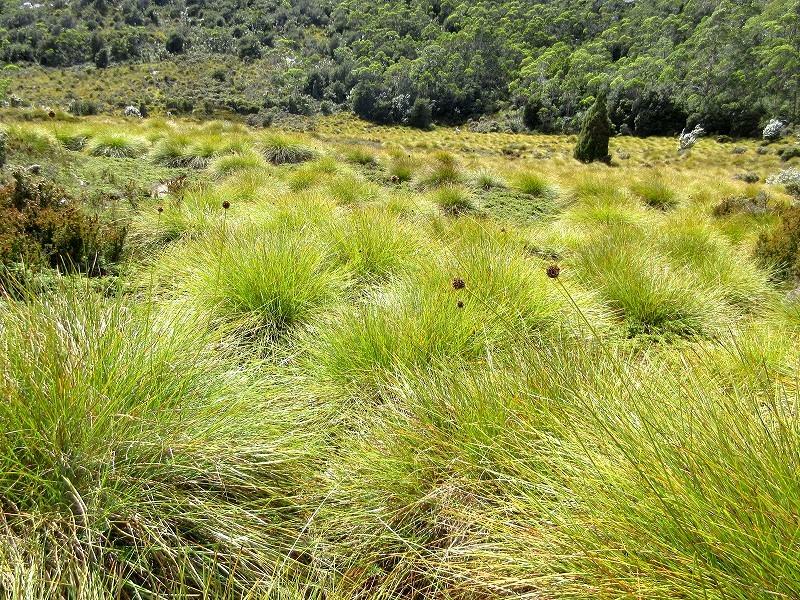 Commonly known as “buttongrass” is a one of species of a unique vegetation in Tasmania. 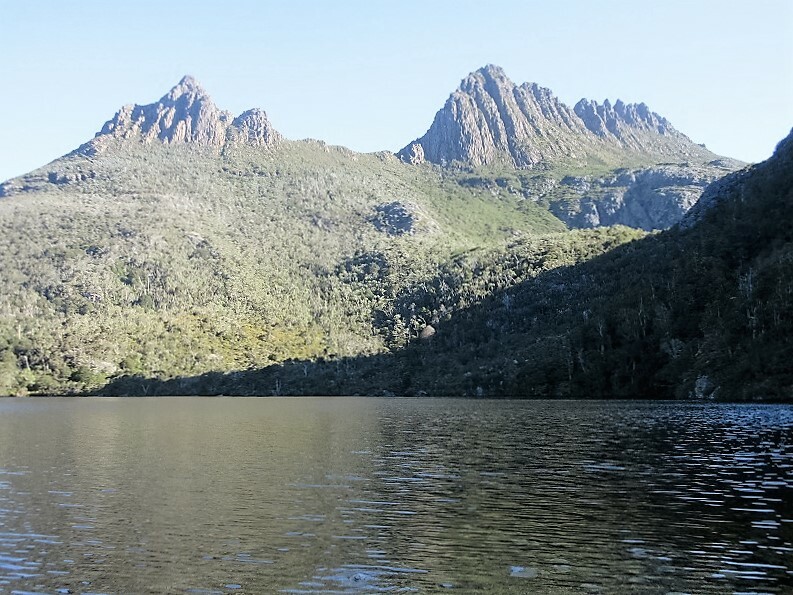 Going further on the Dove Lake Circuit to Marions Lookout fork from boat shed. 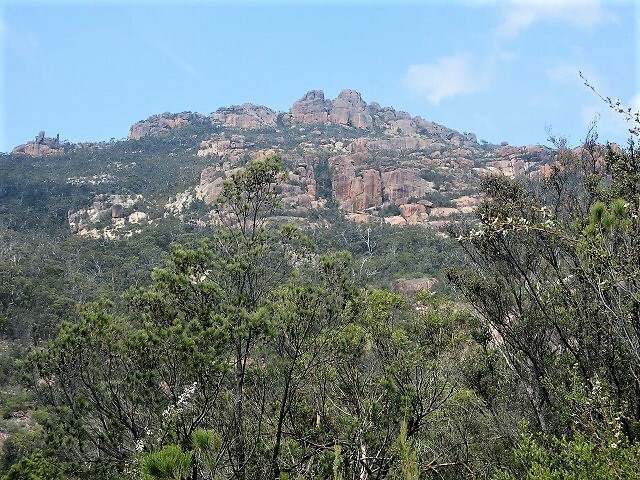 Marions Lookout is towering in the front. 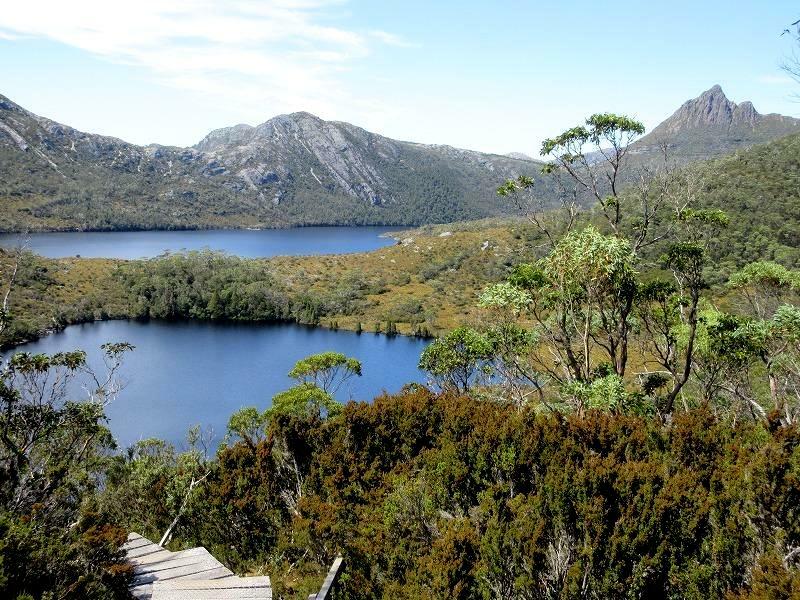 This route to climb from Dove Lake to Marions Lookout is the shortest route. I got sweating immediately because this trail is quite a steep incline. 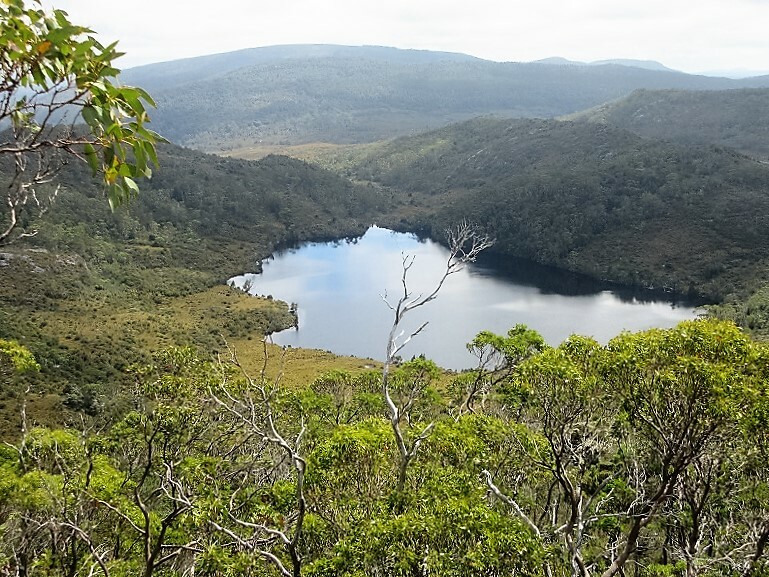 After climbing the steep trail in the forest zone about 20 minutes, Lake Lilla came into view. 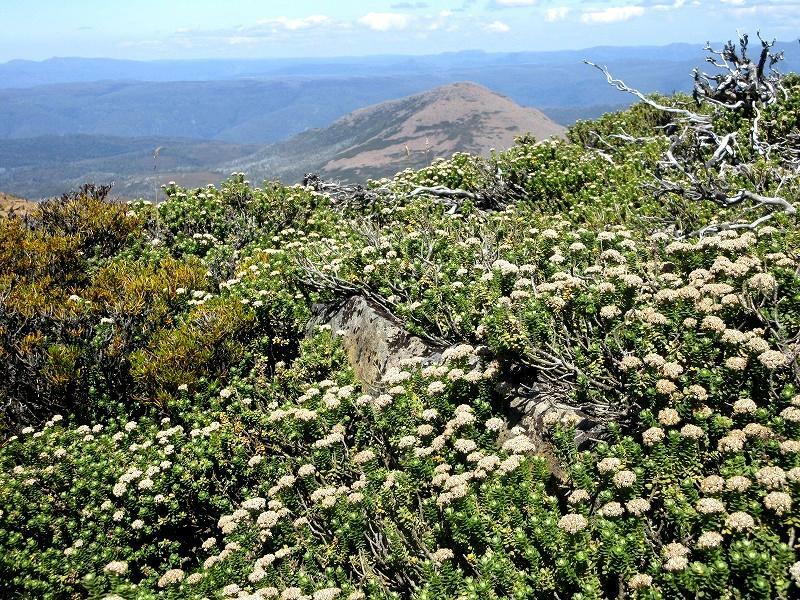 There are lot of "Tasmania Snow Gum" which is a kind of eucalyptus around here. Oh! 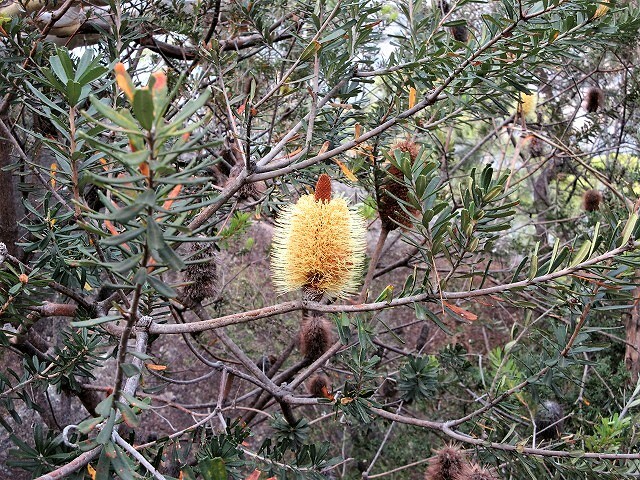 Tree of brush “Banksia or Silver banksia” is also here. 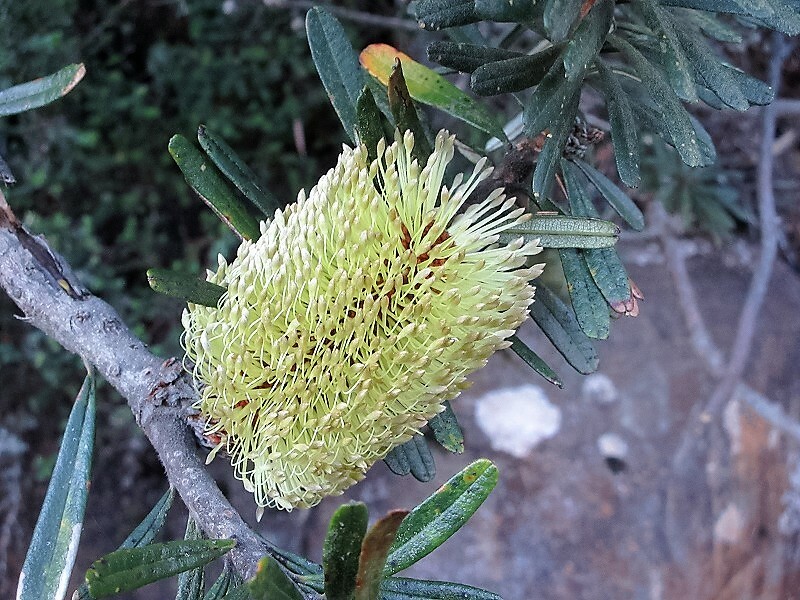 I saw this plant 3 days ago at Mt.Wellington in Hobart. 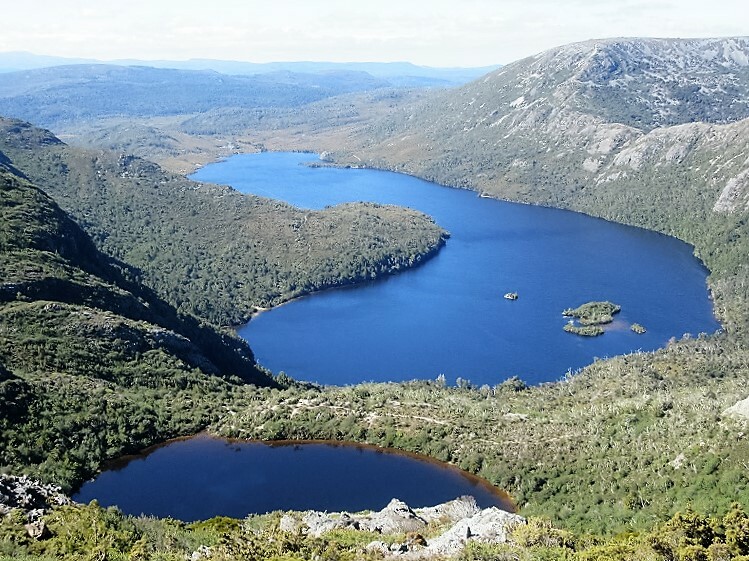 When increasing in altitude, Dove Lake(right) and Lake Lilla (left) come into view. 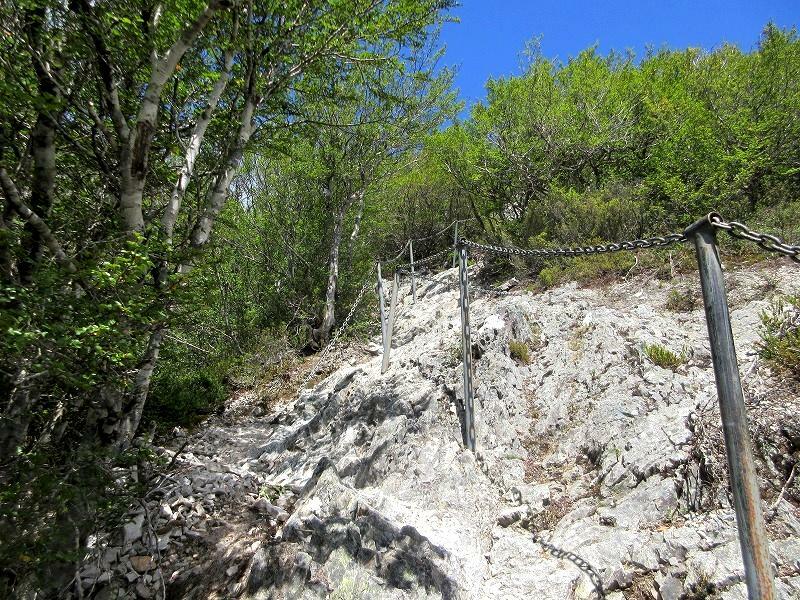 I climbed rocky slop which has been set the chain handrail just below the mountain ridge. 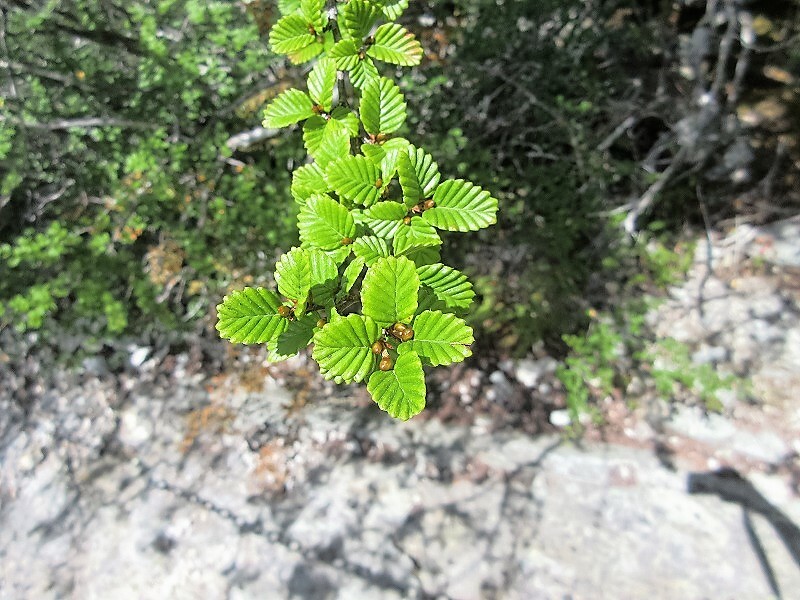 The trees around the trail are like Tasmanian deciduous beech called "Fuscospora gunnii". Once I got ridge line, a trail from the Crater Lake joined on the right, and Crater Lake was appeared. 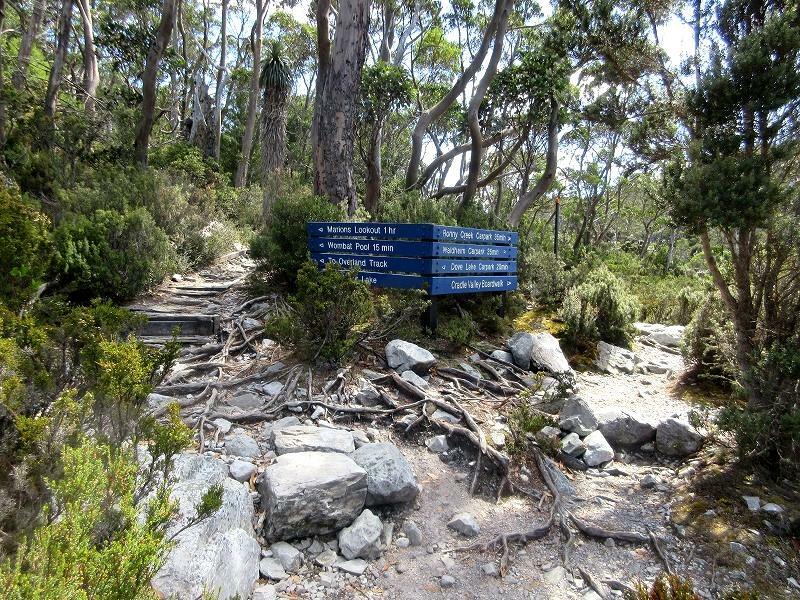 Ｉ arrived at the Marions Lookout (1,223m/4,012ft) in about 1 hour from the parking. 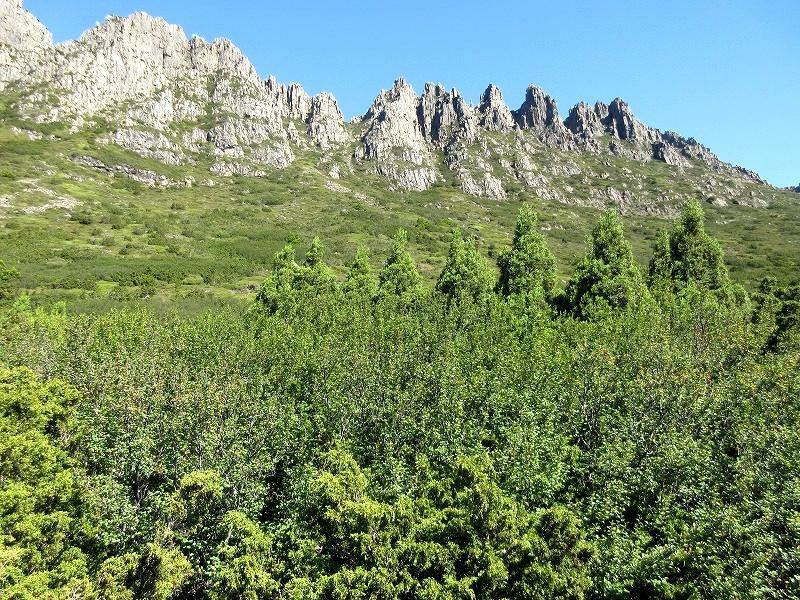 The tree line （The forest limit）is already at this altitude, I wonder that cause are result of latitude, or the climate of cool-temperate rainforest influence it. 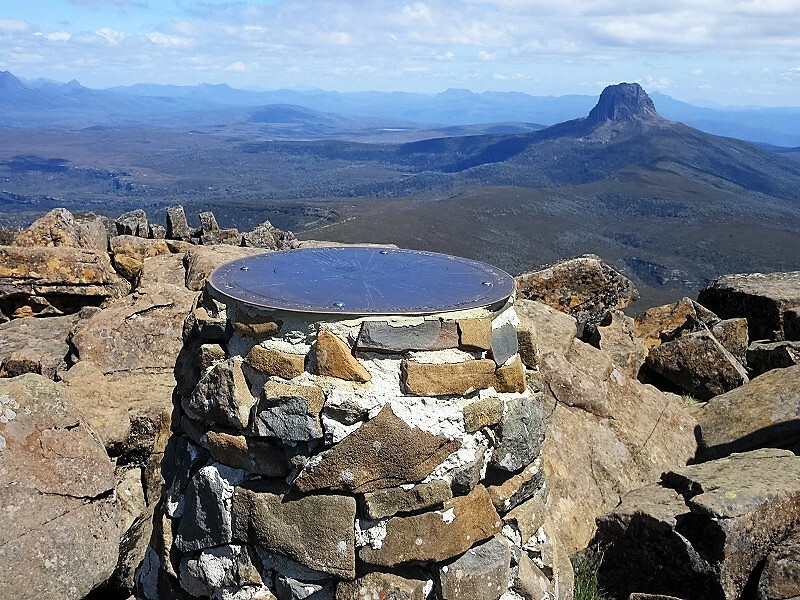 Spectacular views of Dave Lake and Cradle Mountains from Marions Lookout. 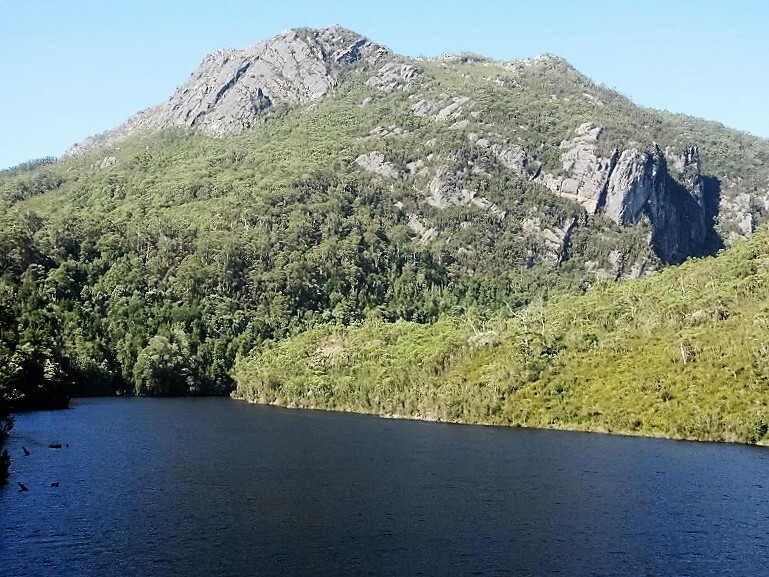 Mt.Campbell (1,248m) lies at the shore of Dave Lake. 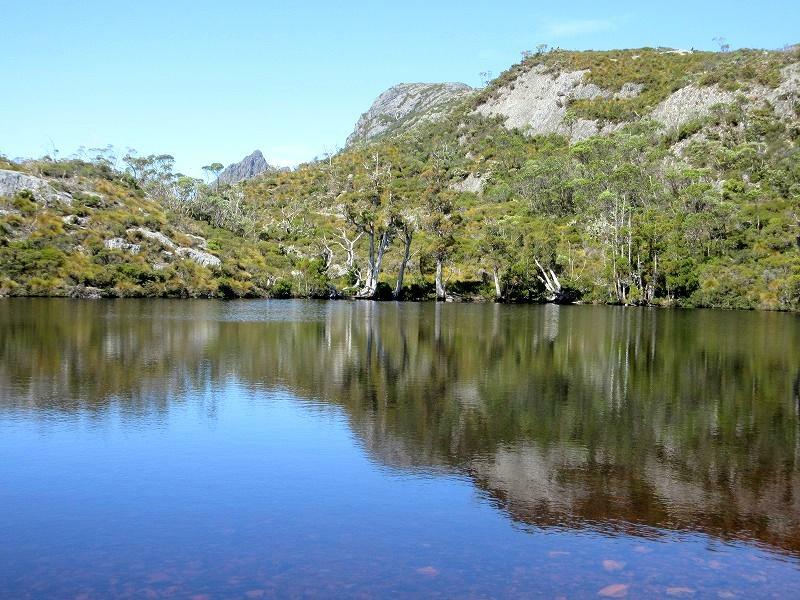 The Overland Track winds through a variety of landscapes as far as Lake St Clair, Australia’s deepest lake. 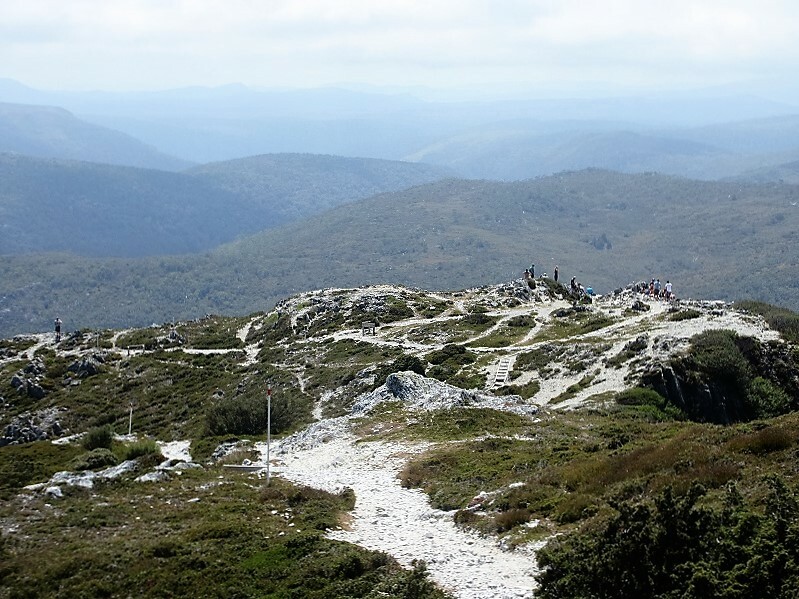 That distance about 80.8 kilometers (50.2 mile), so hikers need to backpack entire a period of 6 days. 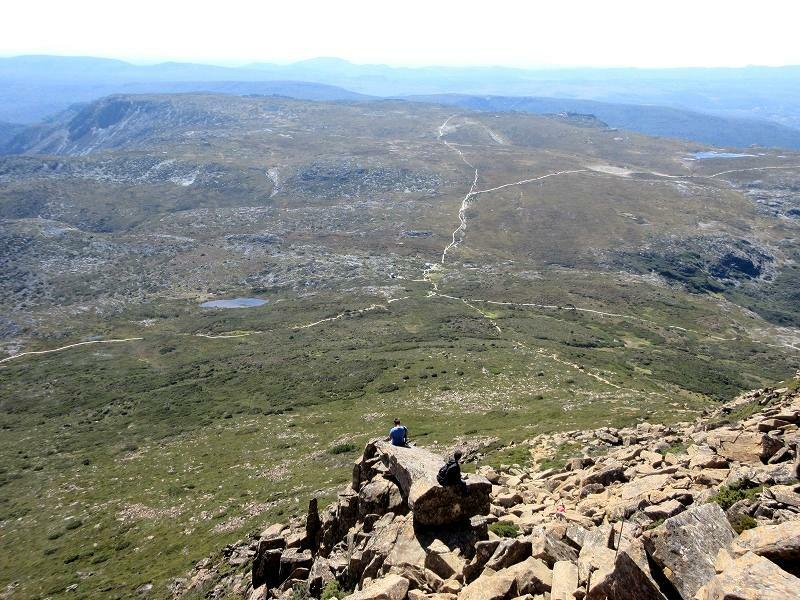 Immediately, I get overlooking the whole of Cradle Mountains. 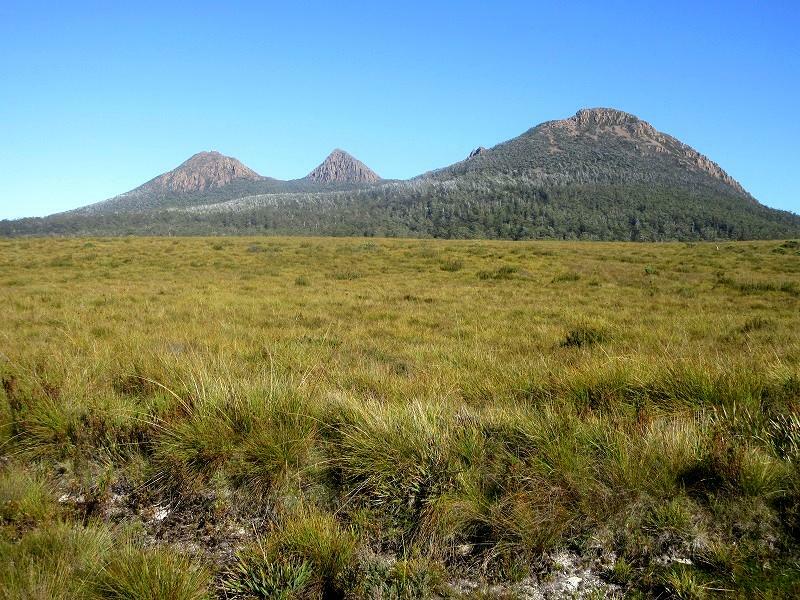 Little Horn (1,355m/4,445ft) is seen in ahead of swamps. 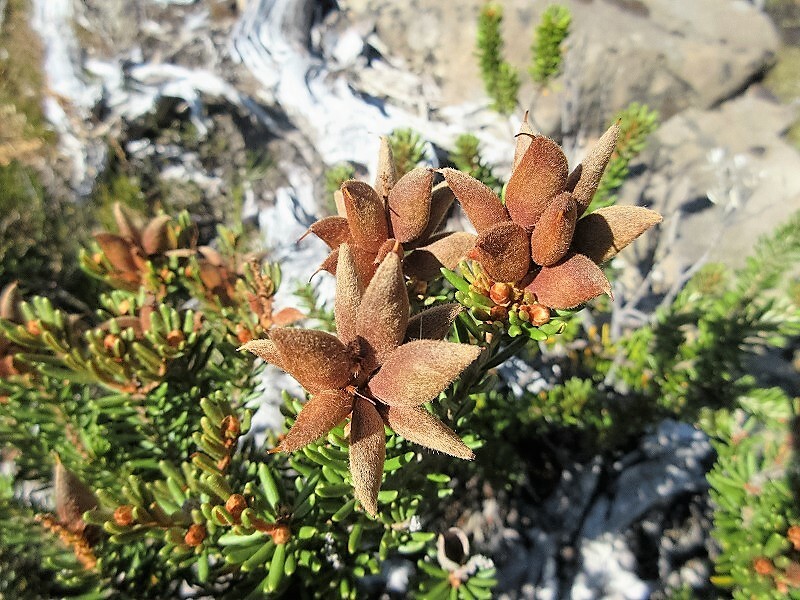 Alpine plants are in bloom everywhere. Barn Bluff reminds me the Mesa of Monument Valley in US. 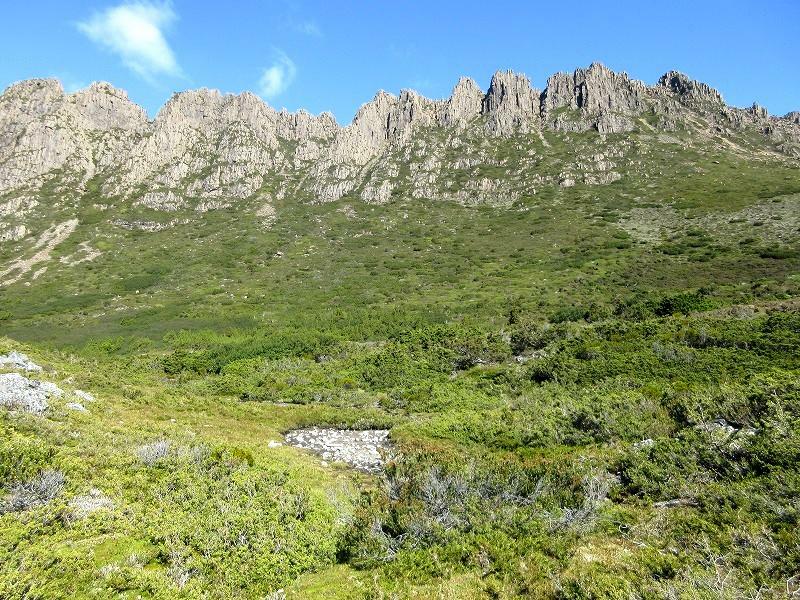 Can you see the trail from Kitchen Hut extending to the summit of Cradle Mountains on the right side? 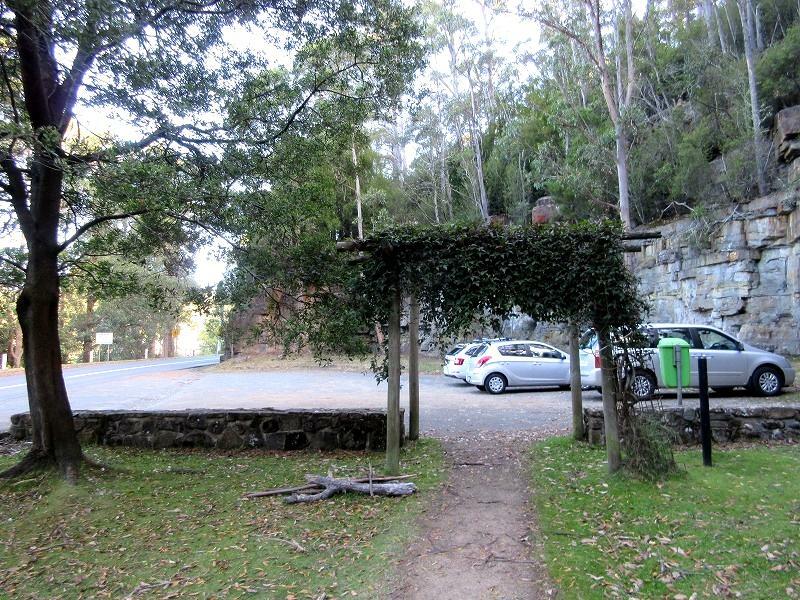 I arrived at Kitchen Hut (unstaffed hut) in about 40 minutes from Marions Lookout. 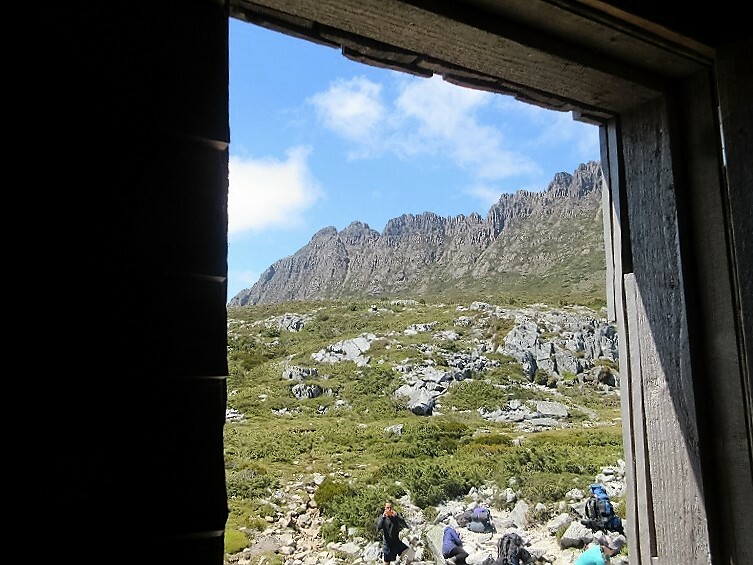 Cradle Mountains visible from the window of Kitchen Hut. Going to the left at this three-way junction away a few maters from Kitchen Hut. 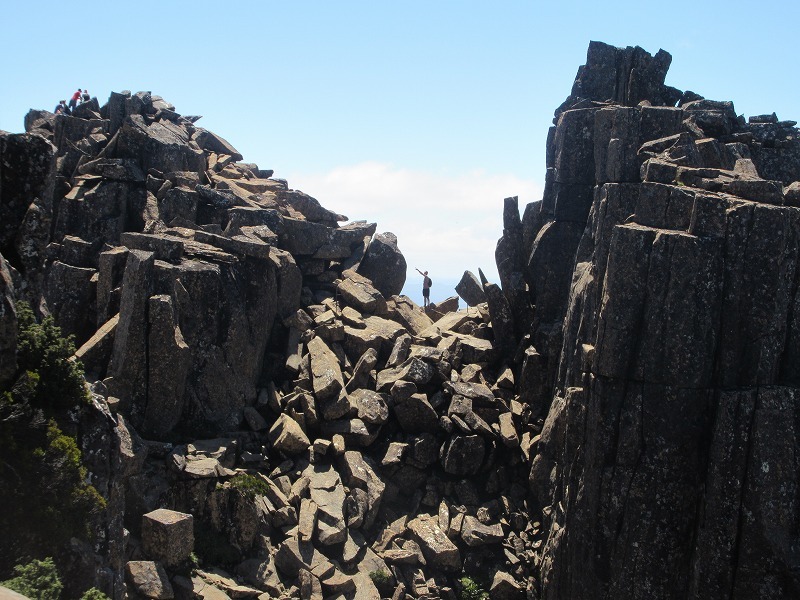 Coming to the rocky mountain of columnar joints when I came near the wall of Cradle Mountains. 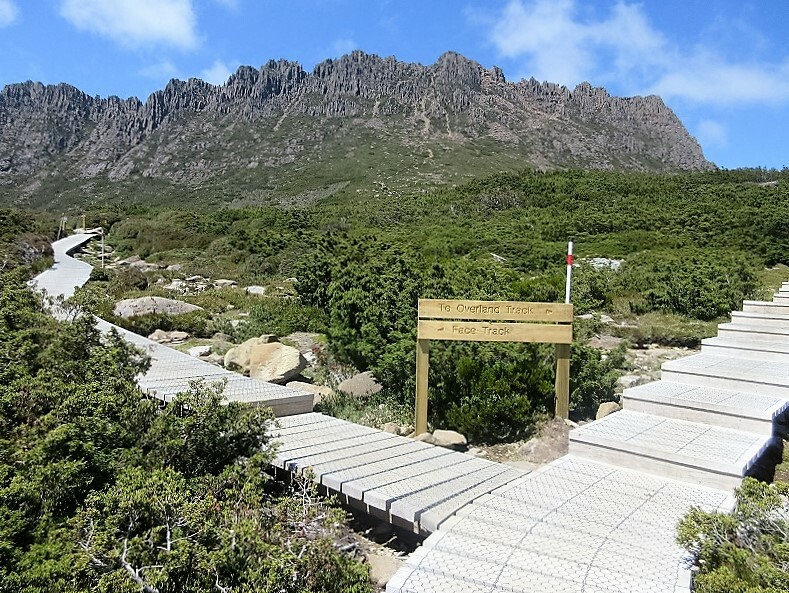 To traverse to the right from the place where that sign board shows "Cradle Summit". Overlooking to the north, there are lot of small lakes and swamps. 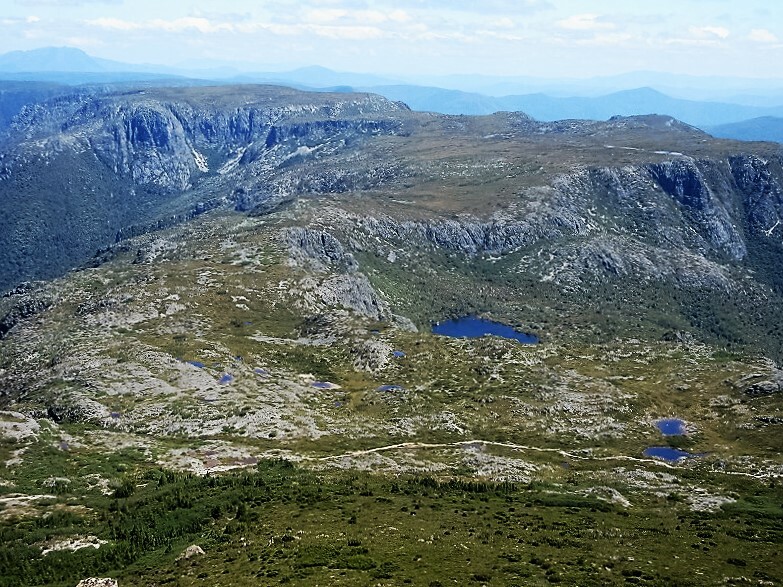 Also I can see the trail of the Overland Track, and extensive Cradle Plateau is in the back. Dave Lake is visible in the northeast. Sometimes Barn Bluff is visible in the south. 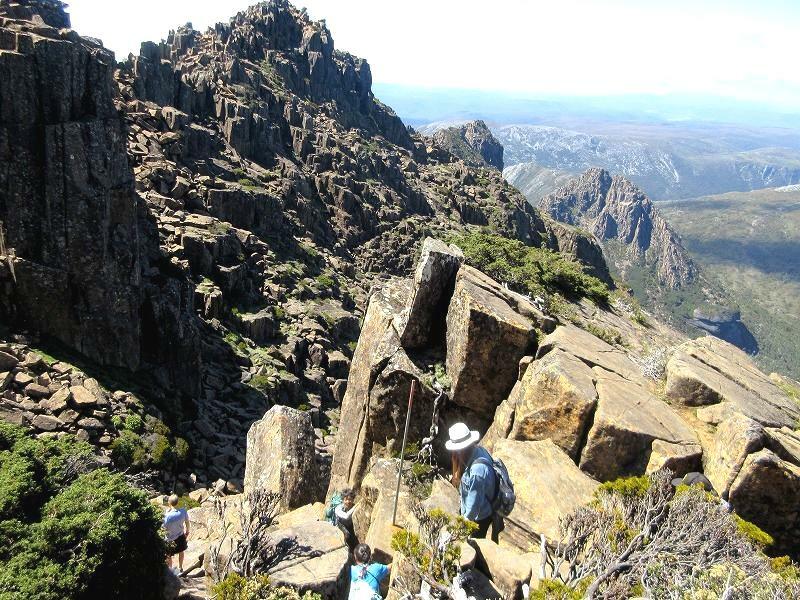 Cradle Mountains come to reveal the rocky surface. Looking back to view, and Kitchen Hut looks so much smaller already. 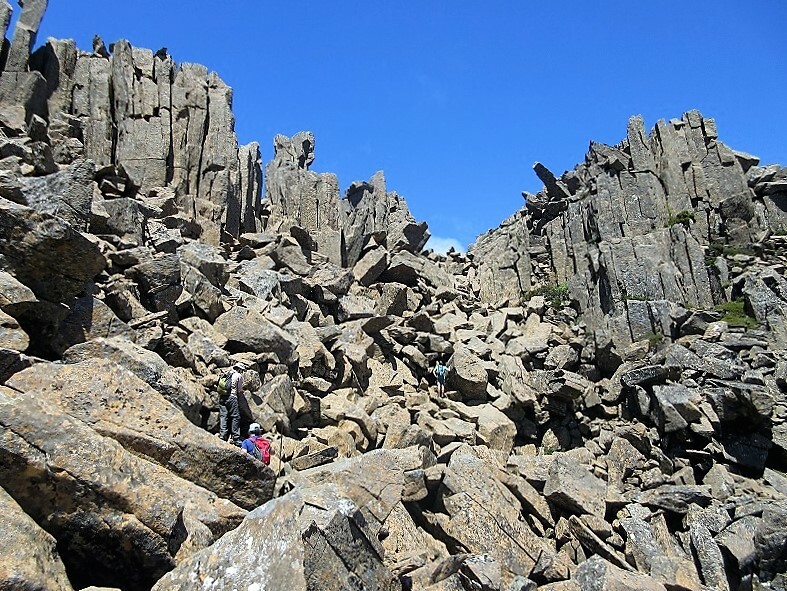 The climb up the rocky part of the mountain involves scrambling over large boulders for several hundred meters. 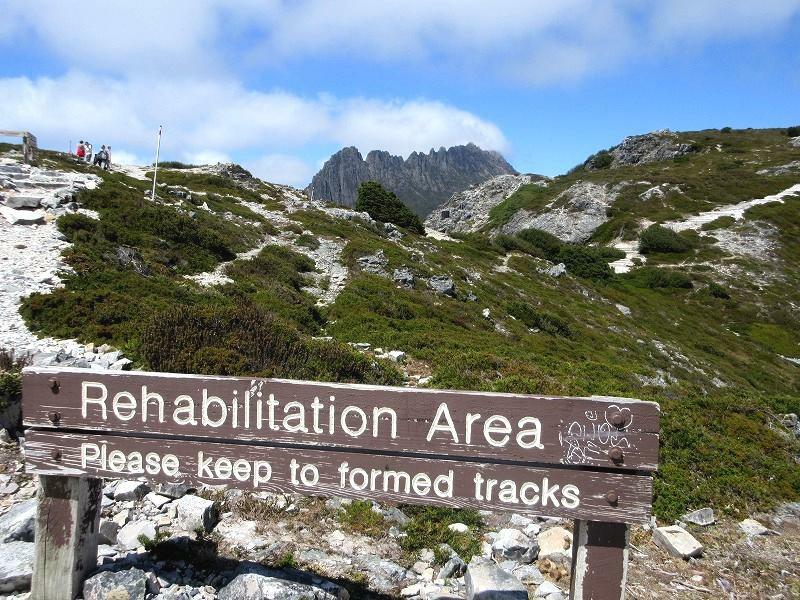 The entire climb is exposed to any bad weather that may arrive quickly, while climbing the upper slopes in winter can be dangerous due to slick ice on the rocks and heavy snow covering holes and other hazards. I reached the col where I misunderstood that is the top of mountain. Furthermore another rocky mountain appears in front of me. I go down from the col, and then going to the left of the rocky mountain. 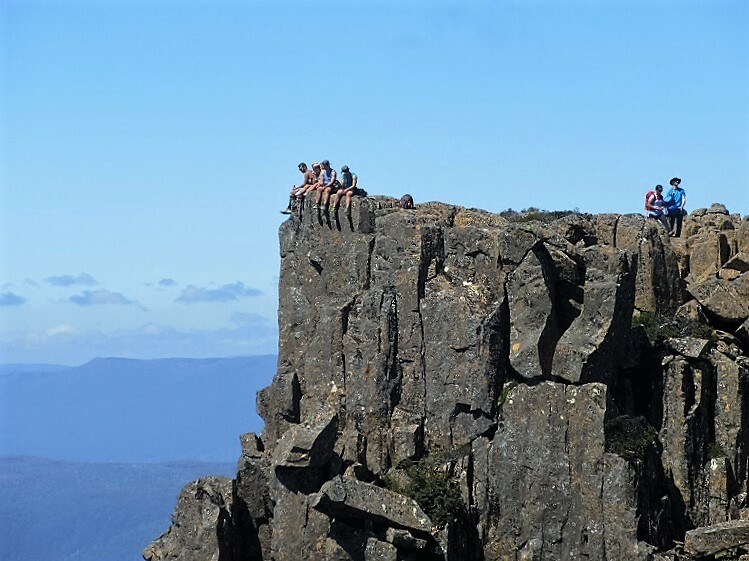 Hikers who are sitting on the rocky terrace look like comfortably. But…their sitting terrace is more than enough high. Sooooo scare! 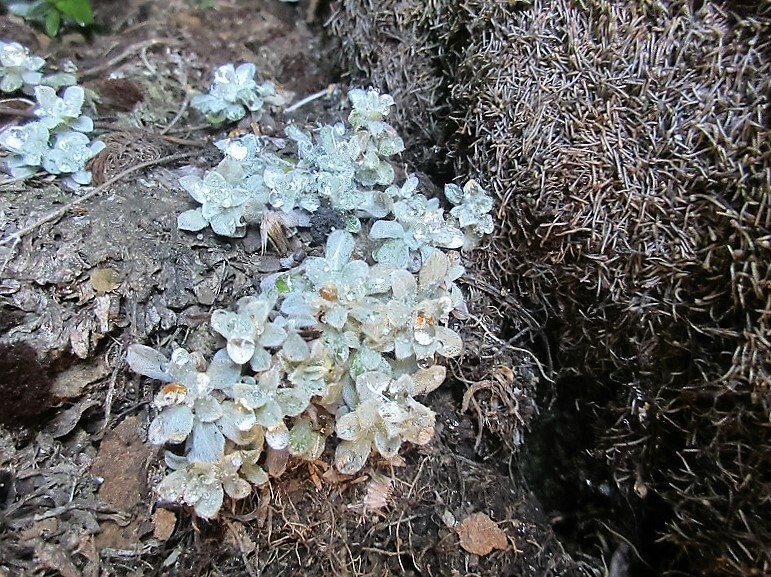 I found wet alpine plant with dew in the lee of a rock. These look like jewels. I climbed on the last section of rocky, the summit is almost there. 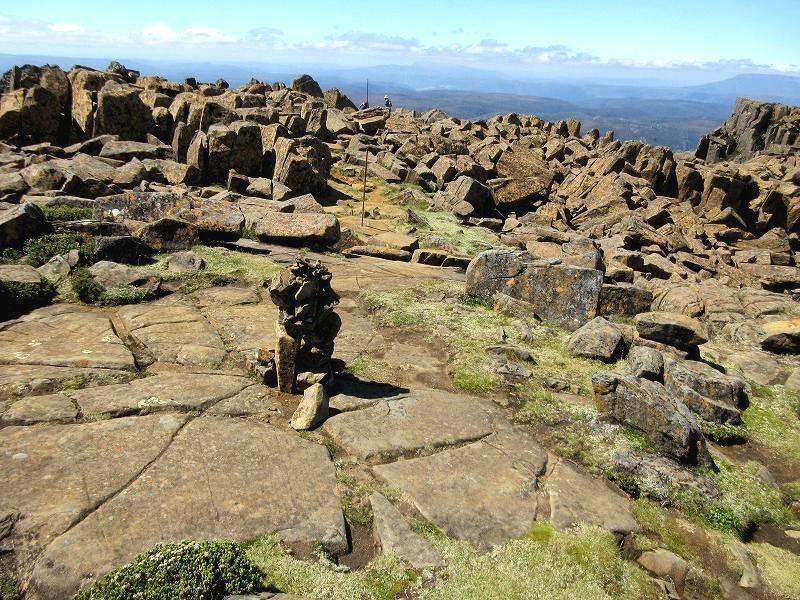 Summit of the Cradle Mountain is a large table-like peak with many rocks. 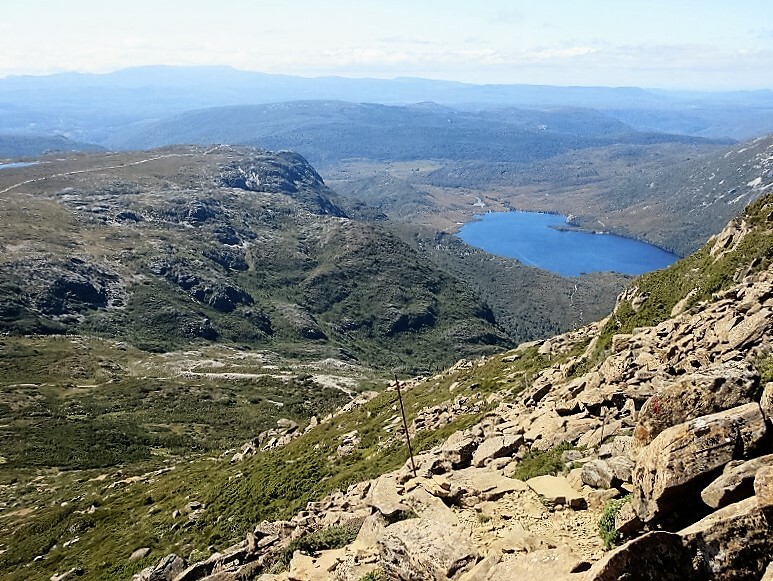 I got top of Cradle Mountain about for 1 hour 30 minutes from the Kitchen Hut, for 3 hours 30 minutes starting from Dave Lake parking. 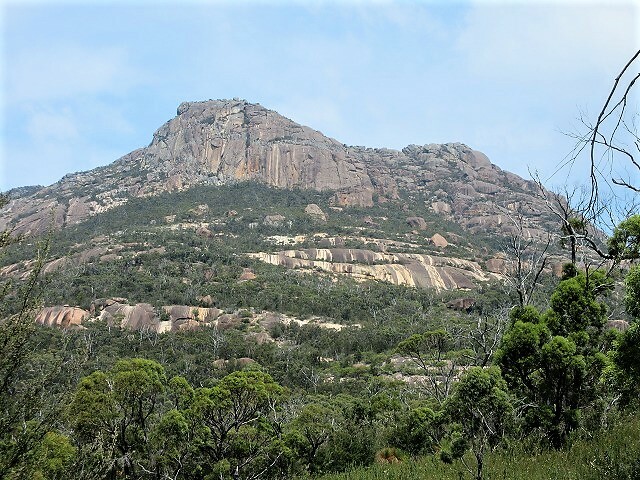 From the summit, there is a spectacular view of 360 degrees, encompassing Dove Lake, Barn Bluff and Mount Ossa. 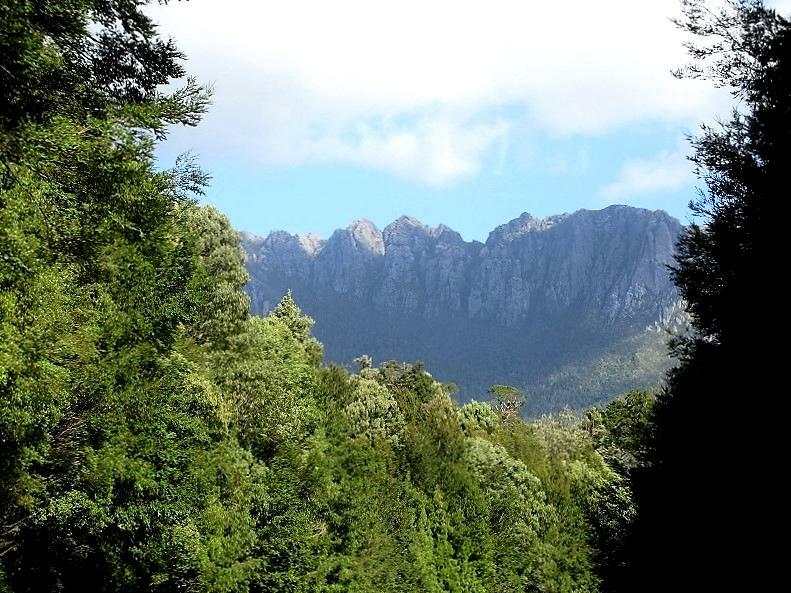 Barn Bluff (1,559m/5,115ft) rises behind the vast extent of forests. This is a great view. A magnificent view of Mount Emmett in the northeast. 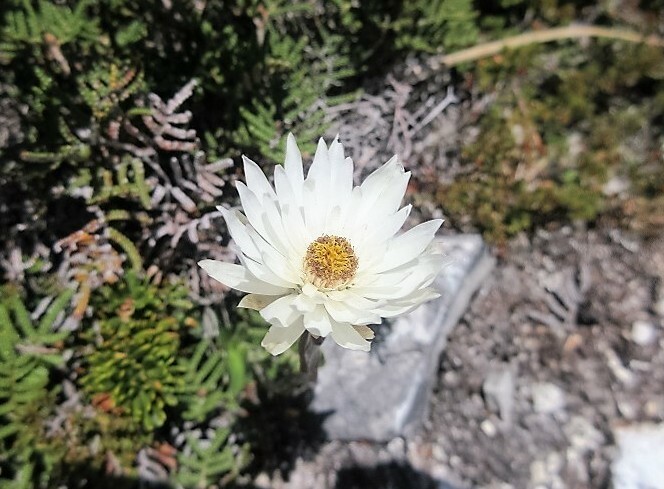 Blooming a lot of alpine plants in the summit of the rocky is amazing! I started to go down the same route to the three-way junction of Kitchen Hut after enjoyed landscape from top of the mountain. 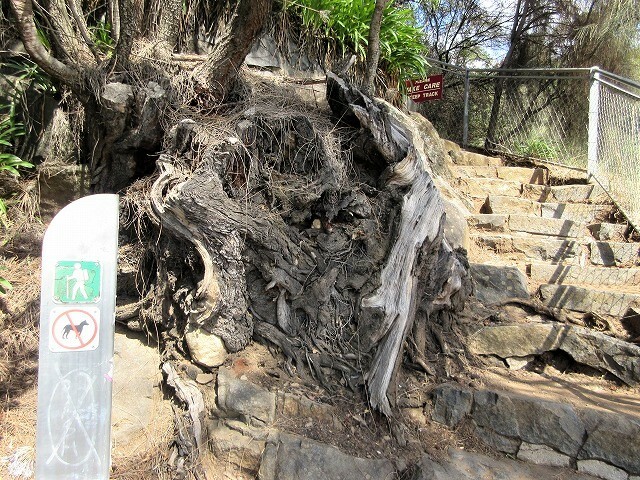 You should pay attention when go down on the rocky trail because going down is so much more difficult than climbing. 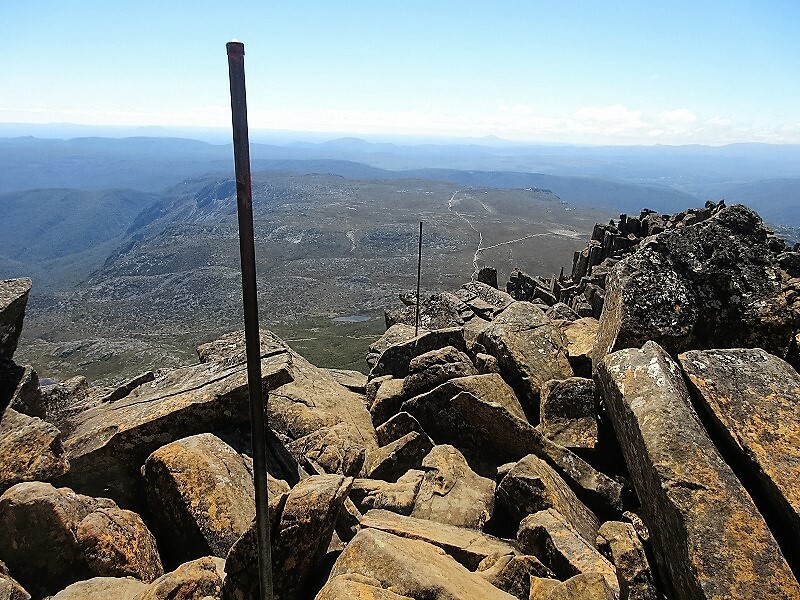 Marking iron poles have been embedded to indicate the direction at the time of bad weather in a broad summit area. I got to the three-way junction of Kitchen Hut in the descent in 1 hour. 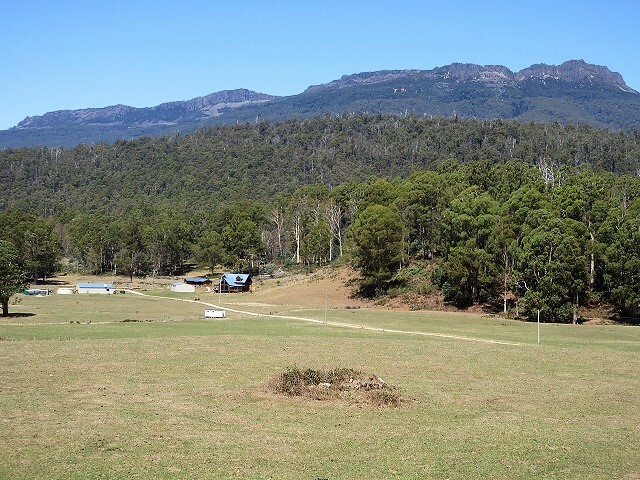 And then going to the Face Track (to the east) which is opposite to the Overland Track. 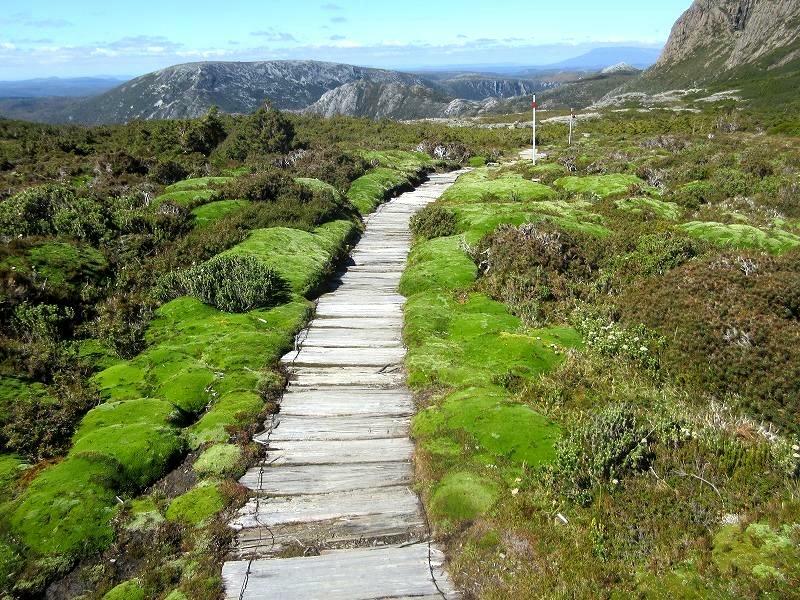 The Face Track is a lovely trail that across the creek or walking in the moss carpet. 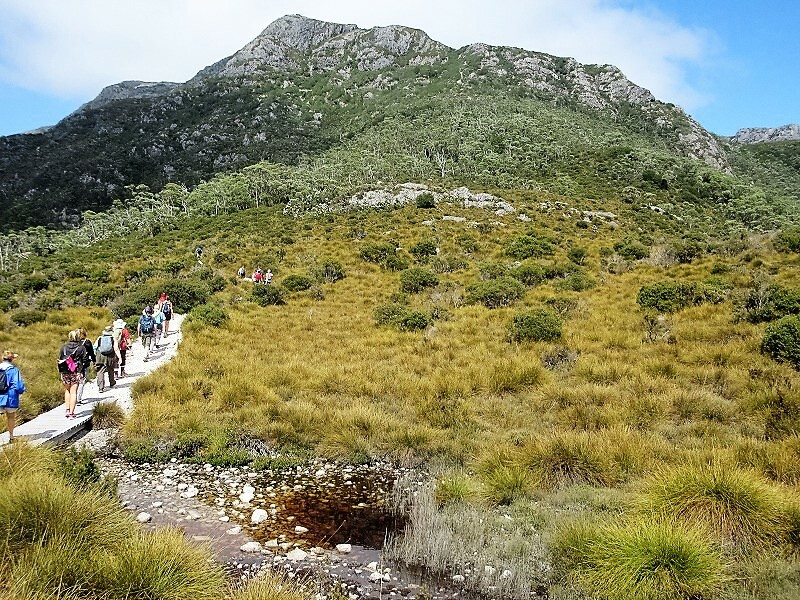 Walking while looking at the Cradle Mountains to the right side. 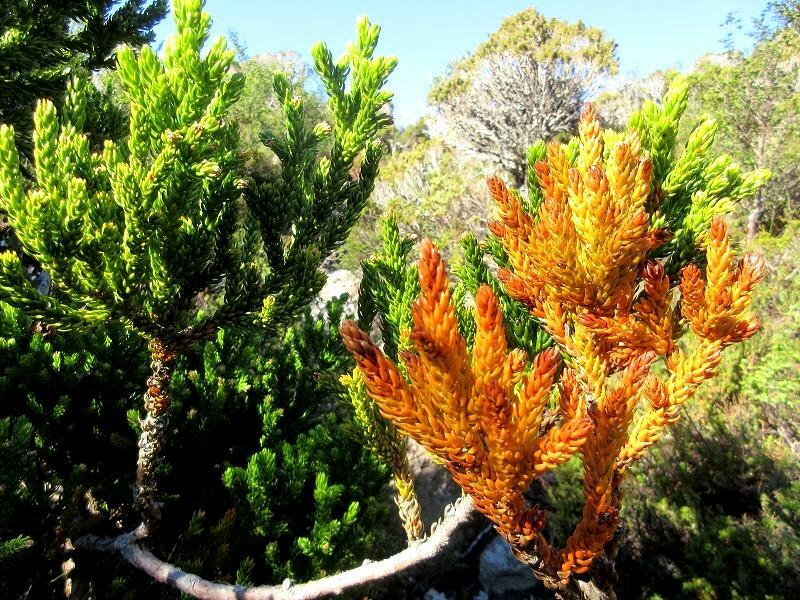 It is interesting that needle peaks of Cradle Mountains and “Pencil Pines” are same form. 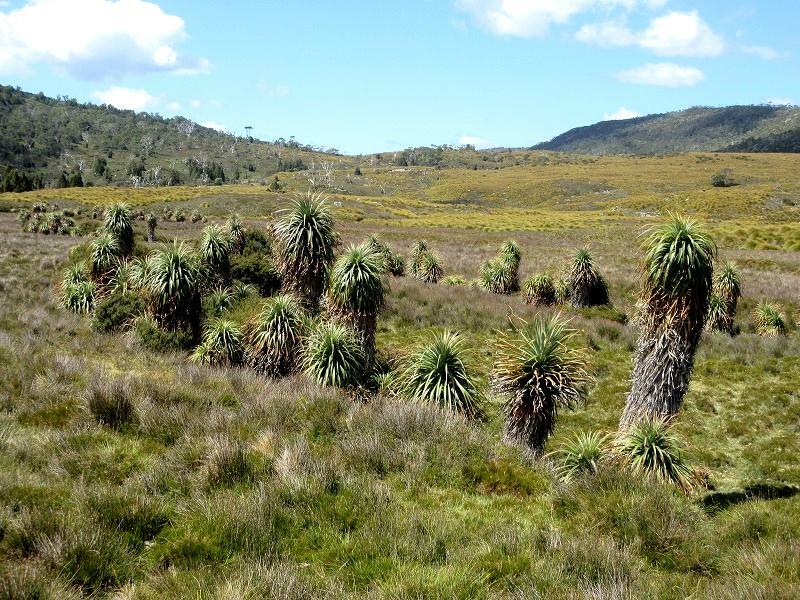 Athrotaxis cupressoides is a species of Athrotaxis endemic in Tasmania. 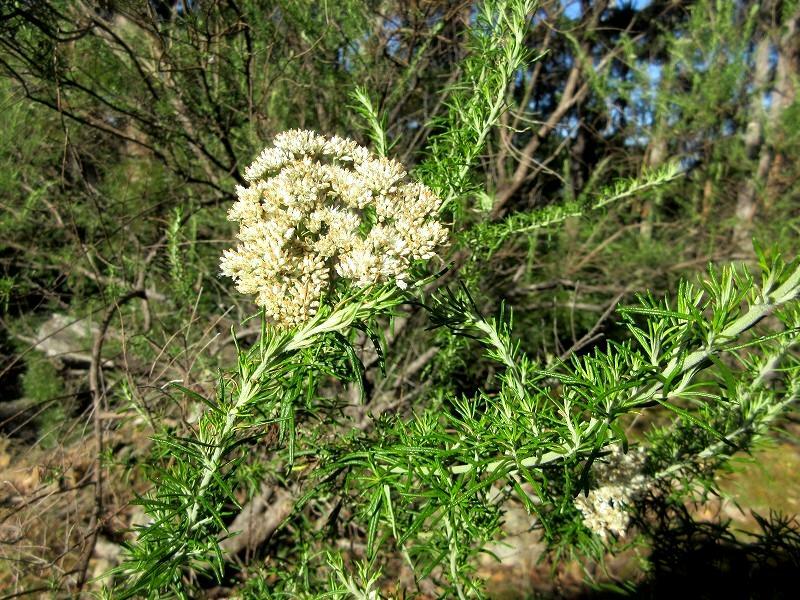 Its common name is “Pencil Pine”, although it's not a member of the Pine family. 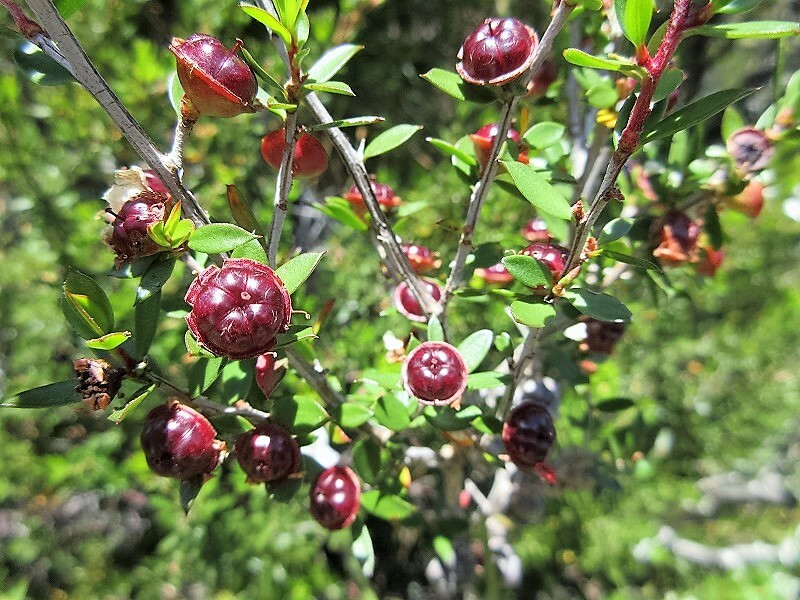 There are interesting nuts and plants in other else. After a while, Lake Wilks and Dove Lake comes into forward view on the left side. There is a trail between two lakes. 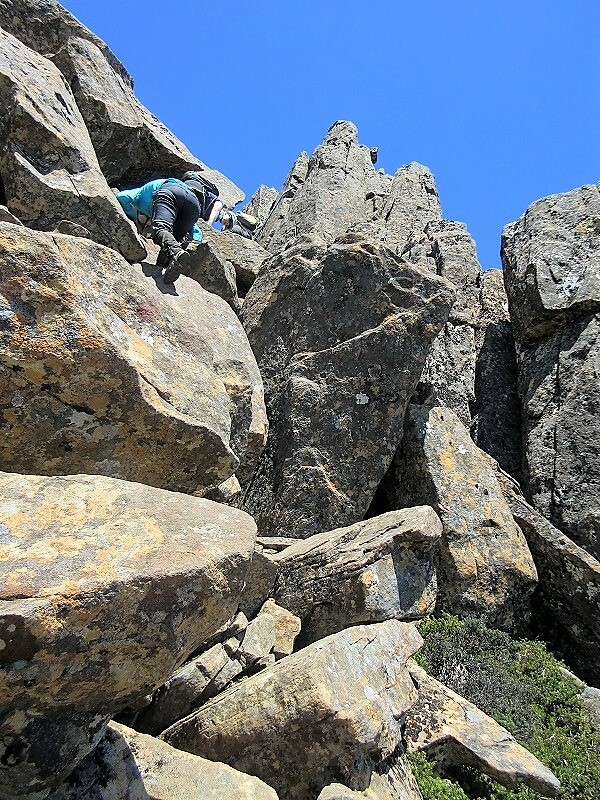 Most close to the rock wall of Cradle Mountains. 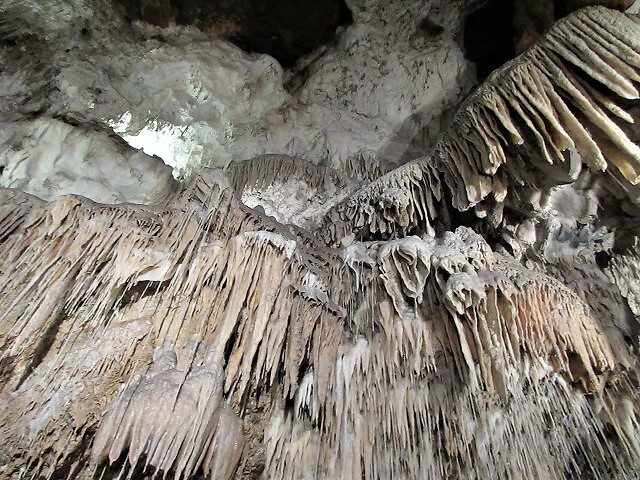 Looking up the vertical wall. I got the fork of Lake Wilks Track in about 1 hour from Face Track junction. 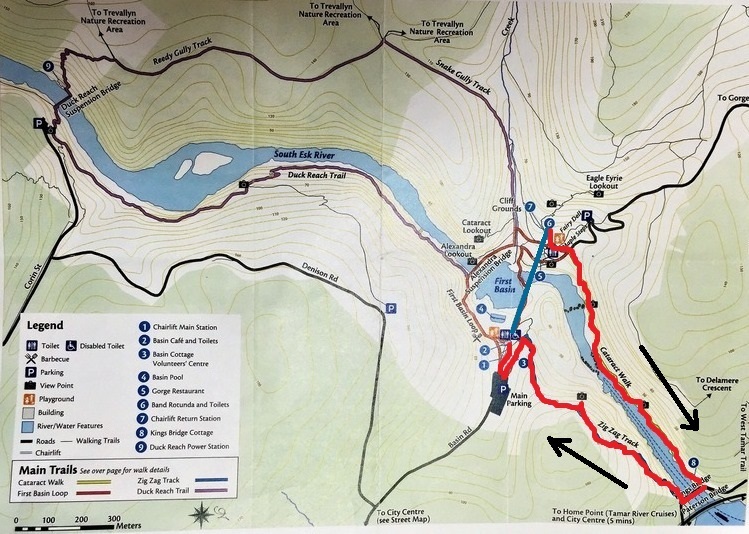 By the way, if straight through this fork, there is an another trail which go back to the parking via the Twisted Lakes, Hansons Peak (1,185m/3,888ft). It looks very attractive trail, but it will take more 4 hours. It is impossible to me because I am getting tired. Turning to the left at the fork, going down to the Lake Wilks. 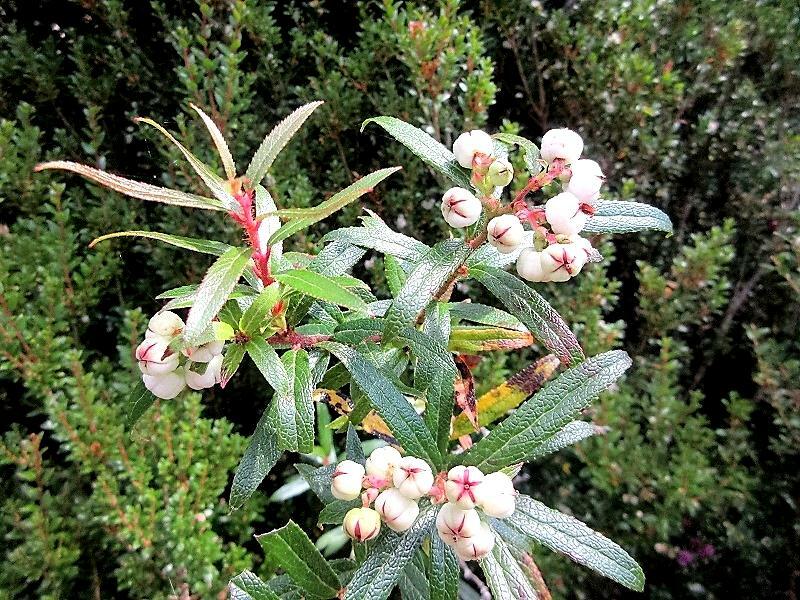 The forest of the impressive white stem has spread to the bottom of the Little Horn. 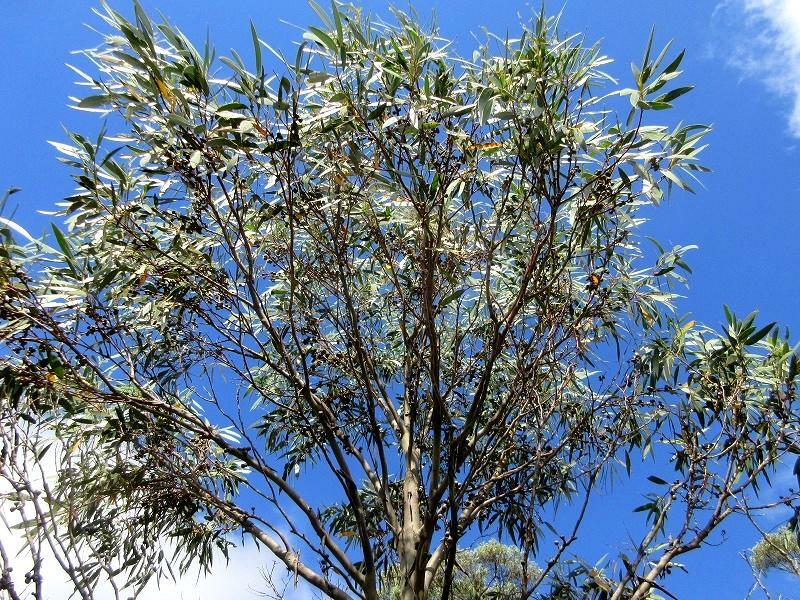 White stems are old eucalyptus trees. I arrived at the Lake Wilks, which is turned brown in about 30 minutes from the fork of Lake Wilks Track. 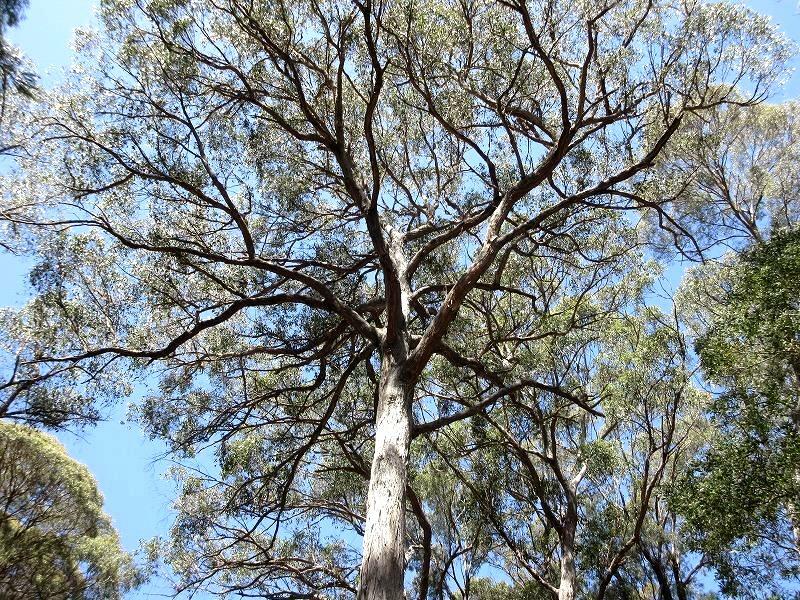 This is often called “King Billy Pine or King William Pine”. I wonder if autumn leaves have begun early. Going down along a creek from Lake Wilks, and then going into the forest zone. 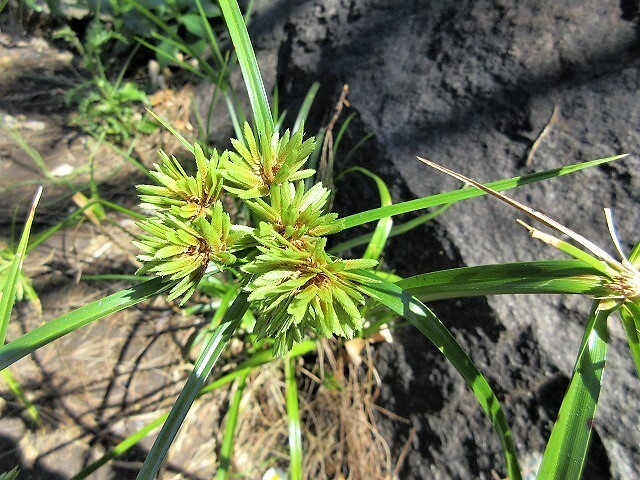 In the forest zone, I was able to see "Pandani (Richea pandanifolia)", which is one of the plants that I wanted to see for quite a while. Finally I joined in Dove Lake Circuit in about 30 minutes from Lake Wilks. then I walked on the boardwalk about halfway around the lake (about 3km) to the parking. Along the way, across the Ballroom Forest. 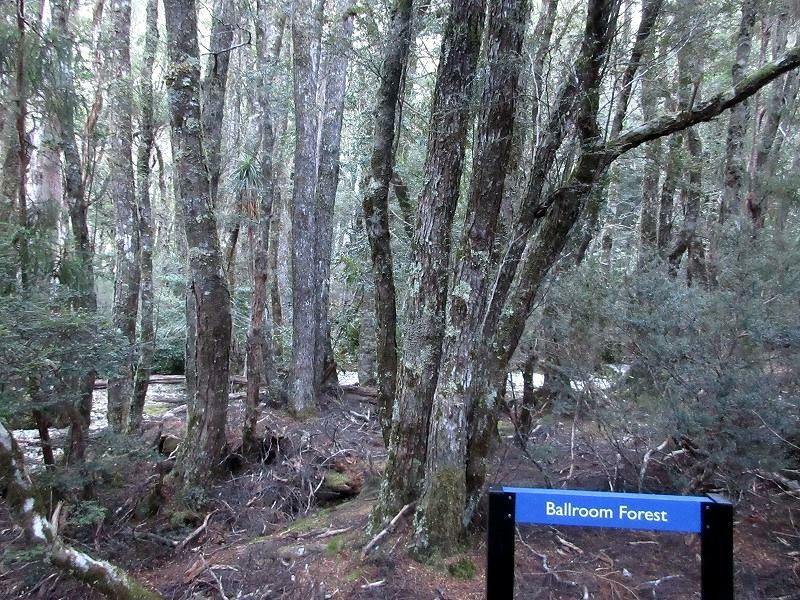 And through the Ballroom Forest, there is a rest area with a picnic table. You can approach up to the water's edge. 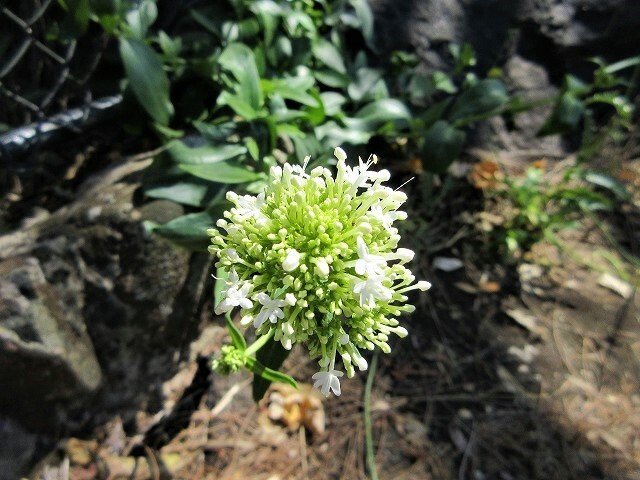 These small white flowers are abundant around the Dove Lake Circuit. Then, I got the boat shed which I dropped in morning again. From here to the parking is about 10 minutes. 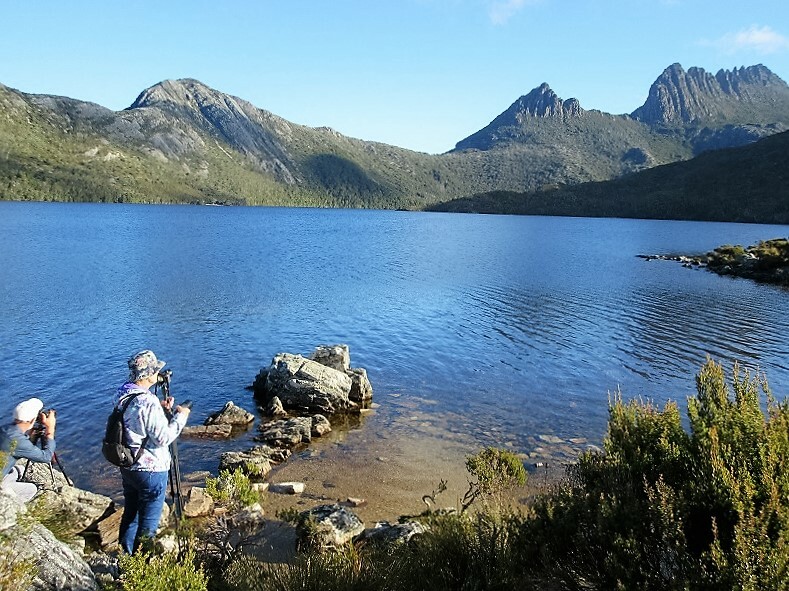 Photographers were taking pictures towards Cradle Mountain which has gotten the afternoon sun. 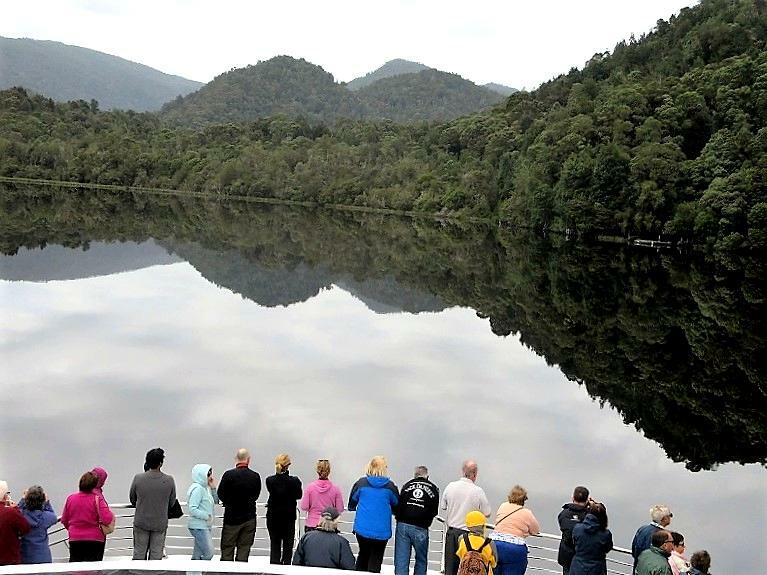 My third day in Tasmania, the primary event is a Gordon River Cruise that flows into the Macquarie Harbor in Strahan on the west coast. 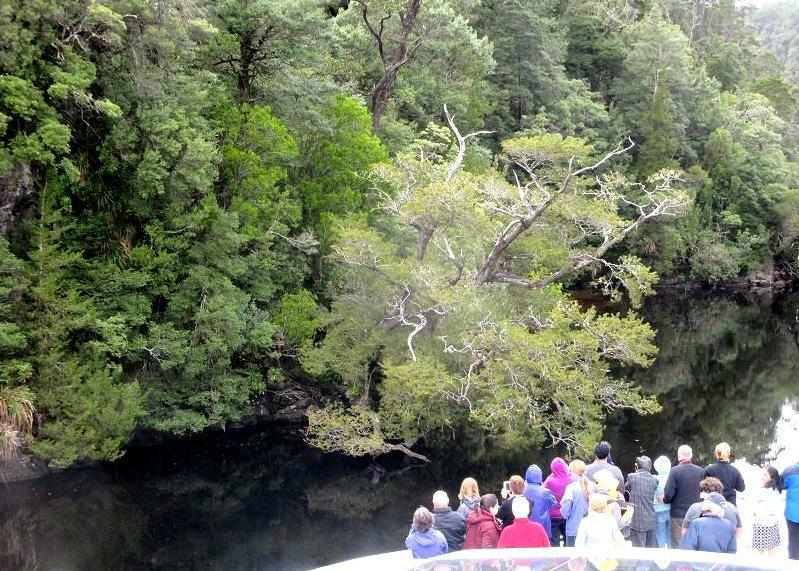 Gordon River is located in the Franklin-Gordon Wild River National Park of the World Heritage. 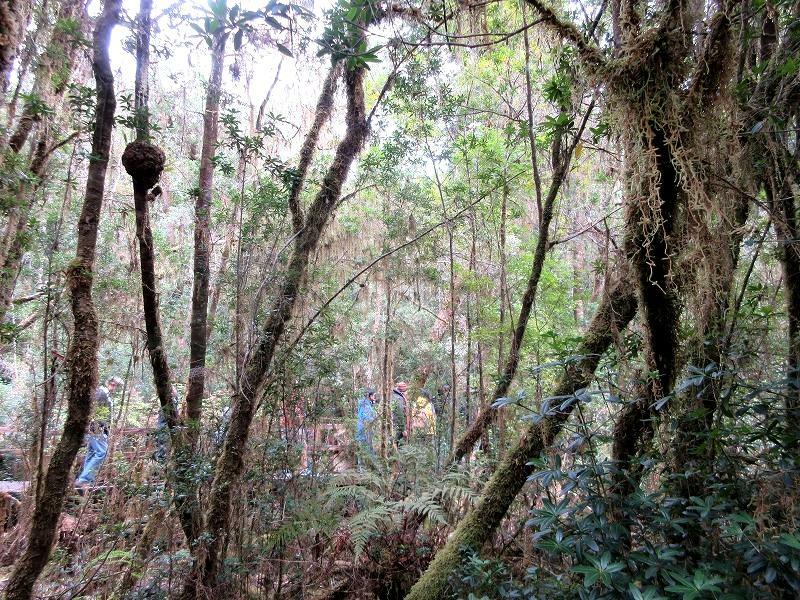 We may take a short walk in the mysterious rainforest. 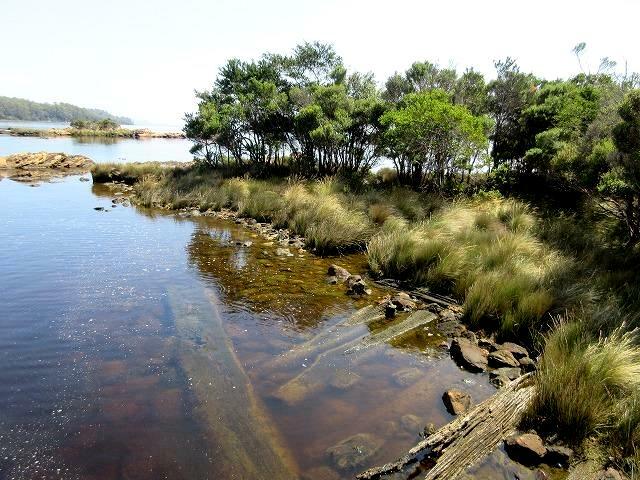 Then landing to Sarah Island that is the worst convicts settlements in Tasmania. Also, it is a good for me that big group tourists are a few in west coast. I was only one Japanese tourist who participated in this cruise. Main street of Strahan is around The Esplanade beside the pier of the cruise ship to the Gordon River. 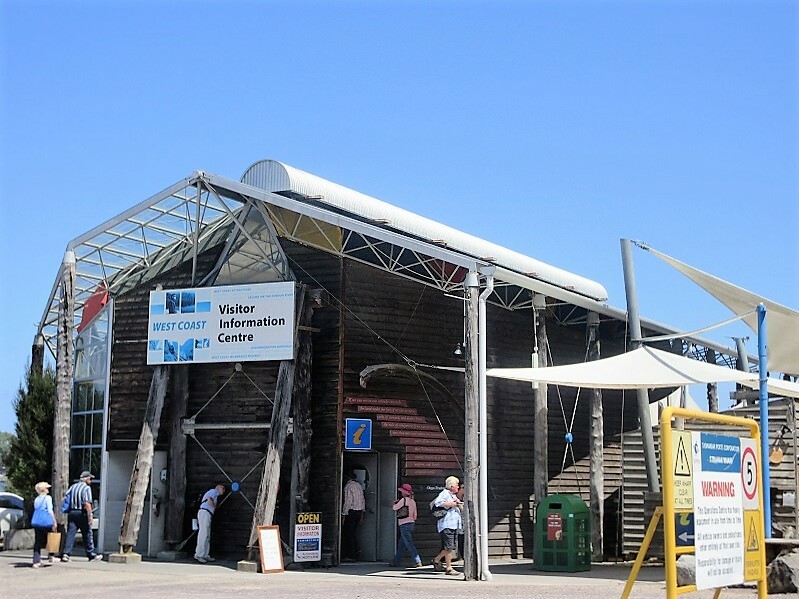 Visitor center is in the 150 meter west of the cruise office. 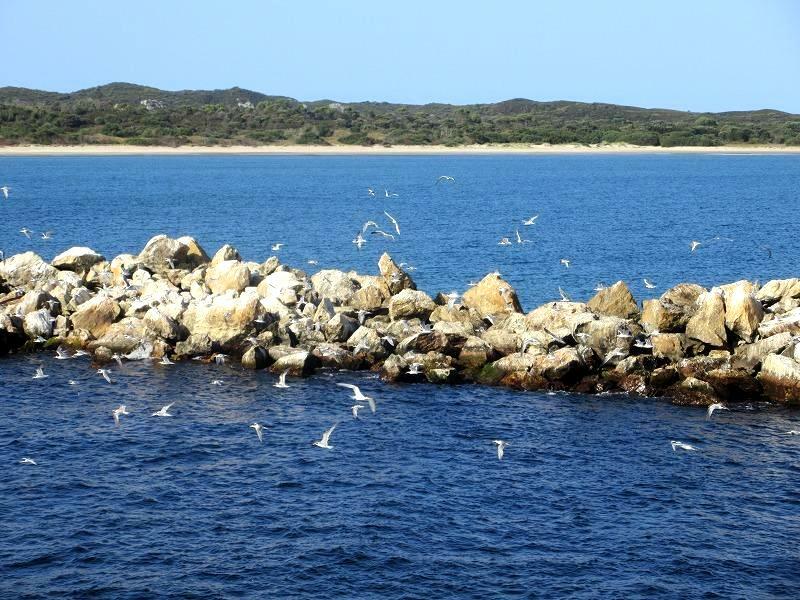 We traveled firstly to the mouth of the harbor “Hells Gate”. 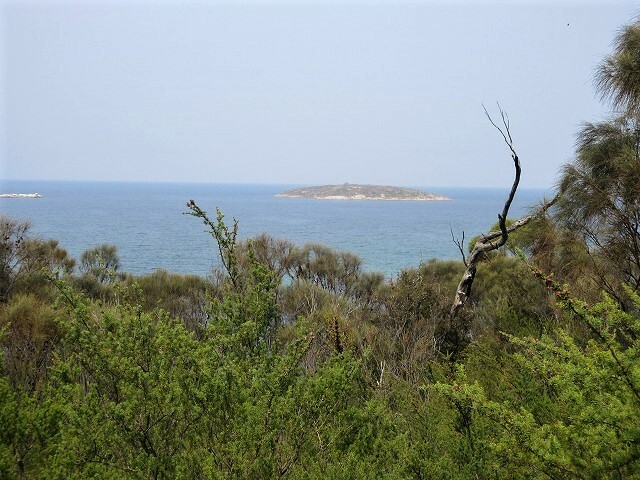 People can easy to imagine by the name of “Hells Gate” what the life of convicts who sent to the penal station on Sarah Island was considered to be hell. Contrary to the name, there is very beautiful cove. And, ahead of the lighthouse is a huge ocean that continue to the Antarctic Ocean. Macquarie Harbor is a good harbor as a fishing port, there is "Fish Farm" in this bay. So many seabirds inevitably gather. 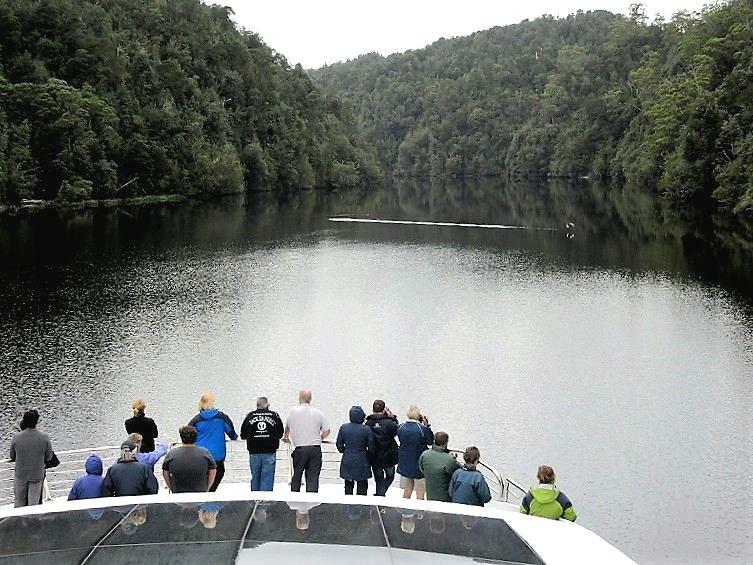 We moved past Fish Farm on the right side, and go on cruising into the Gordon River. 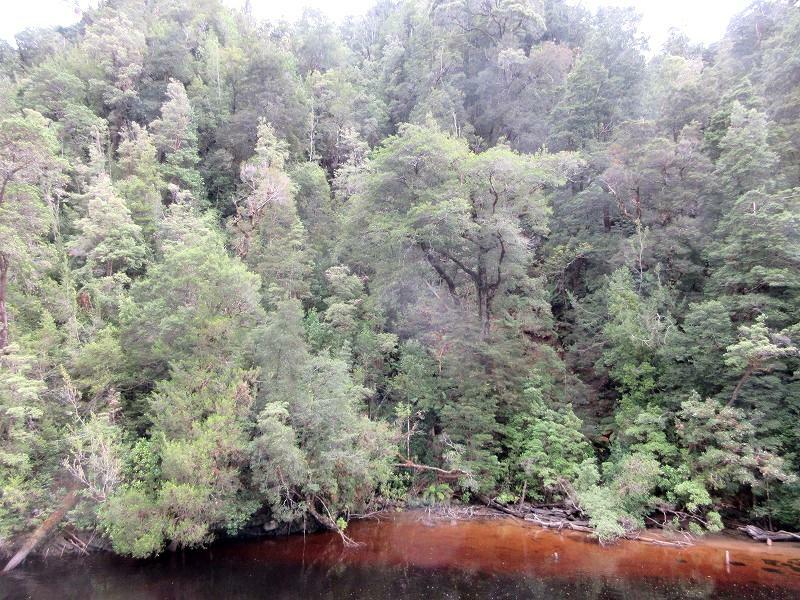 Gordon River is wide and flow of the river is very quiet. The ship goes to the upstream with reducing speed. The river becomes narrow and begins to meander like a snake. You would be feeling as you are walking on the surface of the water if you stand at the head of the deck. I recommend you that you come to the head of the deck with putting warm clothes because wind is cool! 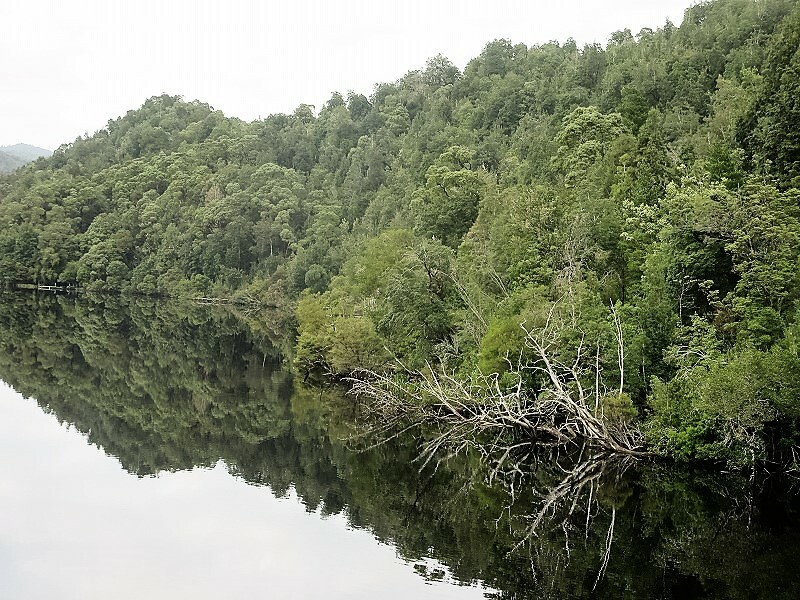 These trees reflected on the surface of the water like a mirror is really beautiful. Unfortunately, this day was cloudy, but it would be more clear image if in sunny. The riverside has become brown, because the tannic acid of "Buttongrass" in forest seeped and dyed the river such as black tea. 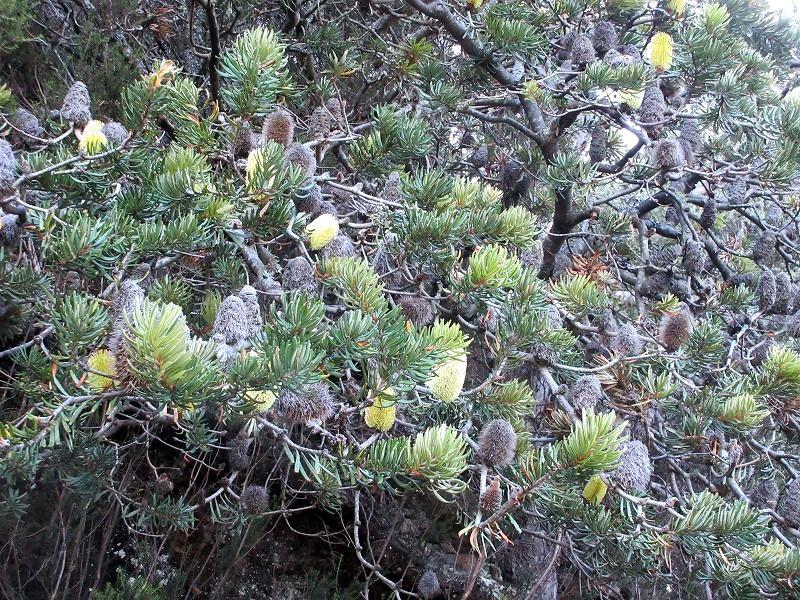 "Huon Pine” is Tasmania distinctive tree and is used for making boats, furniture and cooking utensils. 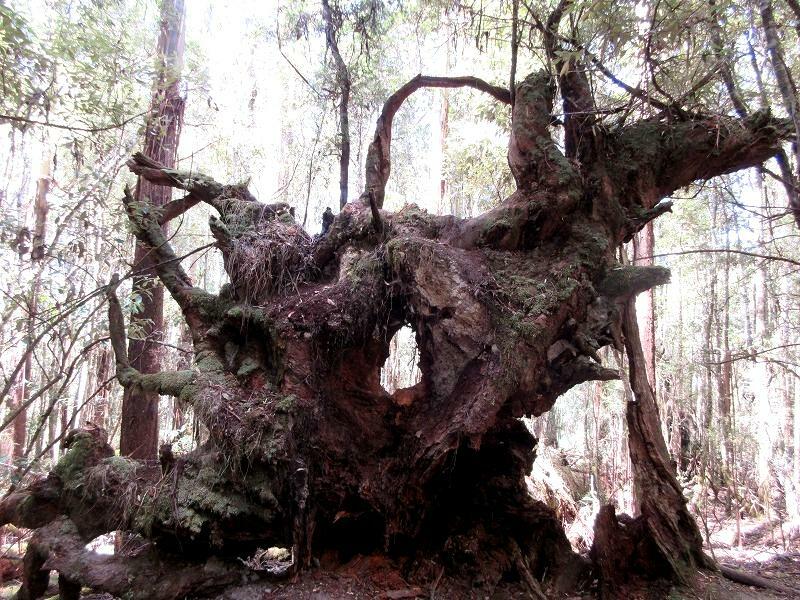 This Huon Pine is 2000 years old!!!!! Before long, the ship docked at Heritage Landing Nature Walk. 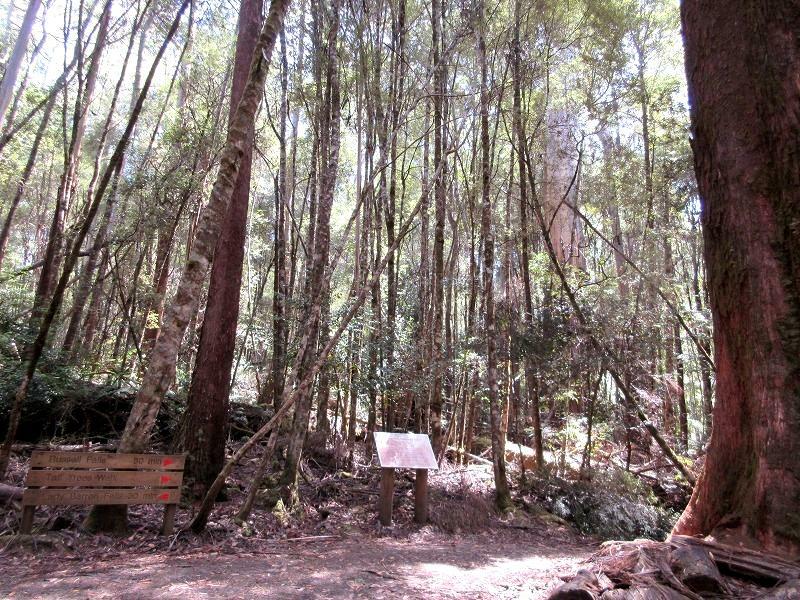 The promenade was made in order to stroll through a thick rain forest where we saw living examples of ancient Huon Pine and other trees. The promenade is just about 400-meter circuit. 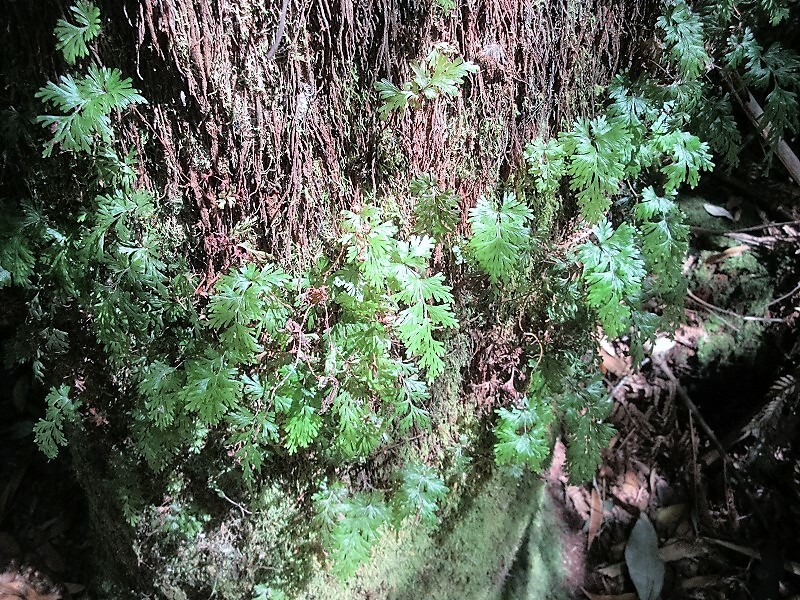 I saw a lot of mossy trees and ivies in the rain forest. After the walk at Heritage Landing Nature Walk, the ship headed to Sarah Is. 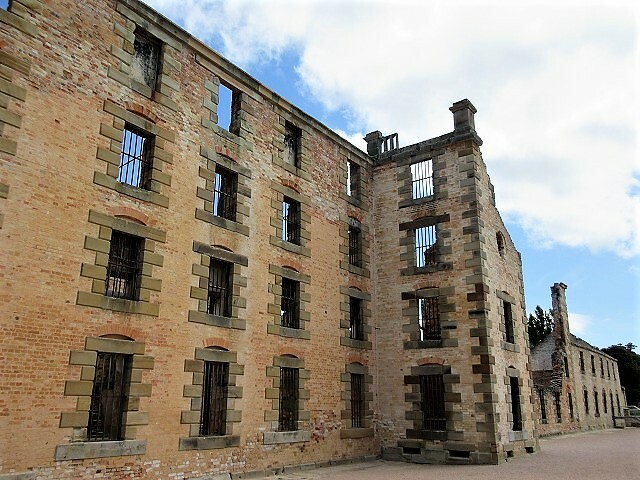 (World Heritage, one of the Australian convict historic sites). We had a lunch of buffet while the ship was cruising to the Sarah Is. And we berthed at Sarah Is. 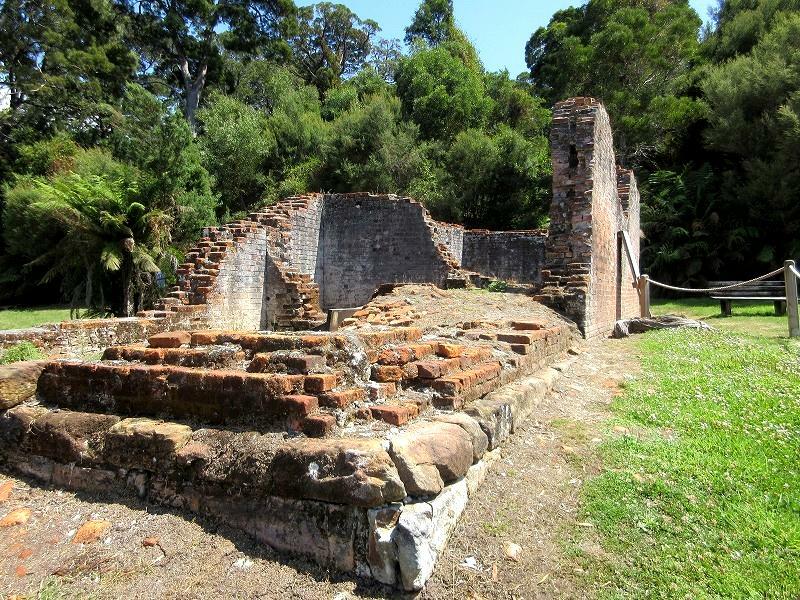 for a guided tour of the remaining ruins of the Macquarie Harbor Penal Station. 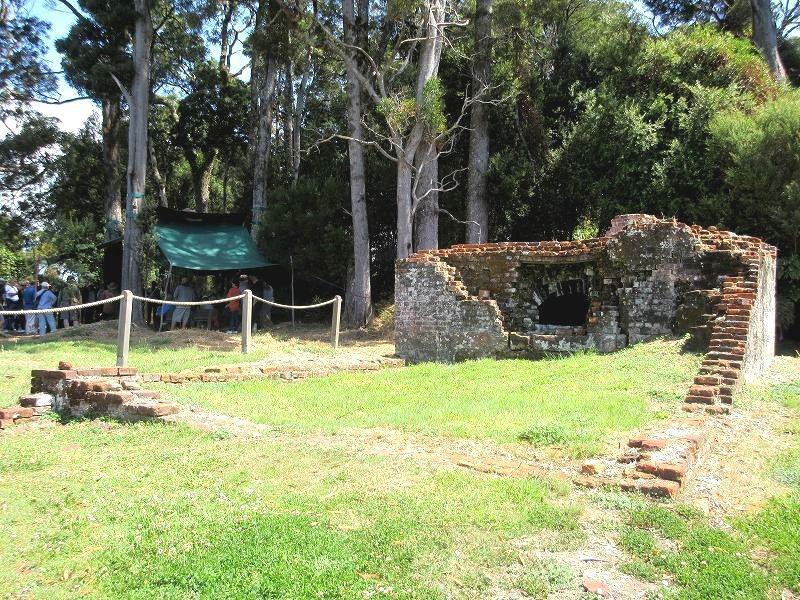 The settlement only operated for 11 years and was closed in 1833. 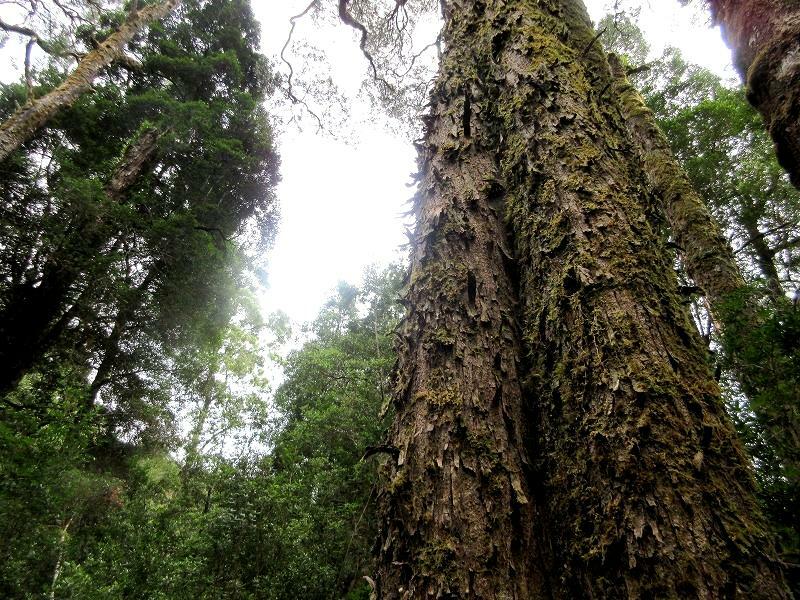 According to the guide, Huon Pine that grows in rain forest was suitable for making ship because the trees are very oily and difficult to spoil the wood. Therefore, there was the shipbuilding industry which is engaged with convicts in Serra Island. I looked at an old pier. And I believe that the ocean in the past is beautiful as same as now. 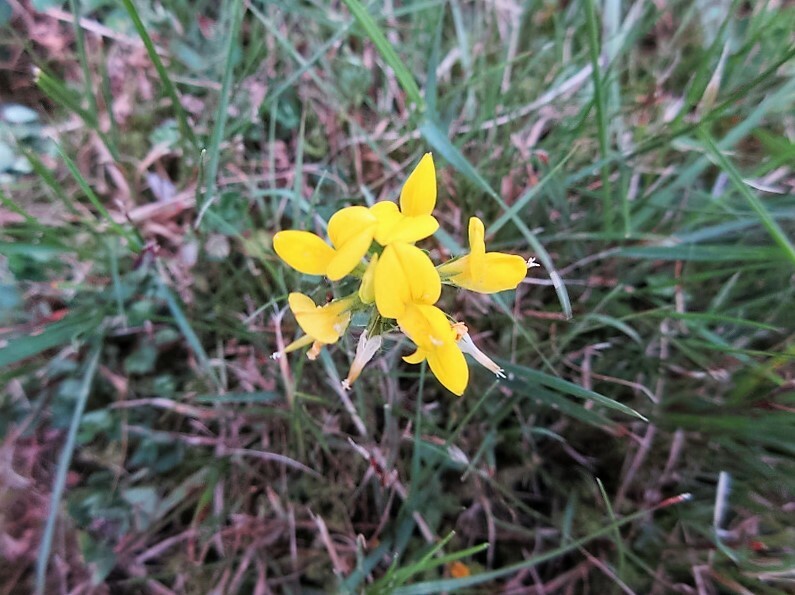 Now wild flowers in full bloom in the summer. 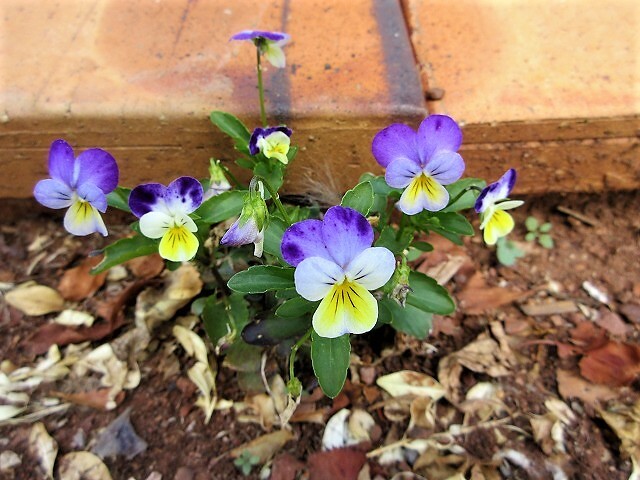 I momentary fell into thought by myself like that…Life of convicts seems to have extremely harsh, but they might be healed in flowers also. The guide led us and we checked out many of the ruins which remarkably still exist after 180 years. 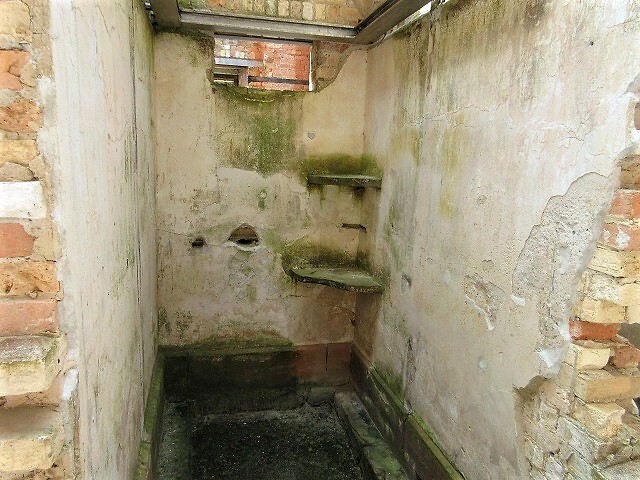 This is a ruin of solitary confinement. This is the mysterious building which stood facing the sea. 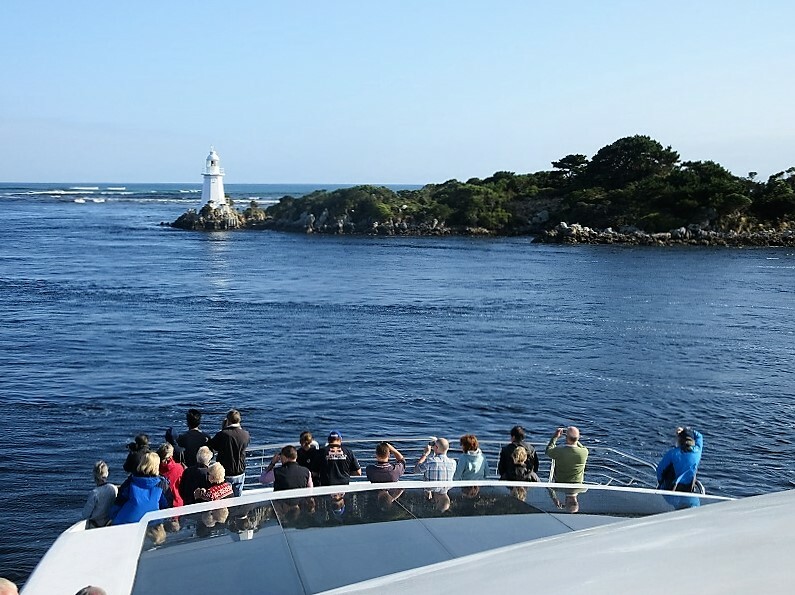 This cruise was a very interesting and enjoyable outing. It gave me a valuable experience to see the area that can be approach only by ship. 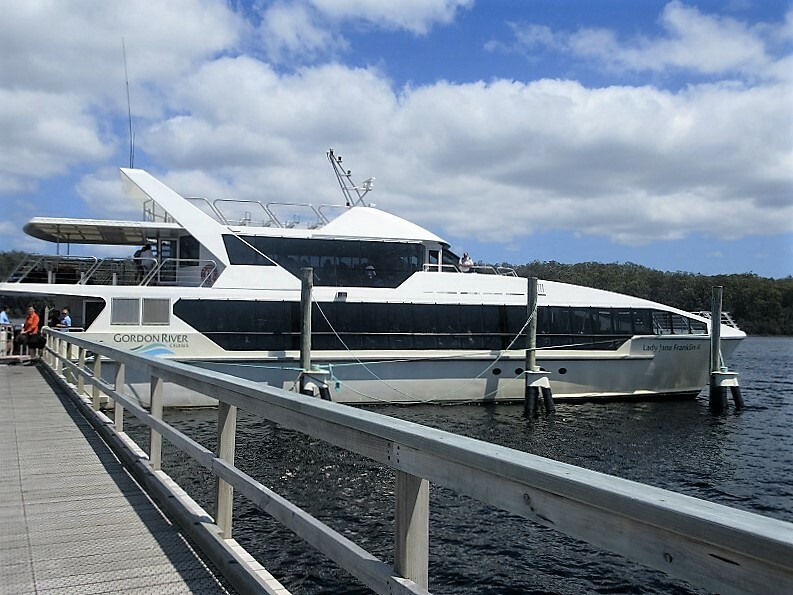 I recommend what you make reservation for the Gordon River Cruise, because it is different to departure time depending on the course. 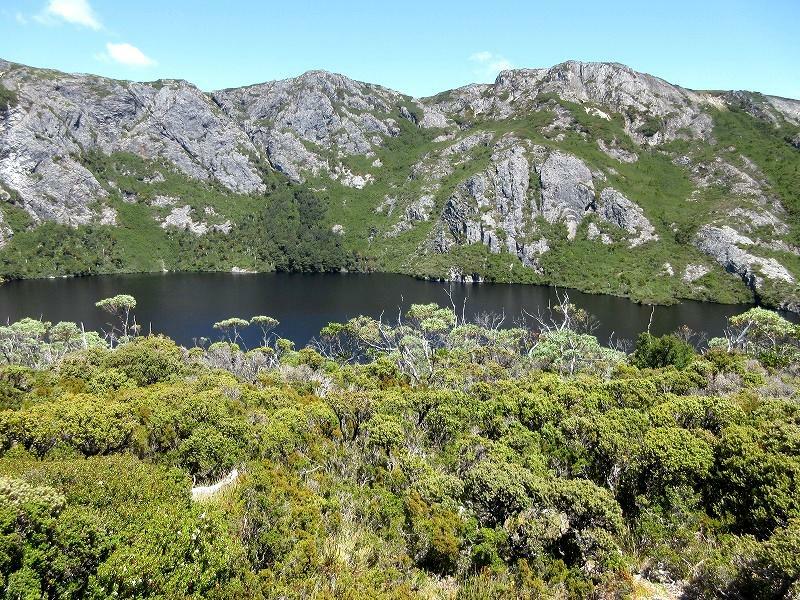 After the Gordon River cruise, I headed up to the Cradle Mountain-Lake St Clair National Park, where the national park is the primary destination of my trip. 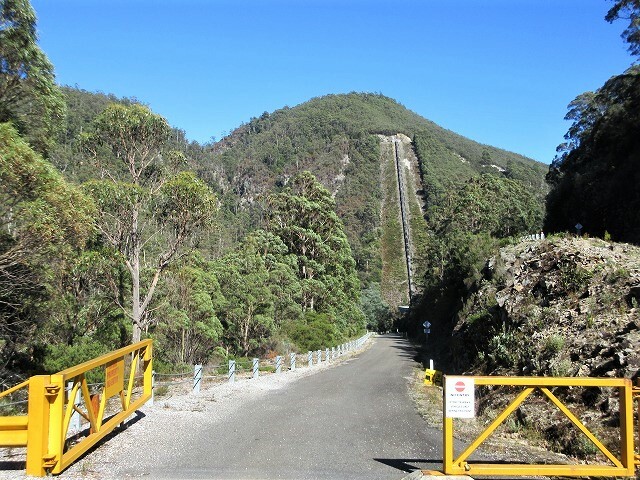 The way joins the High Way A10 via Zeehan, which is famous for mine town. 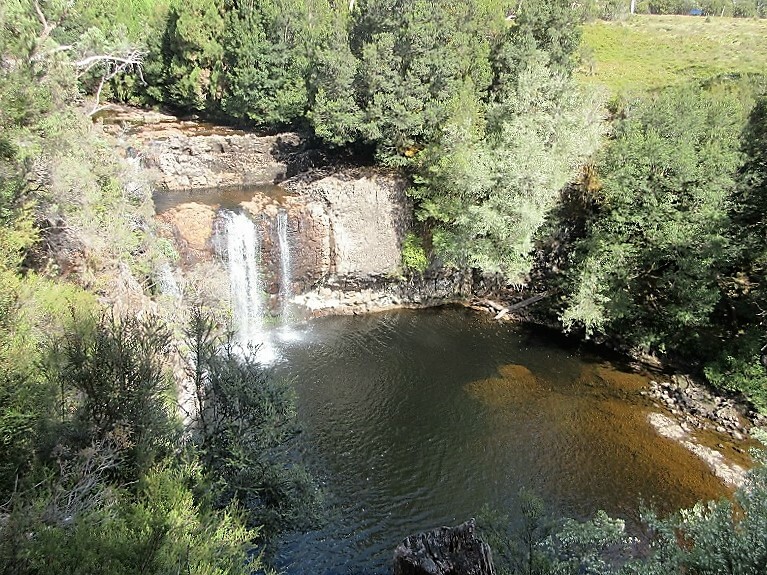 I dropped by "Stitt River Falls" in Zeehan. 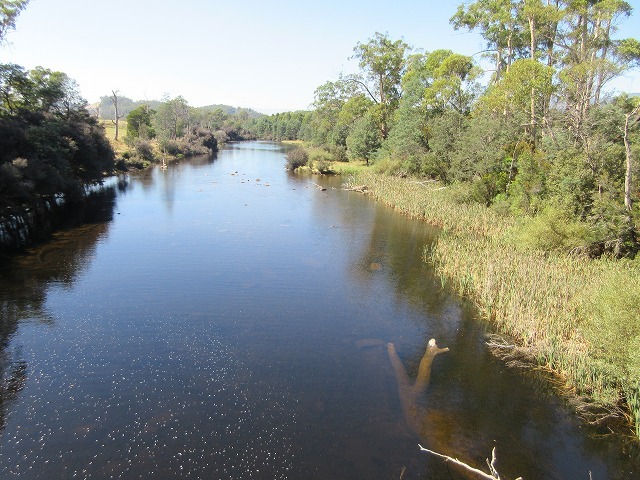 There is a view point of the Stitt River where if you walk about 100m along Stitt River to downstream though under the old bridge from the parking. 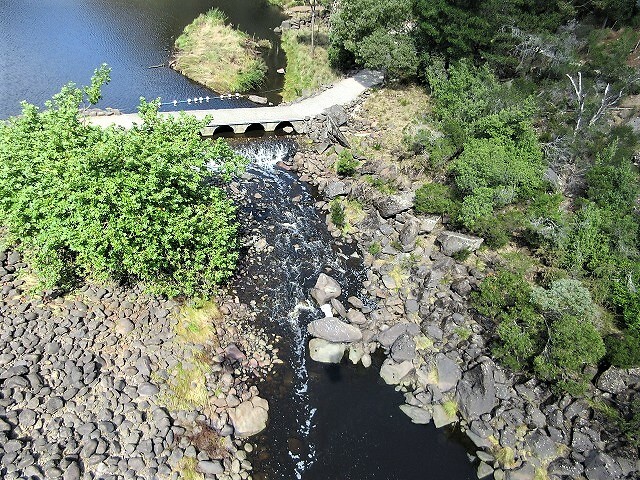 Stitt River Falls has two stages. 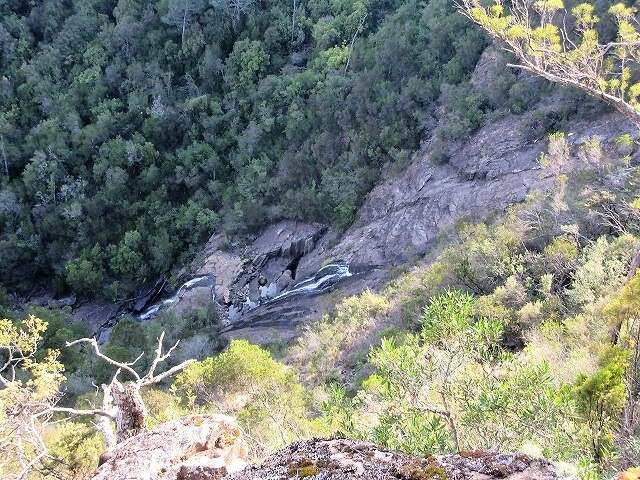 But, unfortunately the bottom of the waterfall is not seen well from the view point. 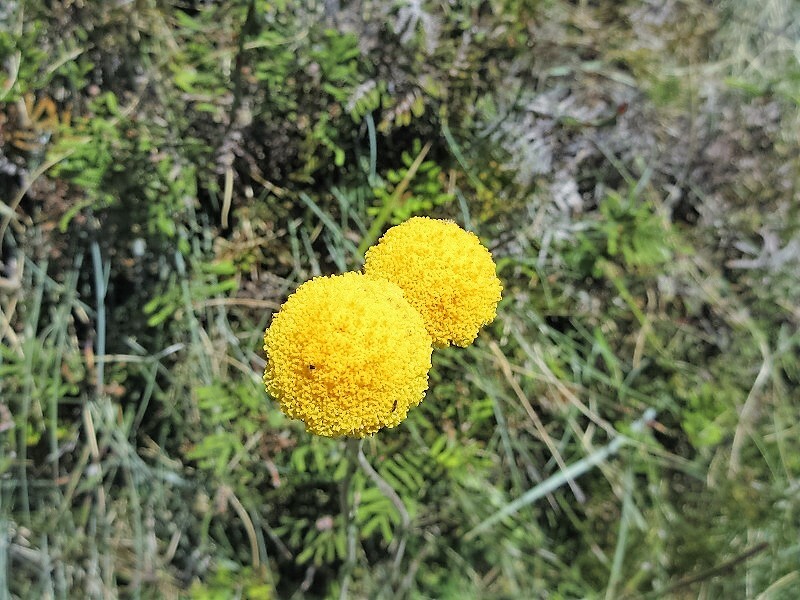 It was lucky that a lot of wildflowers vicinity of the Stitt River Falls were in bloom then. 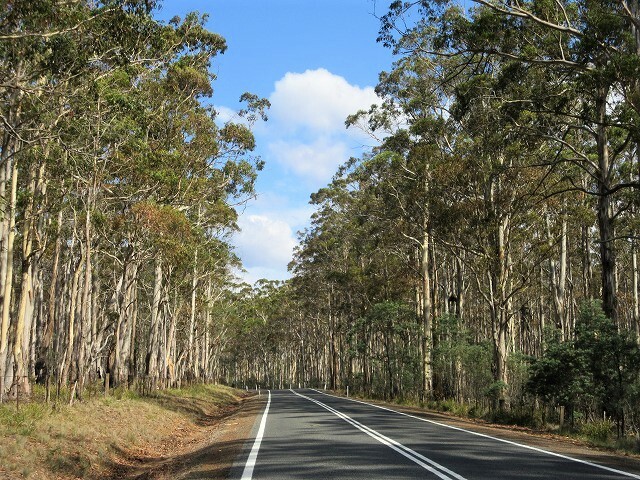 After passing through the Zeehan, I joined to the A10. Then I drove through in mountains. A rocky mountain came into view. Go through the Rosebery, and across the Lake Rosebery. And then, after driving about 20km to the north, turn right and into the C132. 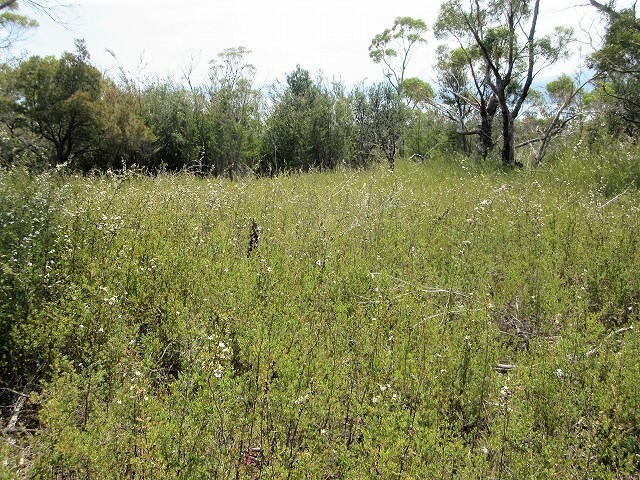 Then after driving about 20km on the C132, the nature conservation area called "Vale of Belvoir" appeared. 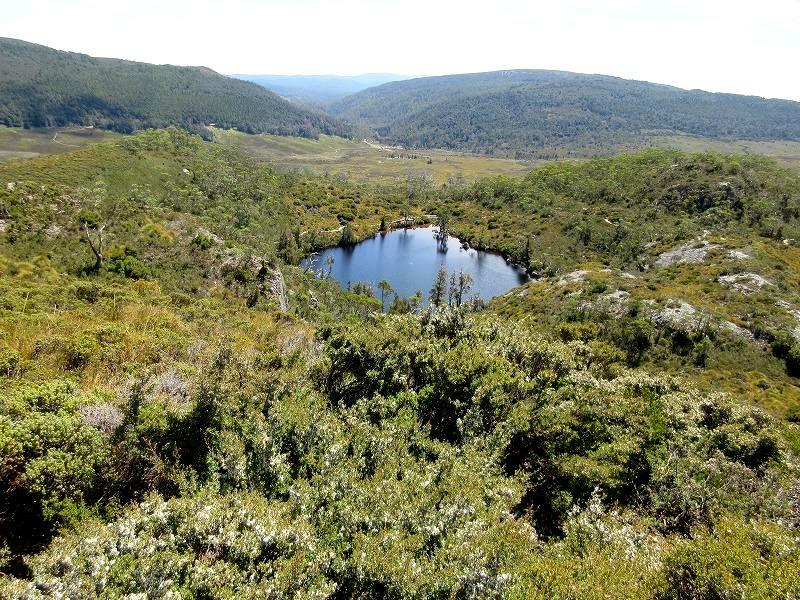 The Vale of Belvoir is located 15km north-northwest of Cradle Mountain. 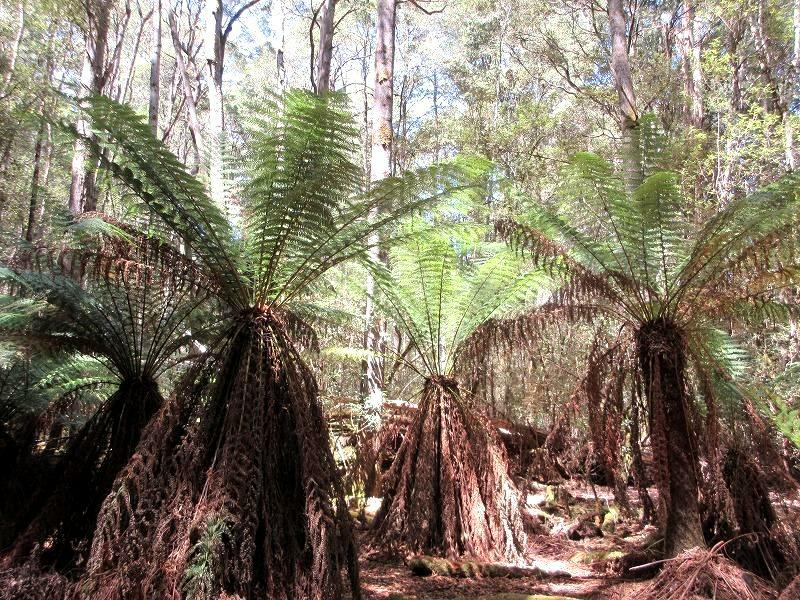 It is a large open limestone valley, about 10km long and 2km wide, flanked by ancient rainforests. 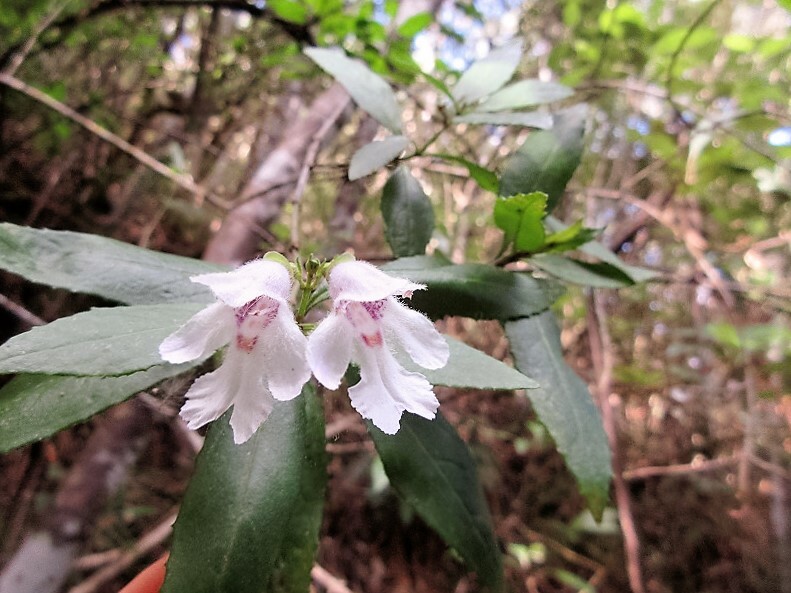 Such beautiful flowers bloomed in wetlands. 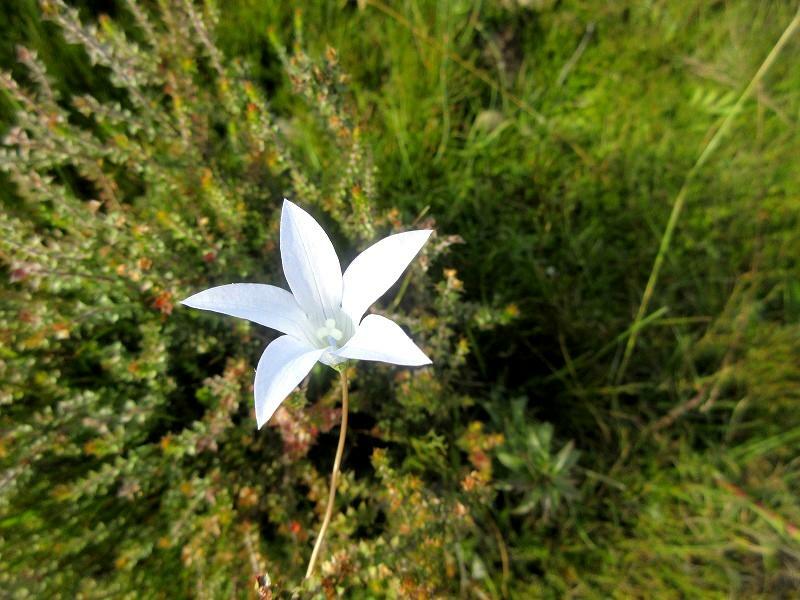 It looks like a white star. 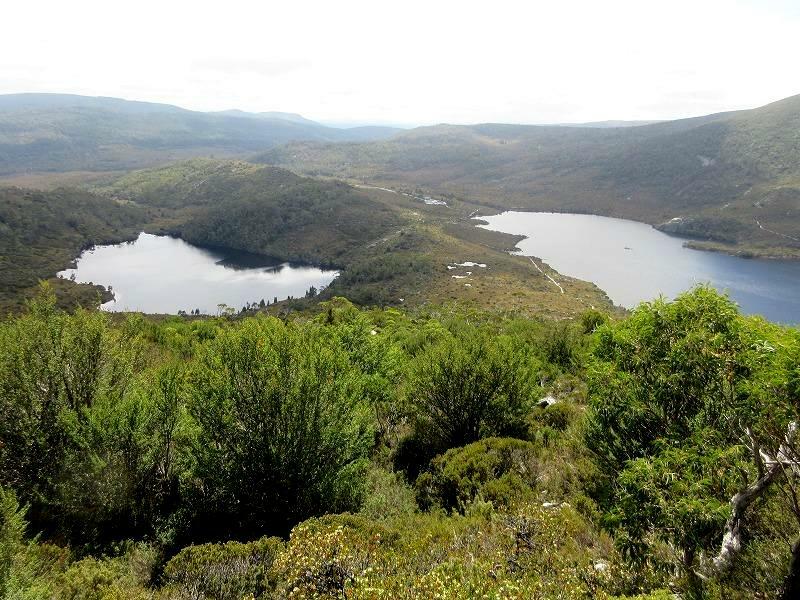 And go further to the east from the Vale of Belvoir, C132 is going into to the Cradle Mountain-Lake St Clair NP turn 90 degrees to the right (to the south). 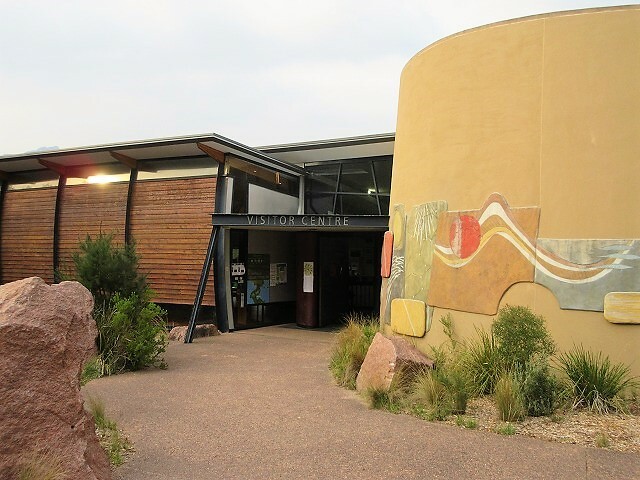 After driving to the south about 10km, get to the visitor center with a large parking on the left. 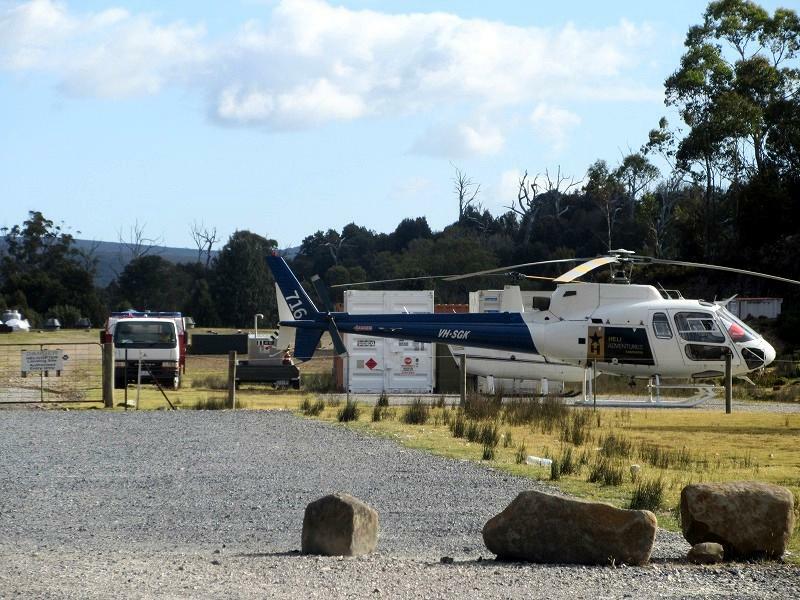 Wow, a AStar helicopter parked on-site! 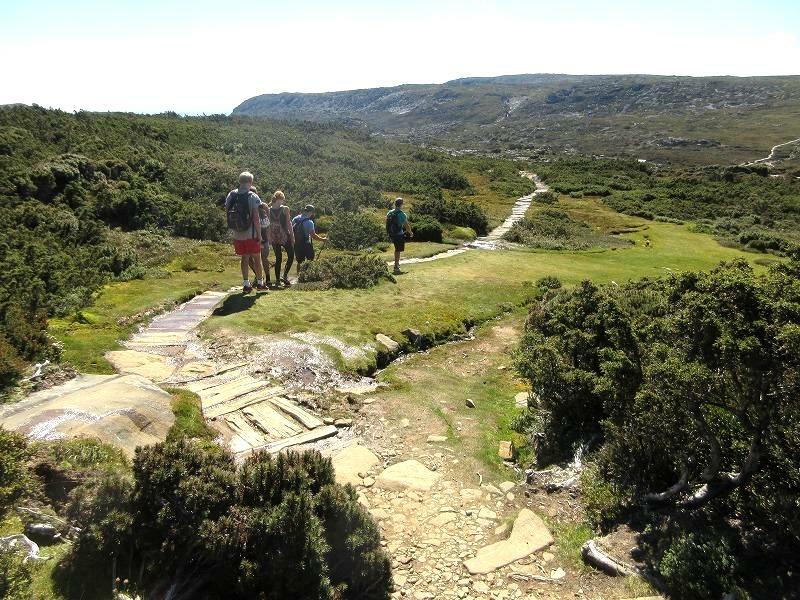 You get the information of the hiking trails in the visitor center. Also, you can get a free shuttle bus ticket for buses around the park when you presented holiday pass or the National Park admission ticket. Let’s get it! The National Park has been allowed admission by your car, nevertheless you are forced using these buses in case of crowded weekend by the private car restrictions. 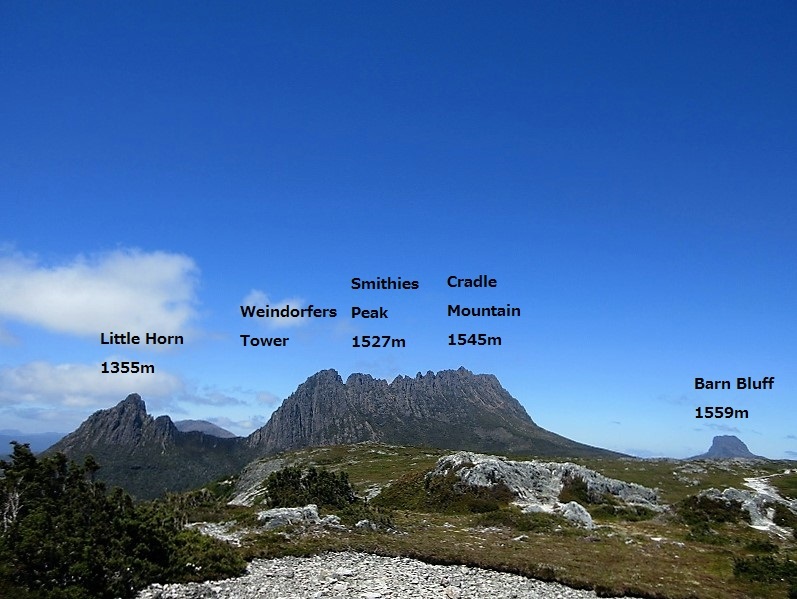 Tomorrow I climb on Cradle Mountain. 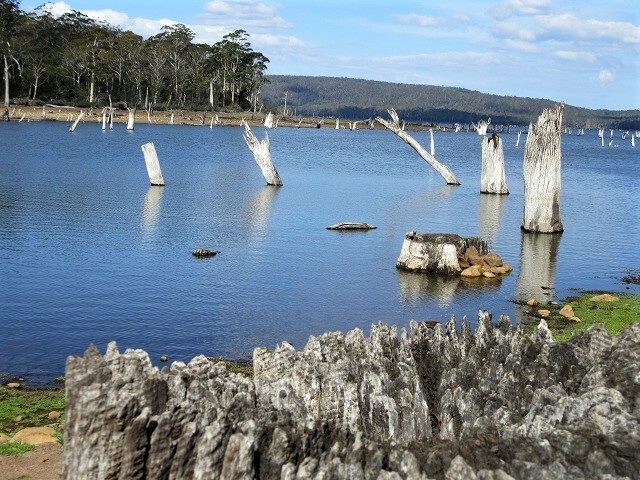 My Tasmanian travel is going around Tasmania from the Hobart in the clockwise by rent-a-car. 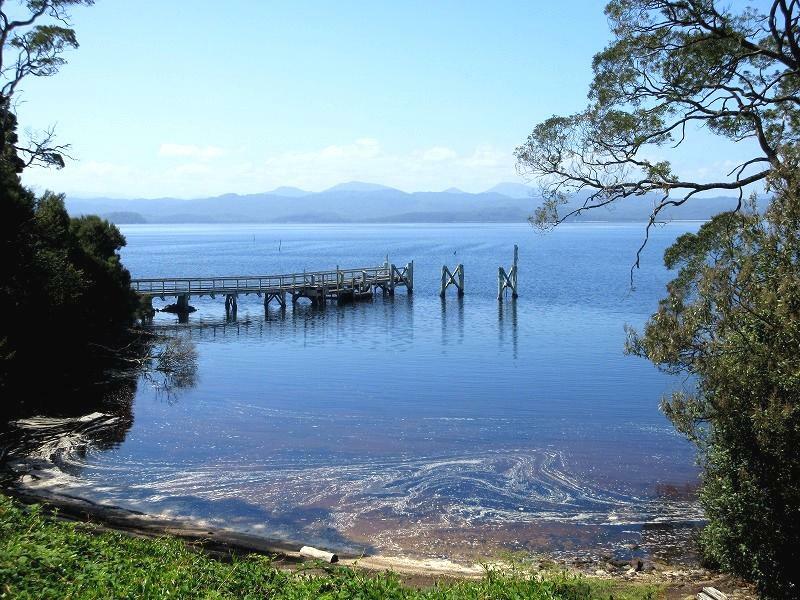 My second day in Tasmania, I moved a total distance about 350km from Hobart to Strahan in the west coast. It was the longest drive in this my trip. 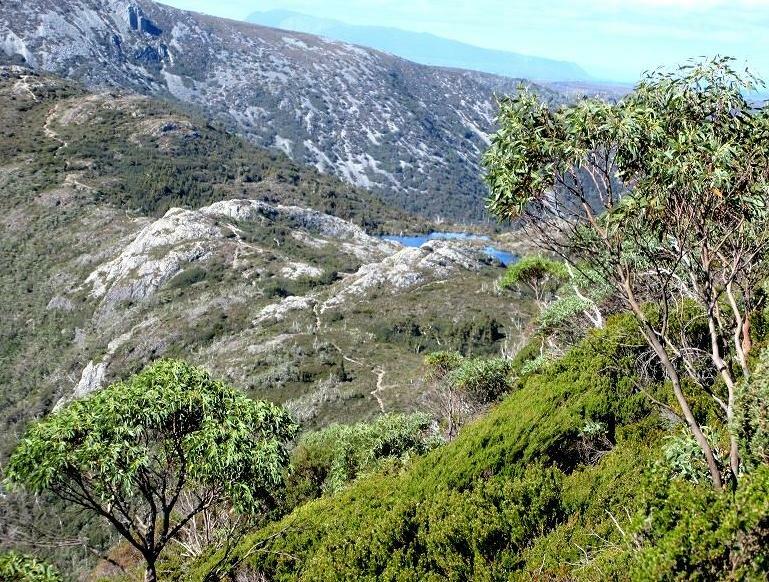 First of all, I dropped in the Mount Field National Park, which is about 80km away from Hobart. 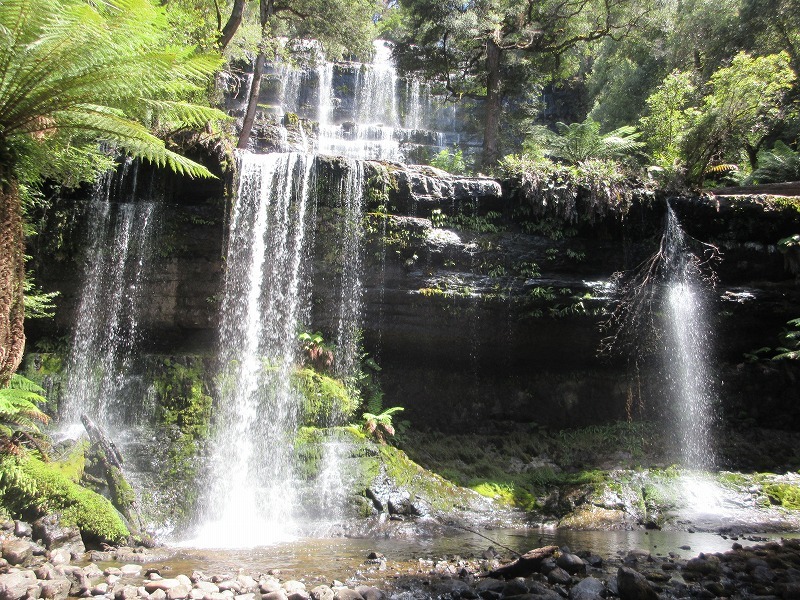 And I did a short hike such as to tour the 3 waterfalls including Russell Falls. 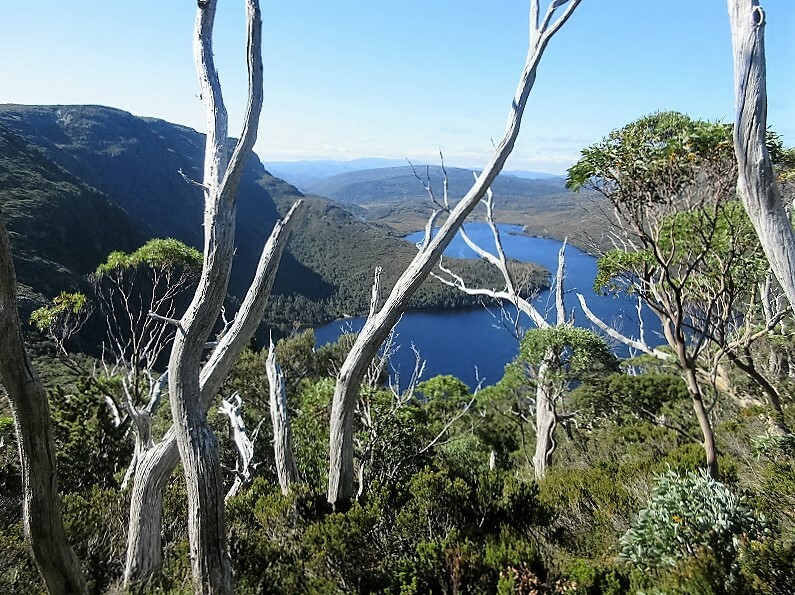 Mount Field National Park is just over 1 hour’s drive from Hobart via New Norfolk. 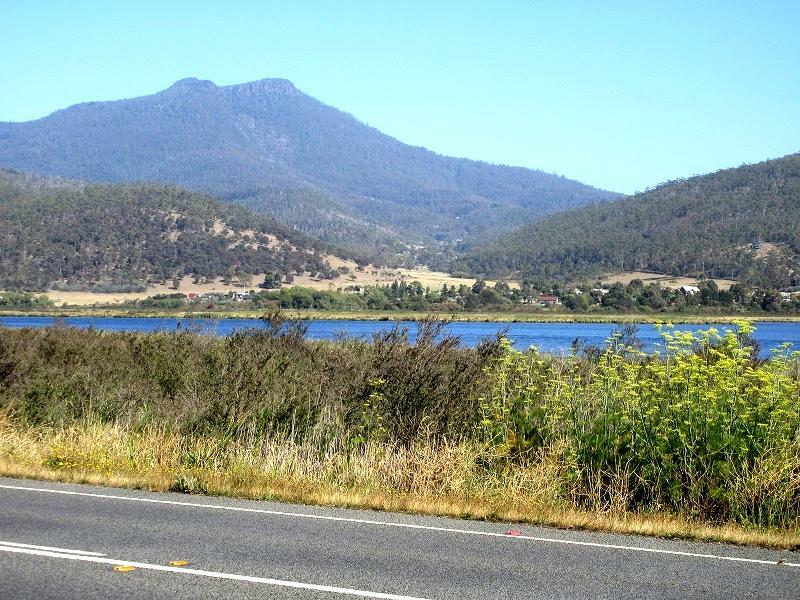 From Hobart, take the Booker Highway (A10) north-west to New Norfolk. 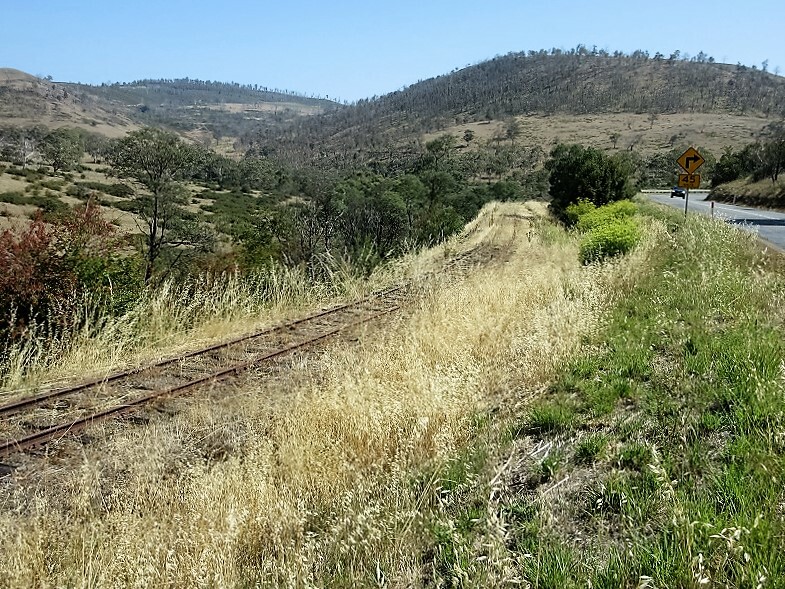 After New Norfolk I followed the B62 on left side of the Derwent River until I reach Westerway. 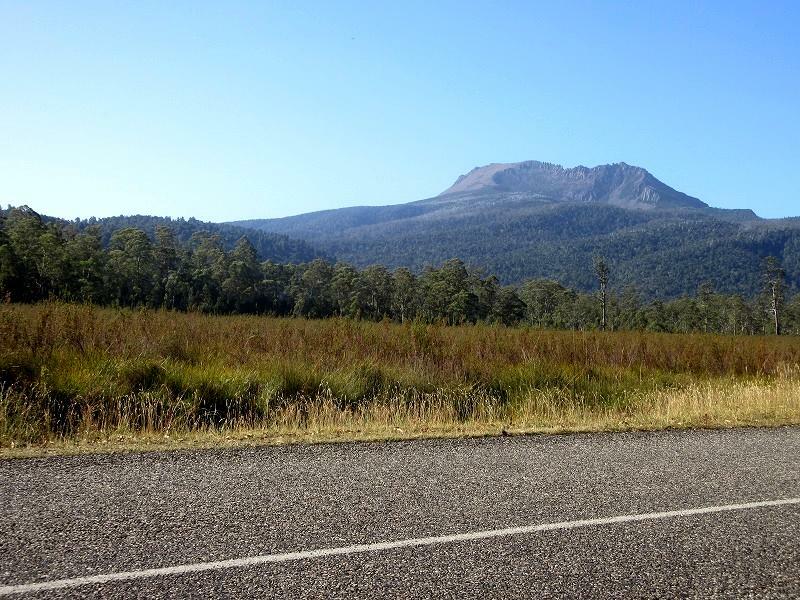 From there it is short drive on a winding road B61 to the National Park, and the clearly marked entrance to Mount Field NP. 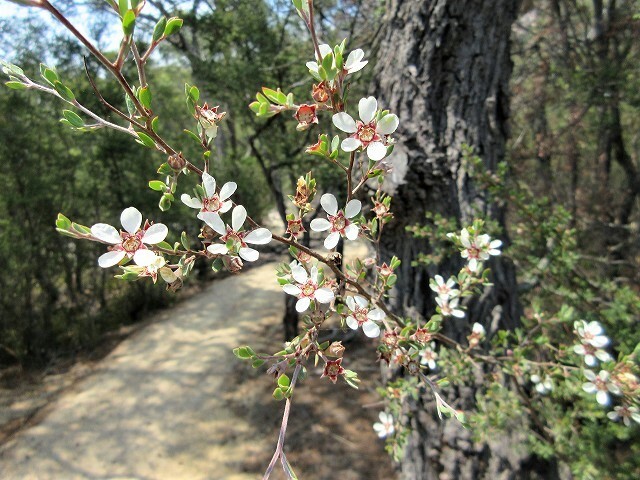 On the way, a lot of flowers bloom beside the roadway, and I found plentiful blackberries. 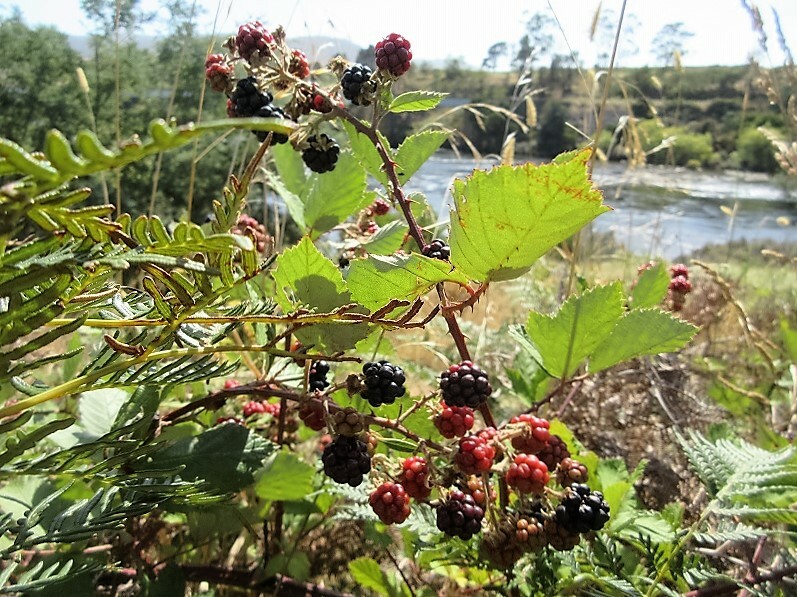 I was able to pick quickly these blackberries one cup during break time of the drive. Old train line remains along the roadway. 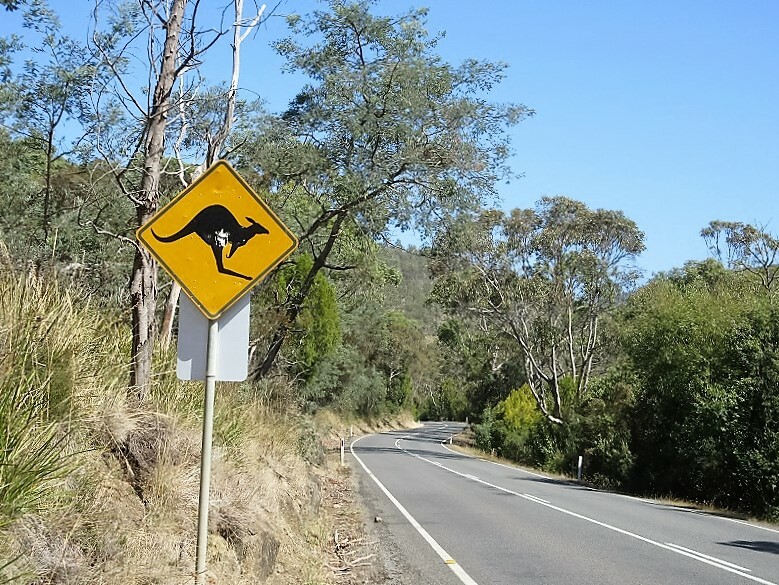 This type of sign is often seen in outback regions where a lot of animals can be roaming on the roads. 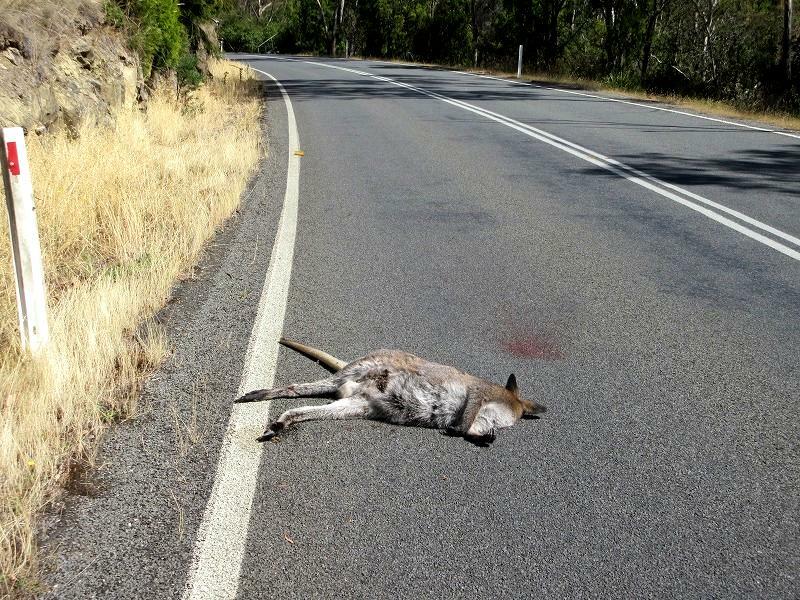 Actually, I saw about 30 crushed animals such as wallabies (small kangaroos) in the drive of the day. 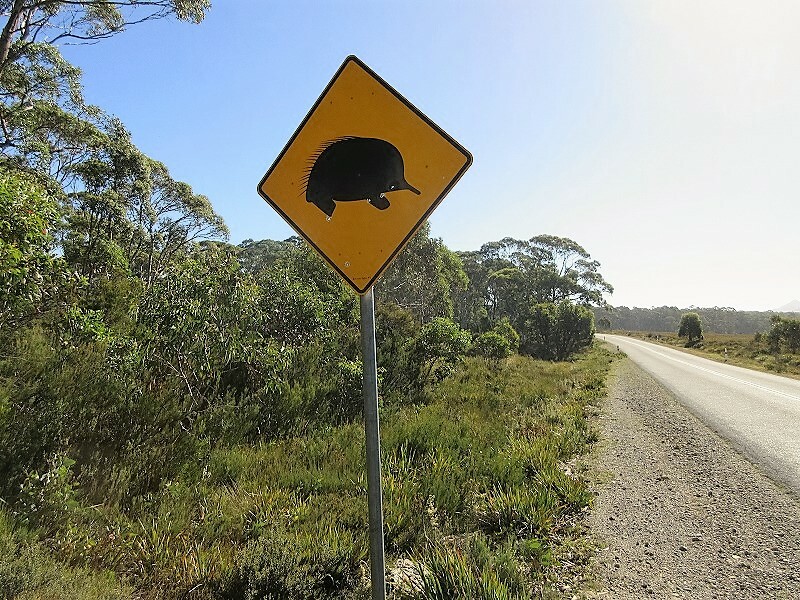 If you are going to drive over there, you’ll need to be aware of the animals that you’ll encounter on the road, especially in a night drive. 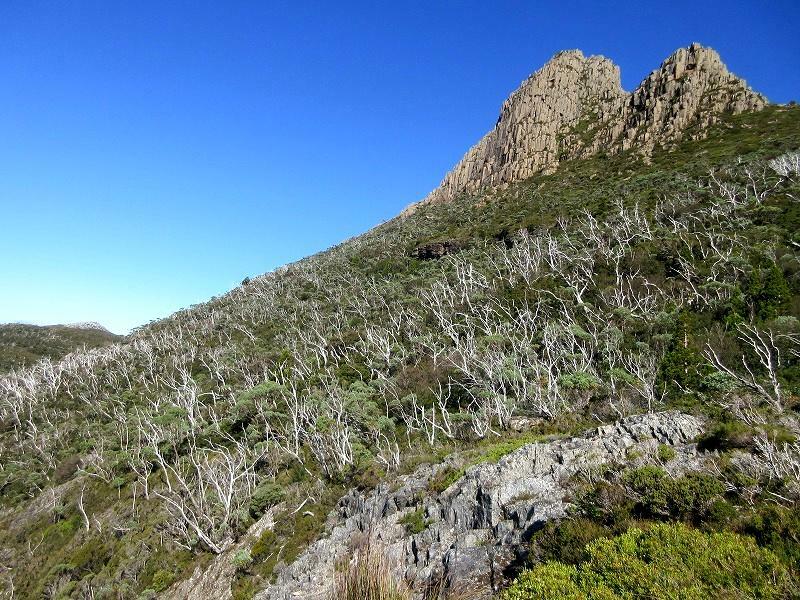 Mount Field NP is the oldest national park in Tasmania. The distance normally takes in one hour non-stop drive. 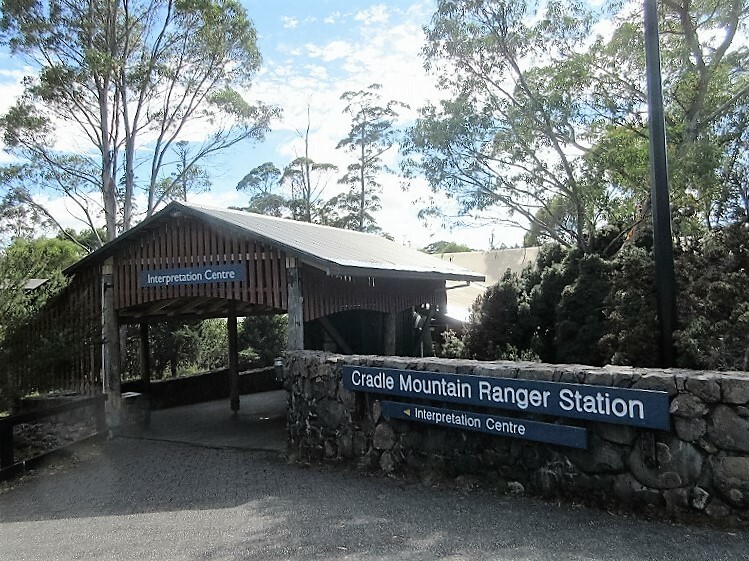 Nonetheless, I arrived at the visitor center of the Mount Field NP in two-hour drive. 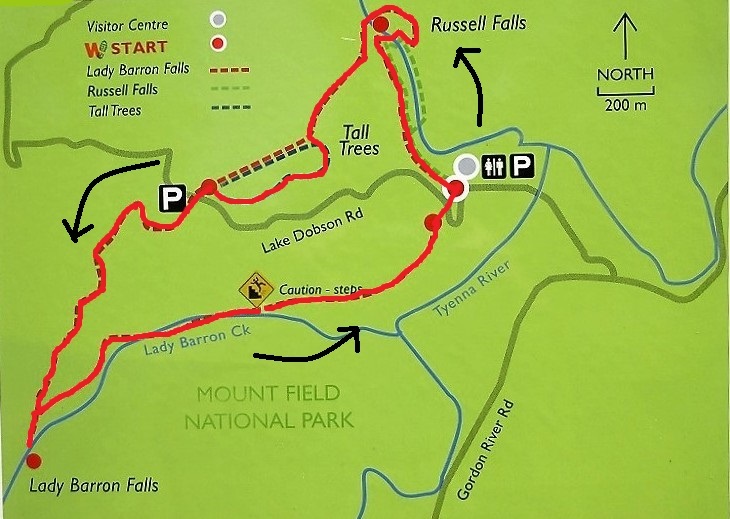 I got a free trail map from visitor center, and started the hike of 2.5 hours course which is included highlight spot such as Russell Falls, Horseshoe Falls, Tall Trees Walk and Lady Barron Falls. 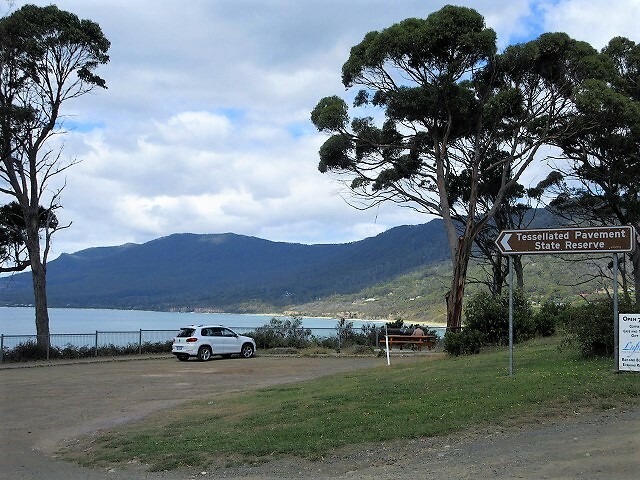 For additional information, if you want to park in the national park, you do not forget that you display the National Park holiday path or admission ticket on the dashboard of your car. 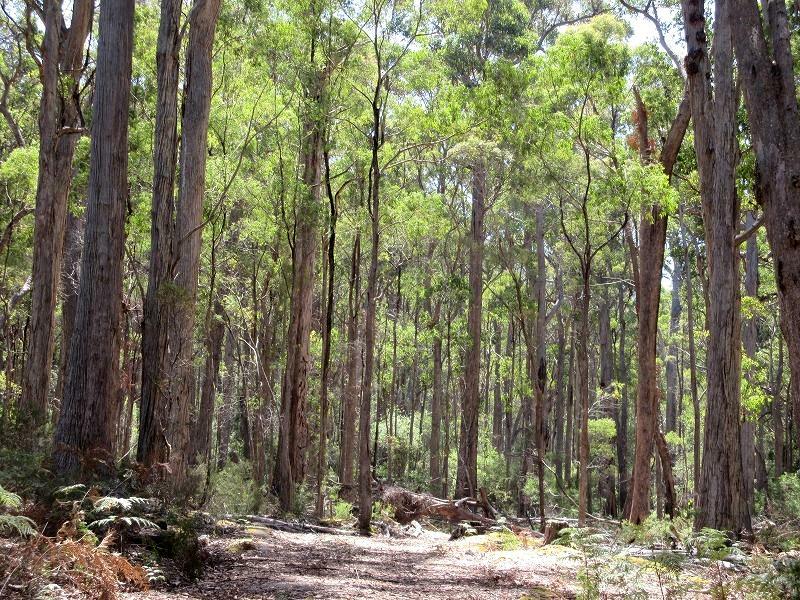 I entered from the back door of the visitor center to the trail going to the Russell Falls, and went across the beautiful back yard forest of the Gum Tree (eucalyptus). 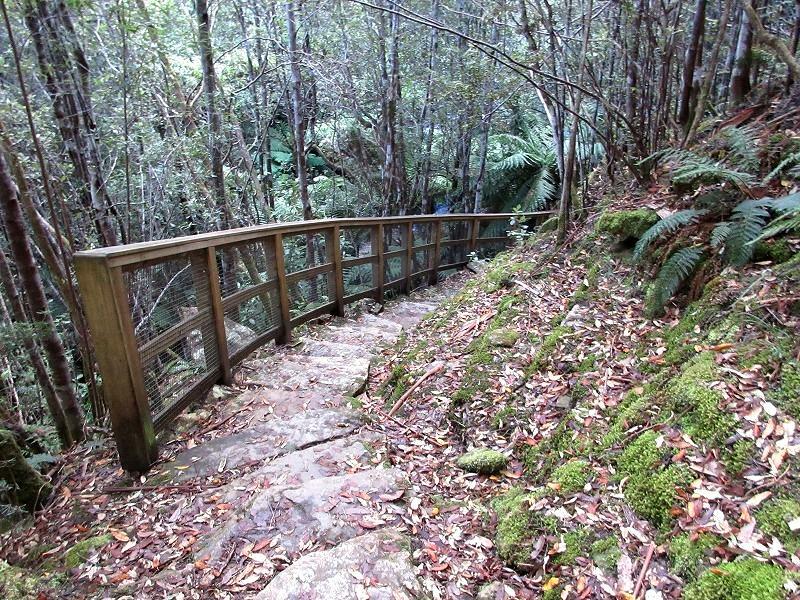 The trail is suitable for wheelchairs and baby carriage until to the Russell Falls. Wow! That looks like a Jurassic Park! 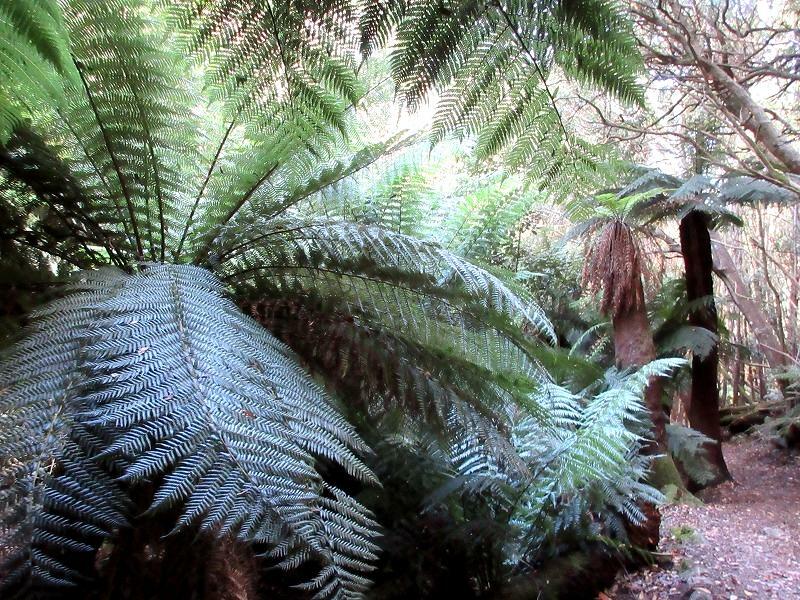 According to explanatory board, these ferns in right picture are called “Kangaroo Fern” because some fronds are shaped like a kangaroo’s footprint. I reached at the beautiful Russell Falls for 15 minute from Visitor Center. 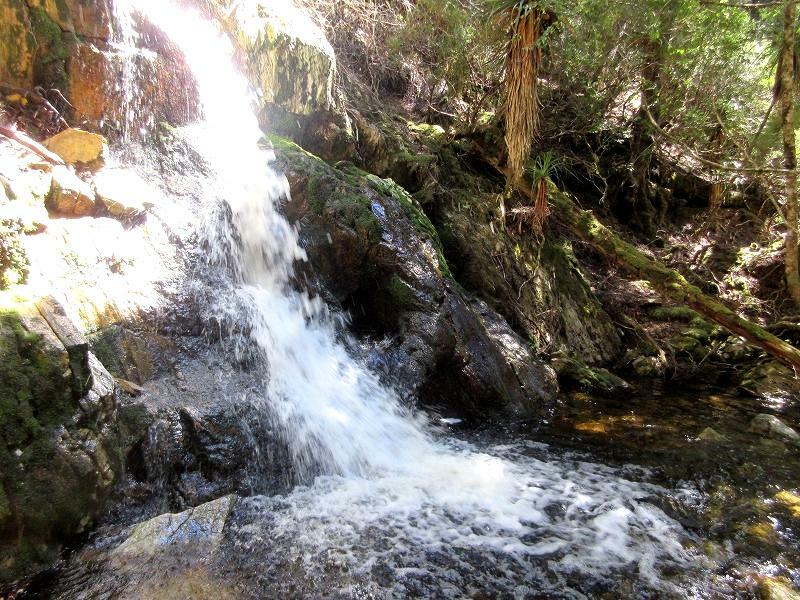 As everyone knows, this three-tier waterfall is the prettiest in Tasmania. I went to the right from the platform of Russell Falls and climbed the trail, and then reached the outfall of the waterfall. 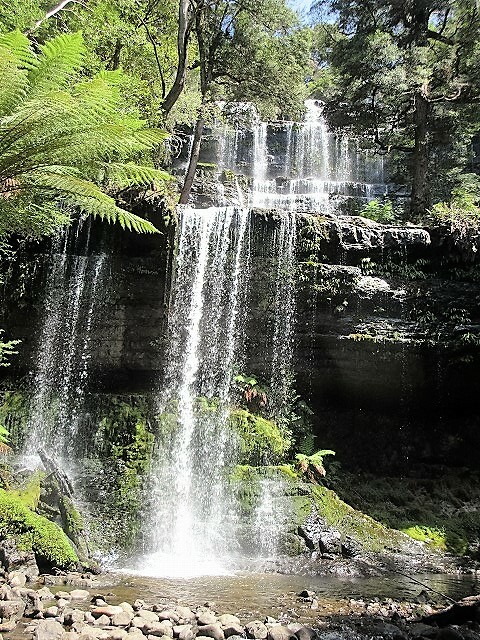 Horseshoe Falls is a waterfall that is located in the just upstream of the Russell Falls. That why you can be get to soon Horseshoe Falls if you walk along the creek. 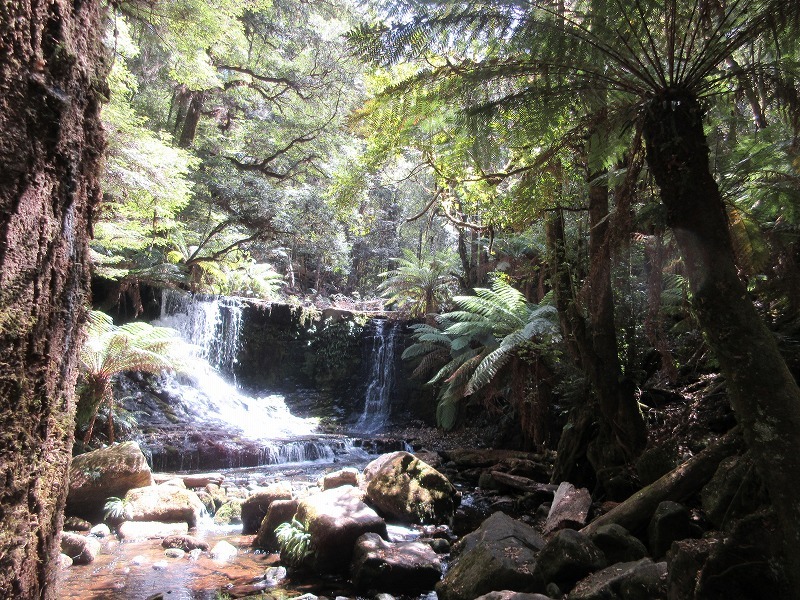 Horseshoe Falls were glittering brightly by the sunlight in the dim forest. 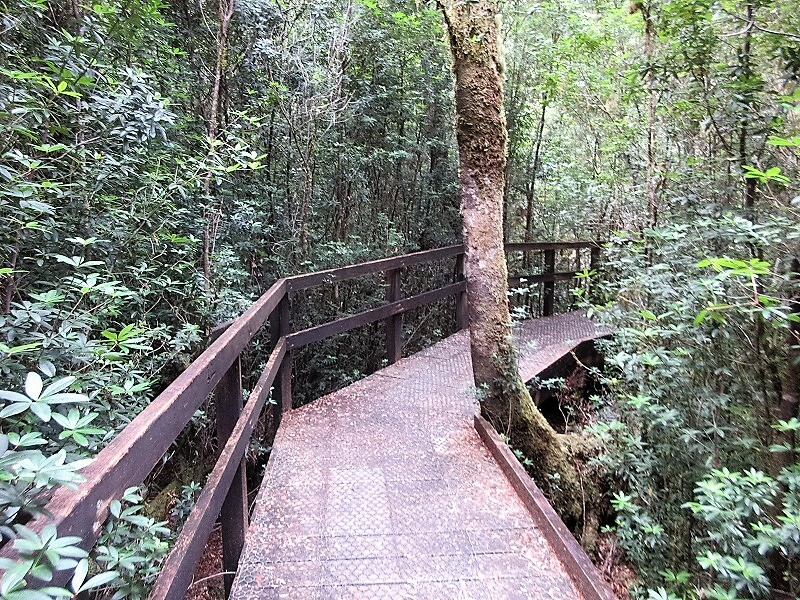 I crossed the bridge which is over the downstream of the Horseshoe Falls, and then went into the forest of Swamp Gum that seems to be 50m tall. 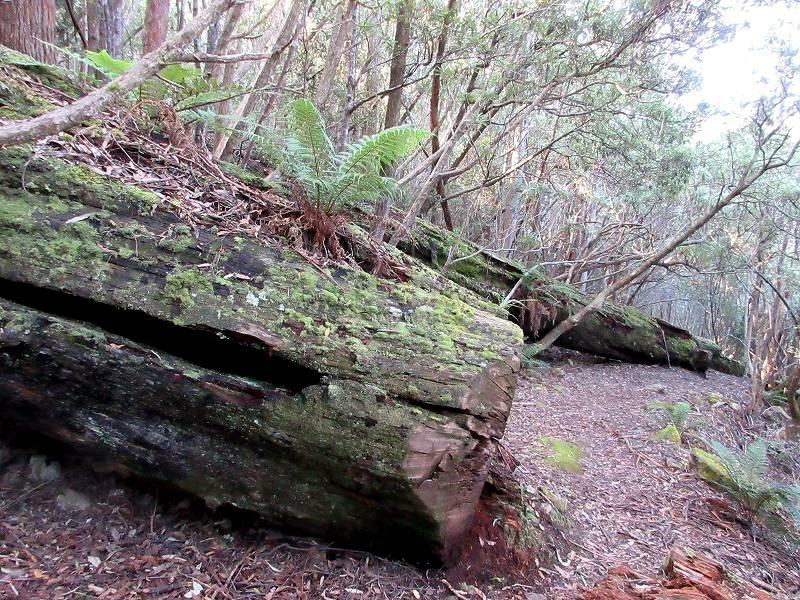 There are huge fallen tree’s roots here and there in the forest. That seems like an art creating by the nature. 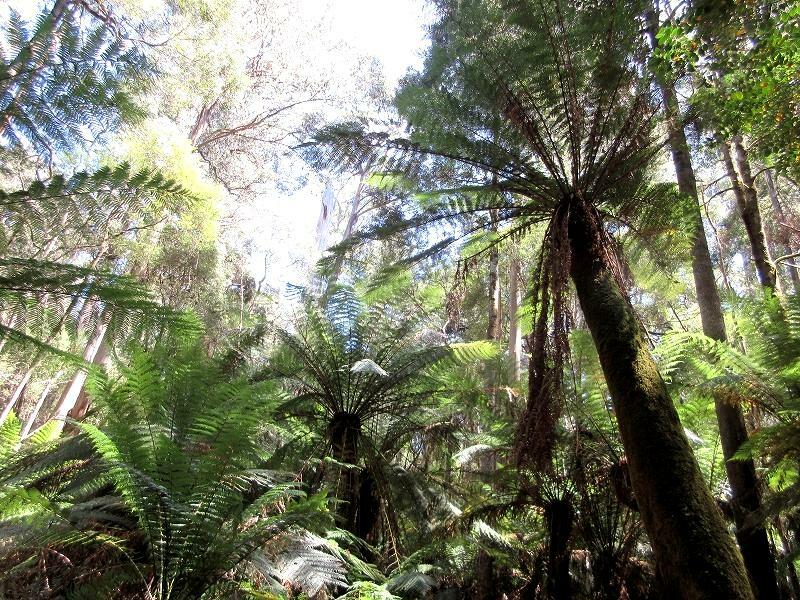 Once in the Tall Trees Walk, not only Swamp Gum, Tree Fern is also taller. 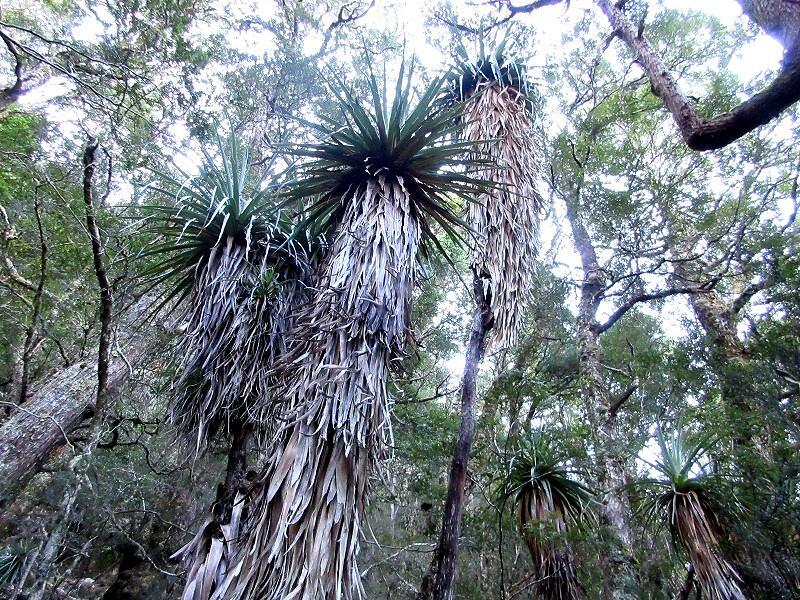 I realized that these trees are ancient plant in the period of the dinosaurs. 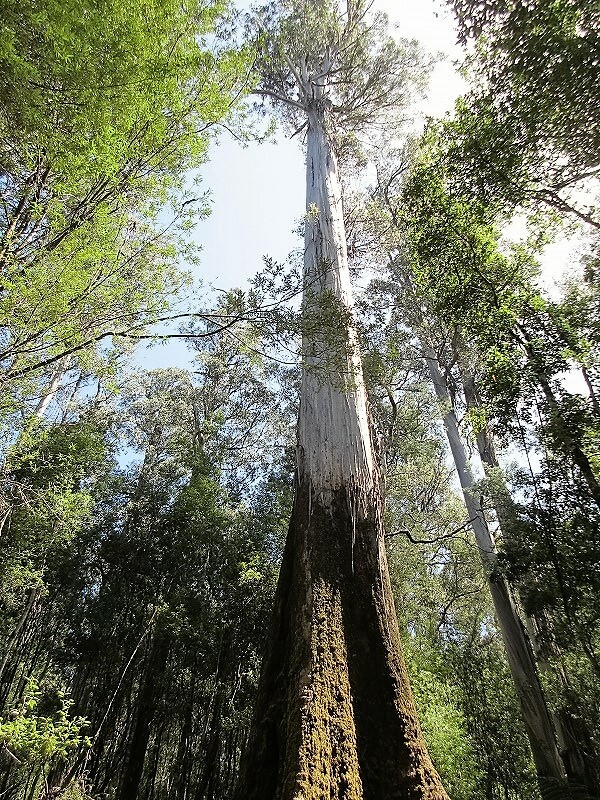 The highlight on Tall Trees Walk is the Swamp Gum that features the world’s tallest flowering plants. Height 98m! I found an interesting on the explanatory board. 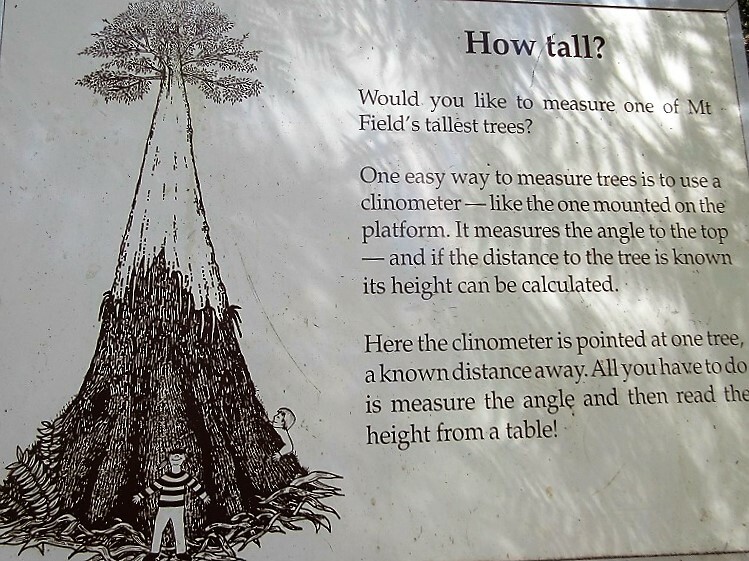 That is measuring the height of trees at an angle to the top of tree using a thing called "Clinometer". 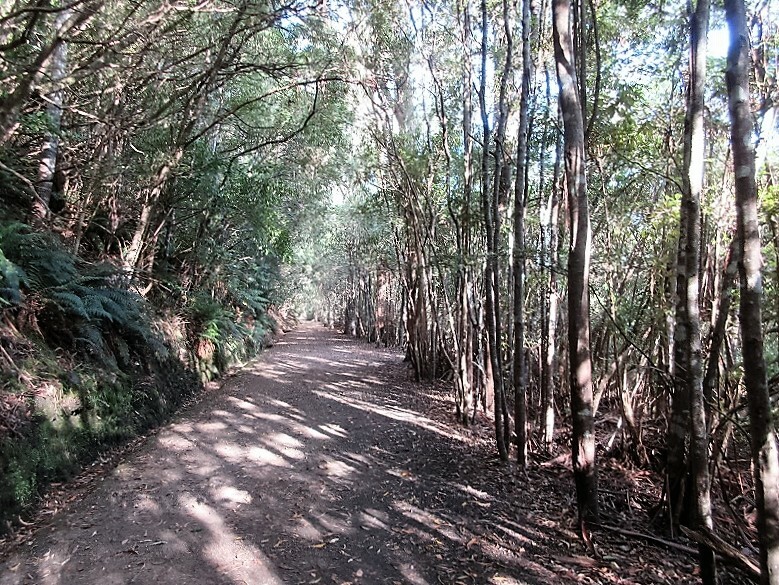 After passing through the Tall Trees Walk, suddenly come out to Lake Dobson Road. And then across the road for heading to Lady Barron Falls. 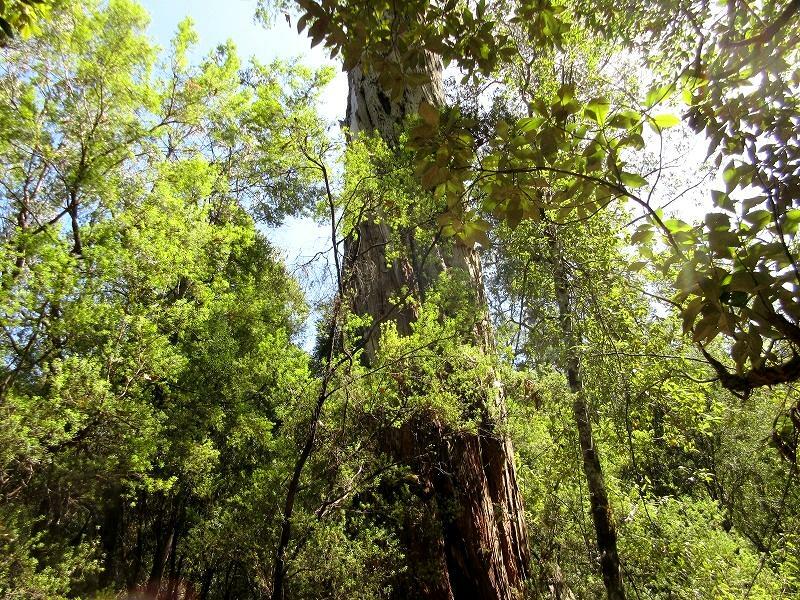 By the way, it is possible to walk and see the world’s tallest Swamp Gum easily with round trip about 30 minutes. The walk start close to a small carpark, about a two minute drive up the Lake Dobson Road. 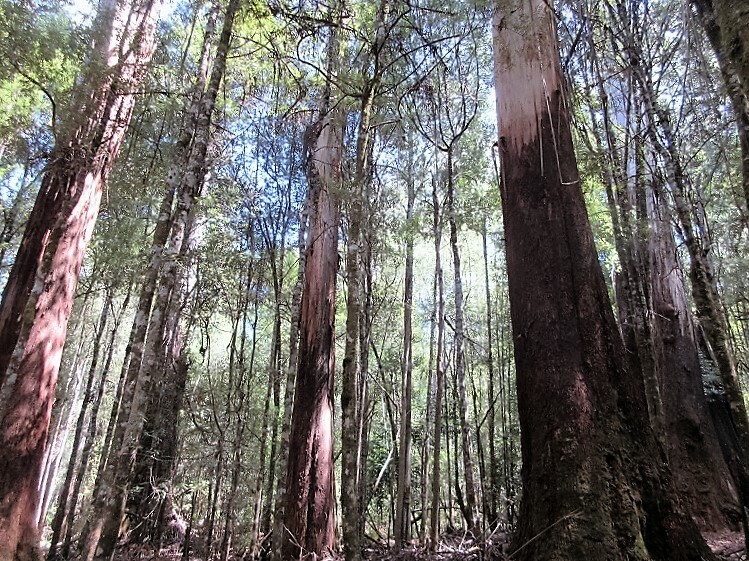 Once in to the Lady Barron Falls Trail, a lot of Swamp Gum are growing here too. 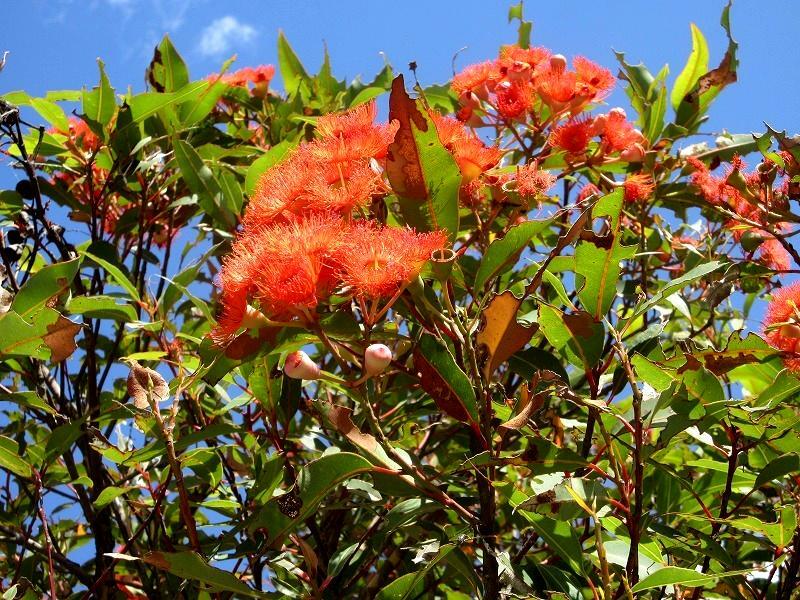 What a graceful Swamp Gum branches it is! 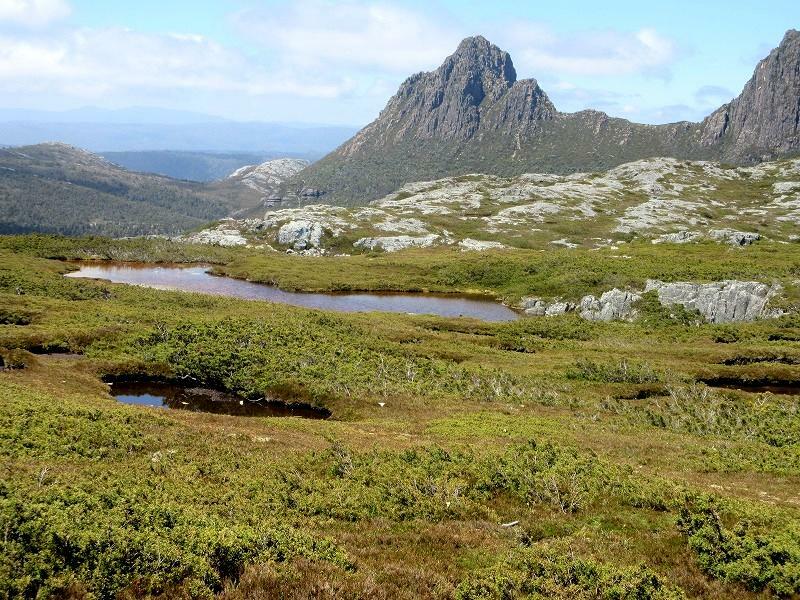 I am already attracted by great nature of Tasmania even I stayed here only 2 days. I traversed several “The Fern Gully” to the Lady Barron Falls. And then, come to the end of a three-way intersection, there is a Lady Barron Falls if you go about 100m to the right. 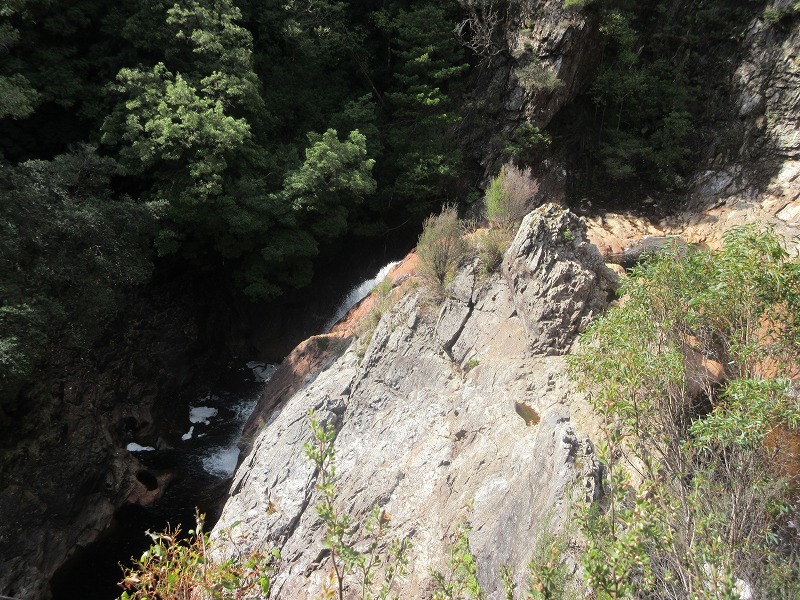 Going back to three-way intersection, and going the trail along the downstream of the Lady Barron Falls. 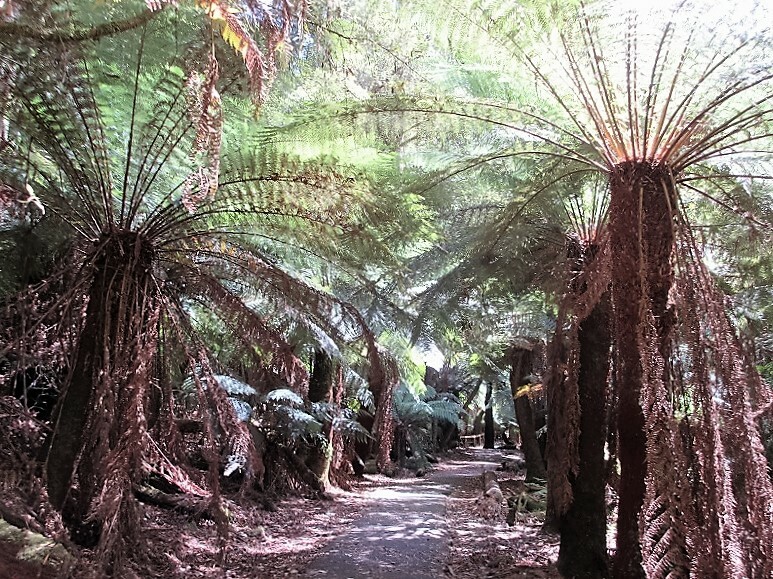 Through the colony of fern and hearing to the sound of the water flow during walking. 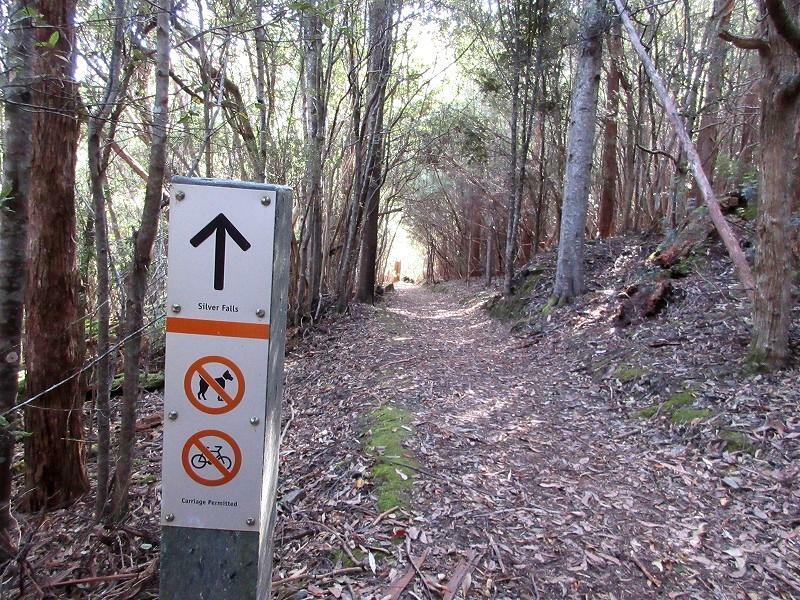 What a lovely trail! 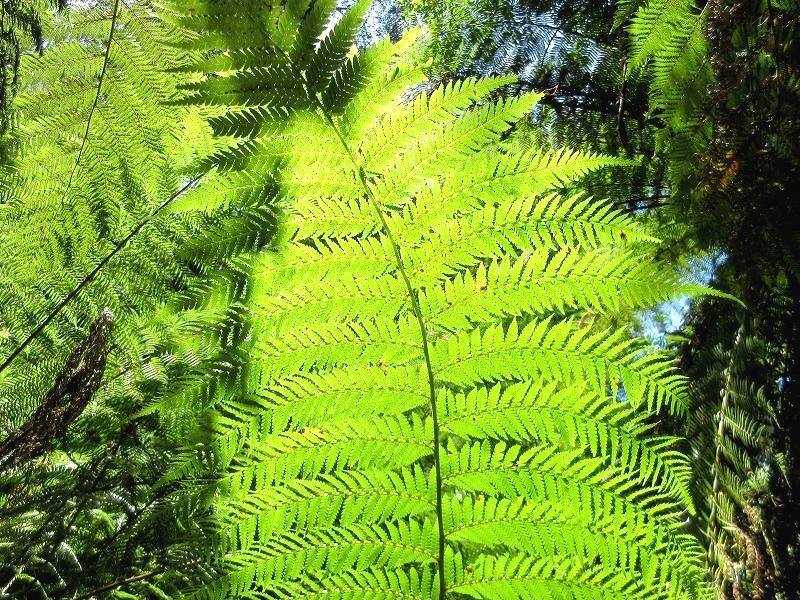 Climb to the staircase from the point where you ended up the fern formation of this photo. The staircase has 240 steps! 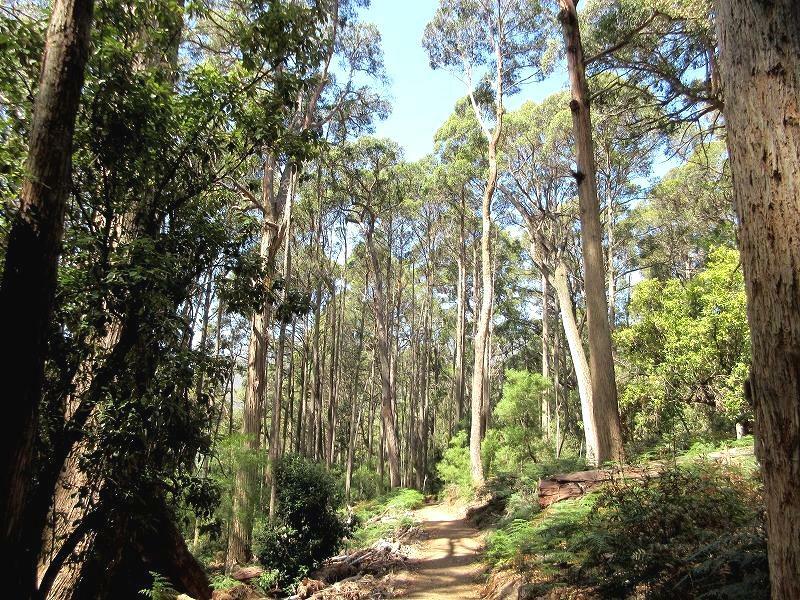 Beautiful eucalyptus forest is spread in the place where you have finished climbing the staircase. 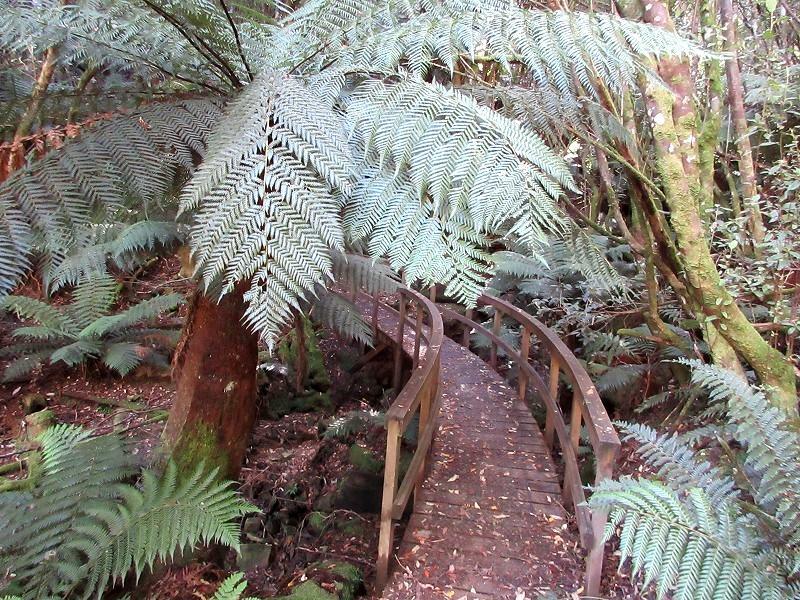 Passing through the eucalyptus forest, and then reaching to the Lake Dobson Road through at the side of a house. If you go to the right on the Lake Dobson Road, Visitor Center is almost within reach. 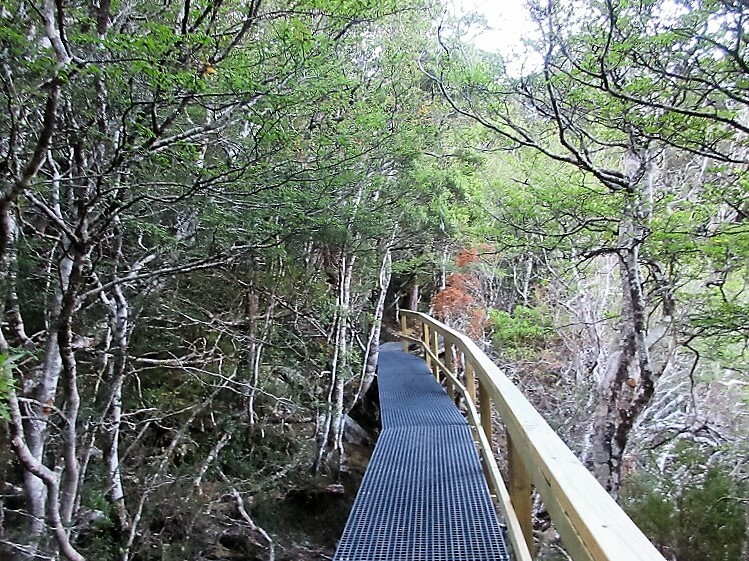 This trail was the best for me because I like walking the waterside and seeing the waterfalls. 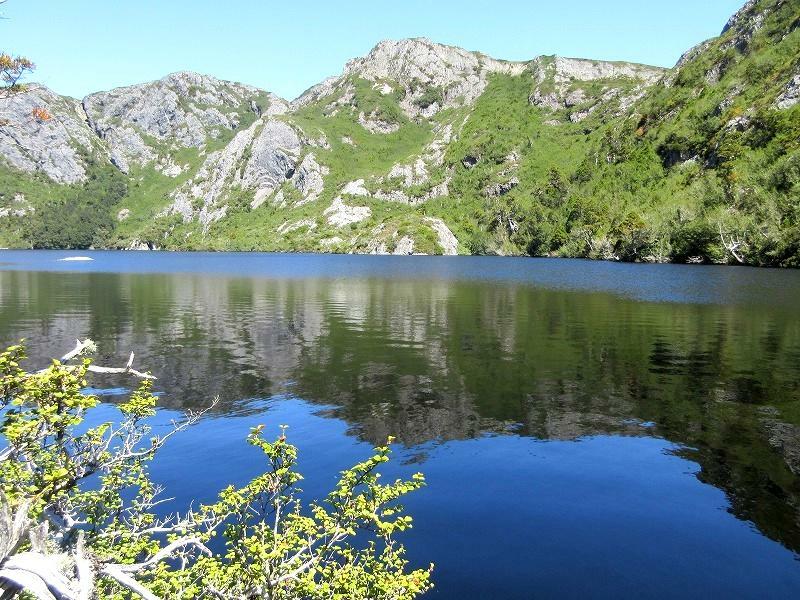 If I have a more time, want to hike around the Lake Dobson and Lake Nicholls. But unfortunately I must be in a hurry to ahead. Going back to Westerway. And heading to the north on the C608, and merging into the A10 at the west about 10km from Hamilton. And then driving about 200km from there to Queenstown. I drove in grazing grounds in mountainous area until to the junction of A10. The Dunrobin Bridge crosses Meadowbank Lake. It is just before joining Highway A10. After joining on A10, I just kept driving to the northwest. 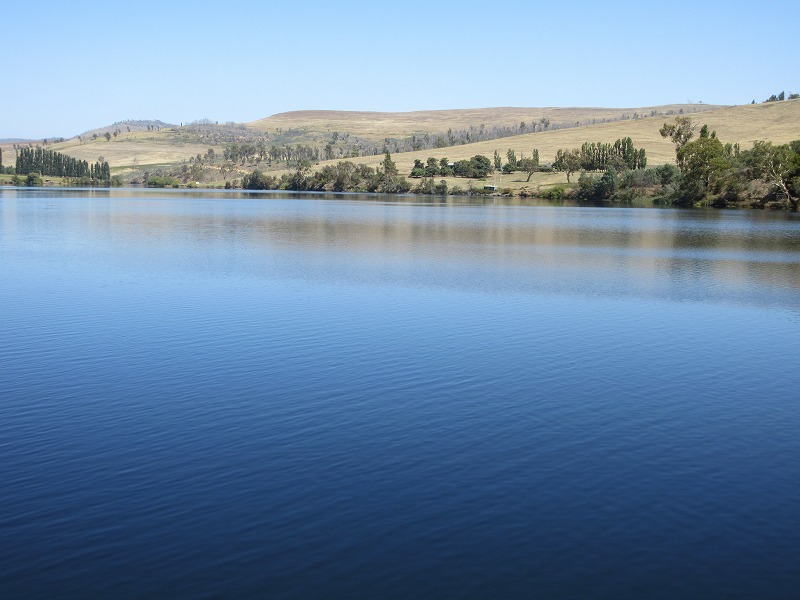 Some large lakes are appeared about 50km northwest from Hamilton. I took short break near Bronte Lagoon that is one of them. 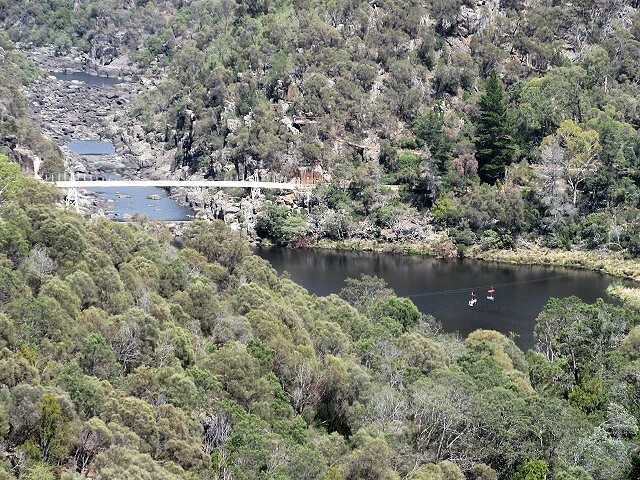 I drove about 30km west from Bronte Lagoon and came across the Derwent Bridge, which is over the south of Lake St Clair. 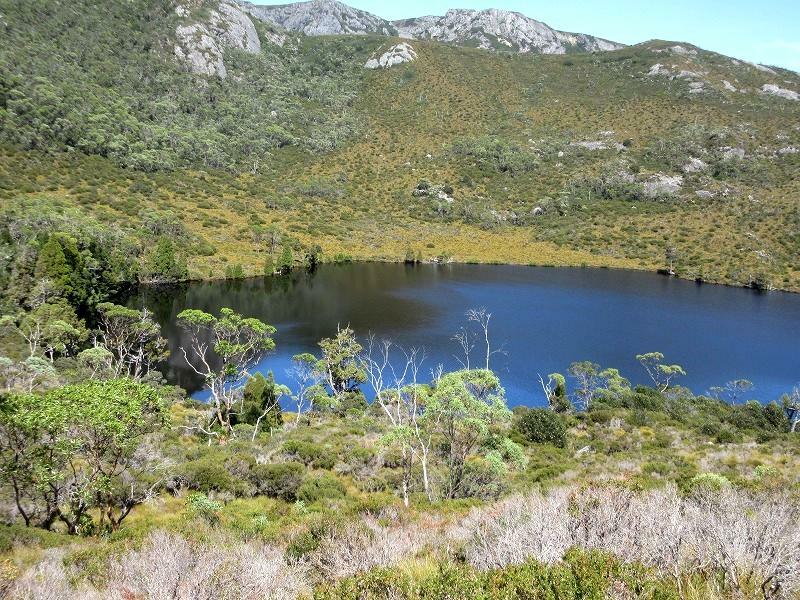 Finally got into the Tasmanian Wilderness that is a World Natural Heritage Site. There is a sign of caution of animals here too. 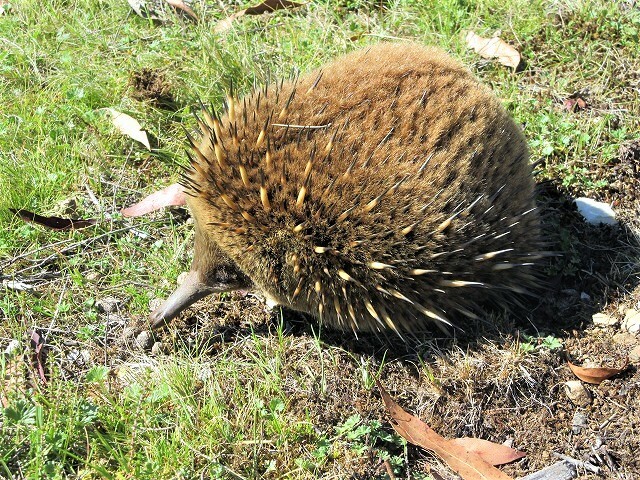 This picture shows echidna? There is a sign that is similar in Japan. In the animal version is deer, wild boar, monkey, bear, cow, raccoon dog etc. Once into the wilderness, rocky mountains appeared in the front. 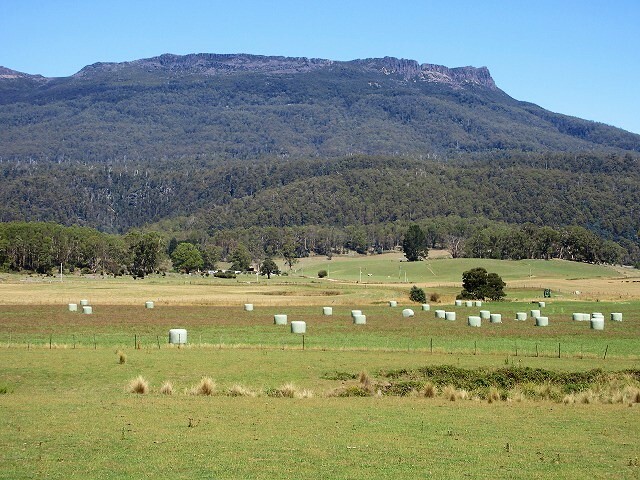 The scenery clearly changed to the mountainous area from the grazing grounds of until now. 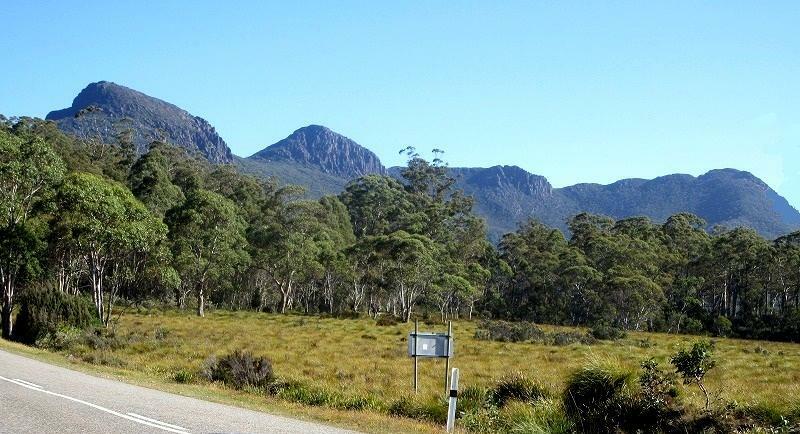 The majestic mountains of King William range located near only about 10km west of Derwent Bridge (the turn-off to Lake St Clair) on A10 (Lyell Highway). 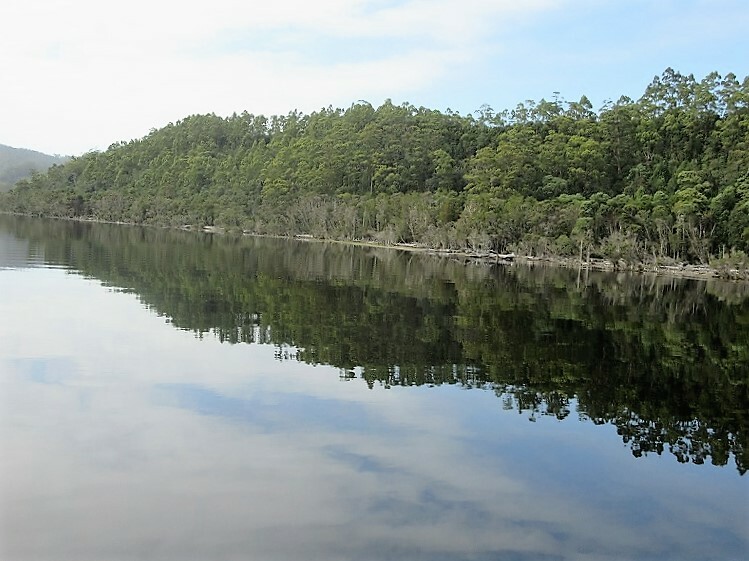 You can view them from a small roadside rest area on the left side heading to Strahan. “Don’t look around during the driving!”　However, it's so difficult since a great scenery. And every cars are going through in the beautiful scenery at 100km speed!!! 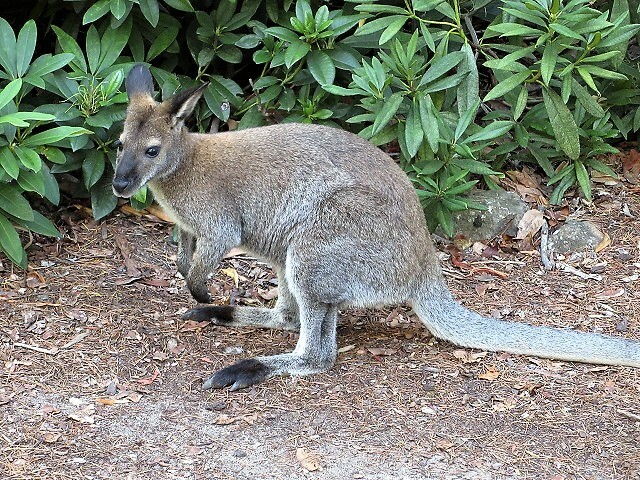 I realized that is impossible to avoid if kangaroos pop out. 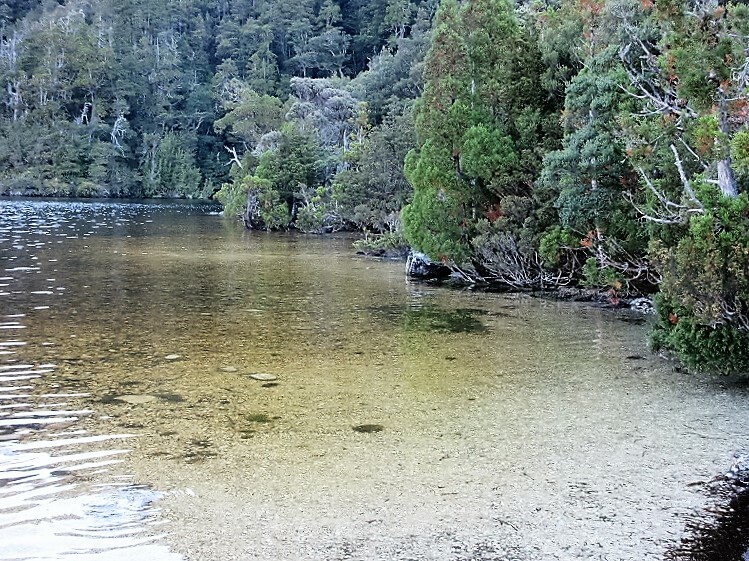 I kept driving in the Tasmanian Wilderness area and finally arrived to Queenstown. Queenstown is famous for mine town since a long time ago. 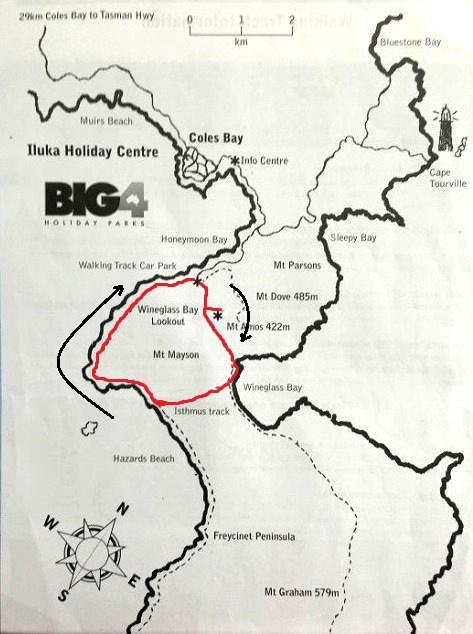 I wanted to sightseeing in there if I have a more time, but unfortunately I had to drive still 40km of mountain site from Queenstown to Strahan. The rode B24 is a winding road. 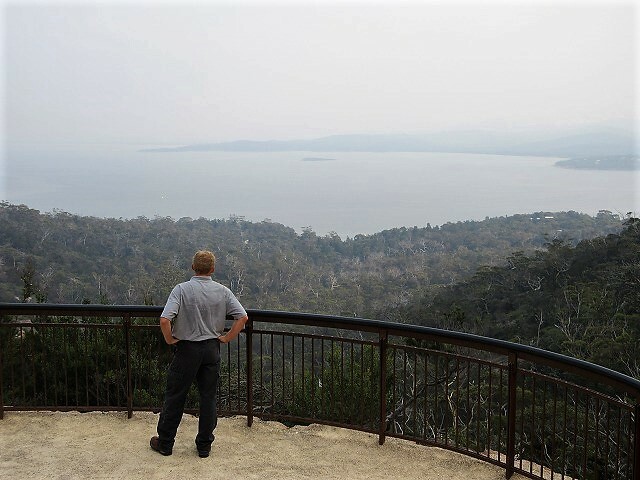 I looked down on the Macquarie Harbor to spread to the south of Strahan at the view point beside B24. 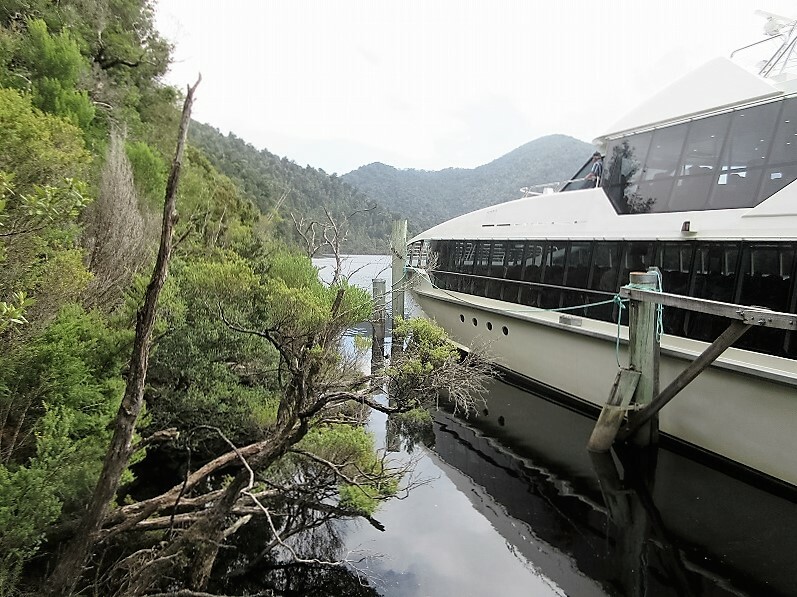 Tomorrow I will join to the Gordon River Cruising. 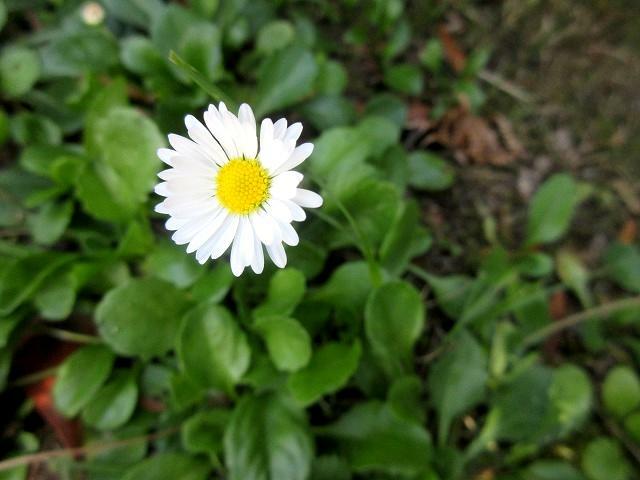 I don’t like very cold midwinter of Japan. So I escaped to the Southern Hemisphere that is the season reverse from Japan. 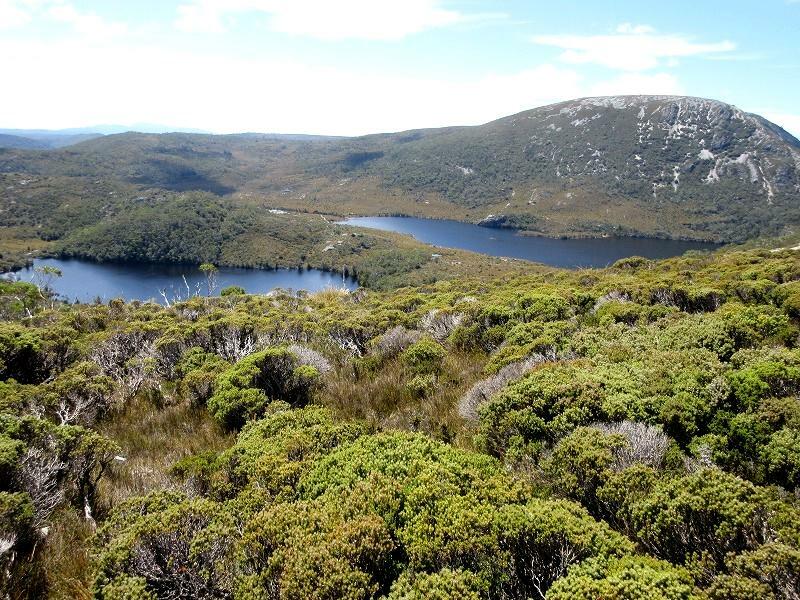 My destination was Tasmania, Australia which has a rich nature. 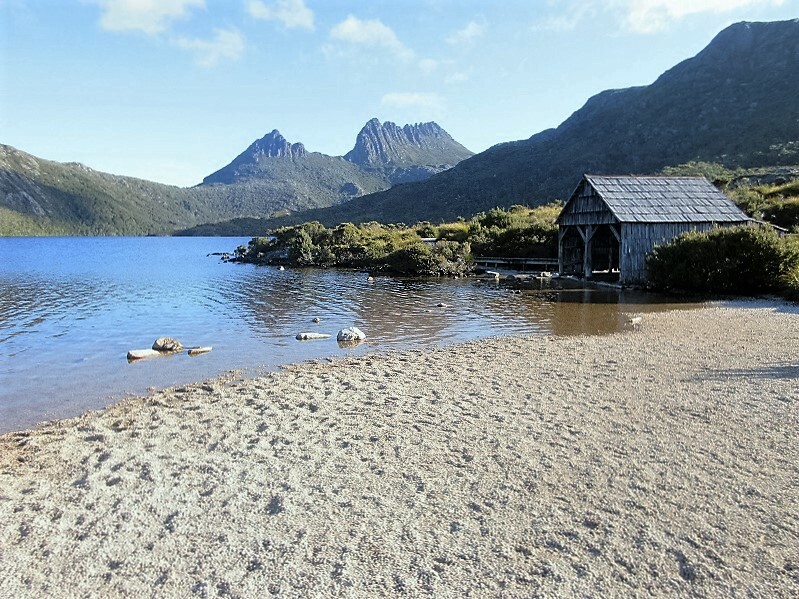 Tasmania has a comfortable temperature even in the summer because of the latitude which is similar to Hokkaido in Japan. Also the area is as much as Hokkaido. 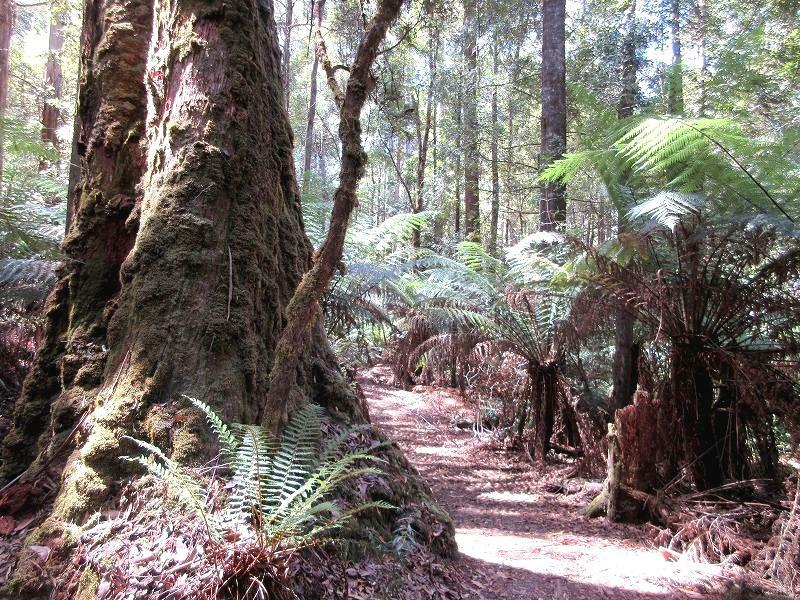 Tasmania has a rich forest area where 36 percent of the island is in the national parks and nature preserves. 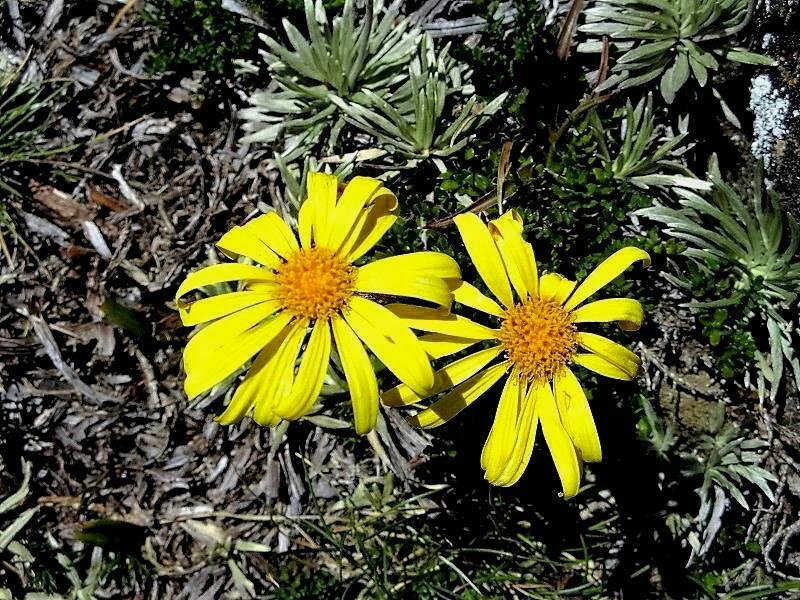 And these are designated to World Natural Heritage. I recommend it for visitors who love nature. 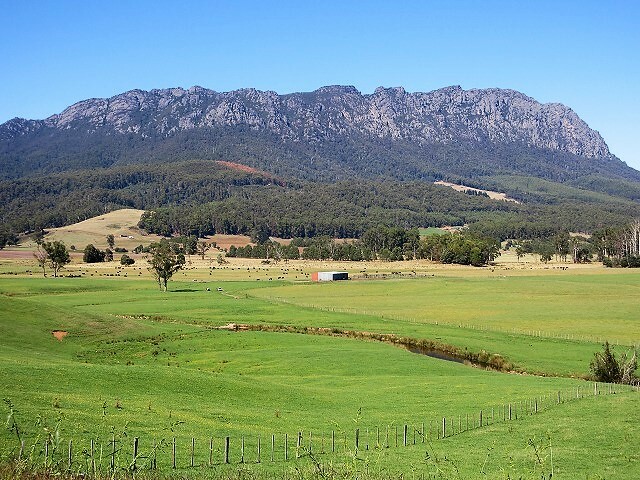 From Narita Airport to Tasmania Hobart Airport via Melbourne is about for 10 hours. 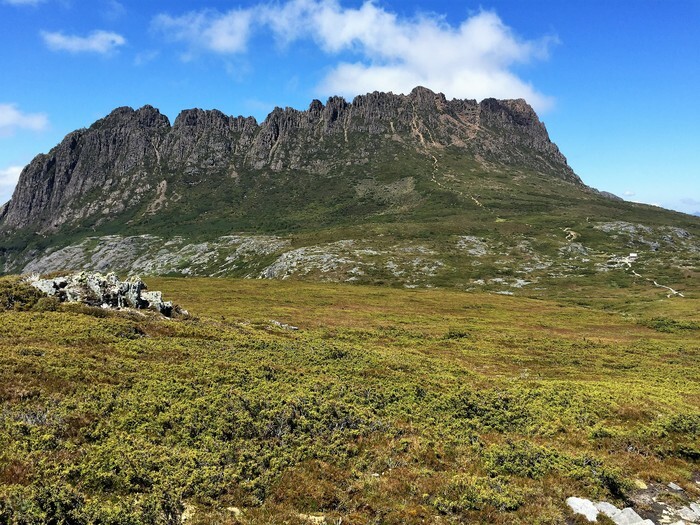 I used a rent-a-car for my 9 days trip in Tasmanian. And, I asked to AJPR(Australia Japan Public Relationship), which is travel agency, for making hotel reservation. 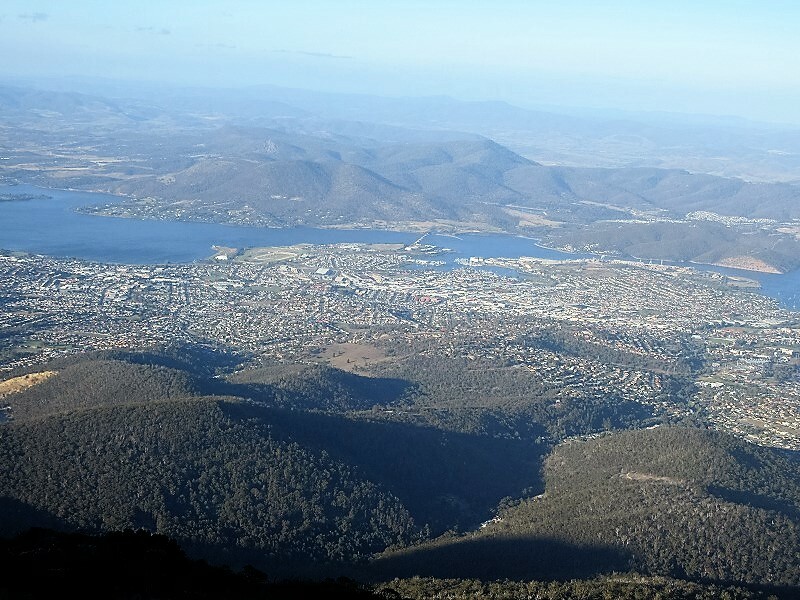 I drove to the west on highway A3 for heading to Hobart downtown that is away 17km from airport. 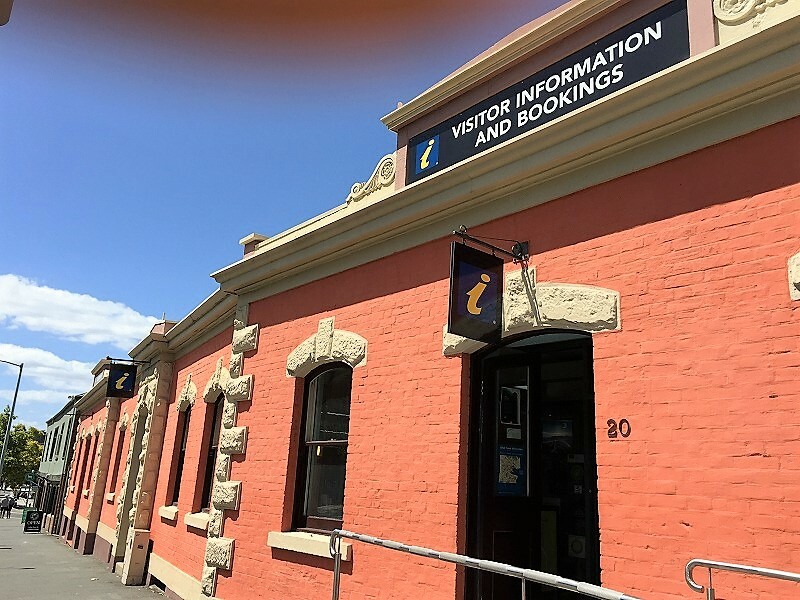 Once into the downtown, getting the information at the Visitor Center (Tasmania Travel & information Center), in which located the corner of Davey Street and Elizabeth Street in Hobart. 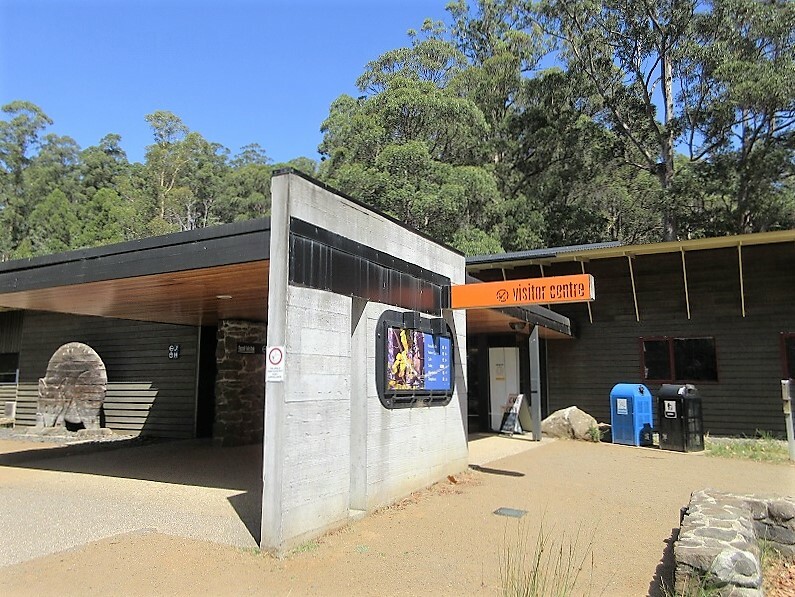 At the Visitor Center, it is possible to know the various information about Hobart such as tourist sites. Also you can make reservation to variety events, cruising and tours. 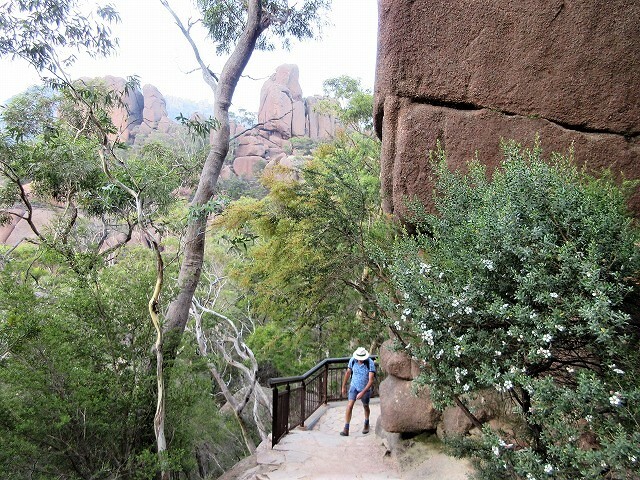 Getting a holiday pass is reasonable if you have a plan to visit to national park 3 or more places. You can also buy it at the Visitor Center. 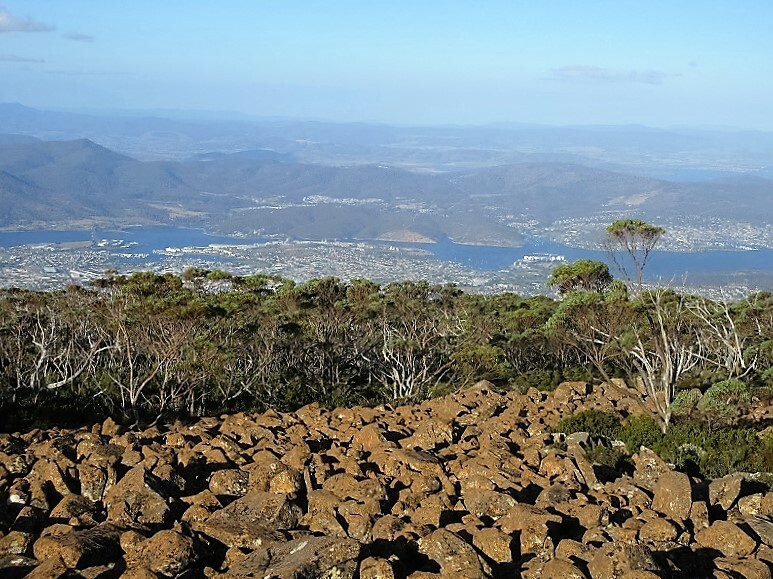 Hobart is the second oldest town in Australia next to Sydney. 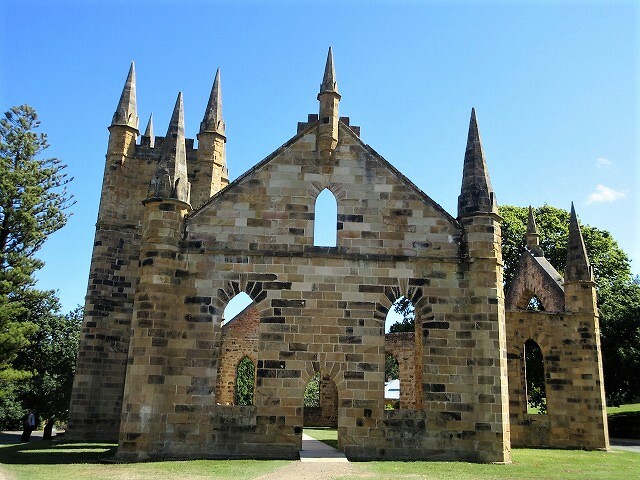 In Hobart, There are many historical old buildings in 19th century and museums. 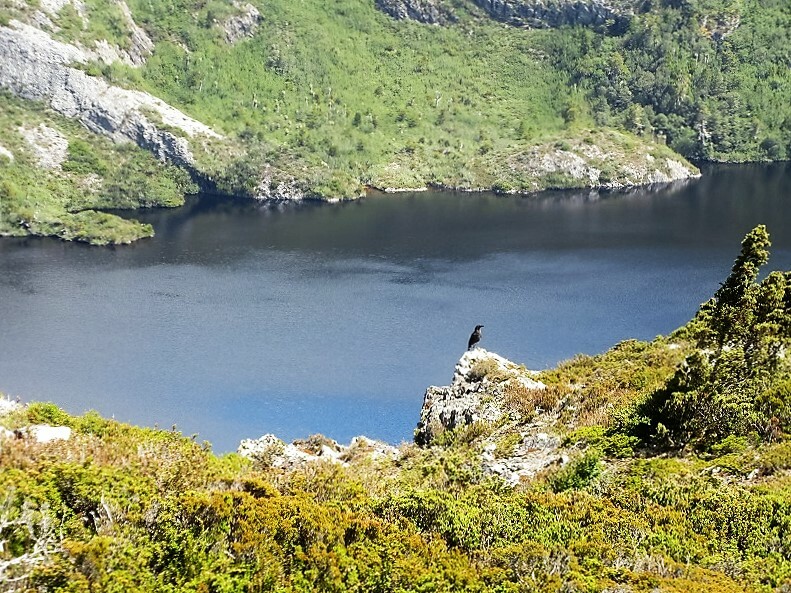 Therefor you can enjoy sightseeing without hiking in the nature. 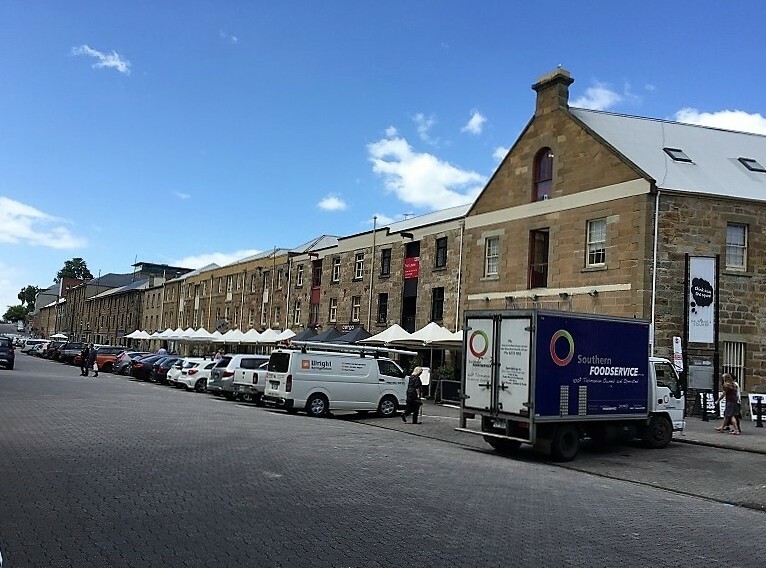 I went out to Salamanca Place where the stone warehouse bring me colonial period in the past. These warehouse are currently being used art galleries, restaurants, bookstores and boutiques etc. In addition, having a Salamanca Market every Saturday in here, you can buy variety of things such as fresh vegetables and local crafts. After checking out of Salamanca Place, I went to Mt. 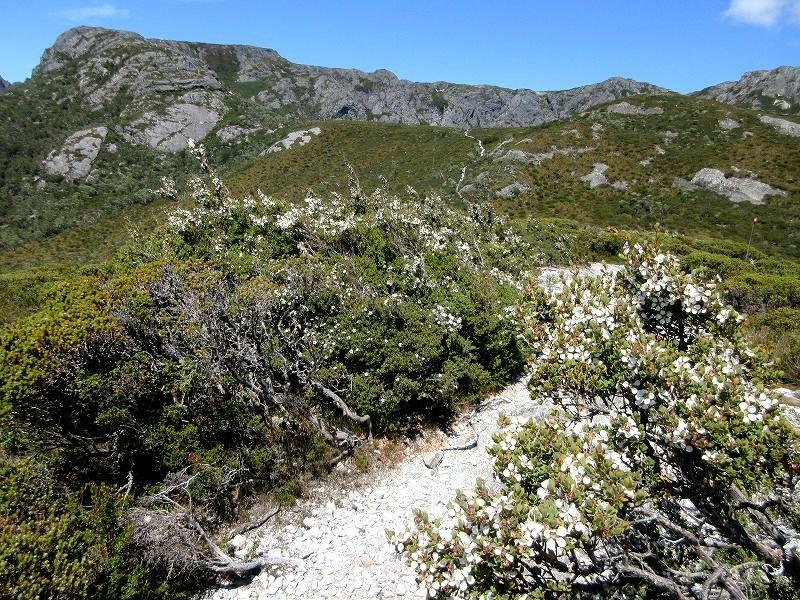 Wellington（Elevation 1,270ｍ）, which takes about 30 minutes from the downtown by car. And I did only 2 hours hiking since I was tired for a long flight. The carpark is located the west from downtown on B64. After driving about 20 minutes, you can see a junction of the C616 that lead to Mt. Wellington summit on the right side. There is a carpark on right side on the B64 where you drive a little distance of the west from the junction. 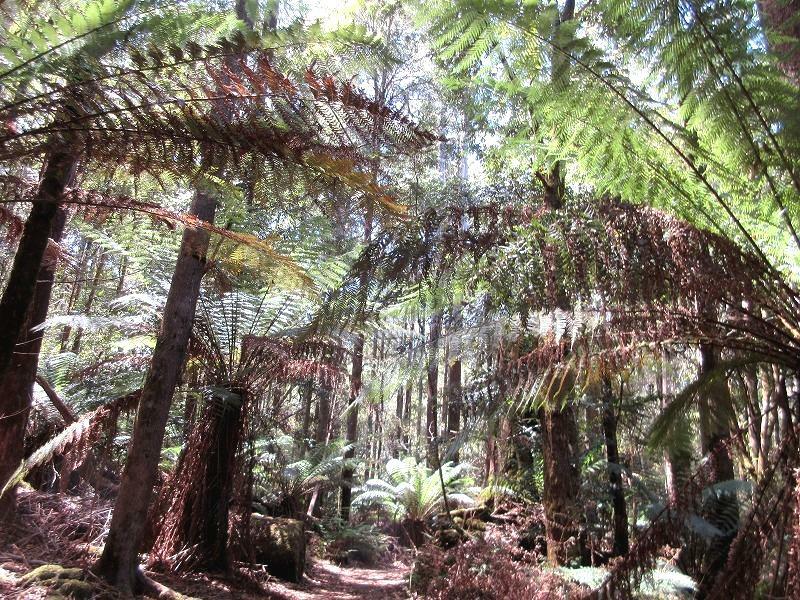 I decided to walk in a loop of 3 trails that is Fern Glade Track, Silver Falls and Pipeline Track. 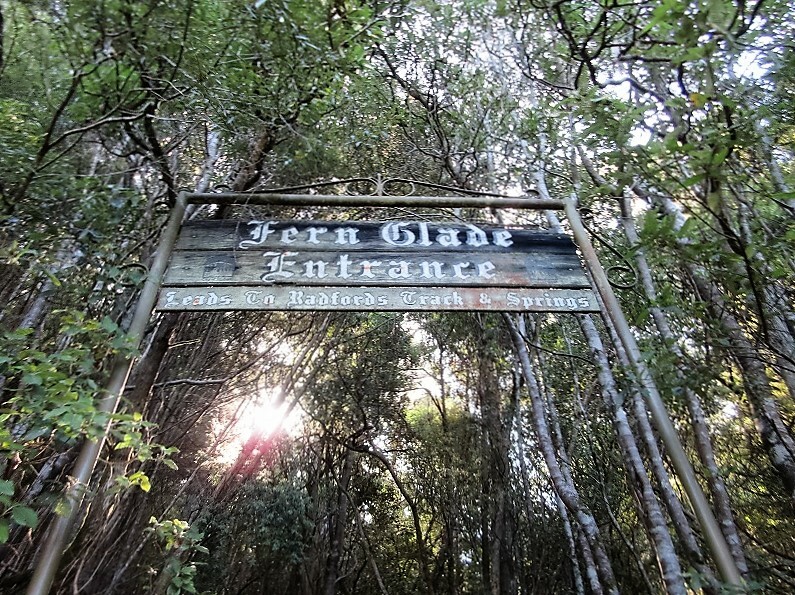 Pass under the entrance gate of Fern Glade Track, and walk along the creek. 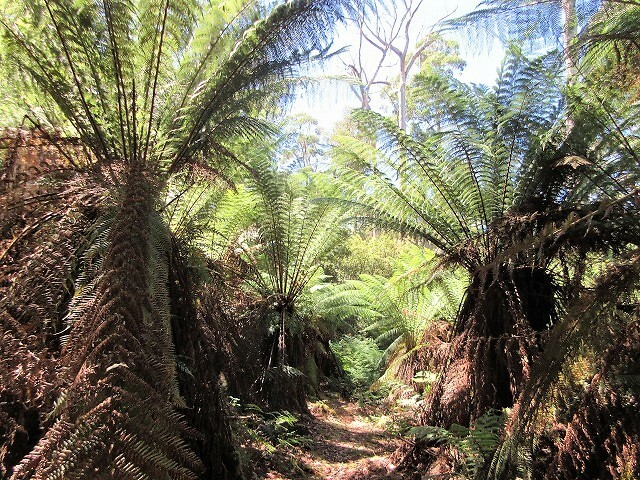 A lot of big ferns, which is related with the trail name, are growing in this area. 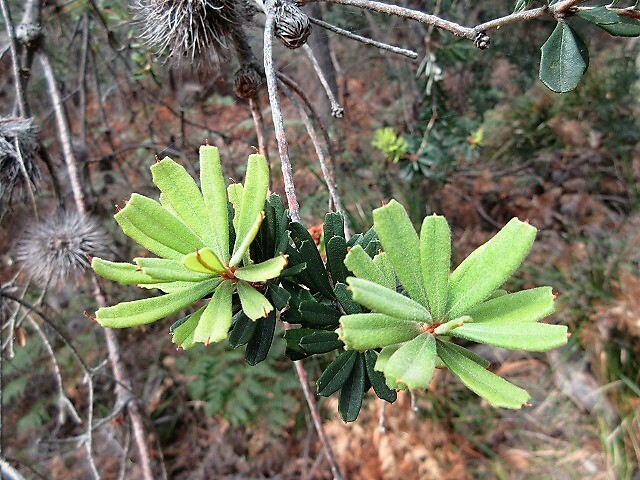 Their stems are thick as wood in the rainforest area. I felt just like dropped into the world of the movie “Jurassic Park”. 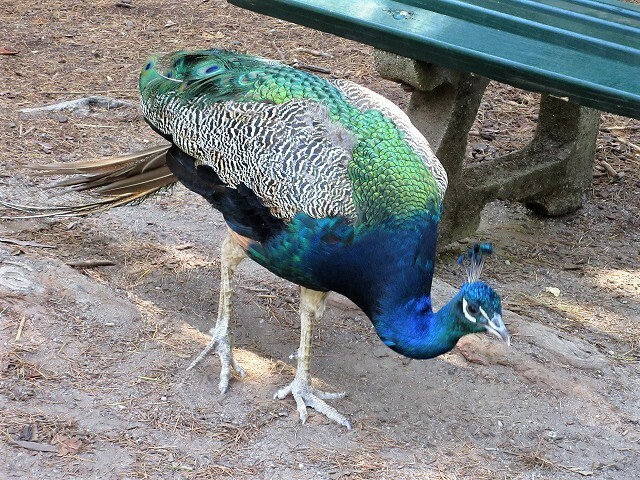 I encountered with such a beautiful bird. 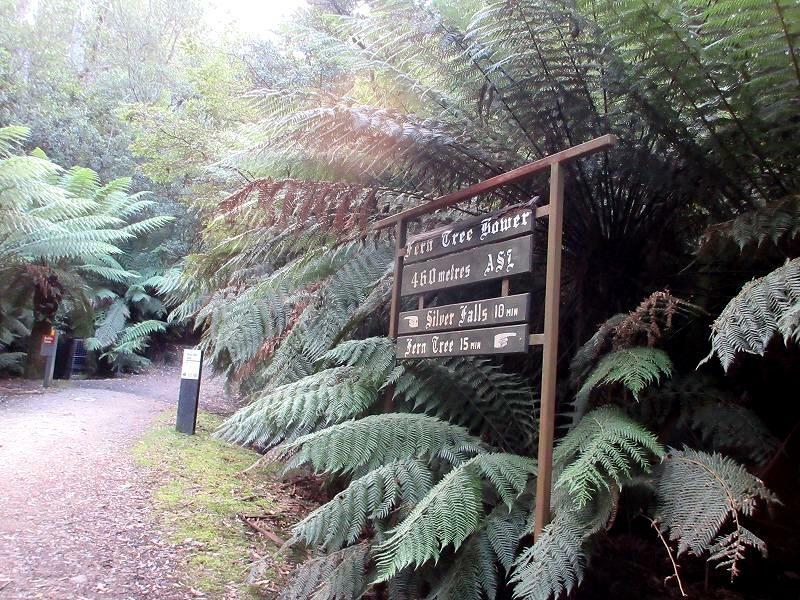 I get at the crossroads in about 30 minutes from the entrance, and turn left for proceeding to the Silver Falls Track. 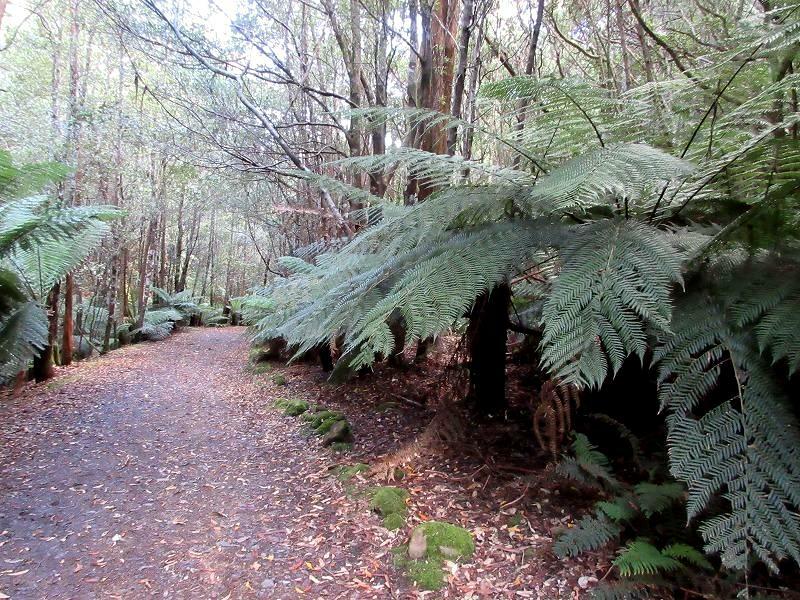 As soon as I walked into the Silver Falls Track, the vegetation changed to broad-leaved forest zone such as eucalyptus. 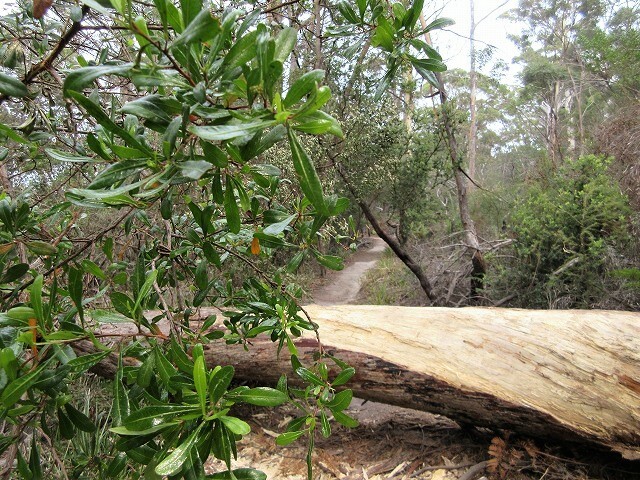 Although the trail is almost flat and easy to walk, there are places where thick trees have fallen down like an obstacle. 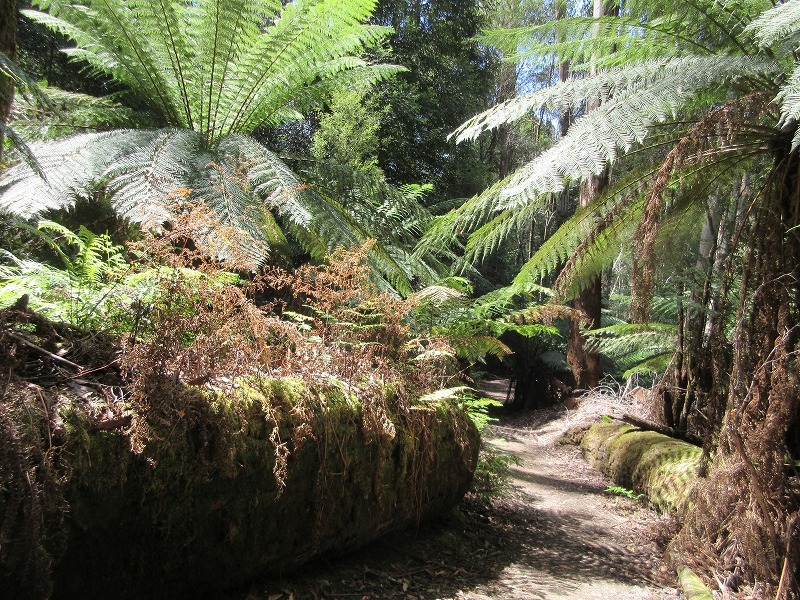 Then I came on a major intersection of the Silver Falls Track and Middle Track. 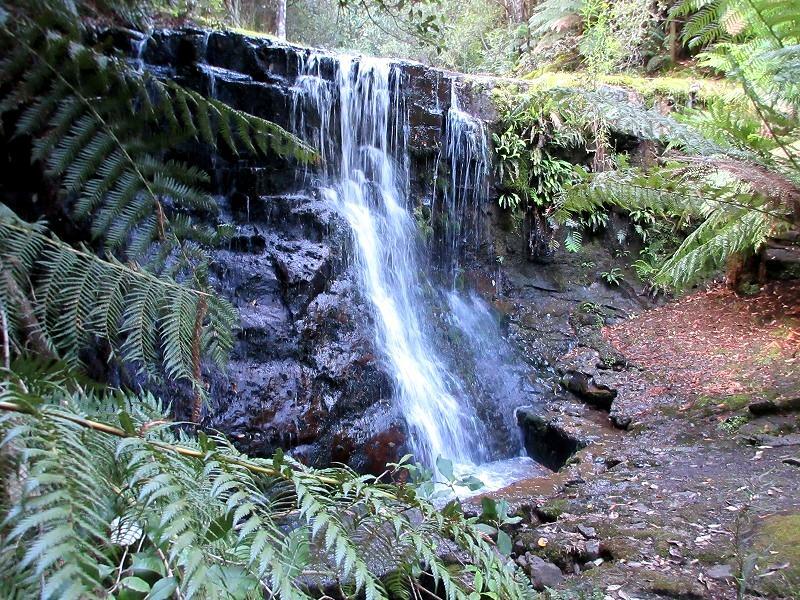 For heading to Silver Waterfall go straight to the west on Silver Falls Track from here. I dropped in at the place that is the south about 50m on the Middle Track from intersection because there was something artificial building. 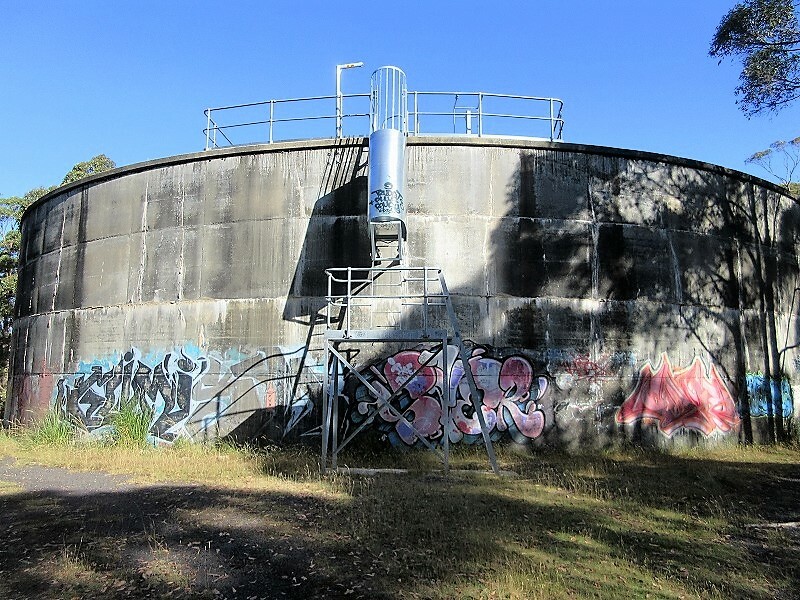 It was a big water tank with a lot of graffiti. 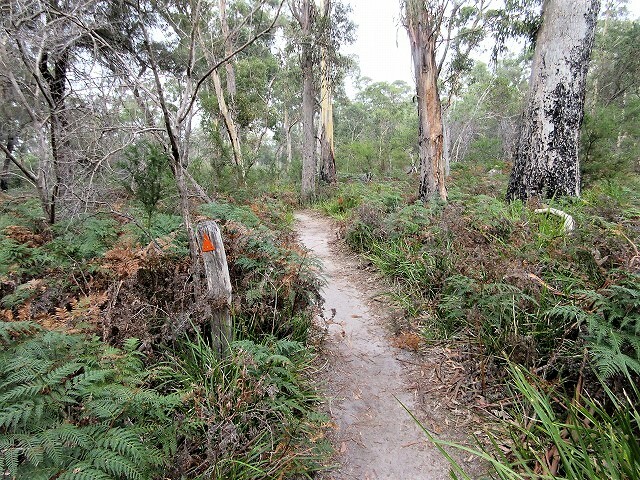 Trail is divided into two ways on the Silver Falls Track. 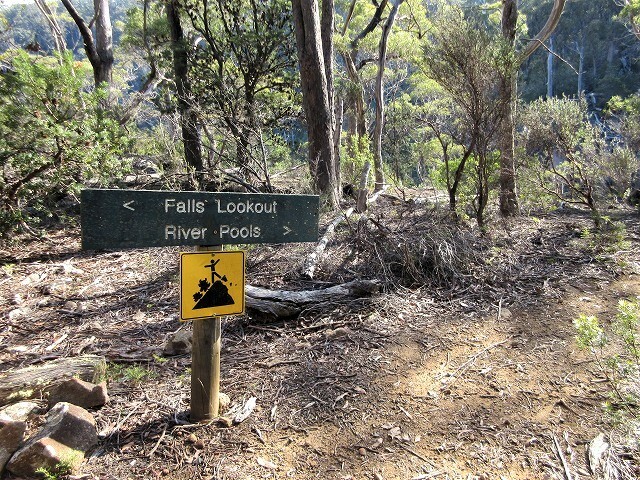 Proceed to the left trail which is with sign "Silver Falls". Once into the downhill of the stone steps, hear the sound of the water flow. 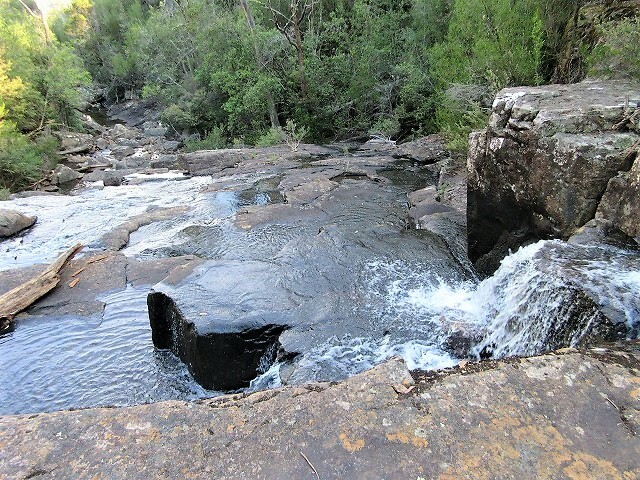 After going down the stone steps, about 8m height Silver Falls appear. 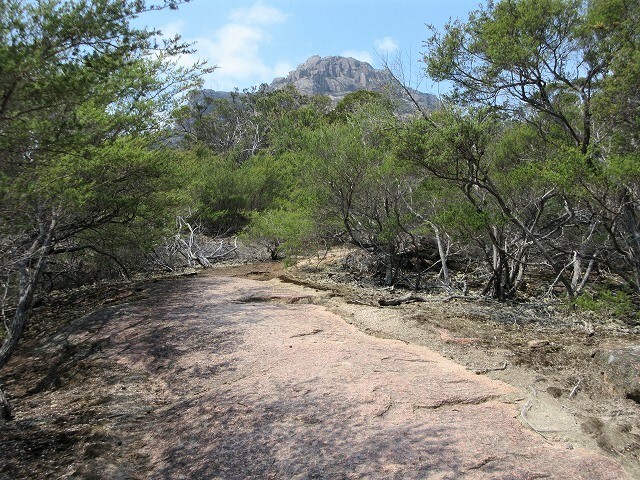 The trail becomes wide and the direction changes toward the south after passing the waterfall. Also it has become a bicycle passage "Shared Use Trial Road" from here. I got to the three-way intersection on the Pipeline Track by about 10 minutes walking from Silver Falls. I can go back to the parking if I take left turn and go to the east on the Pipeline Track. Pipeline Track is also easy to walk, as the trail is pretty much flat. 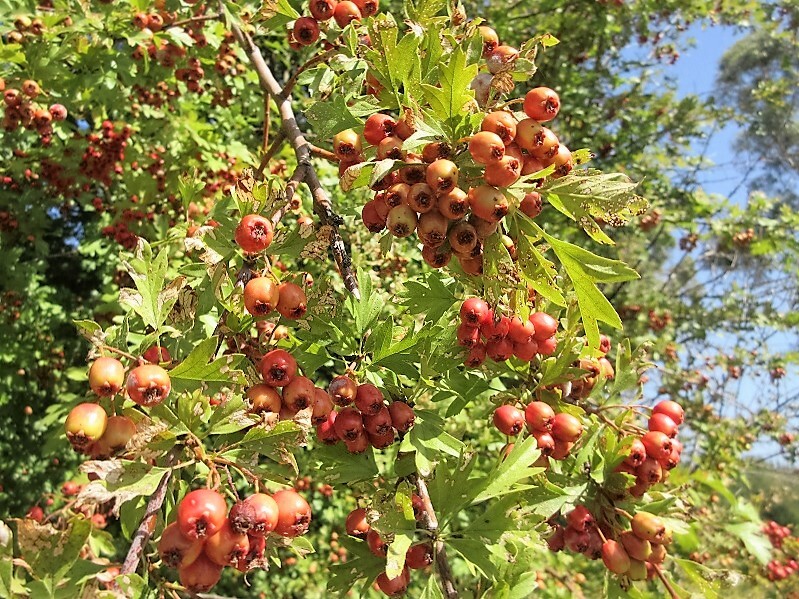 I was able to walk happily because I was looking at flowers and fruits on the side of the trail while walking on the trail. I thought it was the area that I want to walk more and more if I have time and stamina. 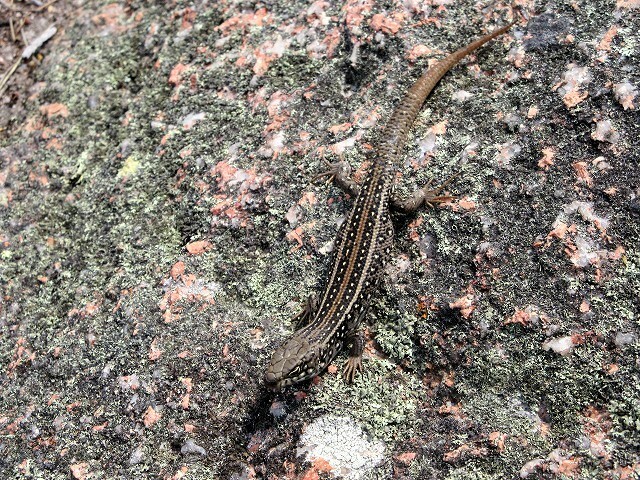 However, I just was good in this short hiking because was tired by the night flight. 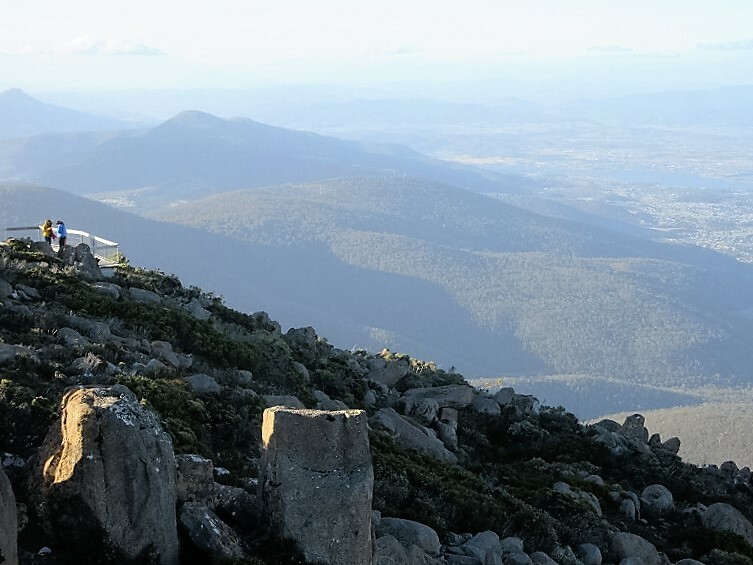 I went to Mt.Wellington by car after the hiking. Going back on the B64 a little distance from the parking, then turn to the left at the junction of the C616 and drive a winding road to Mt.Wellington. I was able to reach to the summit from the junction of the C616 for 10 minutes via a view point "The Springs". 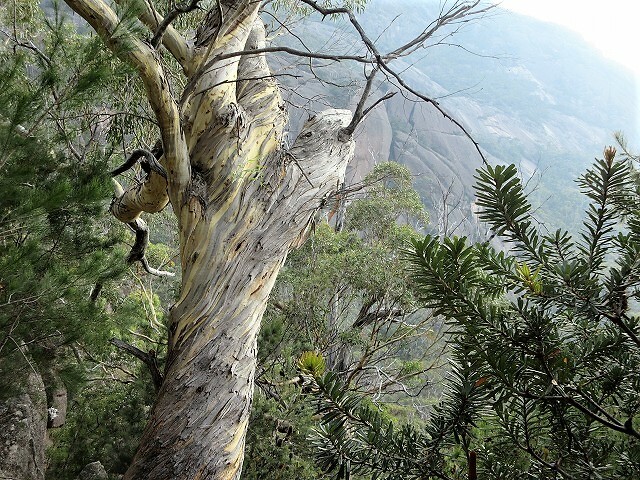 Near the summit, many stones and forest of eucalyptus gave me the impression of desolate. 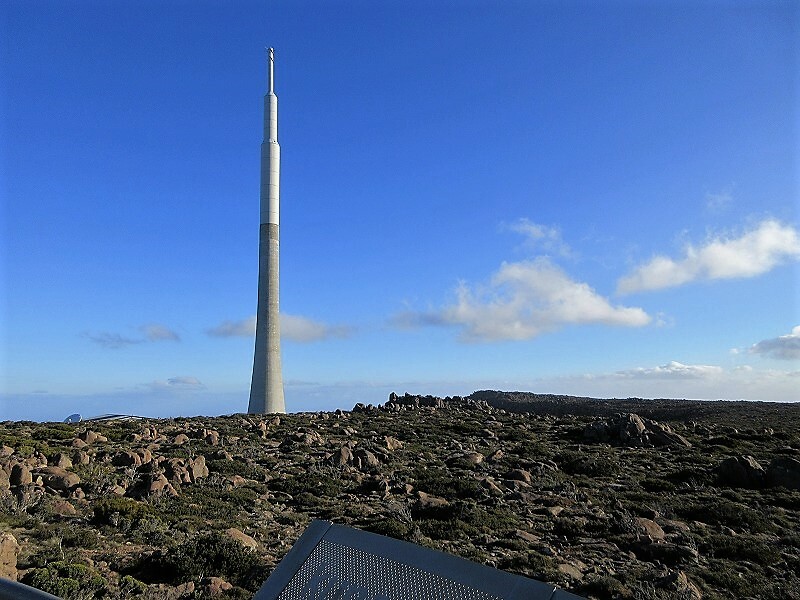 A tall tower is standing like an arrow toward the sky on the top of the Mt.Wellington. 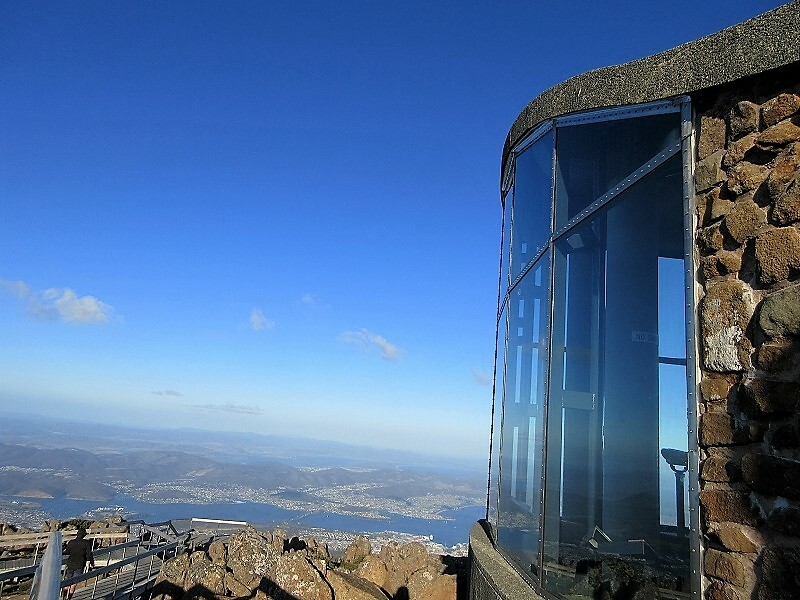 Vicinity of the summit is very windy, the enclosed observation center at the top protects you from the bluster winds. There is a good boardwalk to an open platform for the outlook on the western side of the car paring. 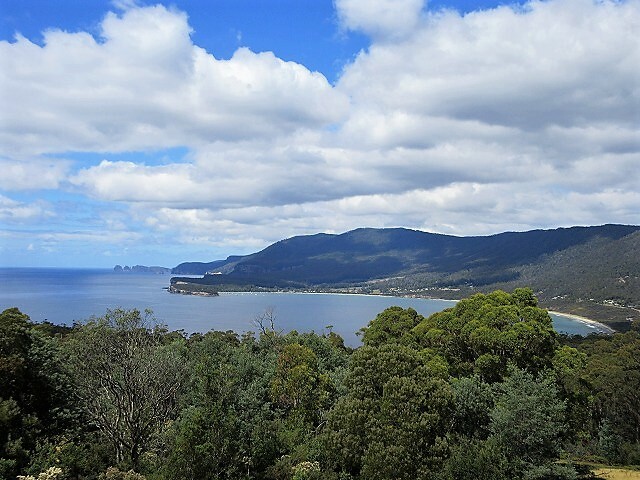 From the platform, looks out over the spectacular vista which is backdrop to the Hobart city and the Derwent River estuary to Storm Bay. 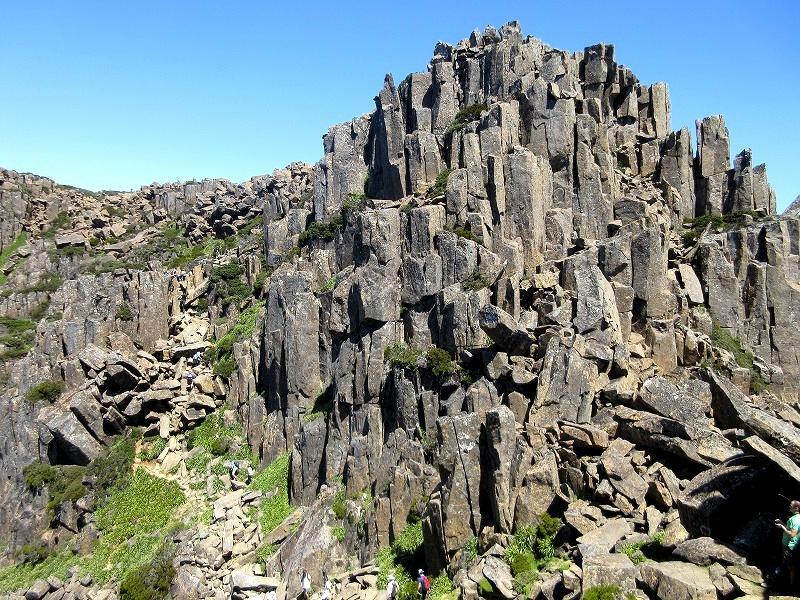 At bottom of this summit, there are walls of columnar joints (the names are Flange Buttress, The Organ Pipes), which seems there are 450 rock climbing routes. 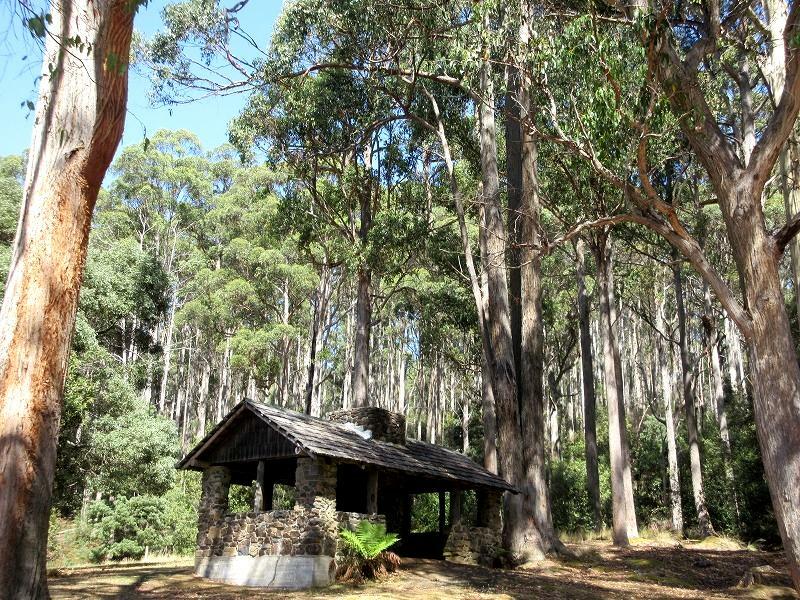 The Chalet or The Organ Pipes Track goes through under these walls. However, I do not have enough time to hike there unfortunately. By the way, I took hitchhikers who are French and German women at that time. 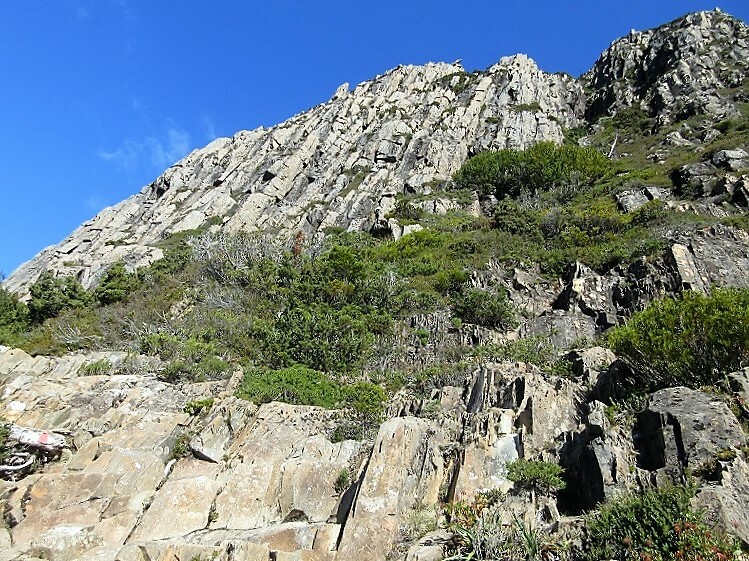 They have climbed to the summit by walk these hiking trails. They seemed to be very good relationship even though they are different nationality. They reminded me that I had traveled with my Chinese girlfriend while I stayed in the United States. In addition, I picked hitchhikers up for 3 times in this my trip for 9 days. 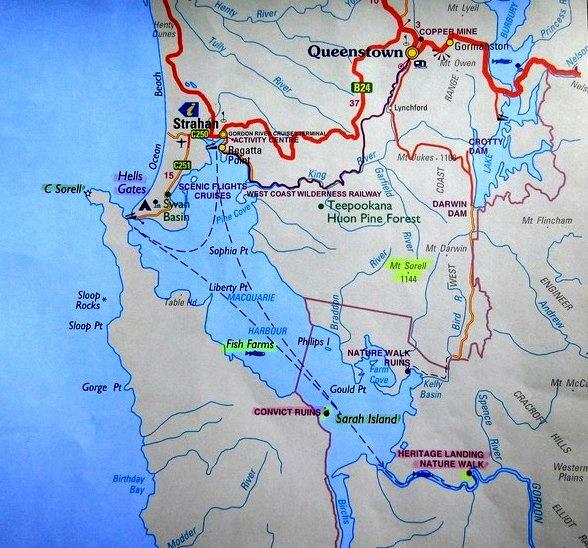 Tomorrow, I am going to have long driving of about 350km to the Strahan in west coast after hiking in the Mount Field NP.